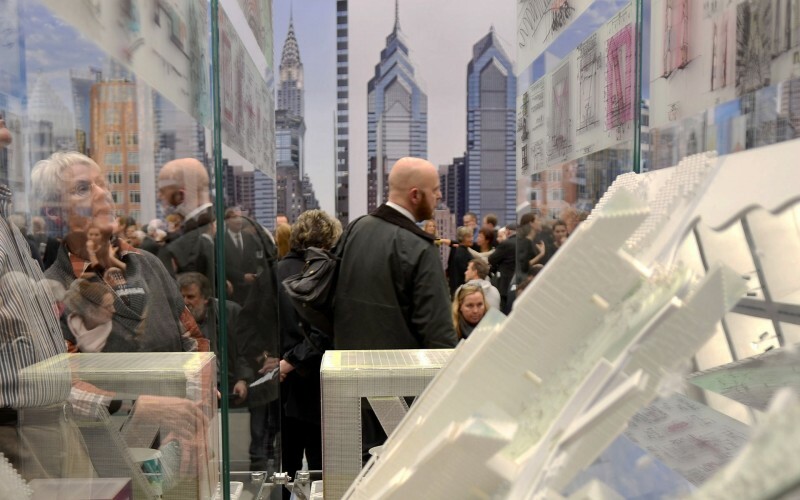 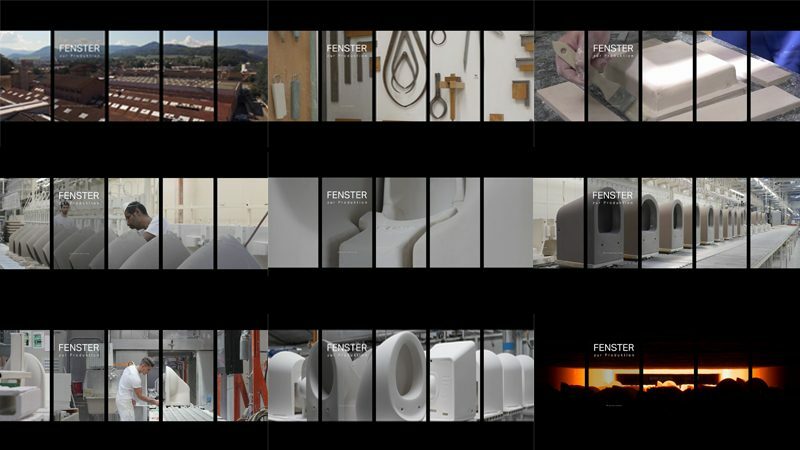 Introclip to the conceptual exhibition MATERIALMESSAGE by the visionary studio Snarkitecture (New York) for Laufen Bathrooms (Switzerland) at the Salone del Mobile in Milan. 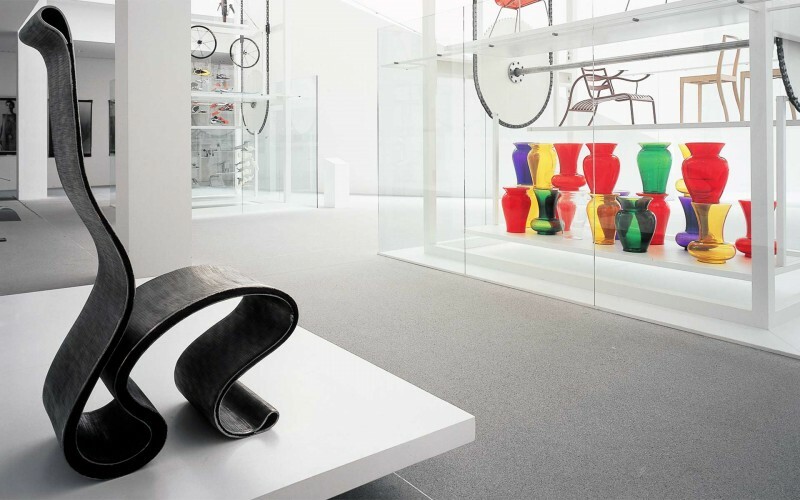 The protagonists express their own views and statements of this conceptual and experiential itinerary through the world of ceramics. 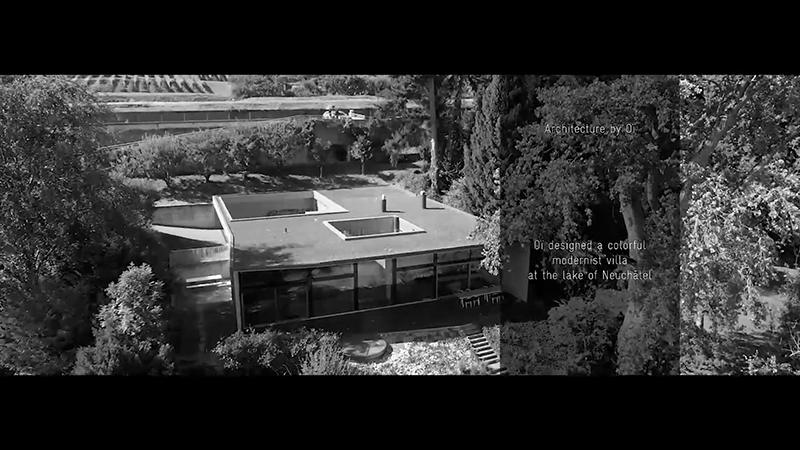 Film by bangertprojects. 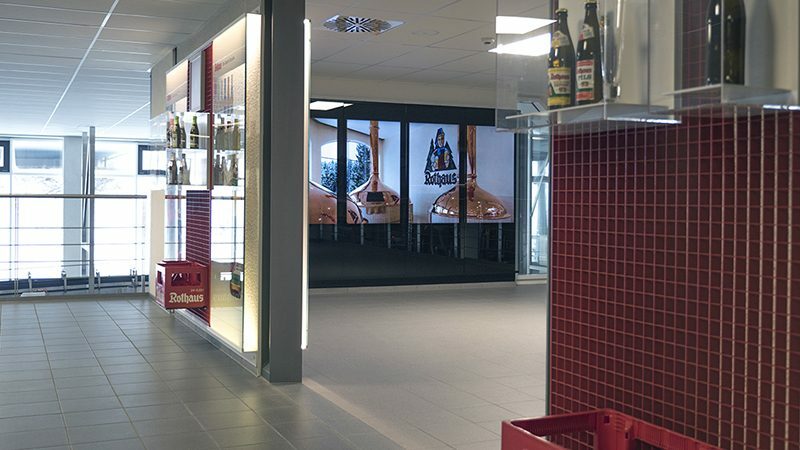 A 14 million investment in a state-of-the-art bottling plant needs a great modern equivalent in the breweries vistor tour. 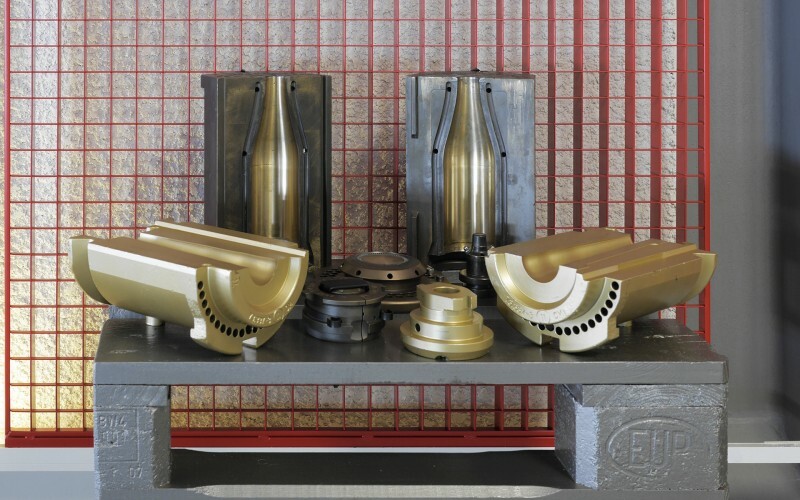 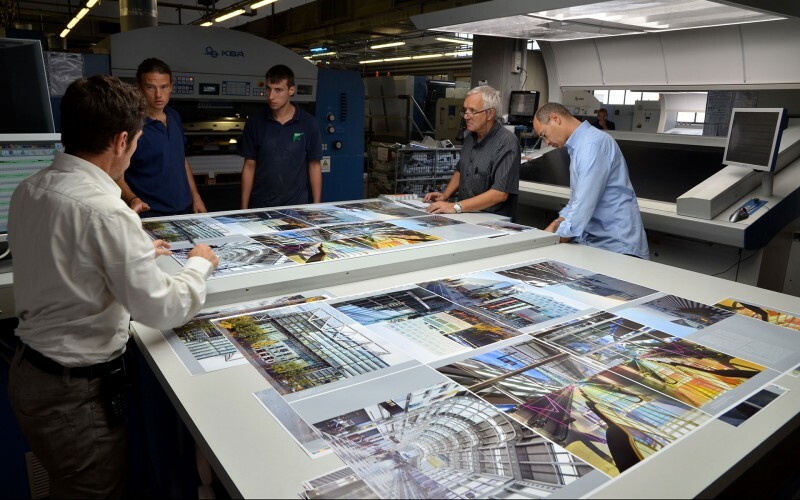 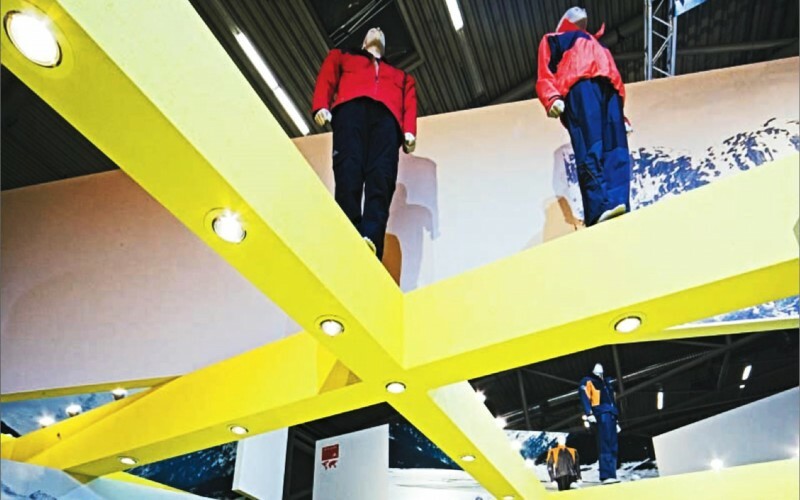 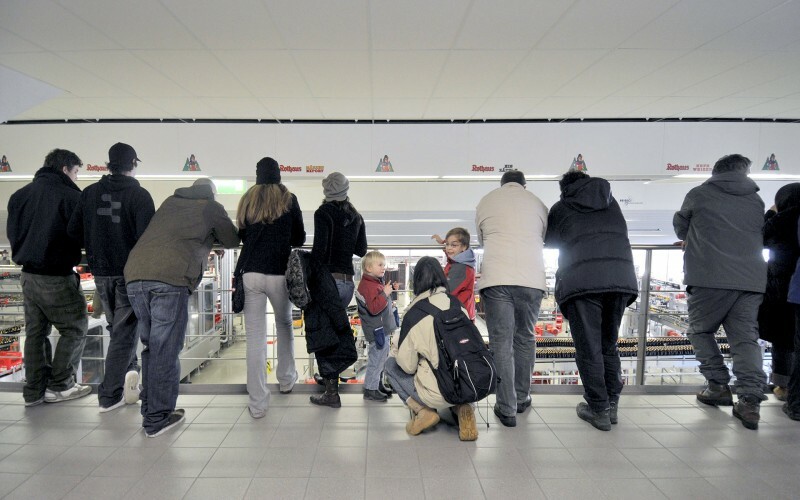 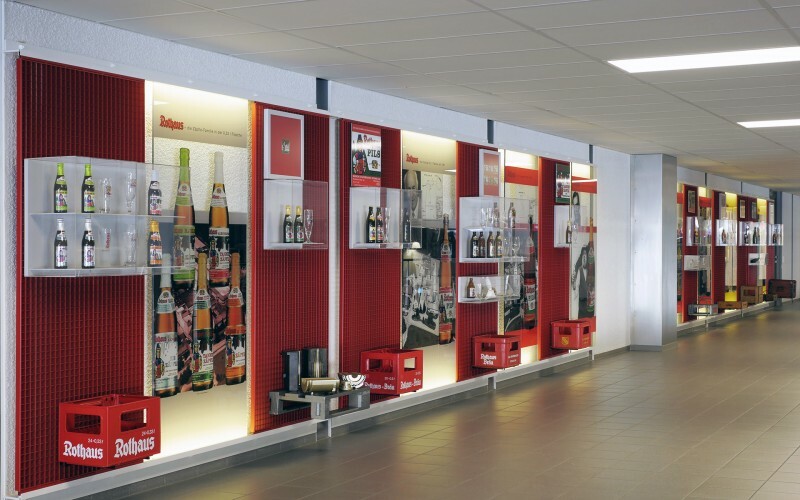 We show functional world novelties as well as the entire process from the employees' point of view. 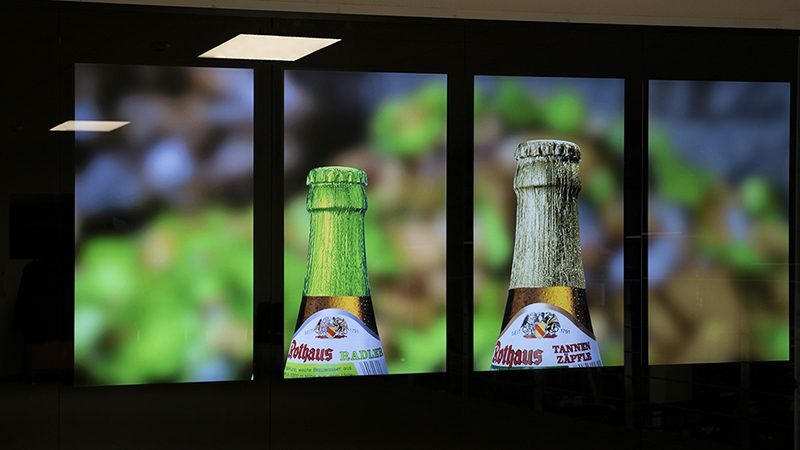 This creates a strong identification with the people behind the beer brand. 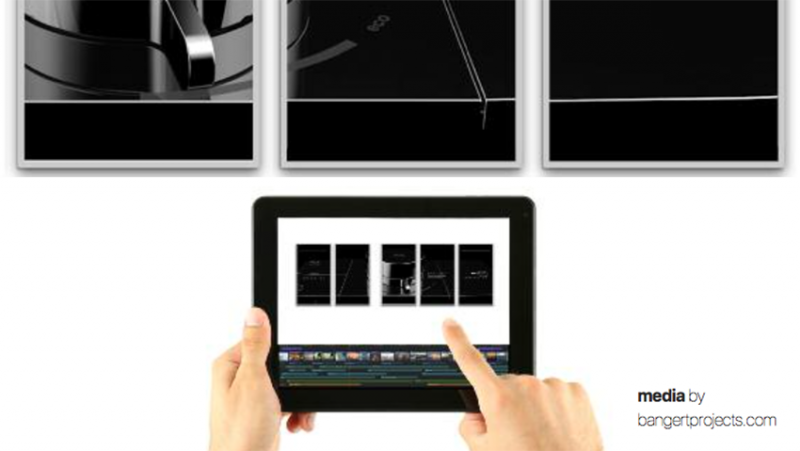 With handheld devices or laptops content such as videos, slideshows, and text can be shared online with the external screens. 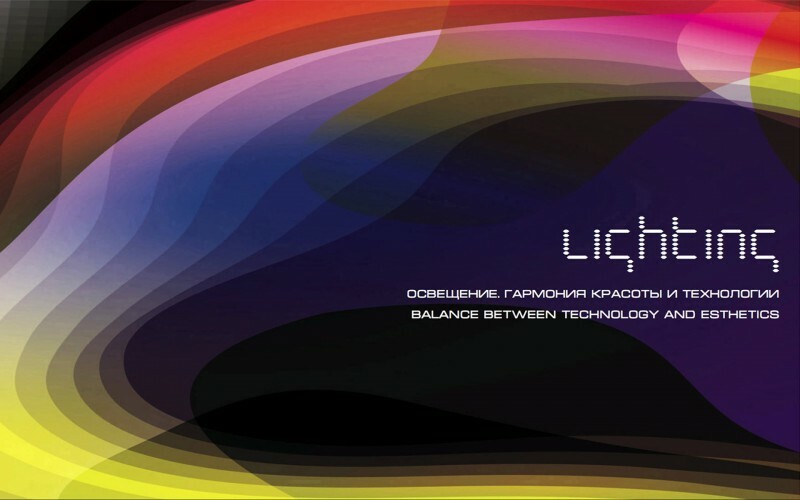 We have developed our own software that can be use worldwide. 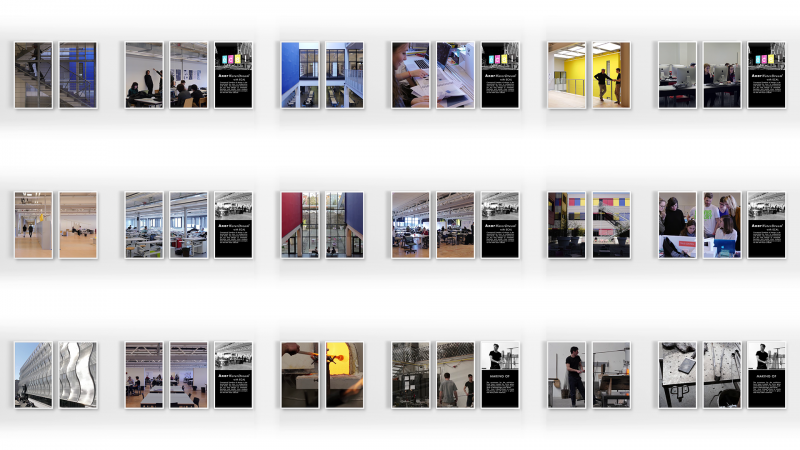 Ultimately it's about the art of telling every story from image videos to background information. 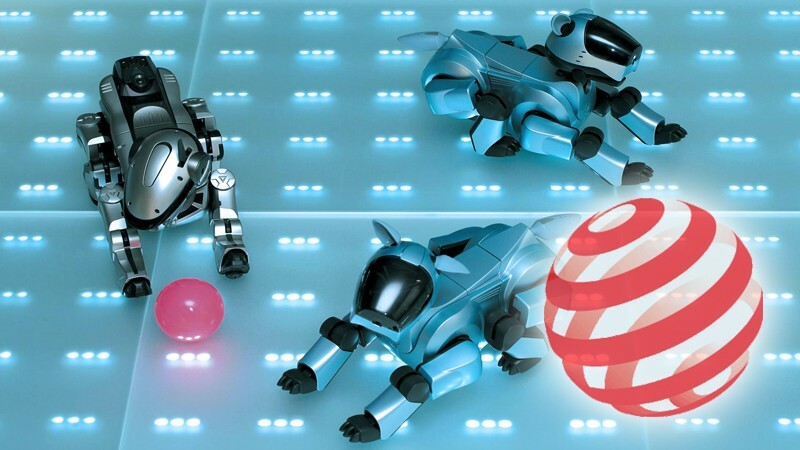 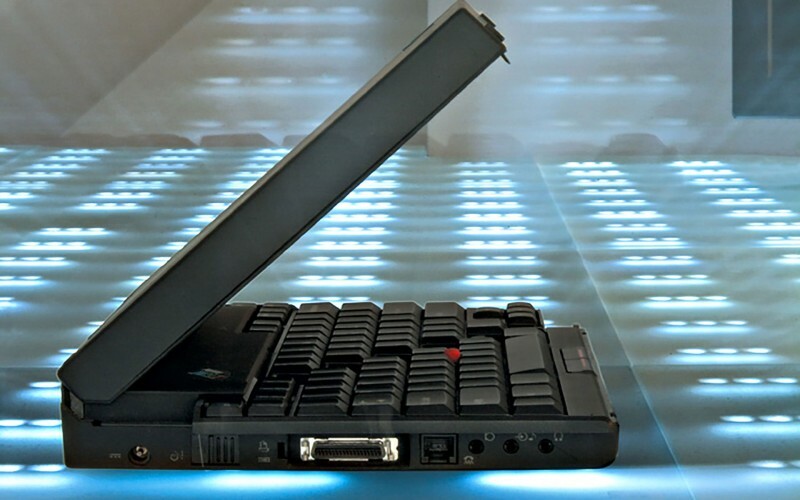 The hardware can be modular and mobile as well, the software is controlled centrally and web-based. 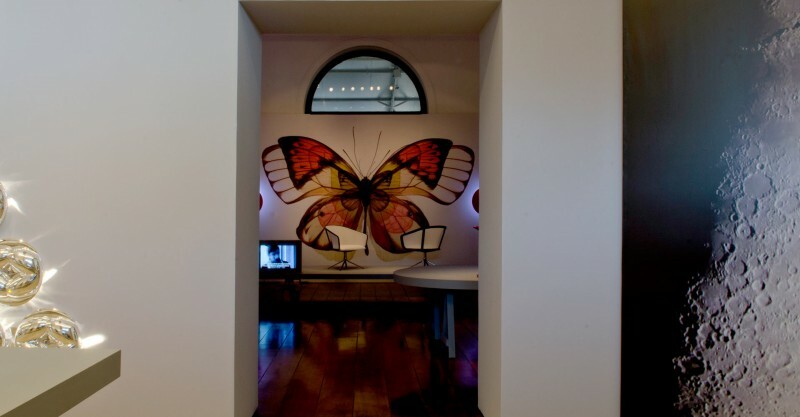 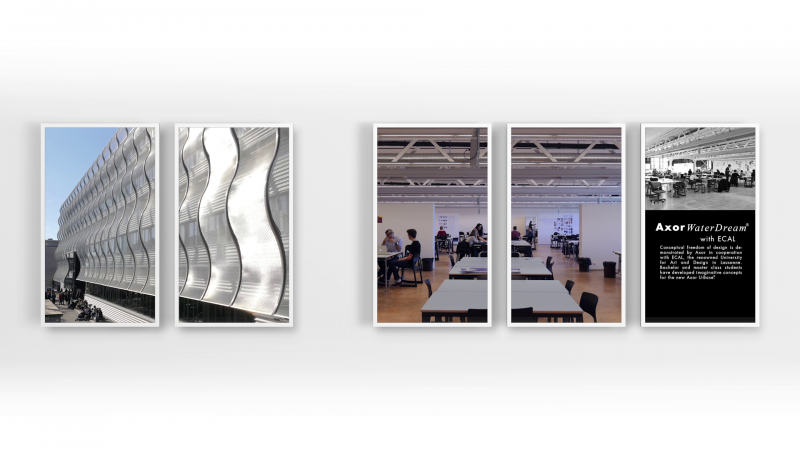 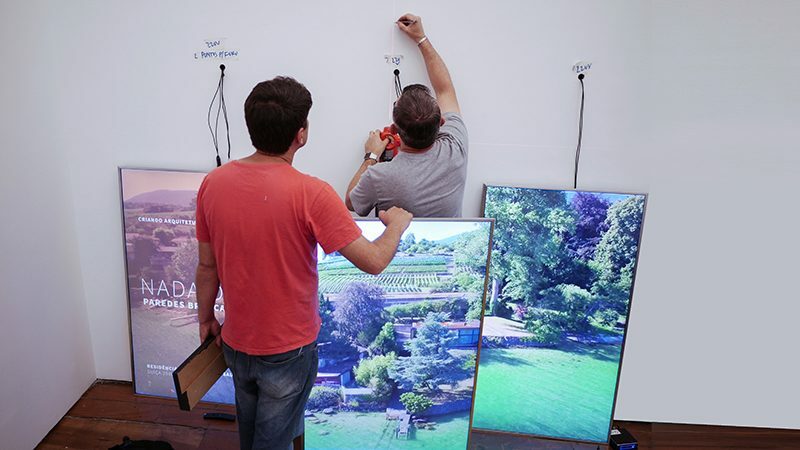 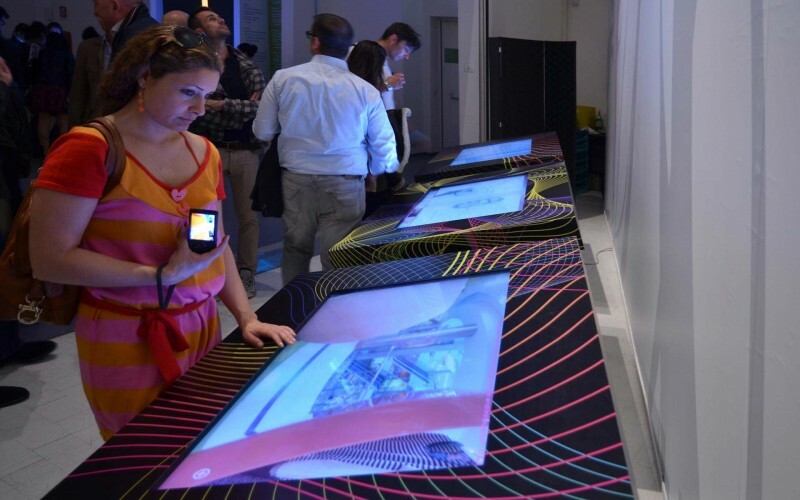 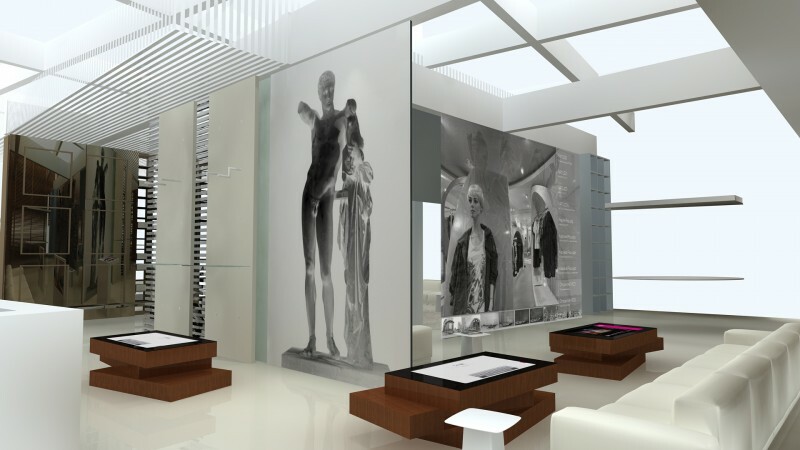 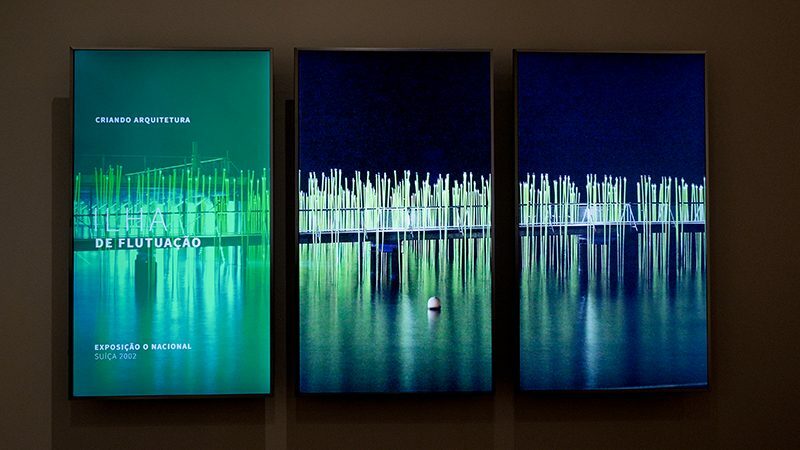 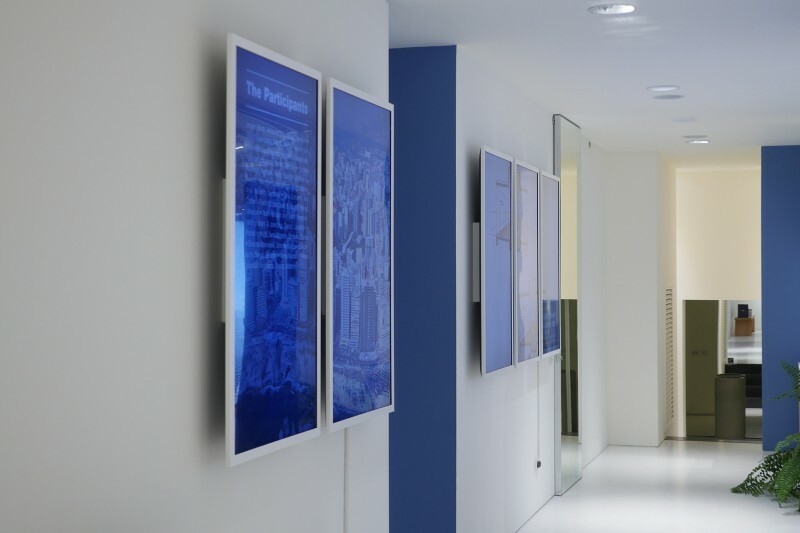 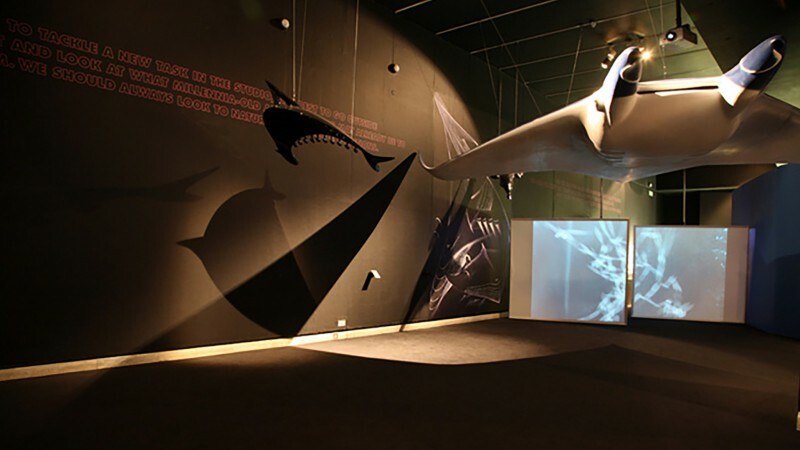 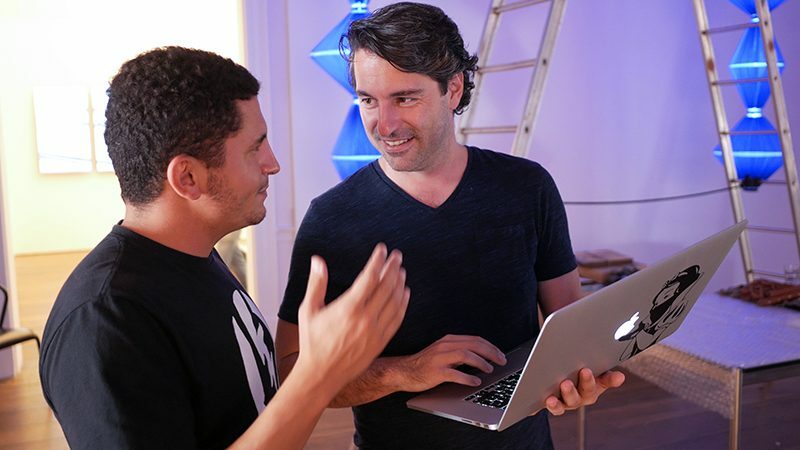 In the popular Museu da Casa Brasileira in Sao Paulo we had the possibility to install 12 of our web-based screens. 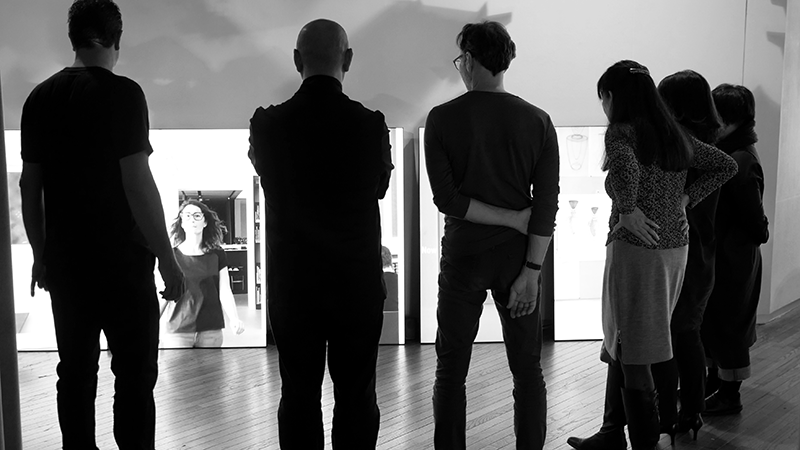 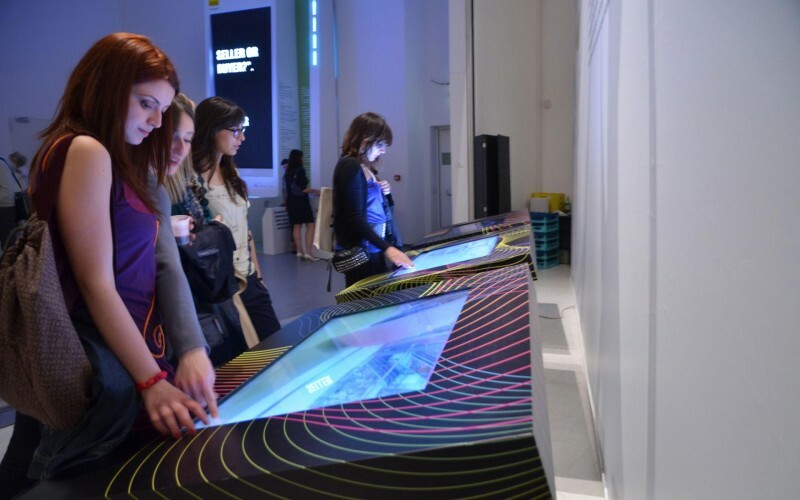 A ideal chance to show the storytelling abilities of the screen-concept in a museum context. 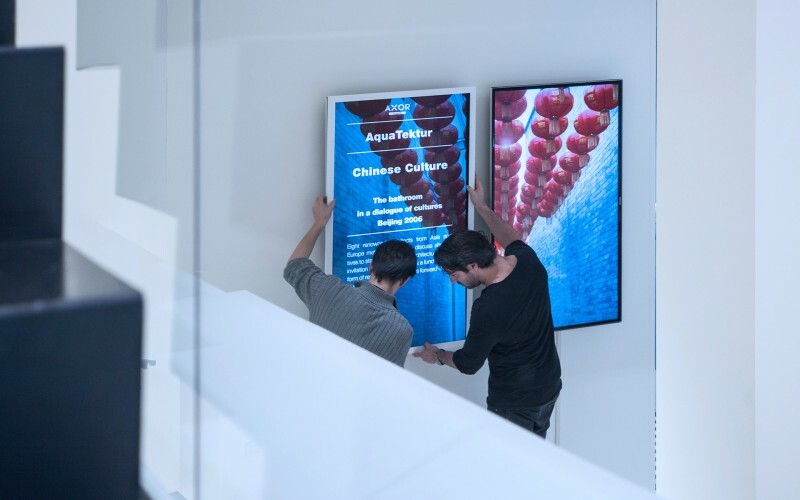 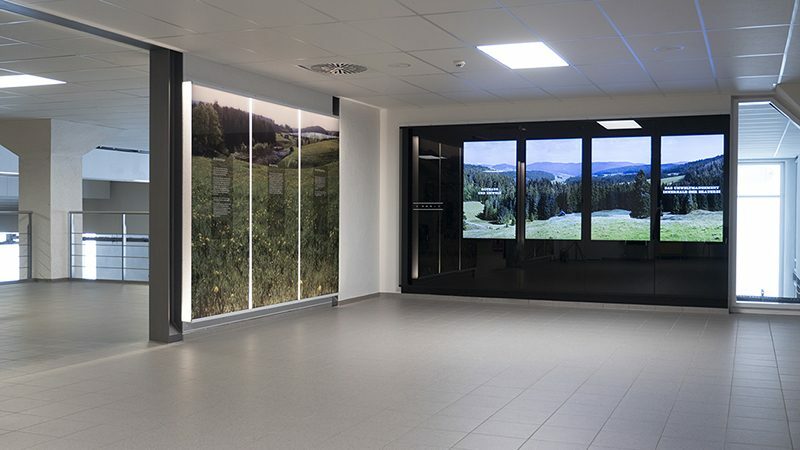 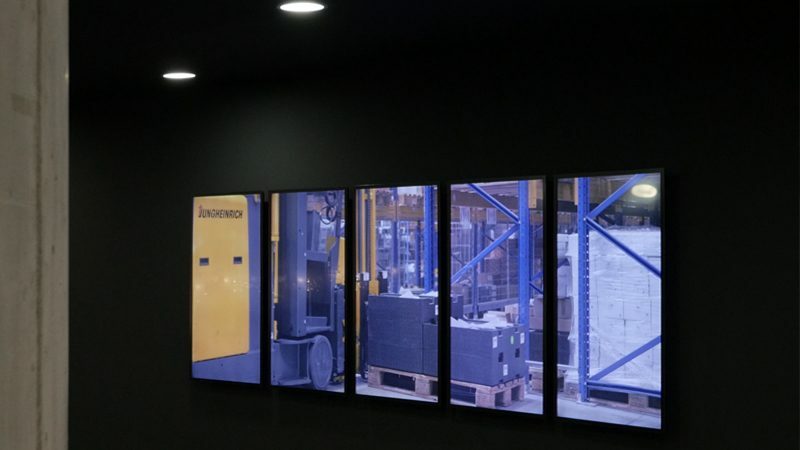 The screens are suitable for delivering background information to the visitor while at the same time conveying an atmospheric ambient quality. 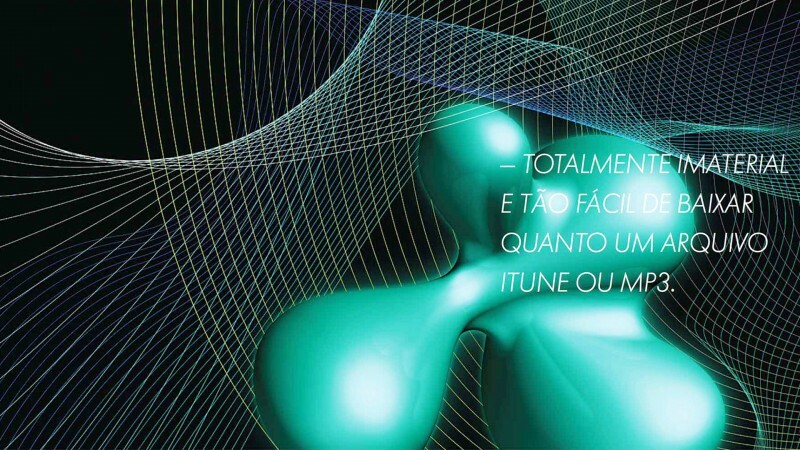 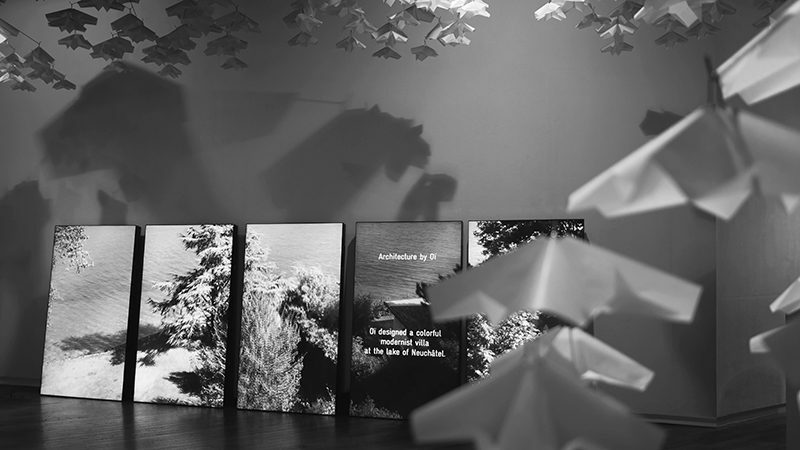 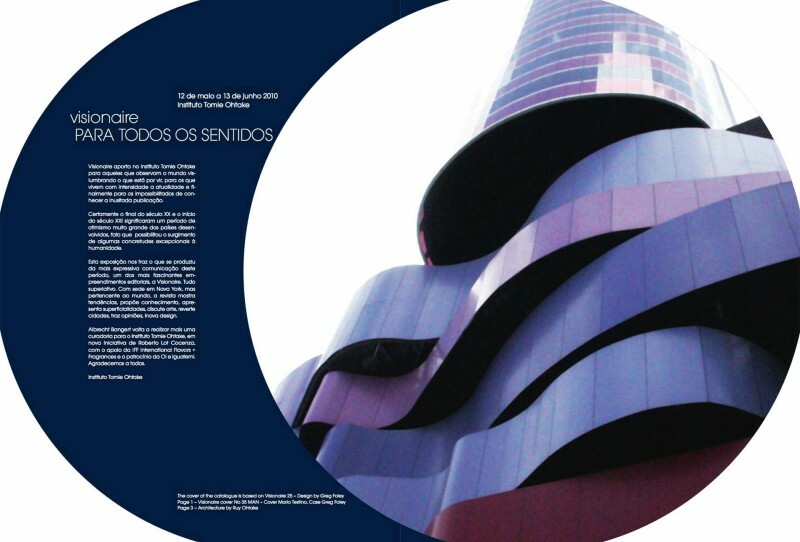 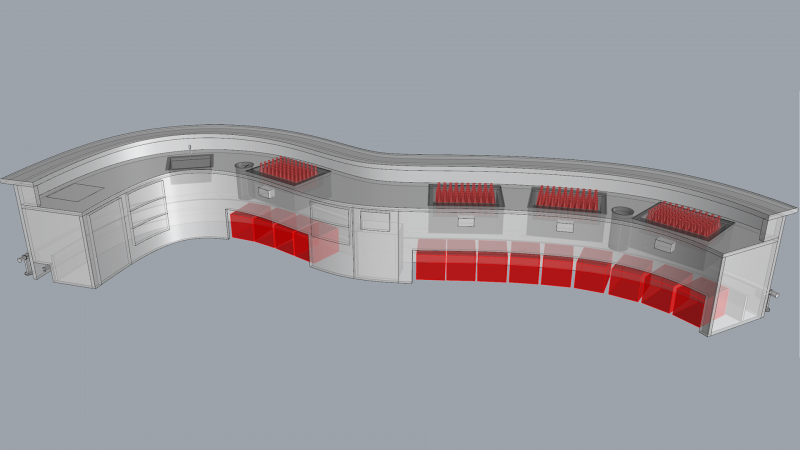 The exhibition will be our 4th project in Sao Paulo. 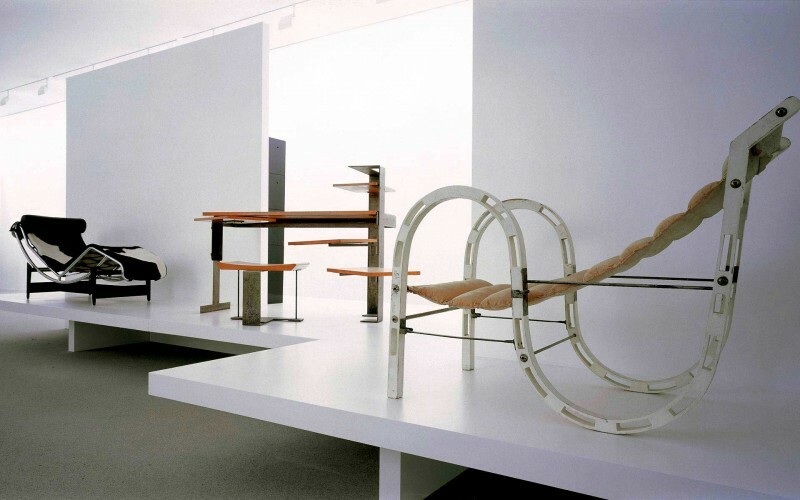 Under the patronage of the Swiss Embassy - in partnership with Atelier Oi - we will stage the big picture of their “Savoir-Faire” movement of Swiss Modernism. 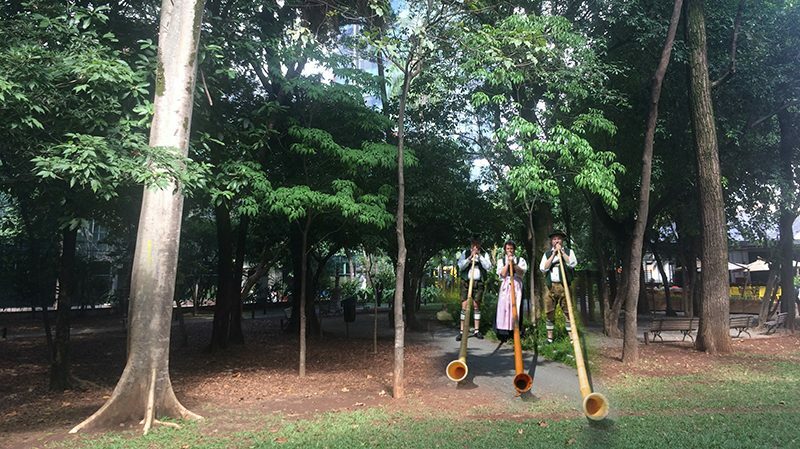 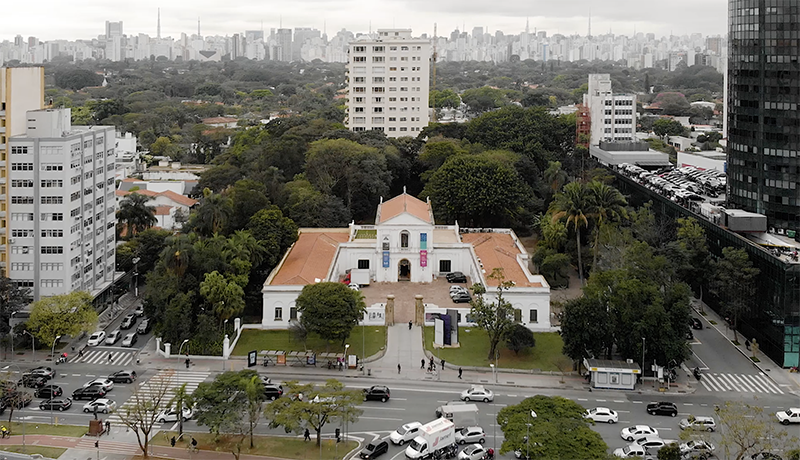 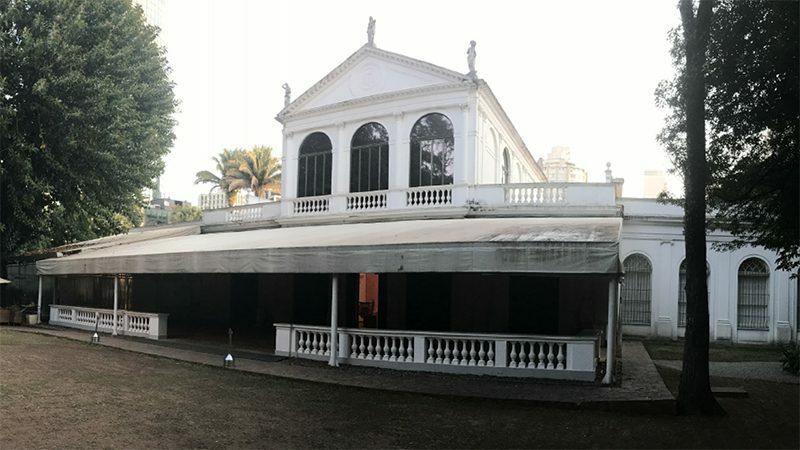 Museu da Casa Brasileira, Sao Paulo, grand opening August 25th 2018. 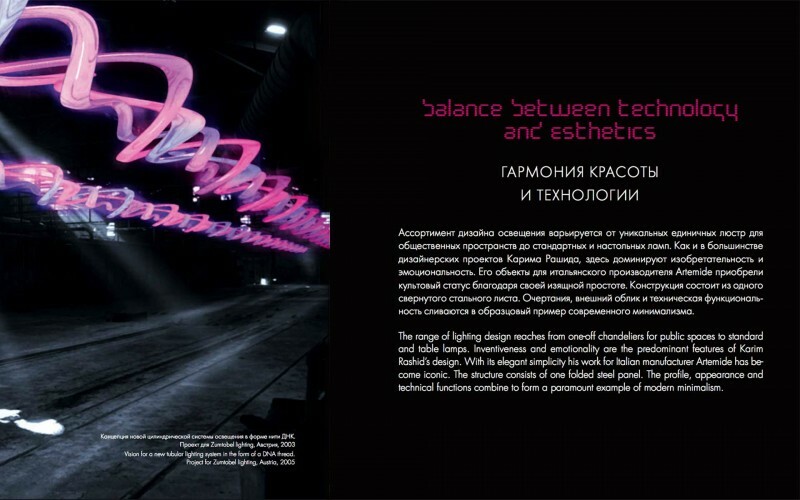 A 460 page catalogue will accompany the exhibition. 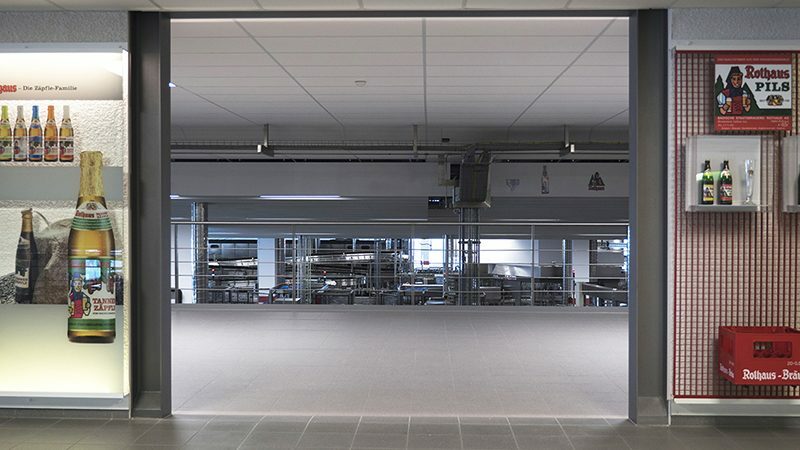 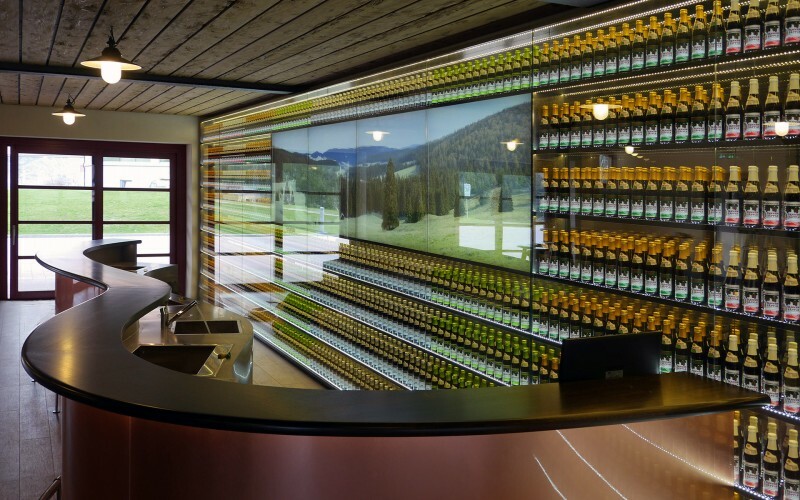 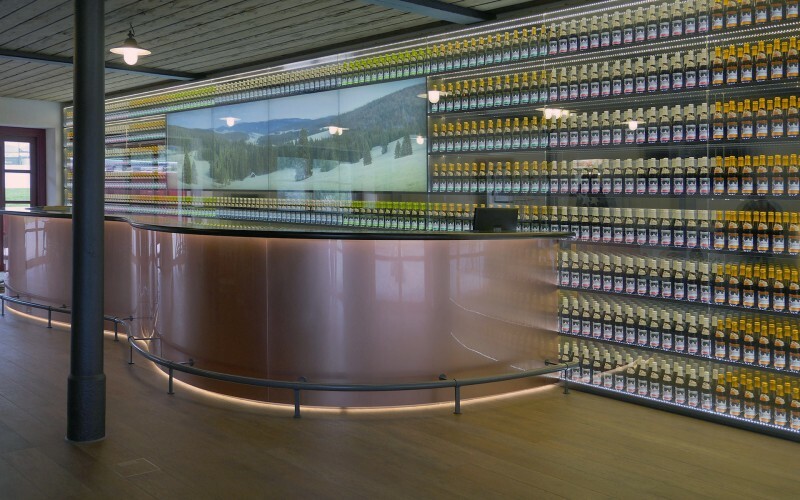 bangert projects developed a large media wall behind mirrored black glass for the next generation of a bottling line. 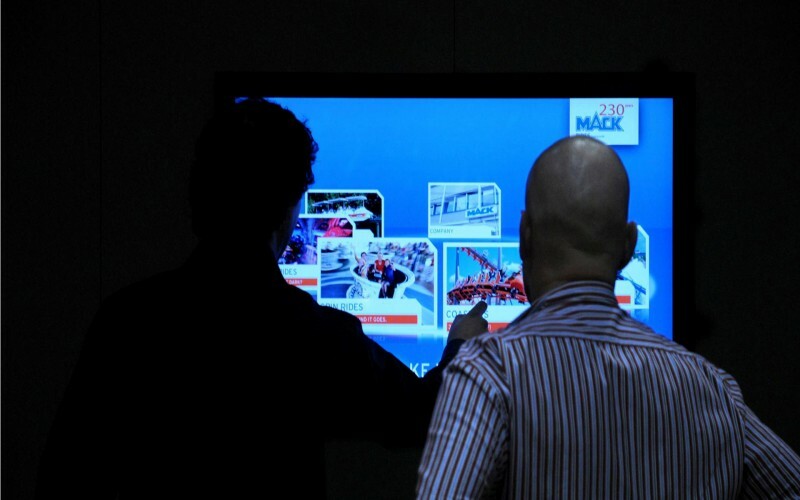 A light-active control panel allows visitors to watch movies. 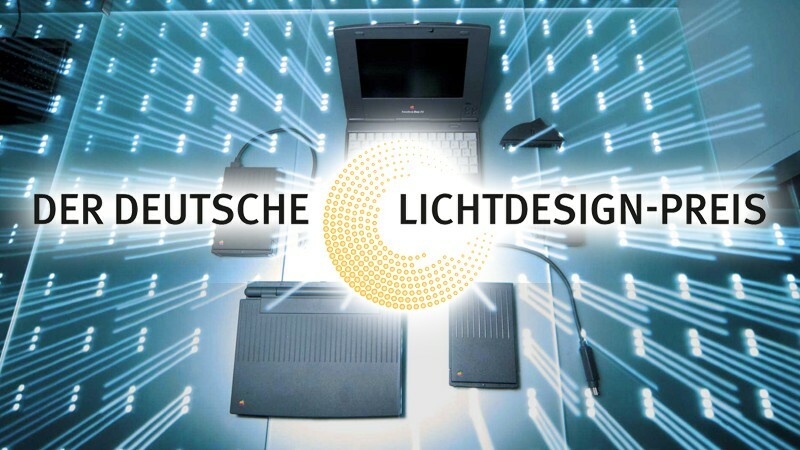 The entire system is managed by us web-based. 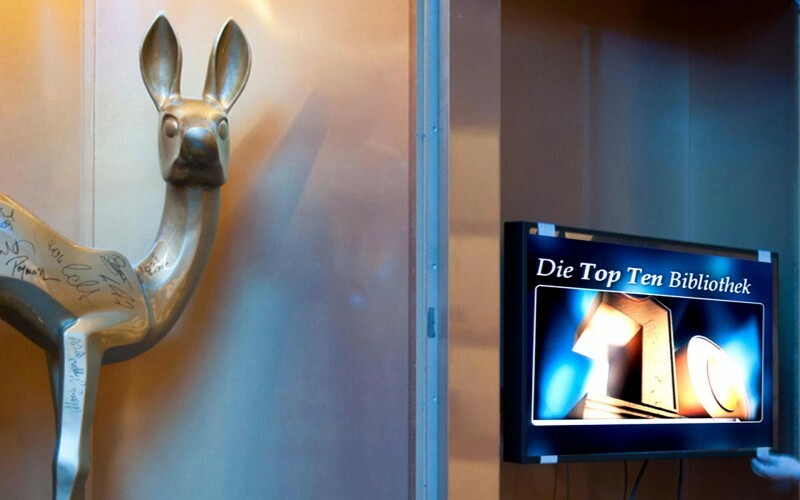 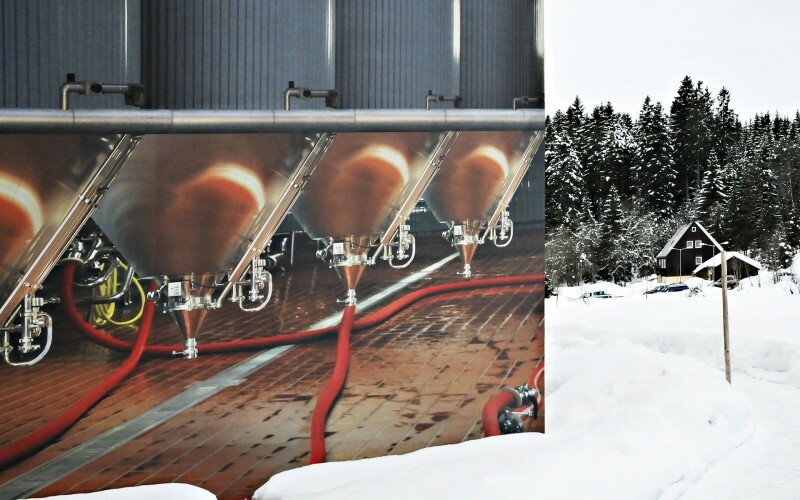 The system was installed in the highest brewery in Germany and is already a big attraction for the public. 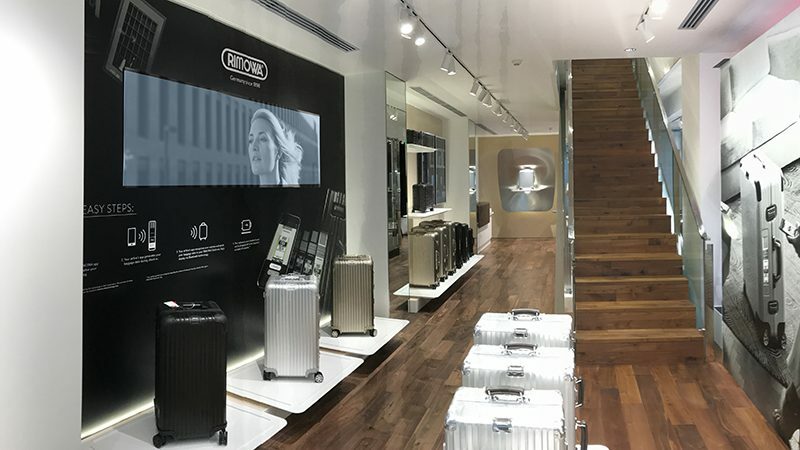 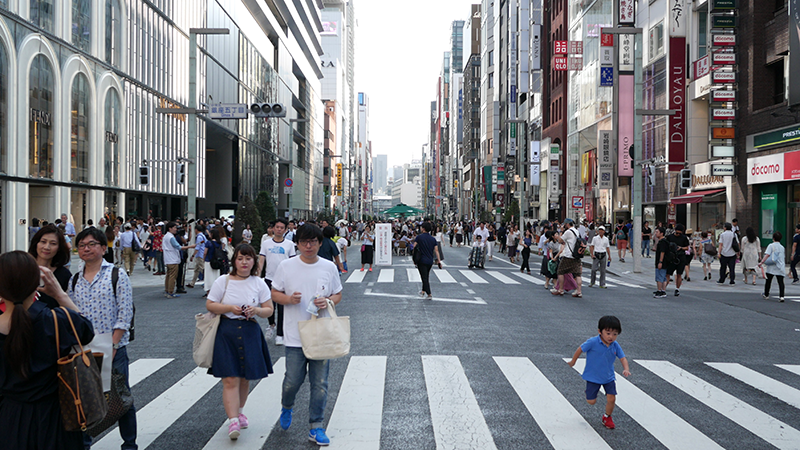 After Paris we had the pleasure to install our online-multi-screen-media system in the new Rimowa store in Tokyo-Ginza. 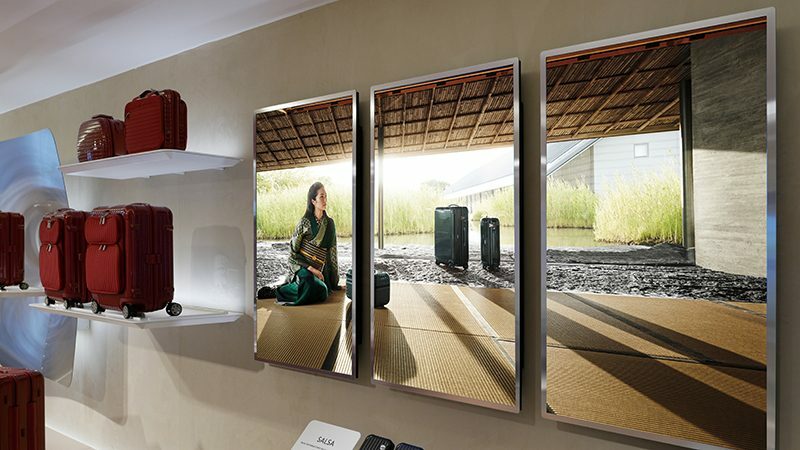 On 7 screens the shoppers can watch travel scenes in combination with the iconic Rimowa suitcases. 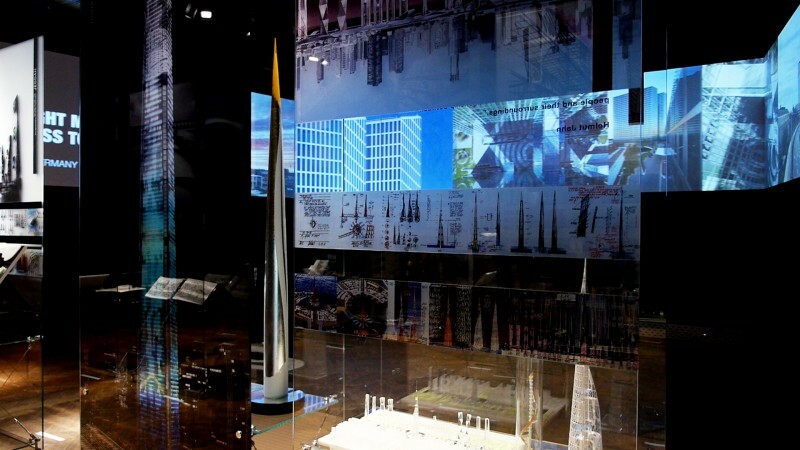 Step inside the Swiss Pavilion Expo 2017 Astana to discover an interactive and poetic ecosystem in the midst of the modern and dynamic Astana exhibition. 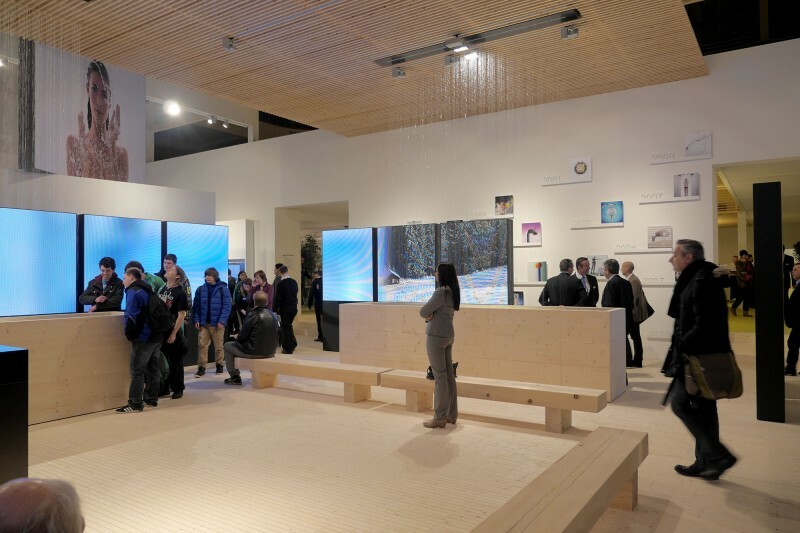 Focused on energy efficiency and sustainability and the management of natural resources, the Pavilion is centred on renewable energy sources. 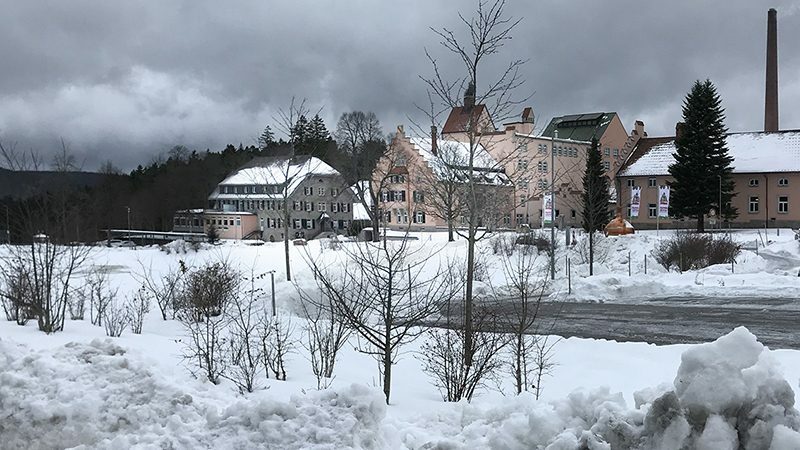 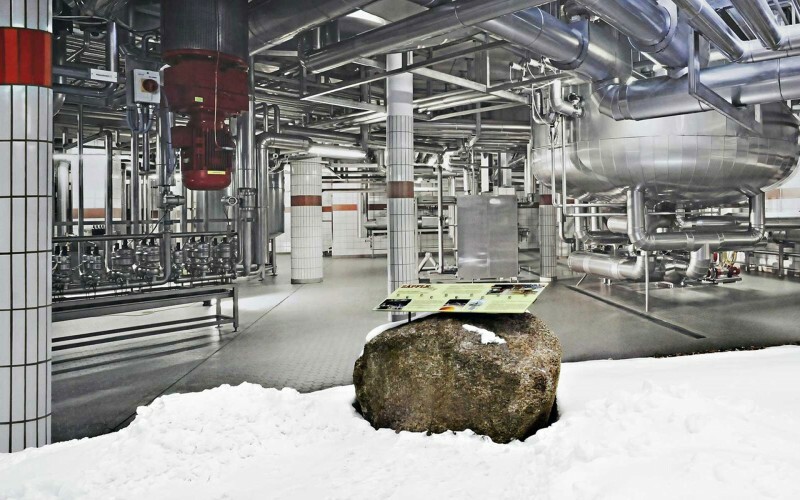 It also shows off the beauty of the Swiss Alps and promotes Switzerland as fertile ground for scientific research and innovation. 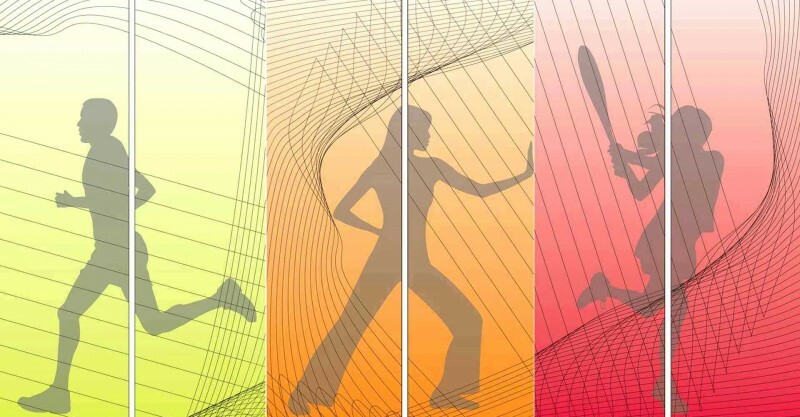 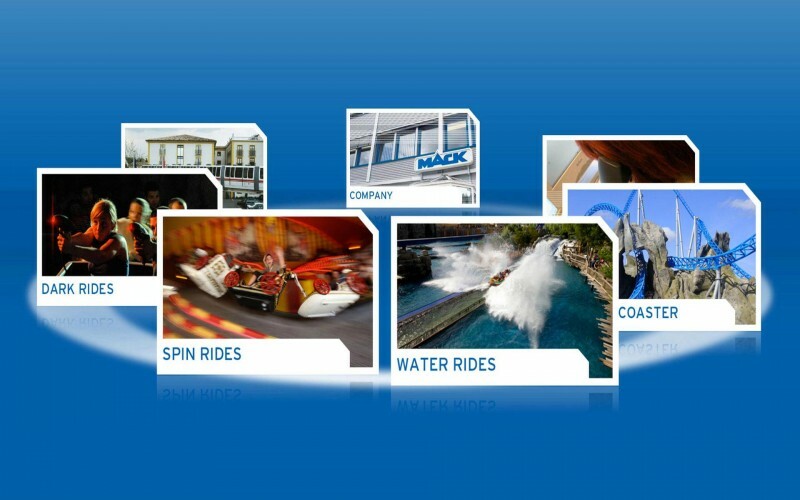 The three individual houses form an educative yet fun nexus which, with the concourse of two video games, will embark the visitor on a fun and empowering adventure. 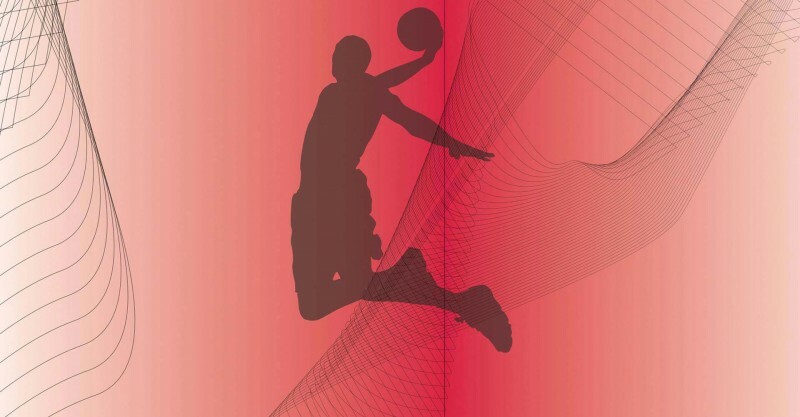 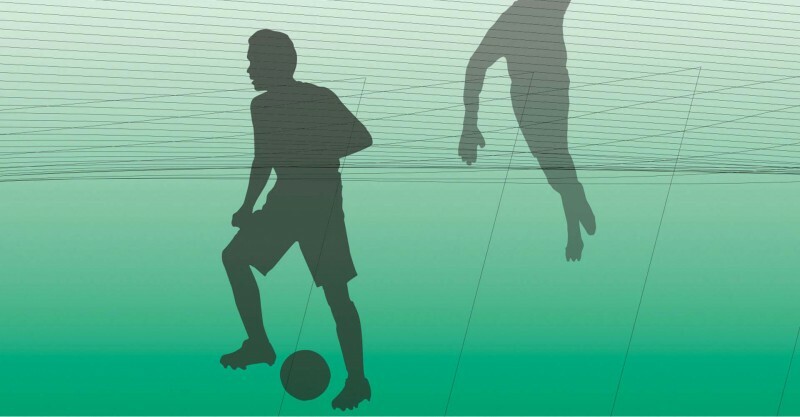 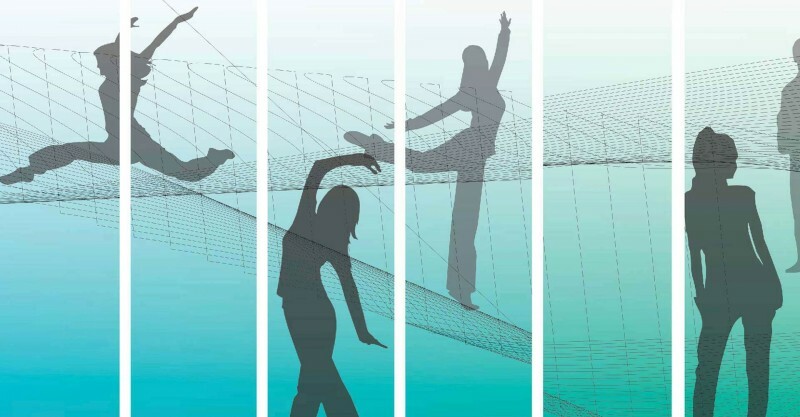 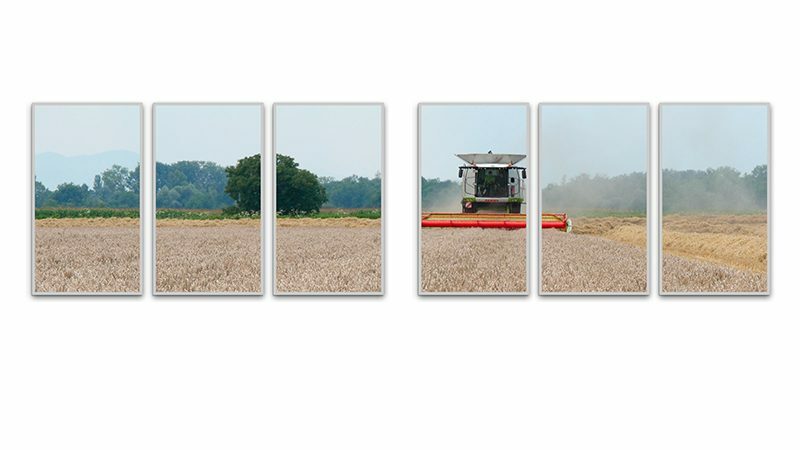 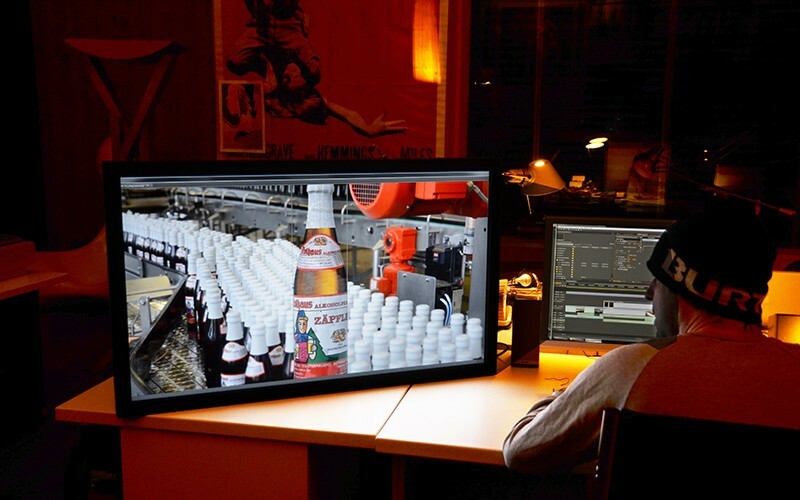 Windows to the production is one of the most obvious applications of our dynamic screens. 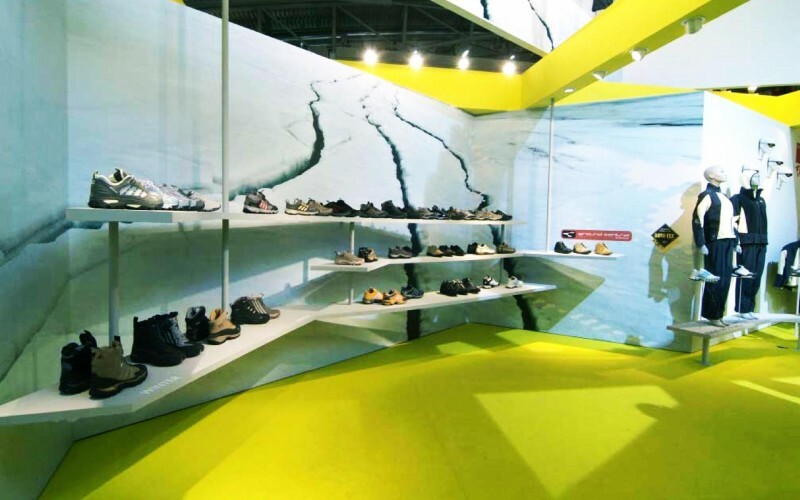 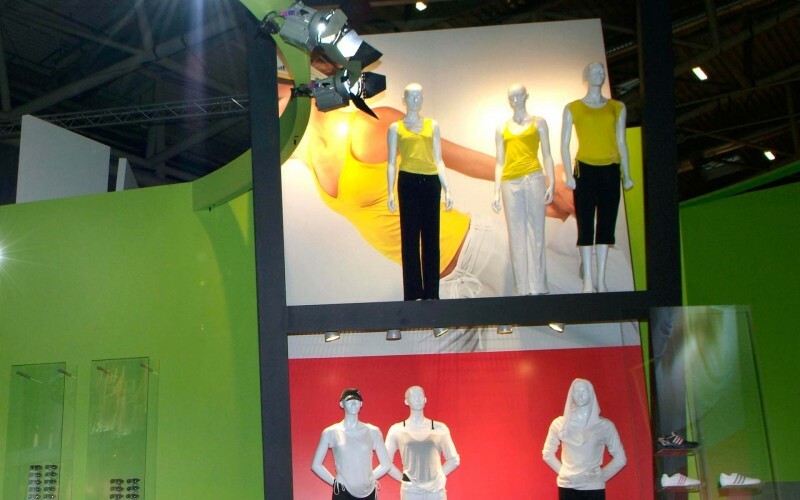 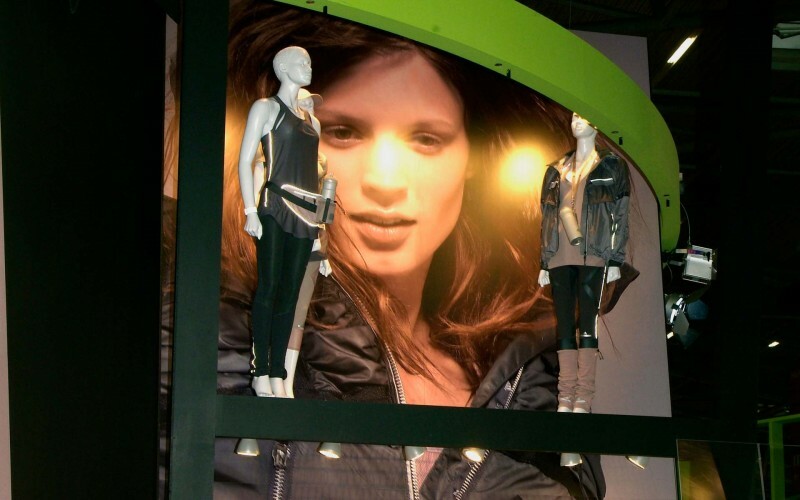 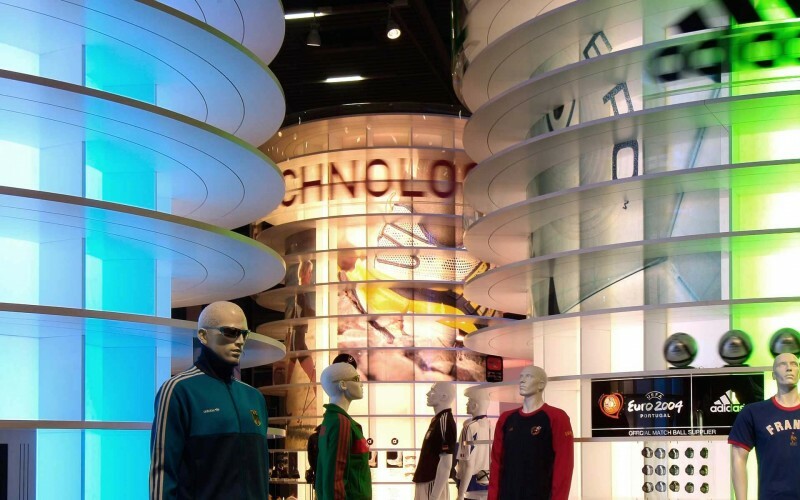 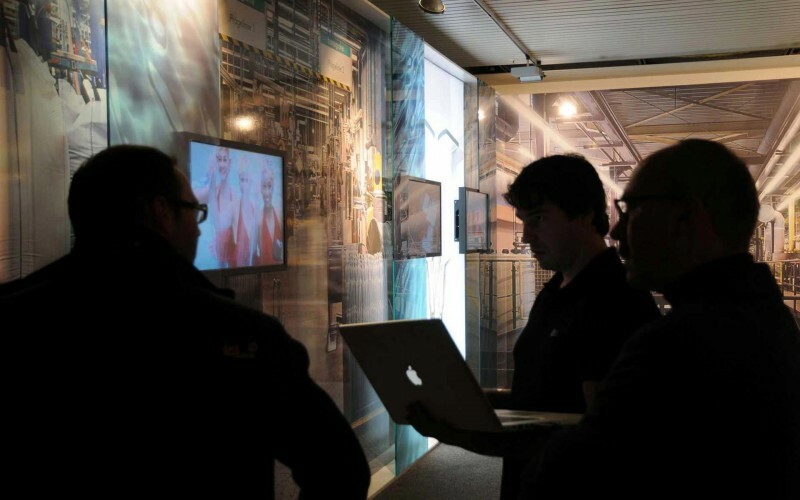 Companies can show their productions to the customers „live“ in their showrooms. 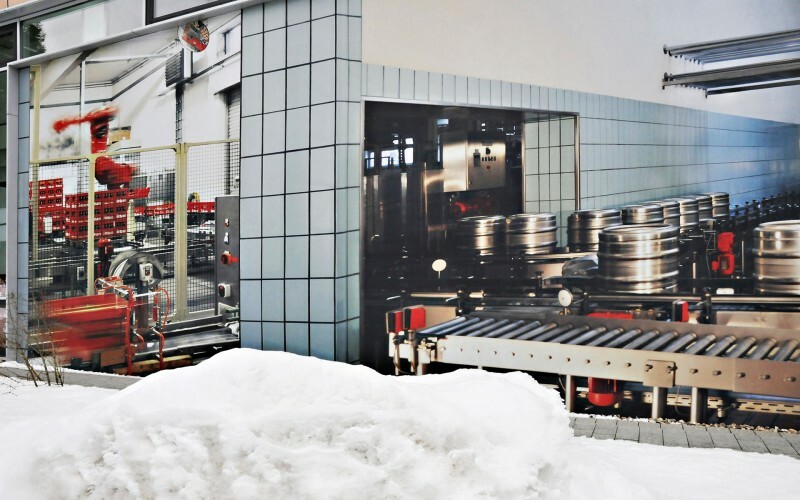 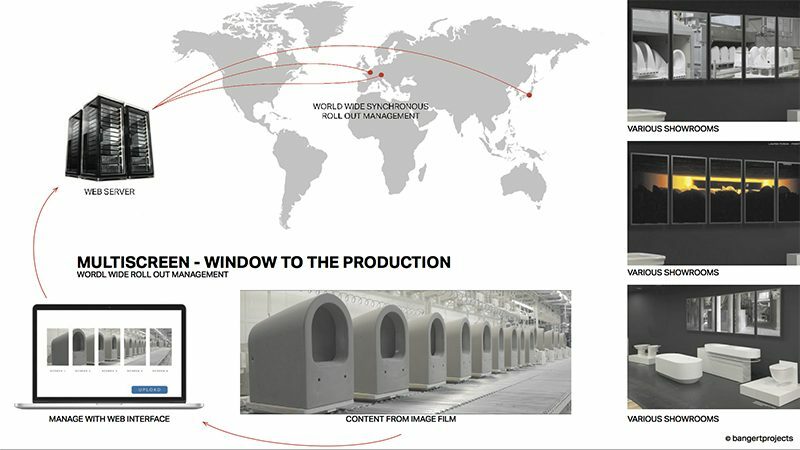 For Laufen Bathrooms in Switzerland we recently opened a window to their factory. 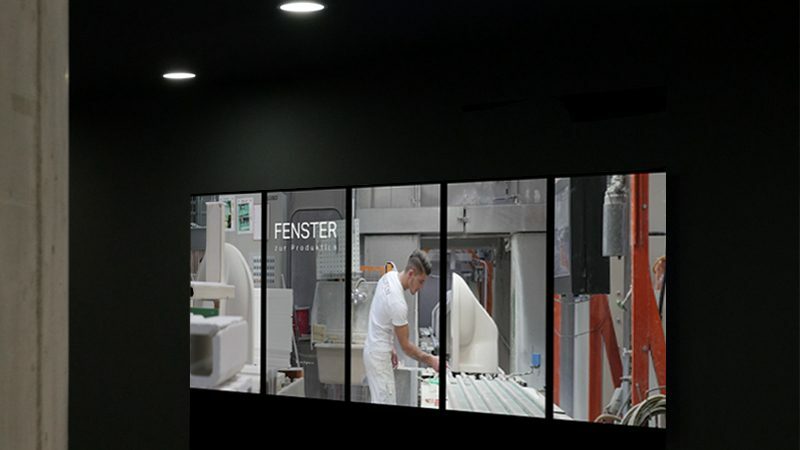 The visitors of the Laufen showroom can watch now how the world class ceramic is produced in the nearby plant. 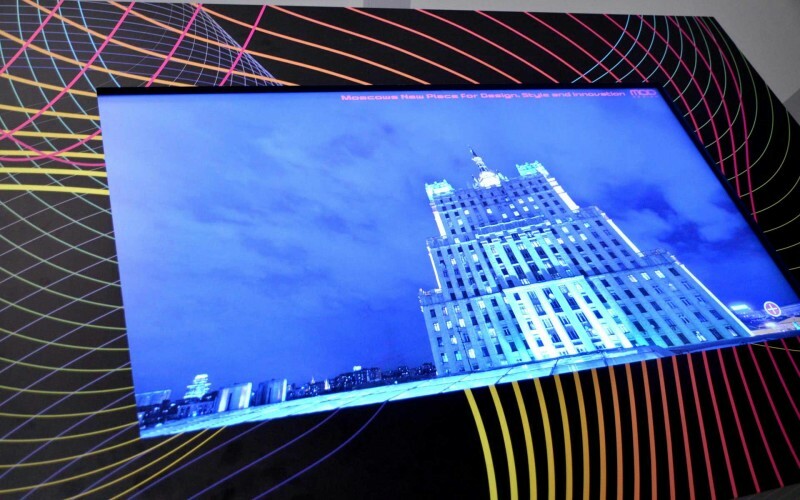 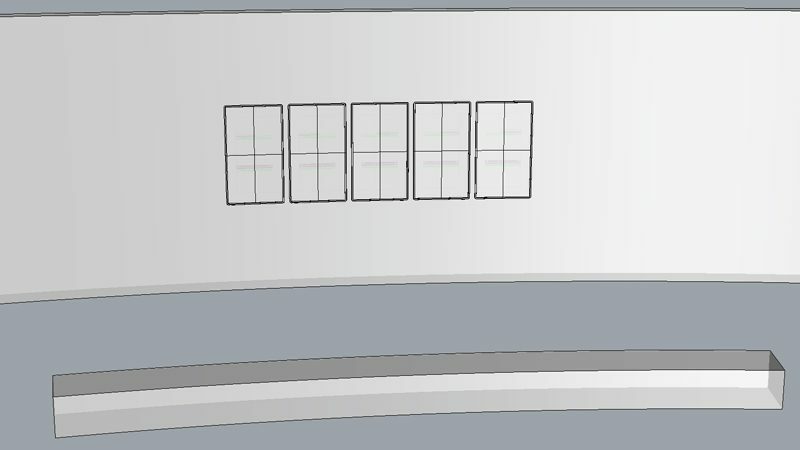 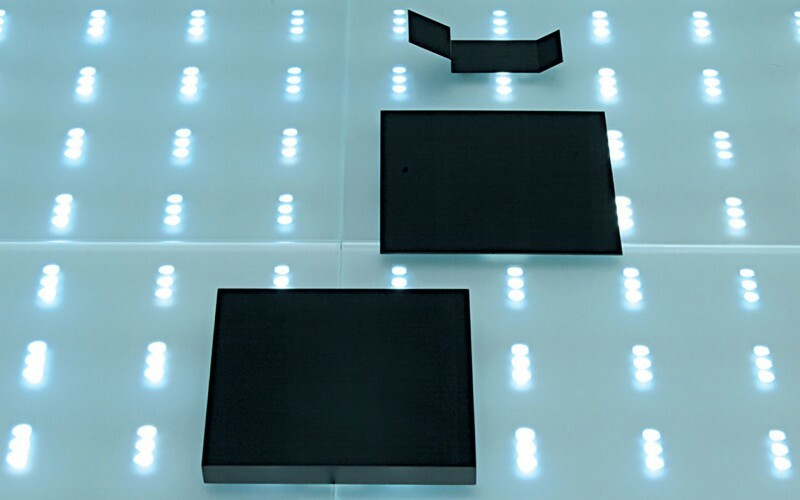 Online replaceable content for screens and LED. 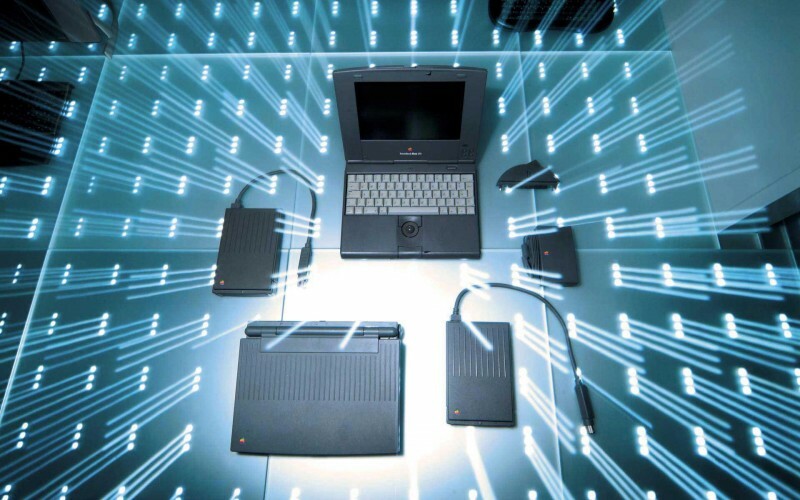 Programming, implementation, content adaption. 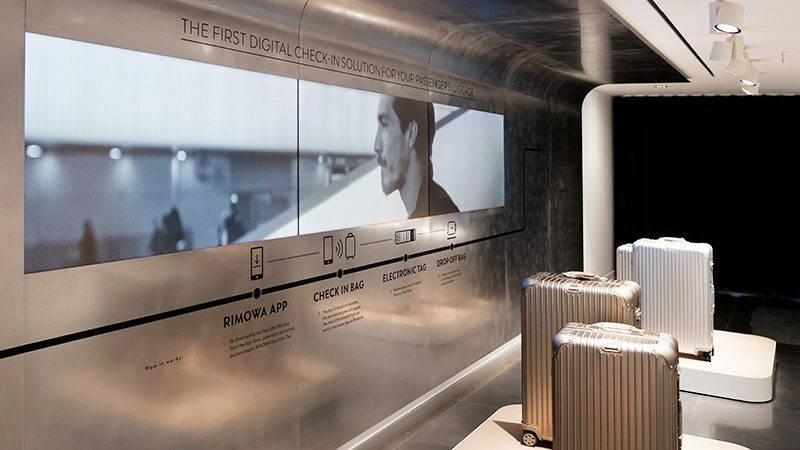 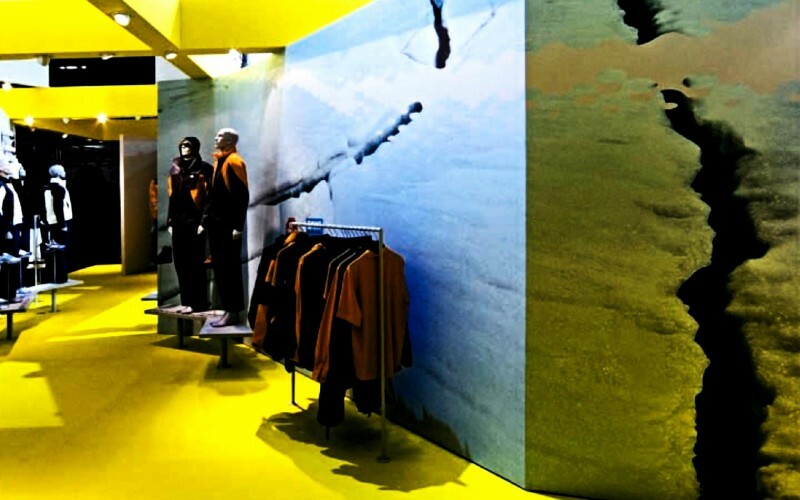 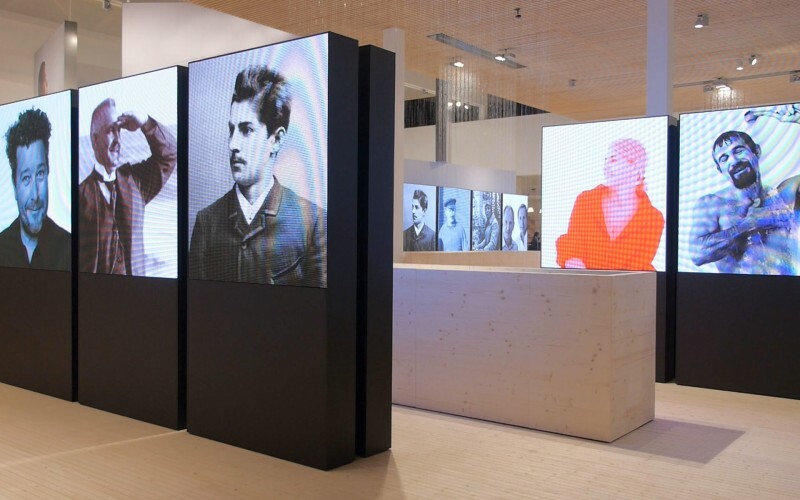 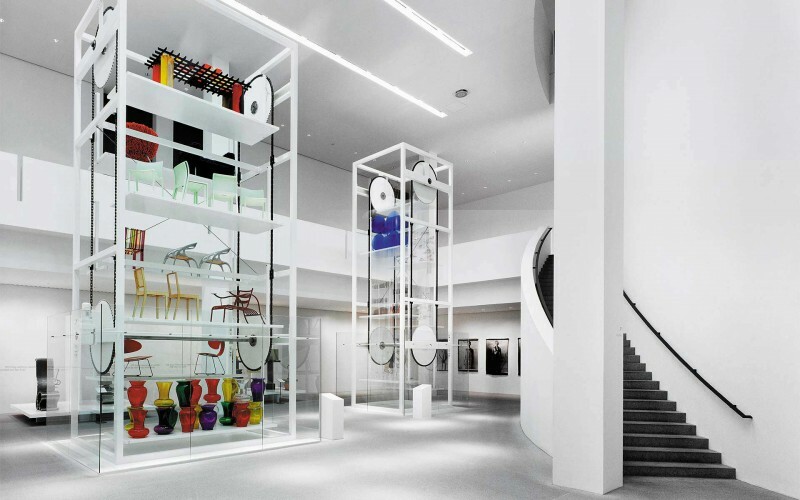 A 4-floor media installation enhancing the brand experience in the new Rimowa concept store. 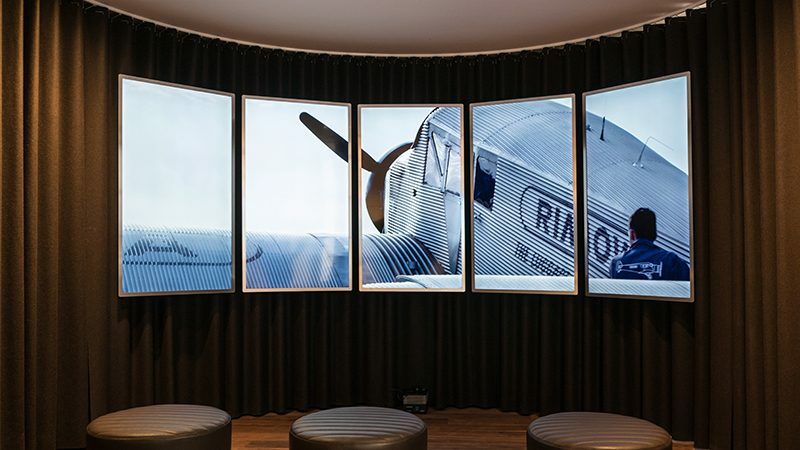 Like in an art gallery the screens show stories as travelling in Japan, the electronic tags and the legend of the rebuilt Junkers F13 airplane. 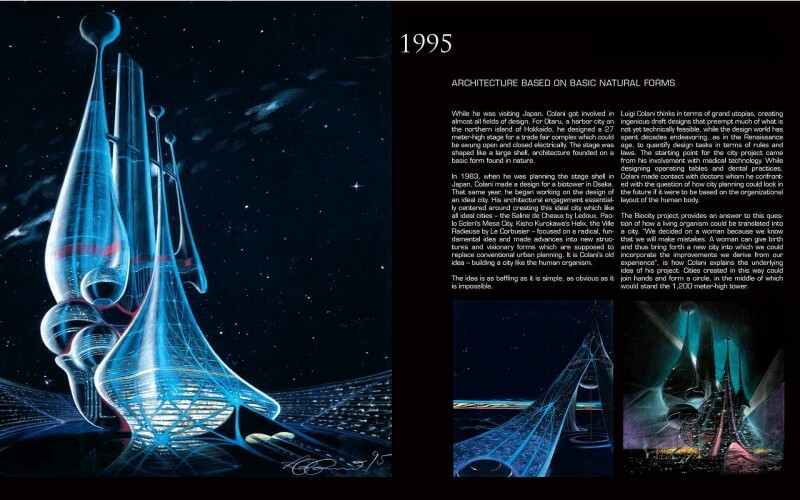 On the occasion of the 90th birthday of the master, we want to look back on our fruitful and prosperous cooperation since 2001. 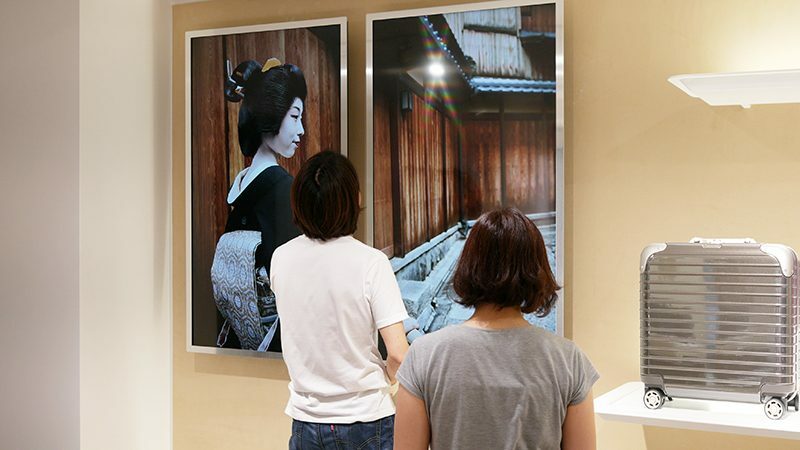 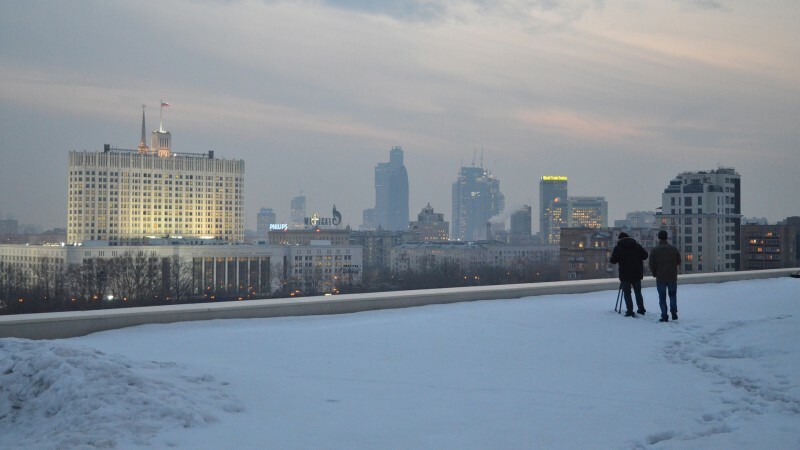 The cooperation includes international publications and international exhibitions in Karlsruhe, London, Kyoto, Tokyo and Qingdao. 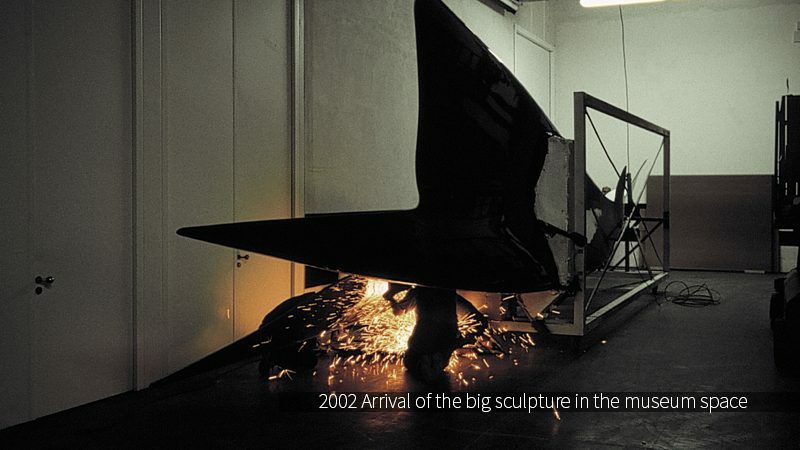 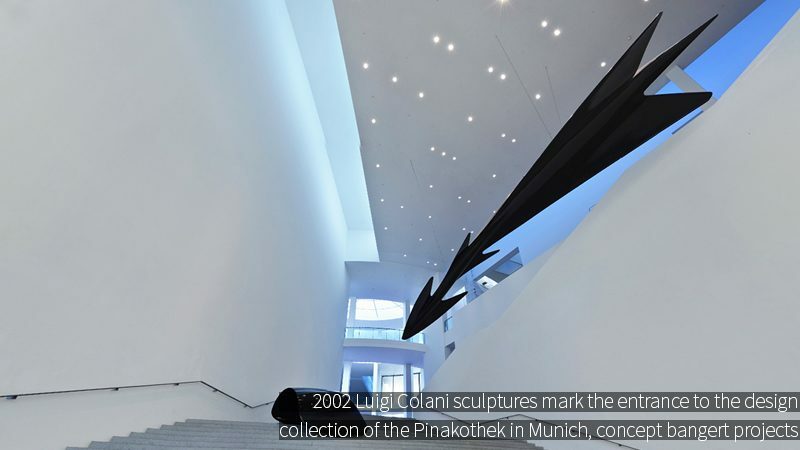 The starting point for everything was the large sculpture in the staircase of the Pinakothek der Moderne in Munich, followed by the award winning book: Albrecht Bangert, Luigi Colani – The Art of Shaping the Future (Thames & Hudson, Princeton University Press and Bangert Verlag). 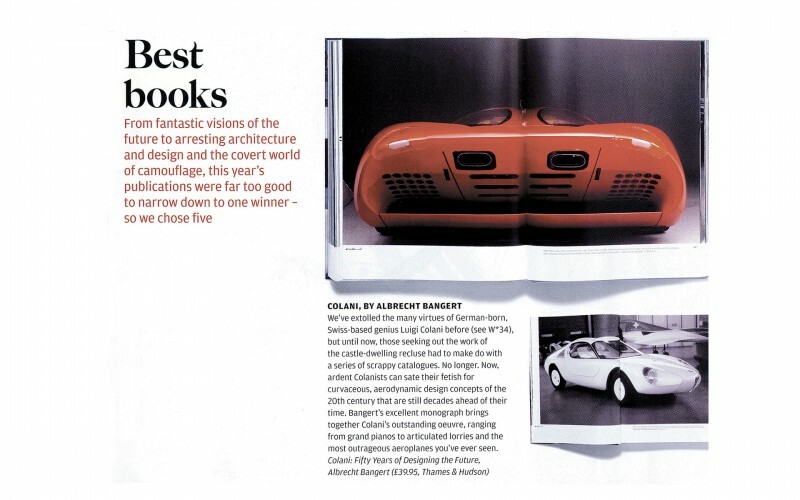 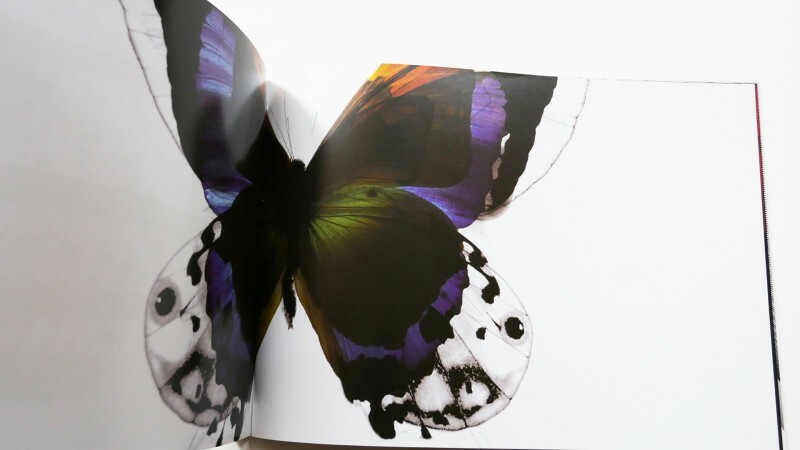 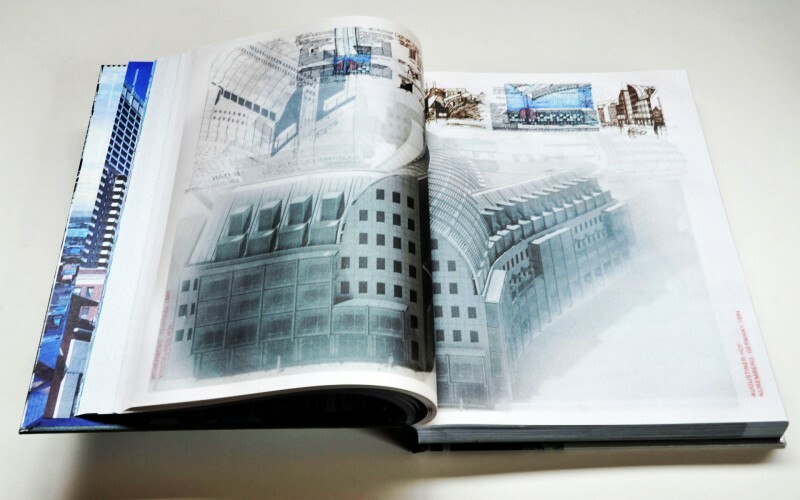 This book has been awarded 2004 by the British Wallpaper magazine in the category „Best Design Book of the Year“. 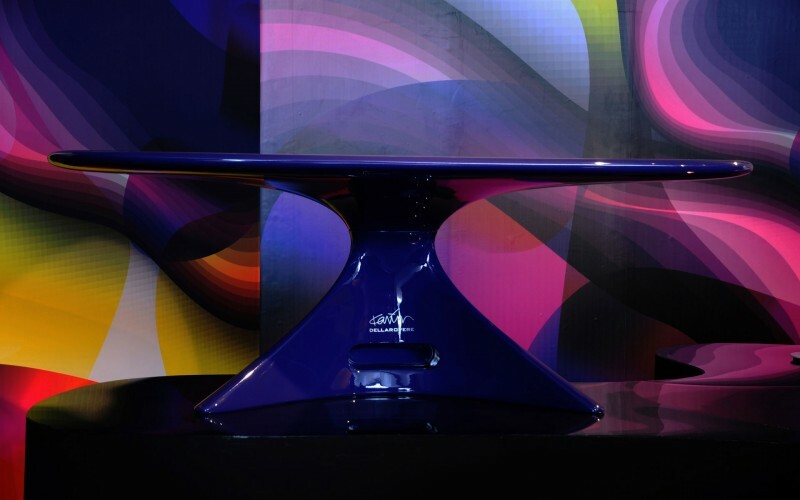 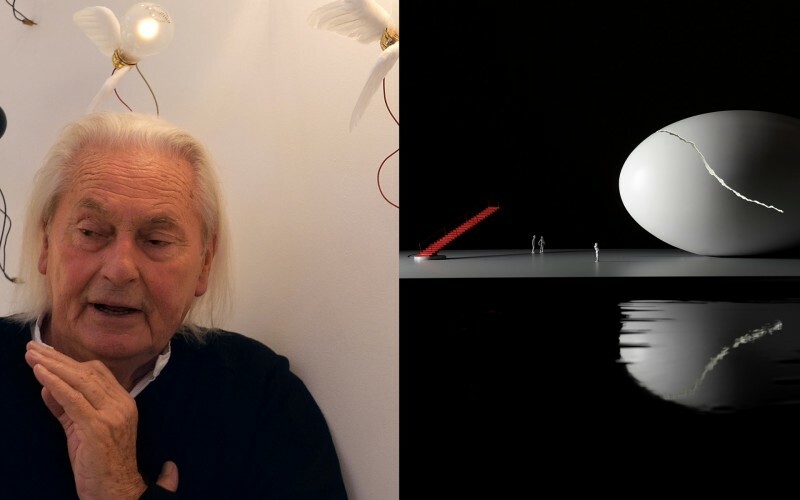 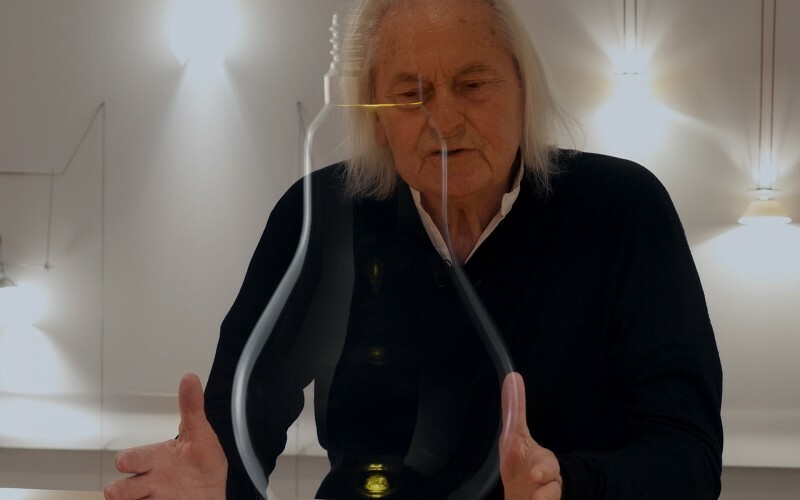 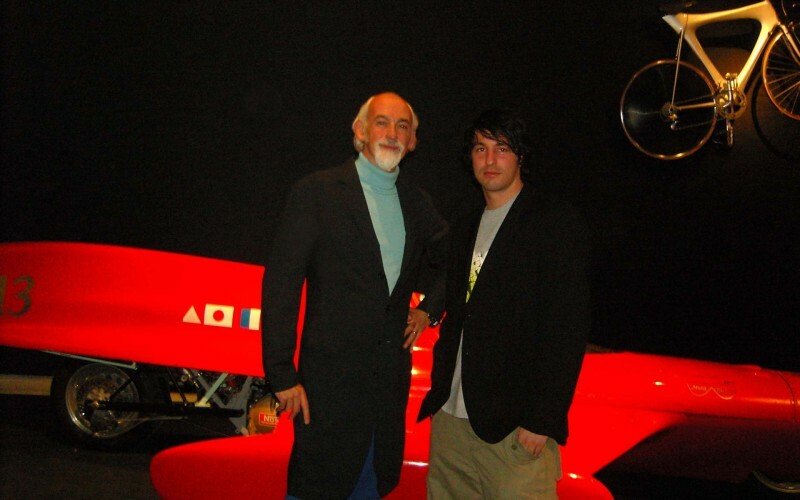 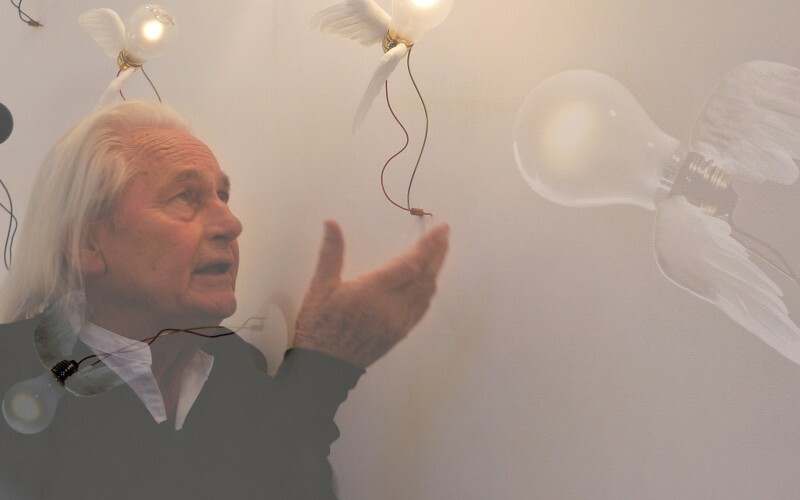 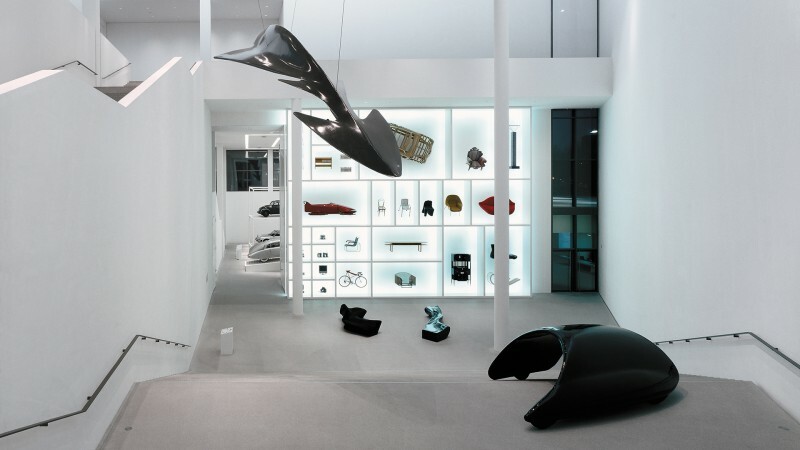 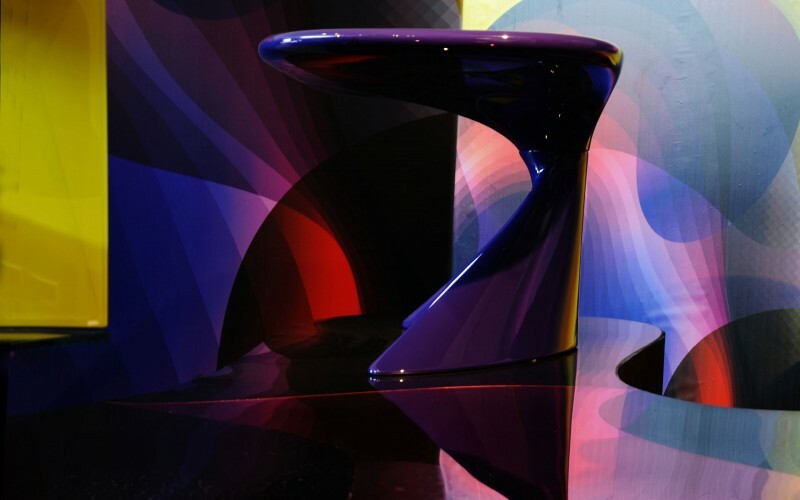 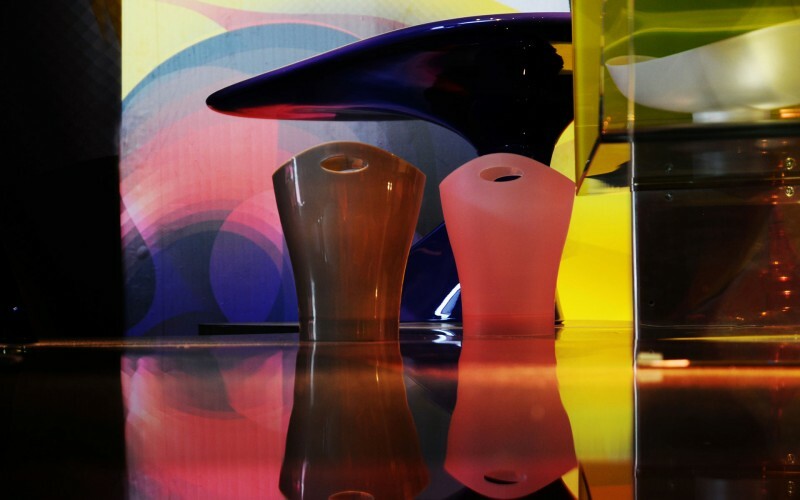 On the occasion of the 90th birthday of the master as well we are happy to publish a film, that we have produced already in December 2011 with a great admirer of Luigi Colani: the acclaimed designer Ross Lovegrove. 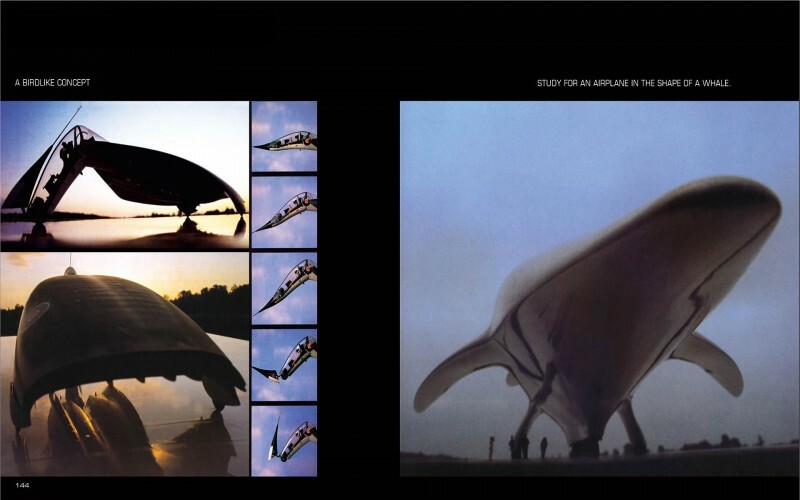 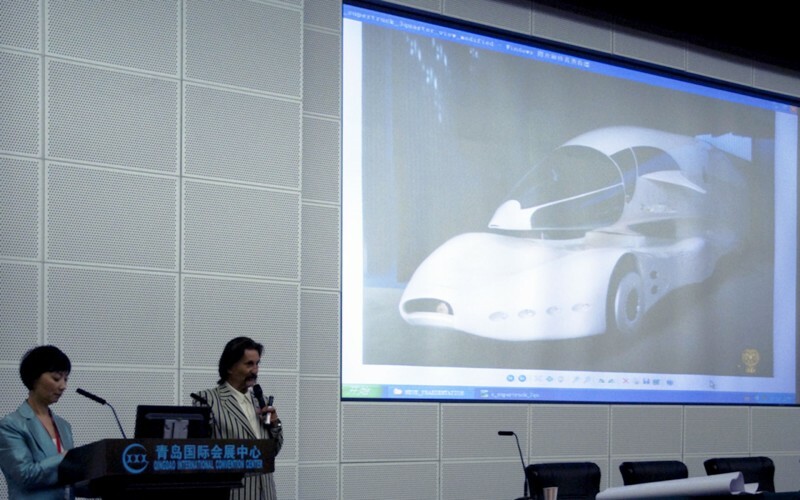 Ross talks about Colanis fearless approach to design, about the lessons of nature and about the mindset of the master in any respect from small objects as cameras and earphones to great visions in the fields of mobility, aviation and future life. 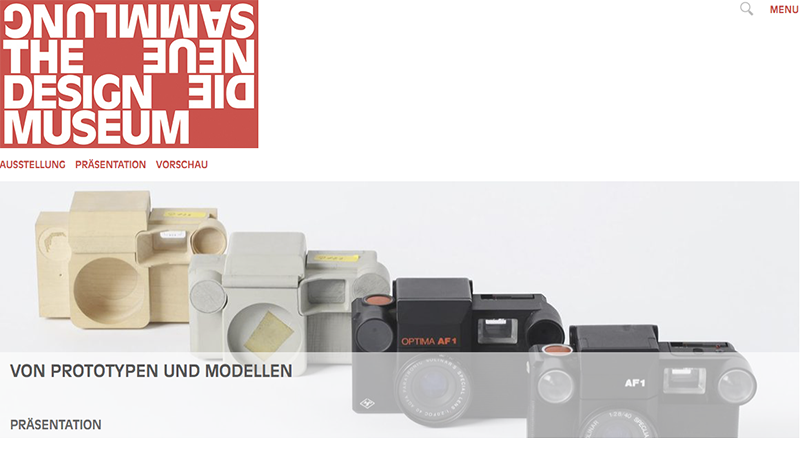 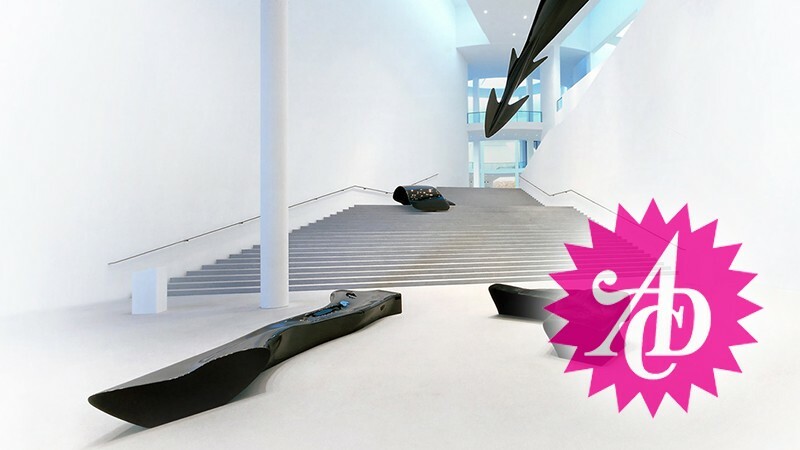 New Website for the design museum Die Neue Sammlung. 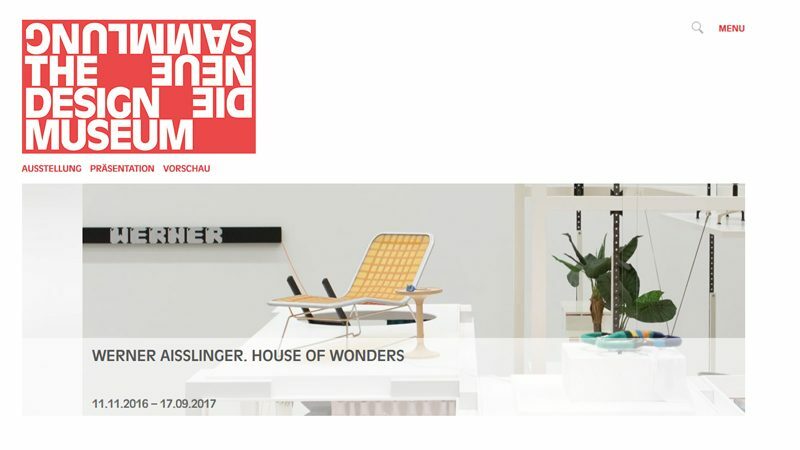 Based on the new corporate design of Bureau Mirko Borsche curator Rainer Schmitzberger from the museum and bangert projects developed a new fresh look for the museum website. 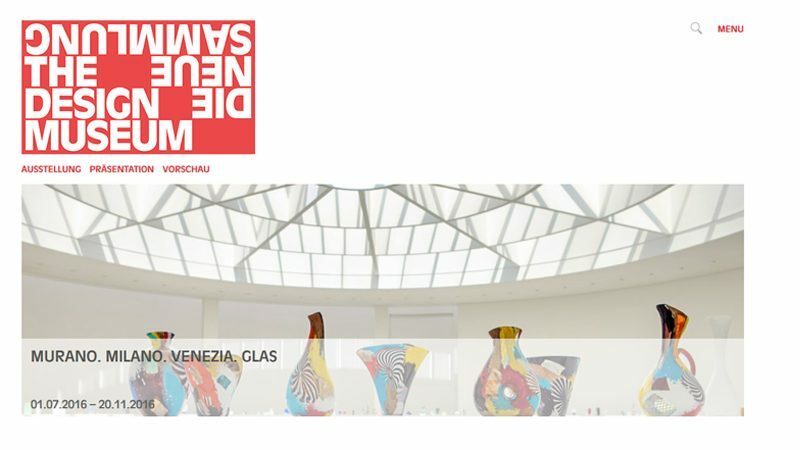 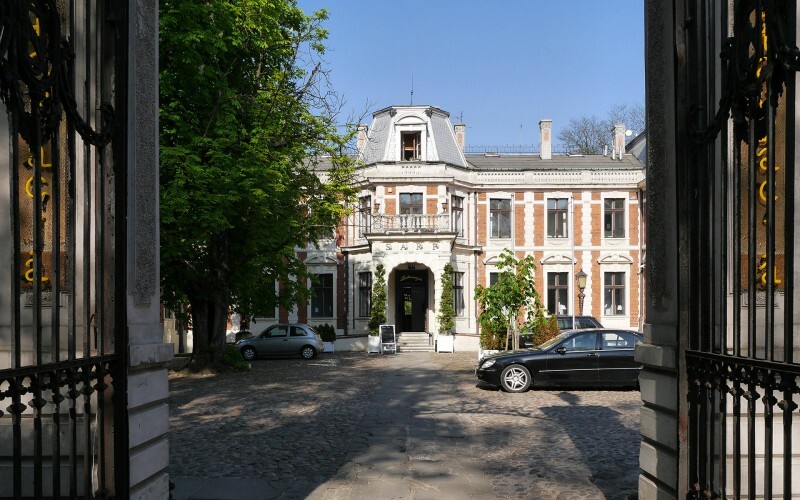 The website is based on a content management system, that the museum easily can update. 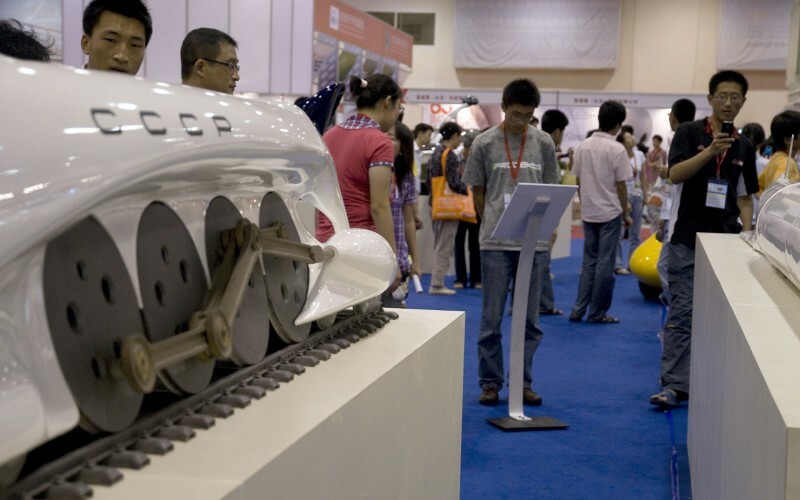 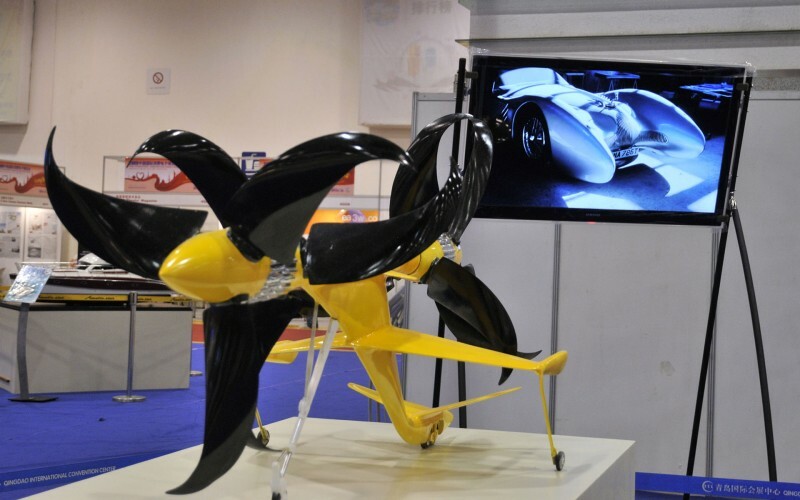 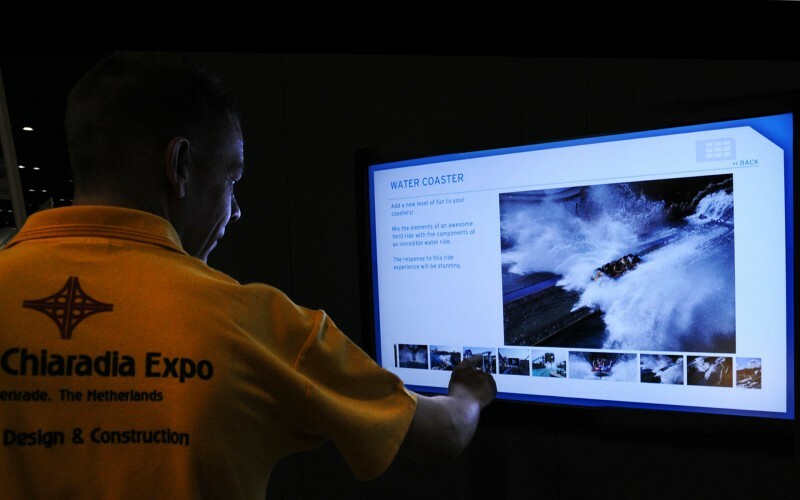 Electronic media are becoming sought after exhibition highlights more and more. 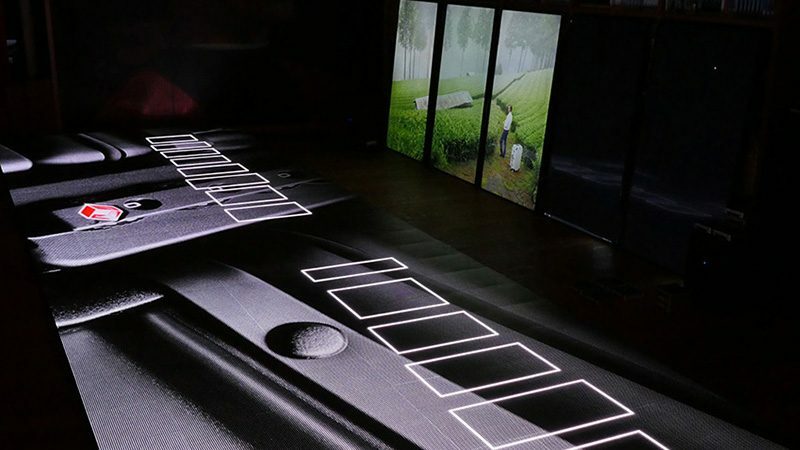 In this year’s design exhibition during Tokyo Design Week the reknowned AXIS gallery confronted the electronic media with the paper architecture of the Swiss based Atelier Oï. 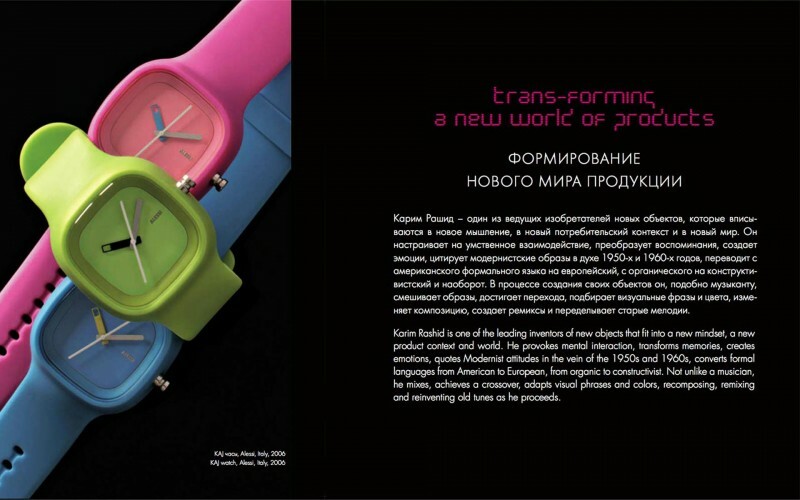 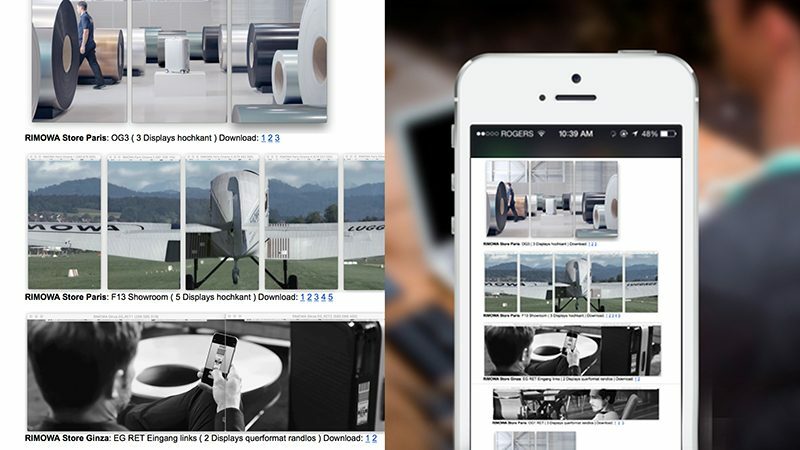 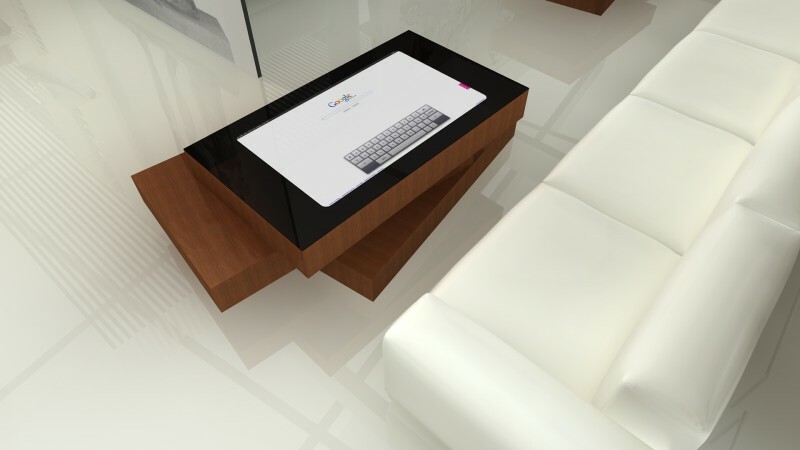 It has been always a dream of us to combine the medium paper with the modern electronic media. 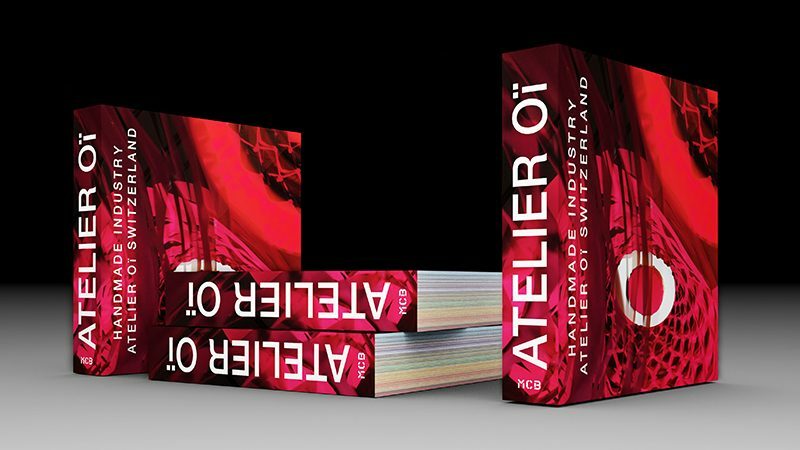 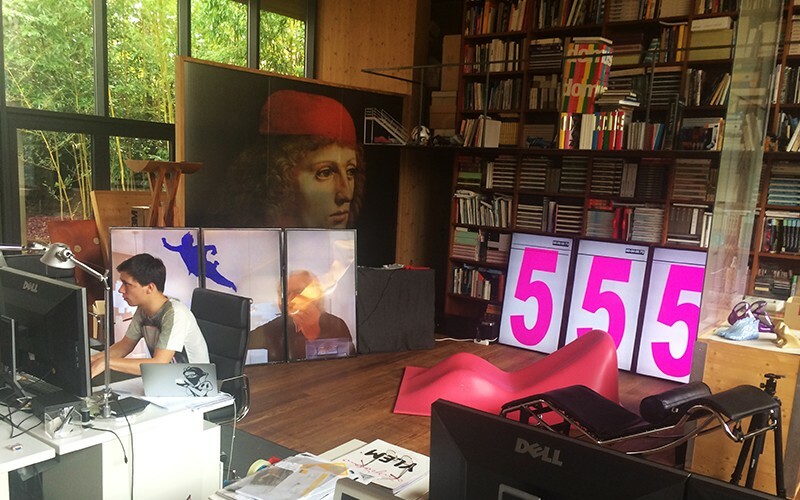 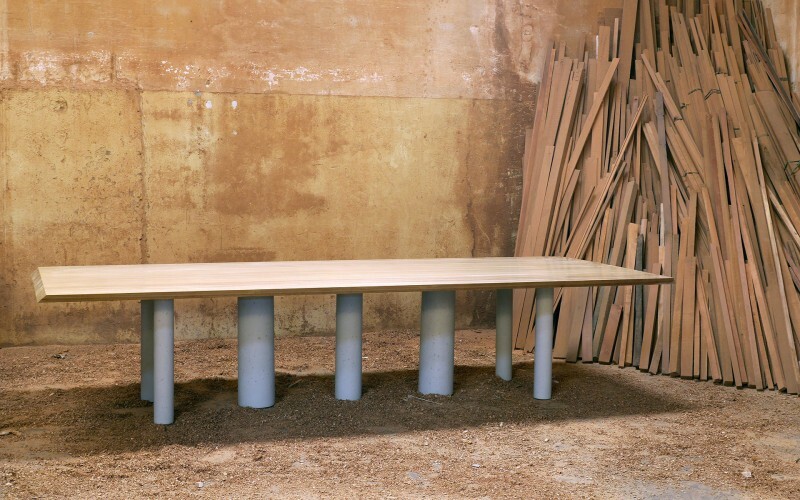 On five television screens we tell the story of the internationally reknowned Swiss design studio Atelier Oï. 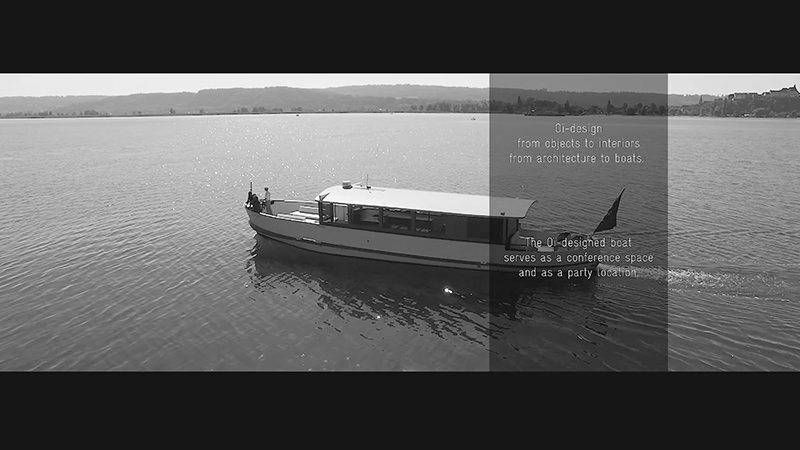 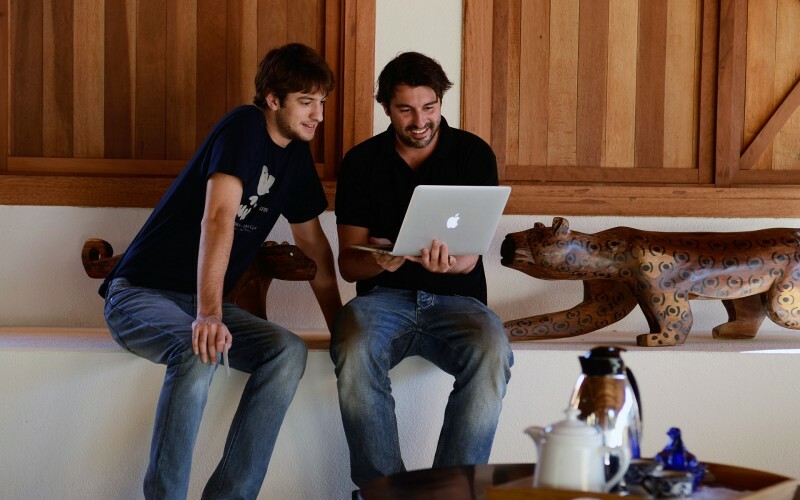 The lake of Bienne and the beautiful vineyards at its shore convey an emotional feeling where the studio is located. 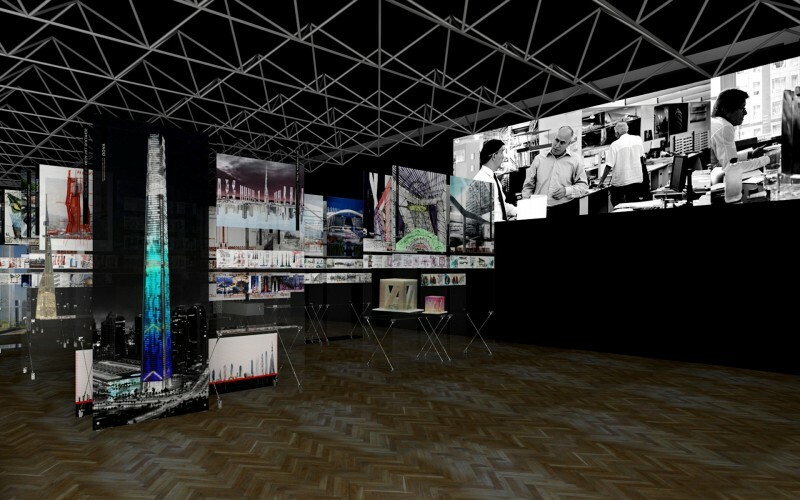 The media installation shows how the studio works in a transformed motel of the 50th at the bank of the lake. 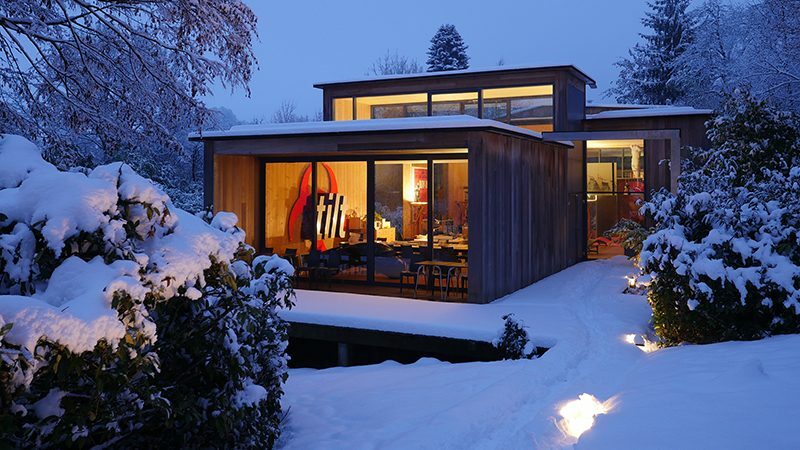 A true Moitel California in Switzerland. 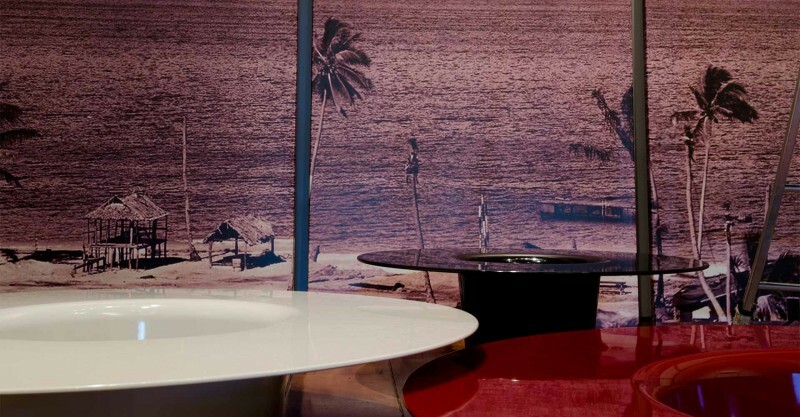 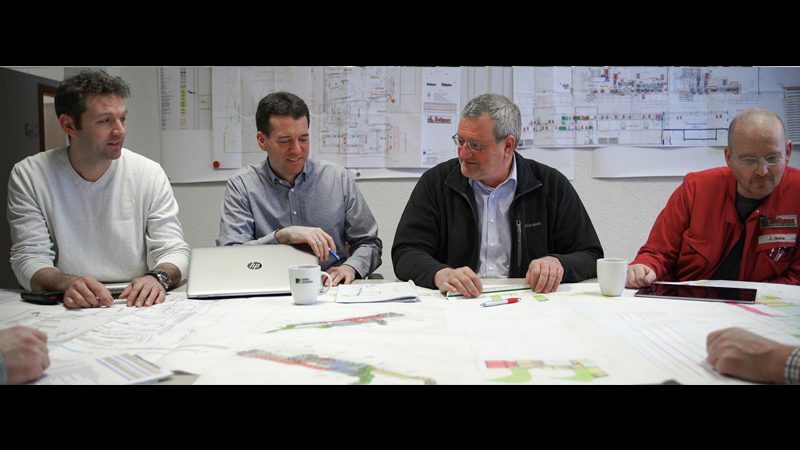 The Waterdream designers Massaud, Front, Aisslinger and GamFratesi talk about their projects. 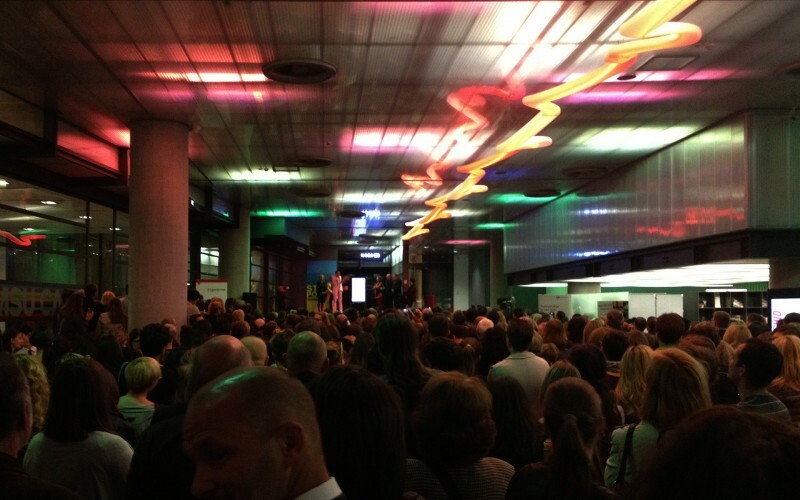 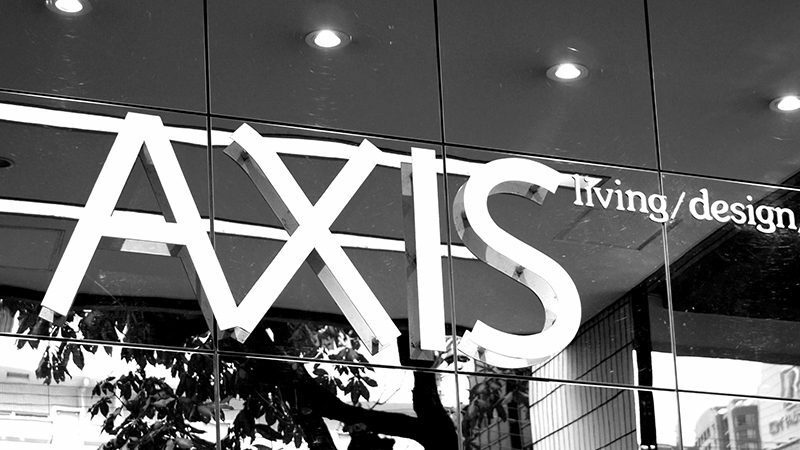 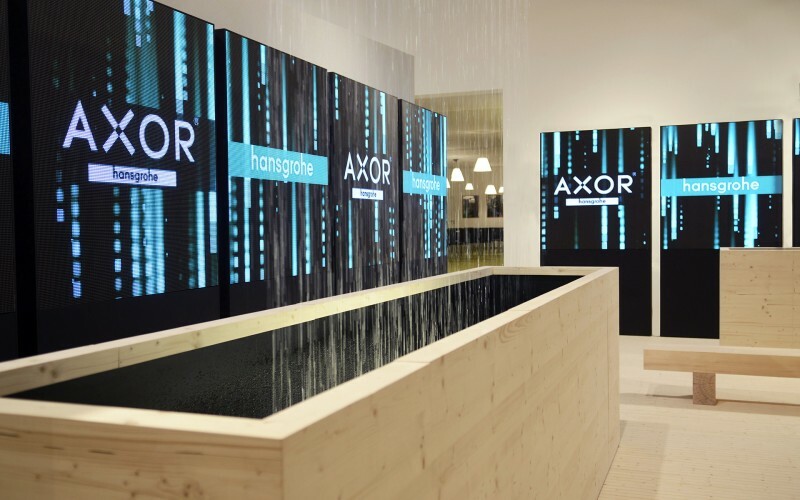 You see the opening at the Axor showroom in the Via Durini 15 in Milan as well. 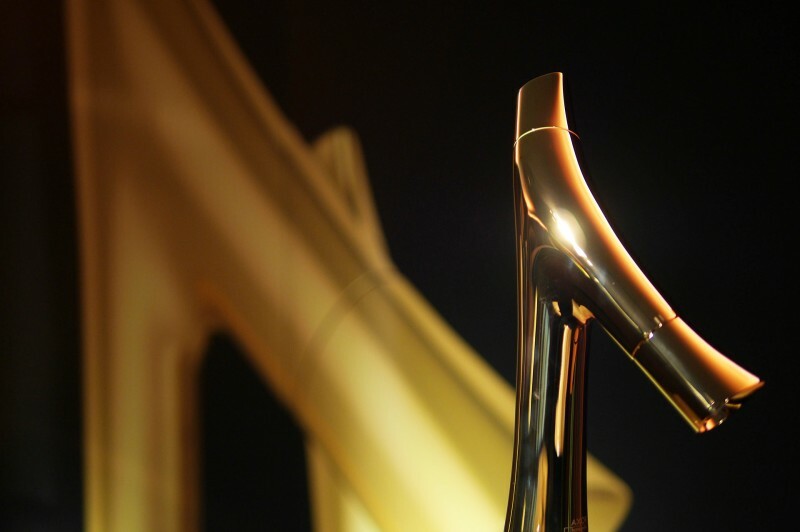 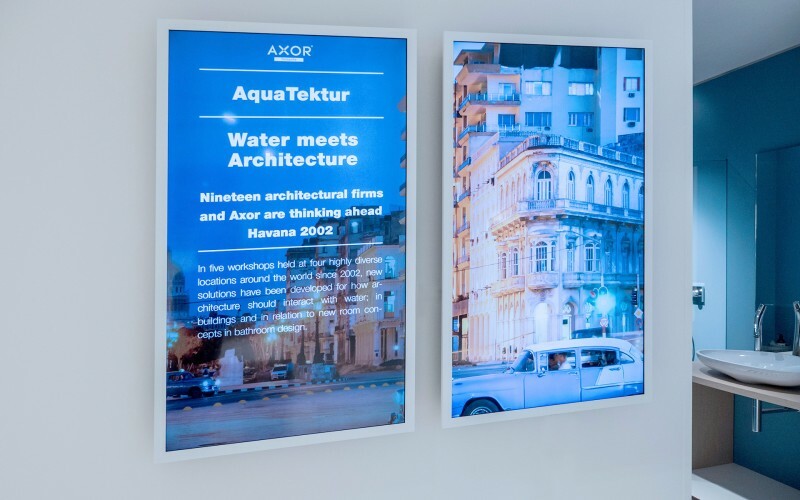 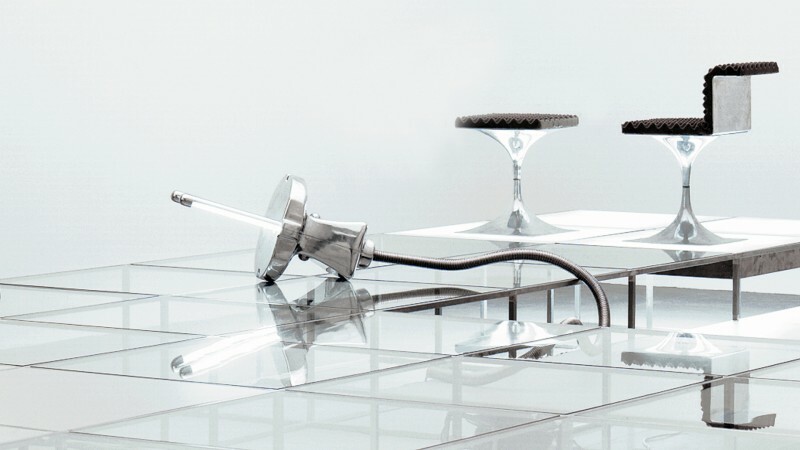 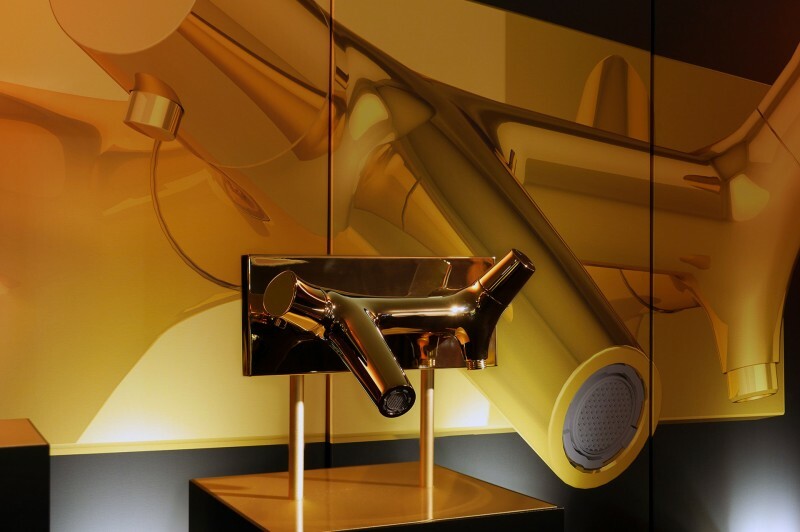 What happens when Axor invites world renowned architects and designers to create their own personal mixer spout? 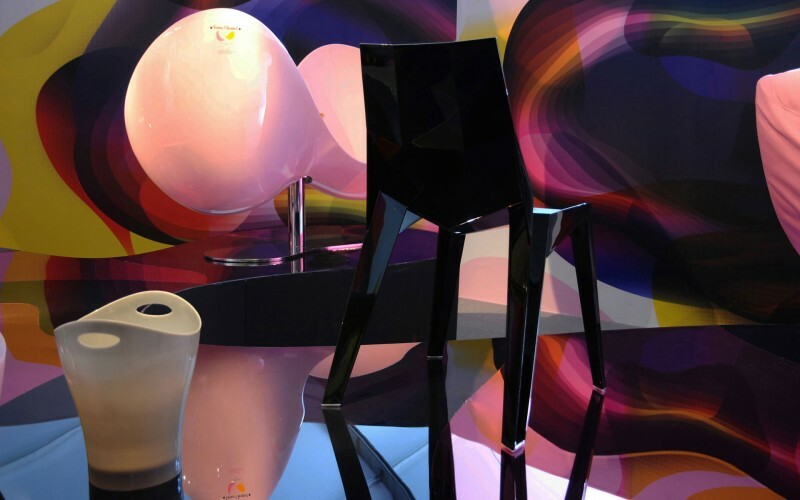 The result: a highly individual and vibrant marriage of revolutionary materials and shapes. 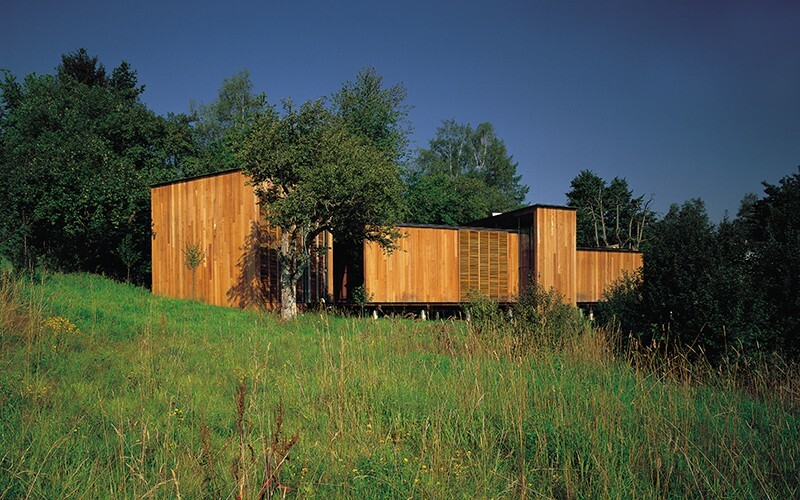 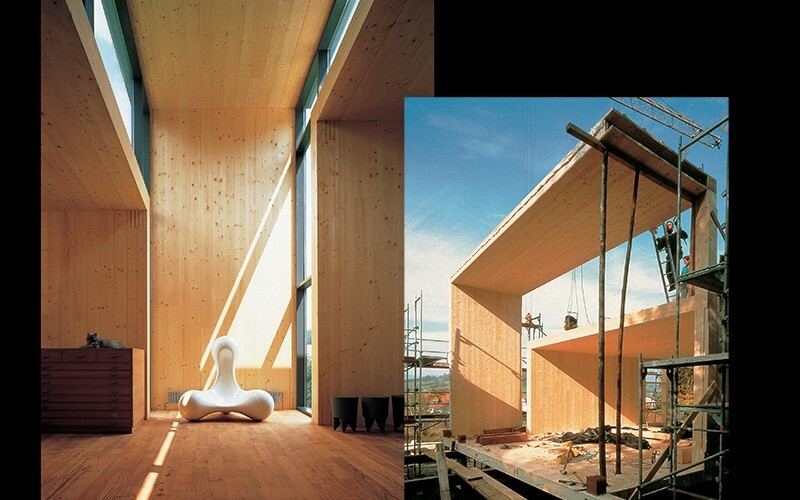 Located on the foothills of the southern Black Forest we have built 1998 a studio of 65 tons of wood (redwood and pine).The internationally highly publicized building is an avant-garde example of modern wooden architecture. 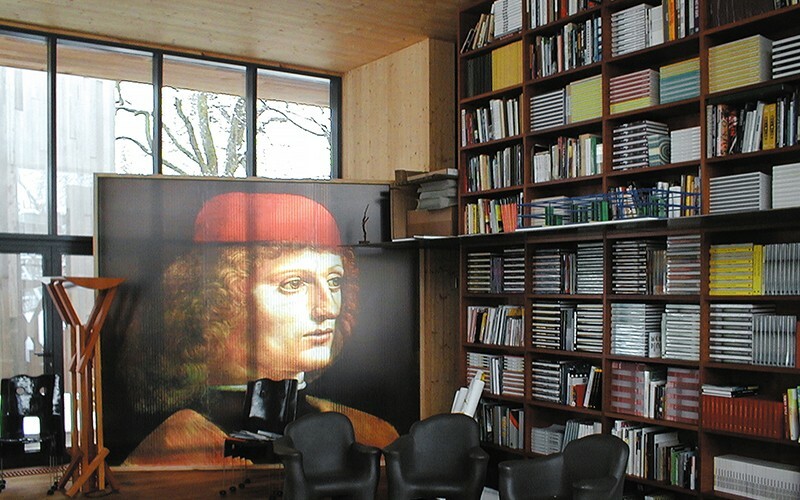 Design: Dieter Thiel, wood engineering Blumer/Flösser. 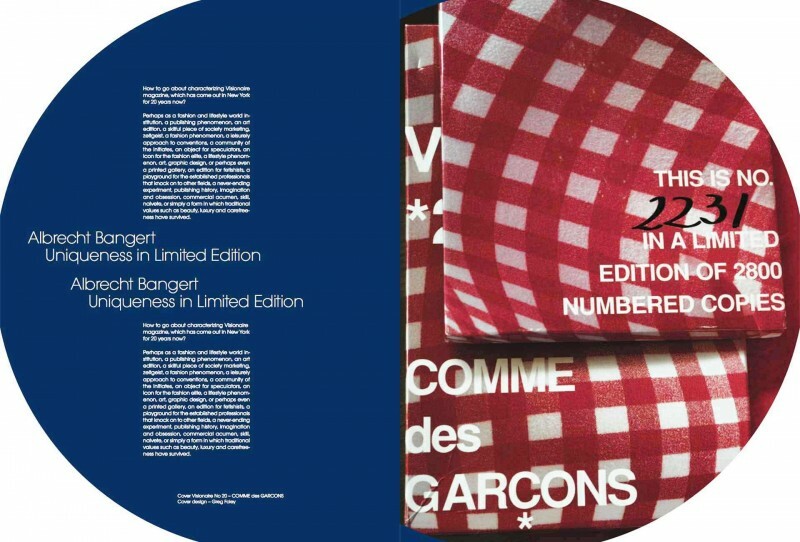 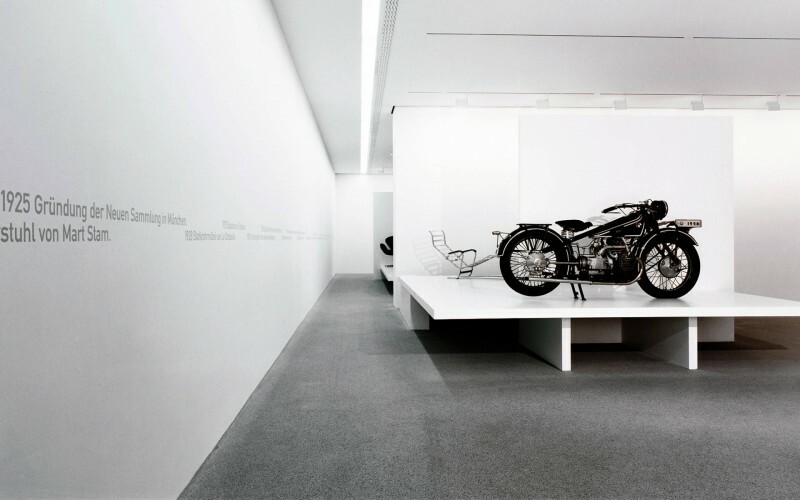 First, it served as a Publisher Studio for the design publisher Bangert Verlag and mutated over the years into a media studio for bangert projects. 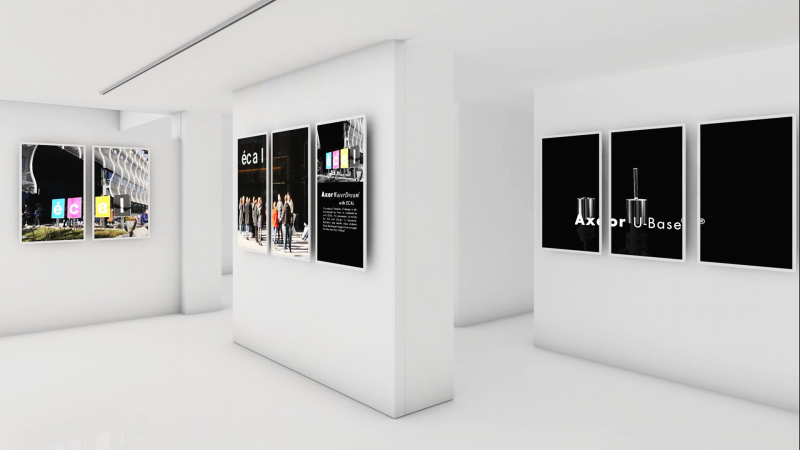 Instead of books we program, design and produce now media related installations, virtual museum settings and virtual showrooms for brands. 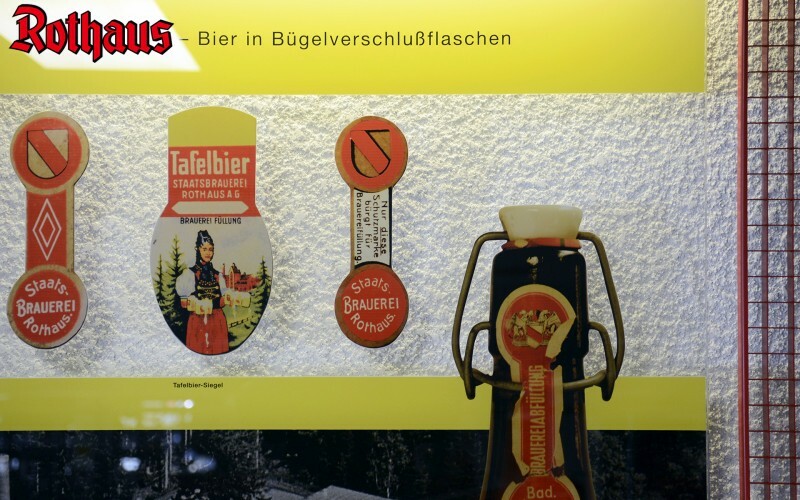 Official clip on the occasion 60 years of Tannenzäpfle beer. 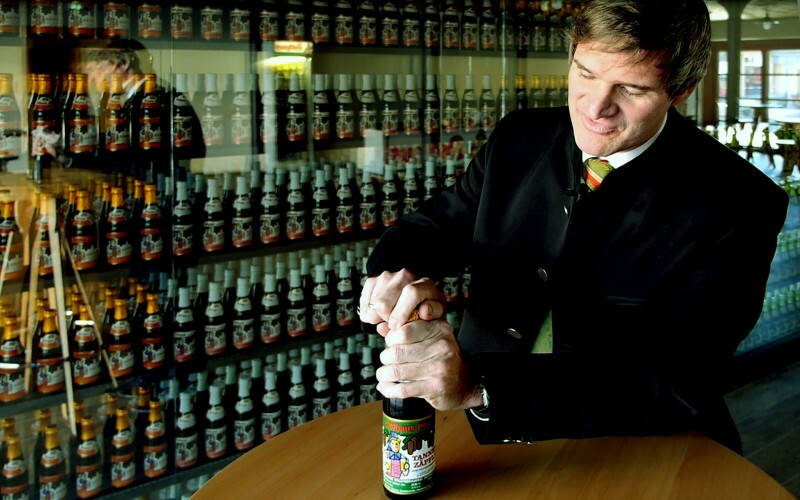 The little bottle of Black Forest beer has evolved into a huge success story. 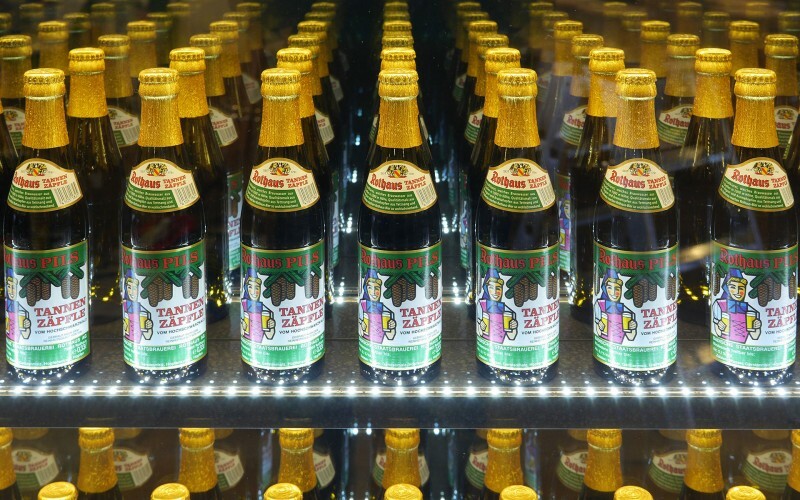 The beer began its triumphal march in 1956. 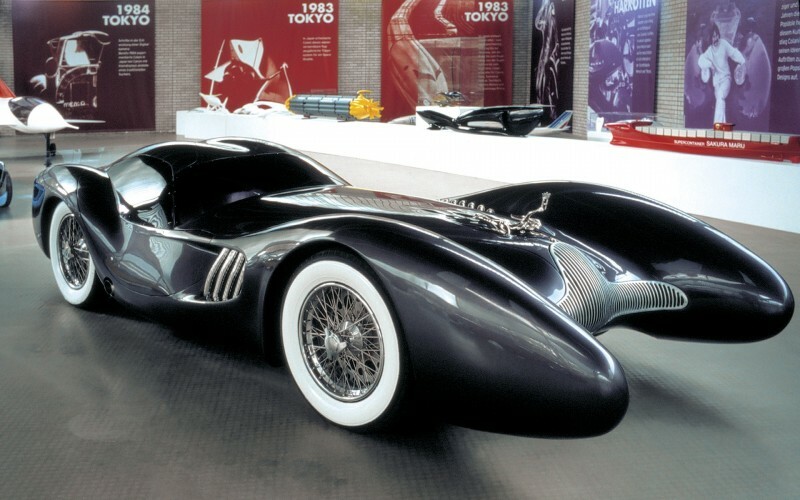 So we proposed a time travel from 1956 to our modern times. 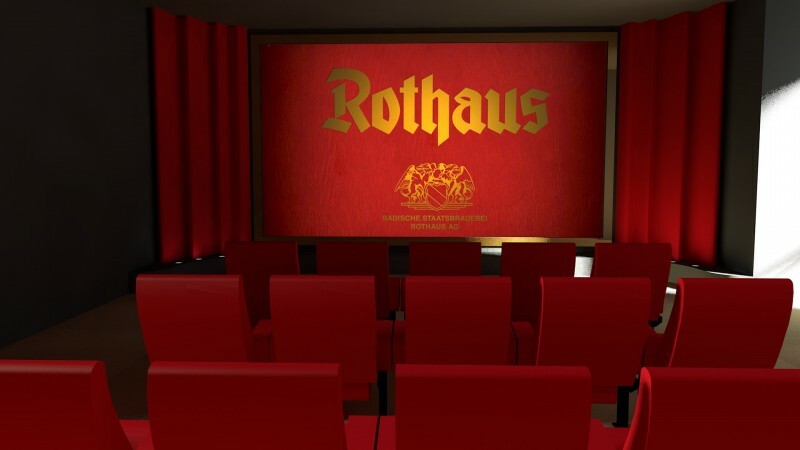 For the Black Forest beer brewery Rothaus we produced for the FIS snow board world cup 2016 race on the Feldberg a 30 sec image clip. 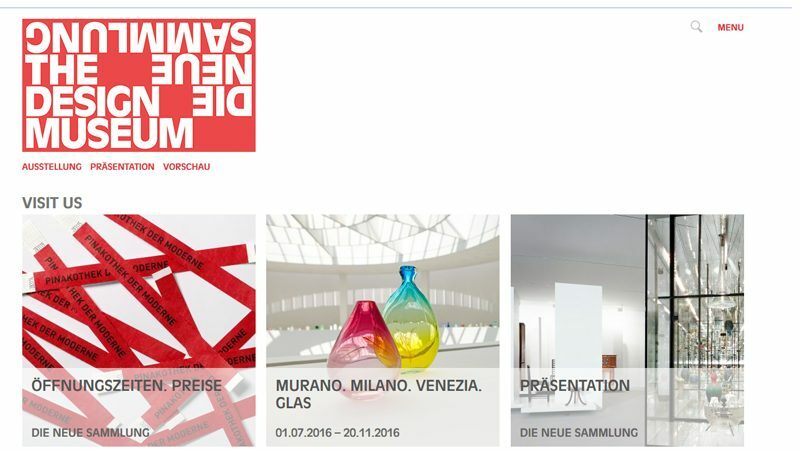 Long Night of Museums in Munich 2015.
the leading German design brand Axor and the art and design school Ecal in Lausanne. 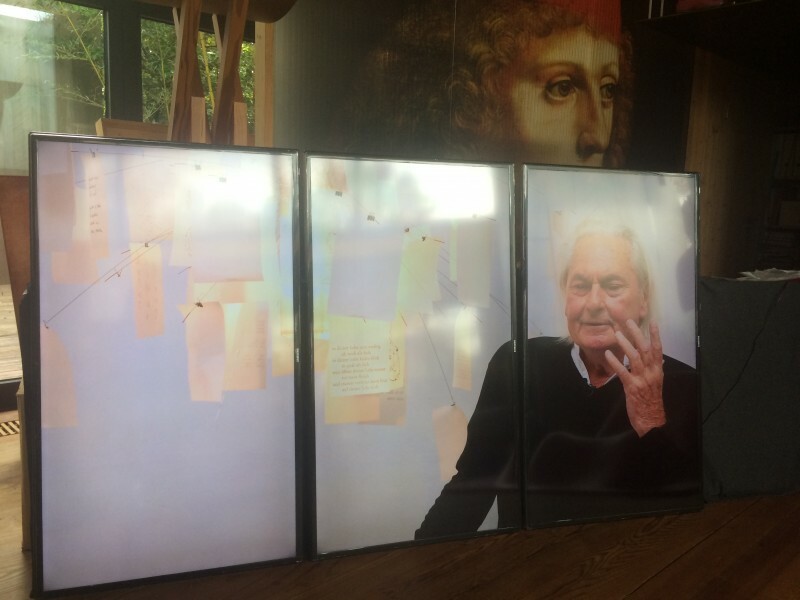 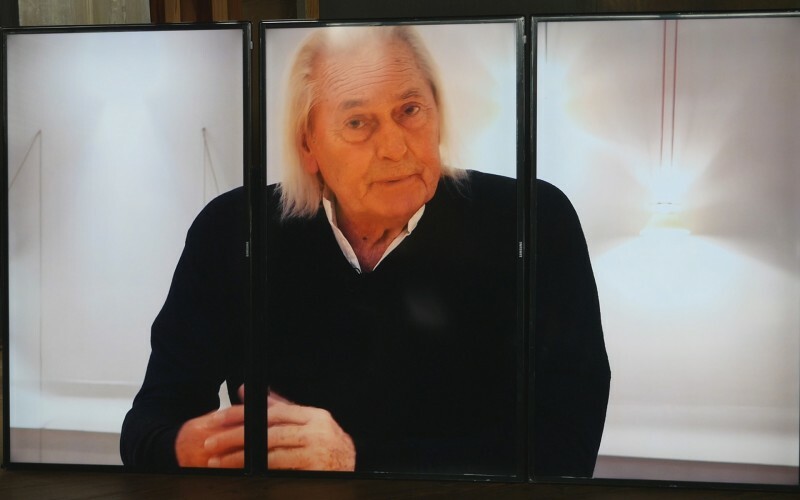 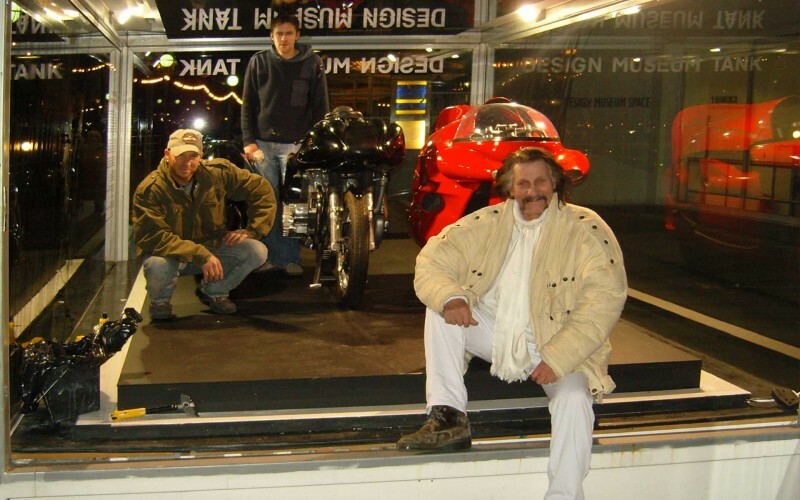 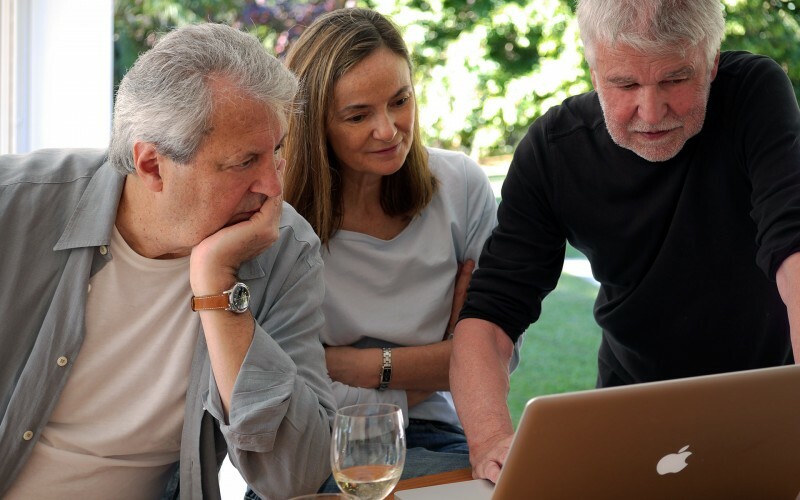 The portrait of the reknowned designer is produced for a three screen presentation. 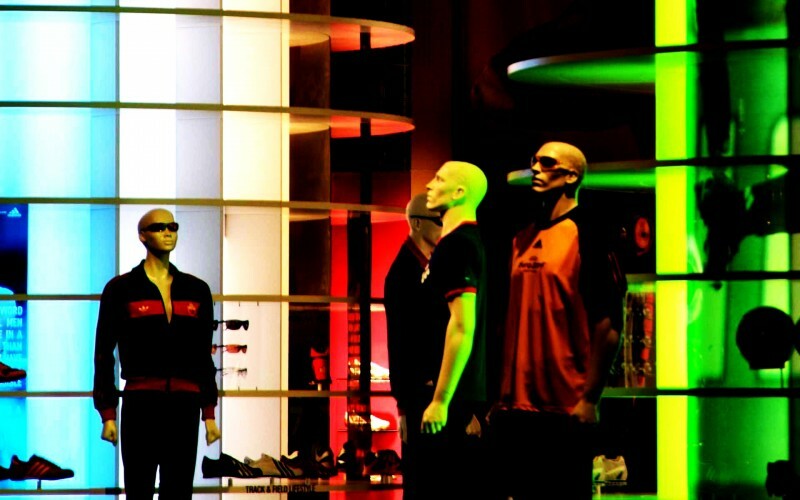 Duration of the Video performance is 24 minutes. 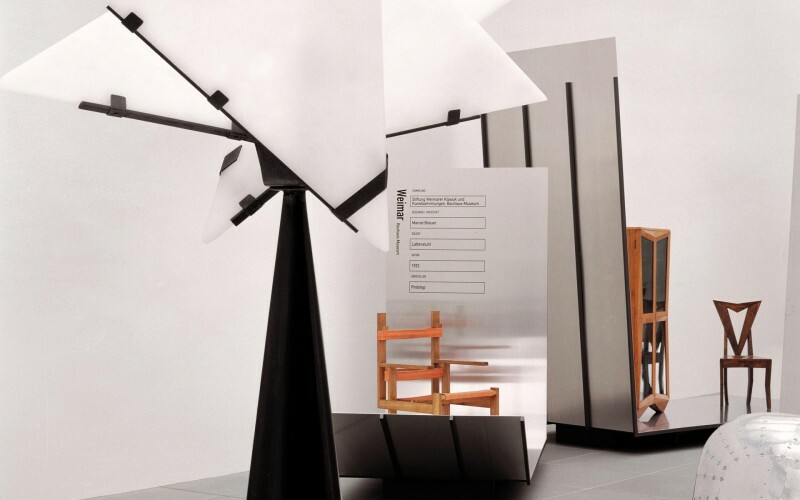 This feature about the designer Ingo Maurer is part of a series of design statements for Die Neue Sammlung – The Design Museum Munich. 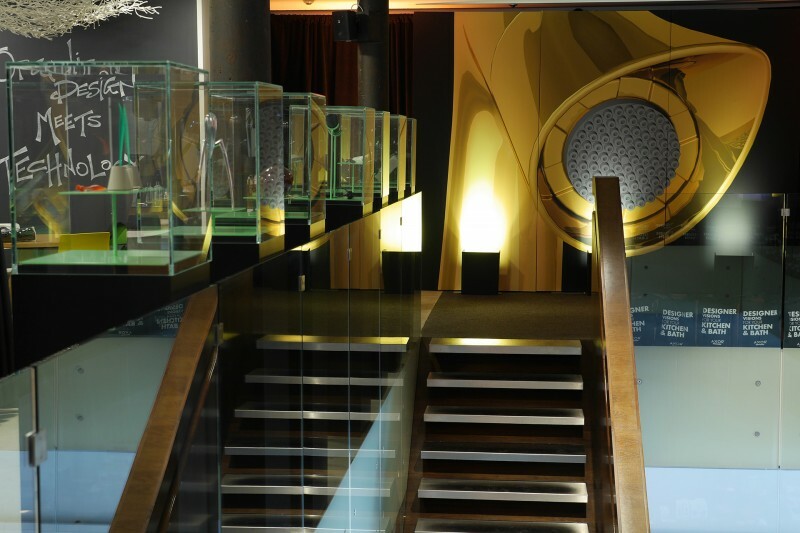 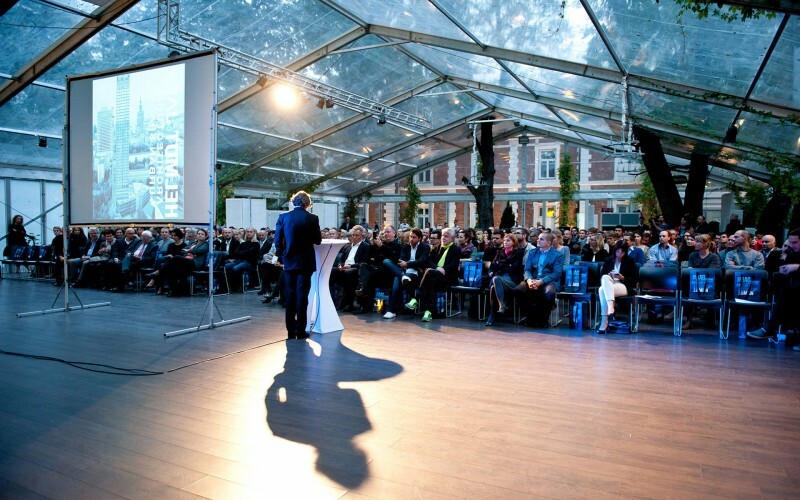 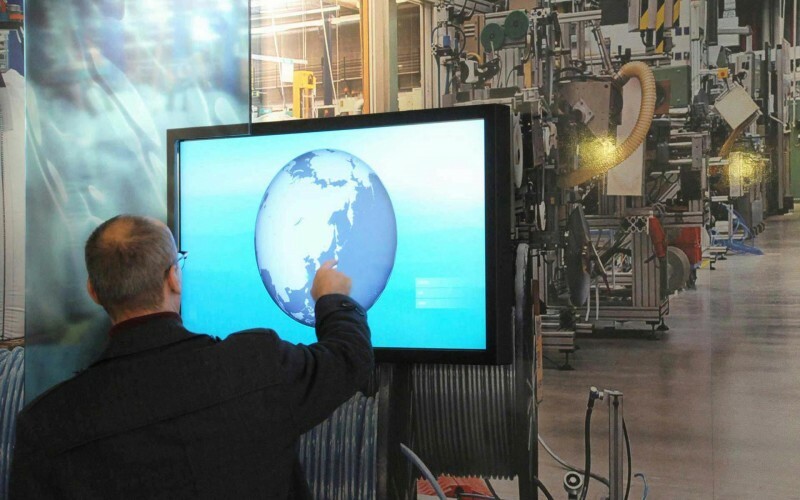 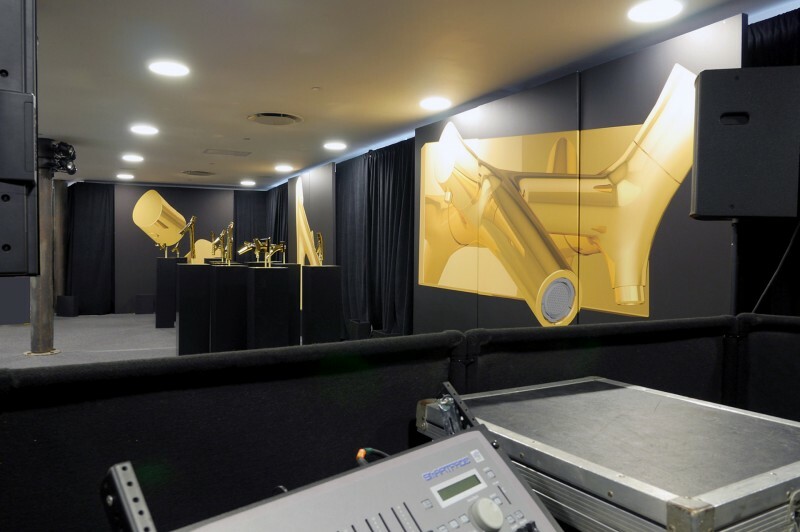 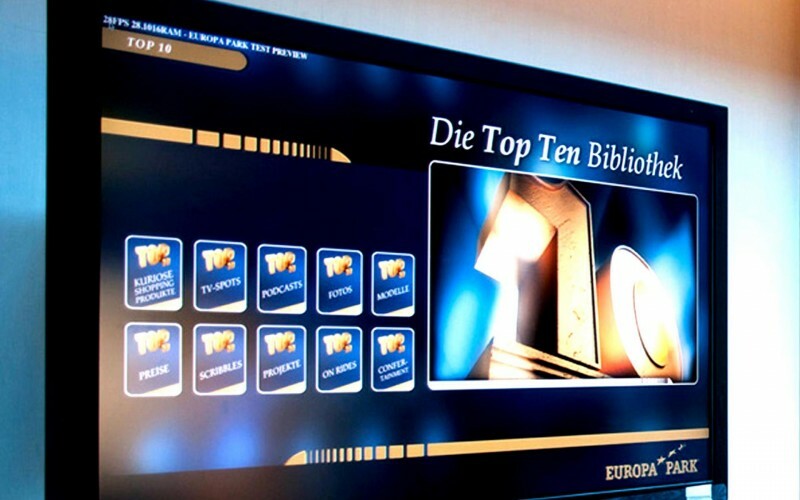 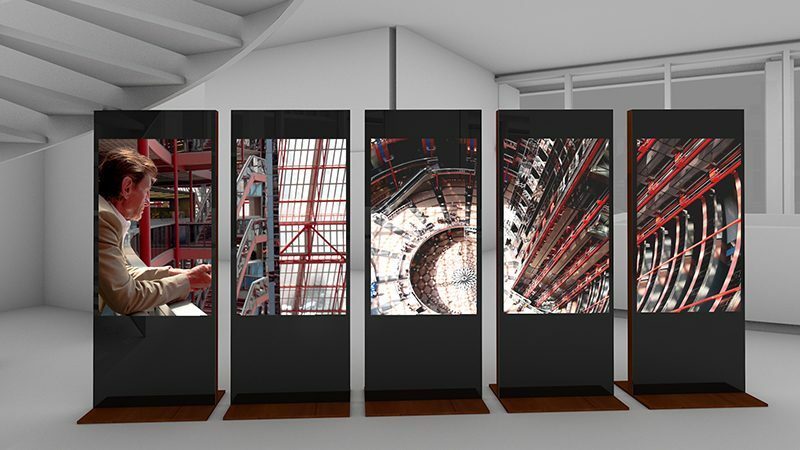 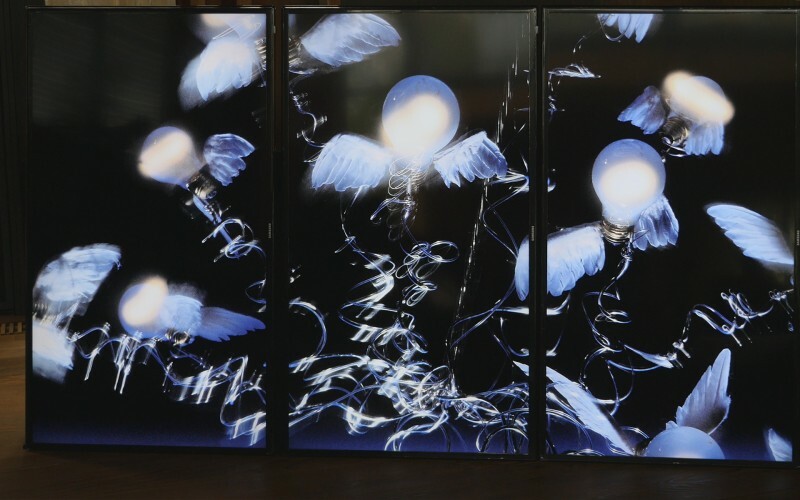 A permanent 10 screens installation for virtual exhibitions and presentations. 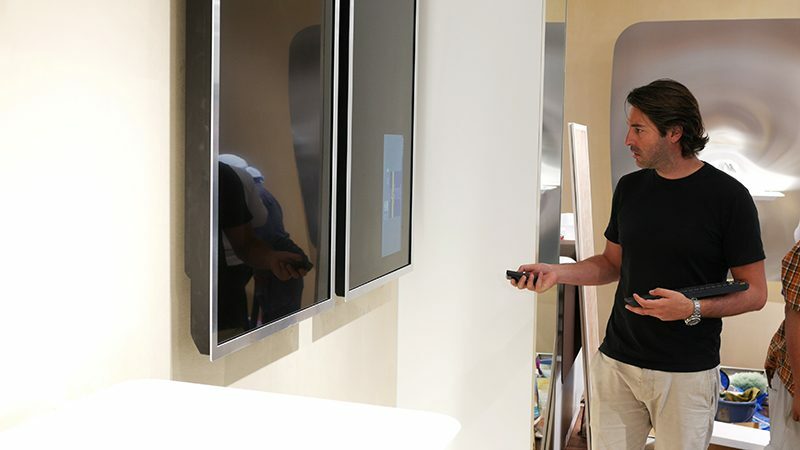 The content can be changed online and played on demand with apple remote. 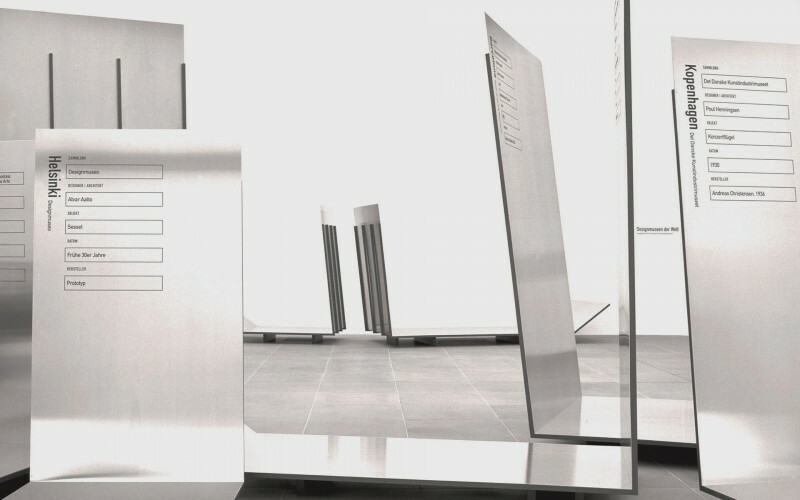 The first sequence is a 15 min. 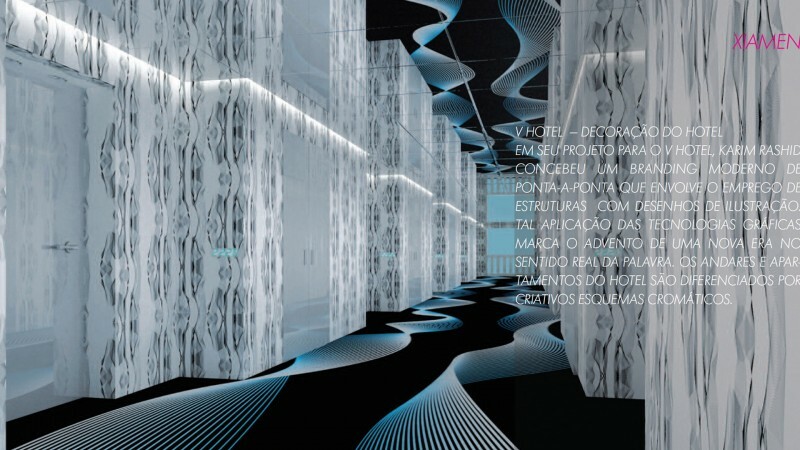 performance about the theme architecture and water showing international architects and their visionary proposals. 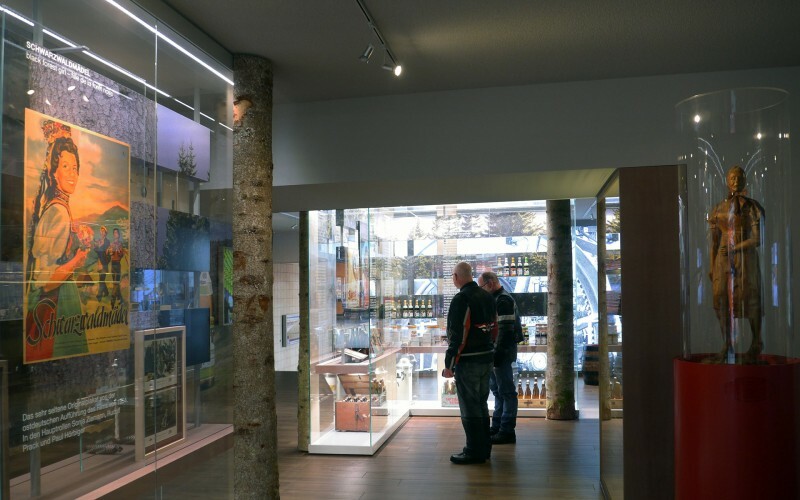 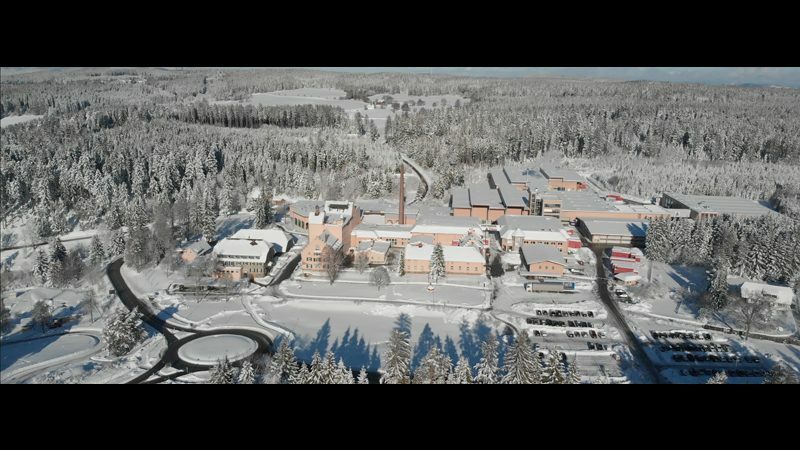 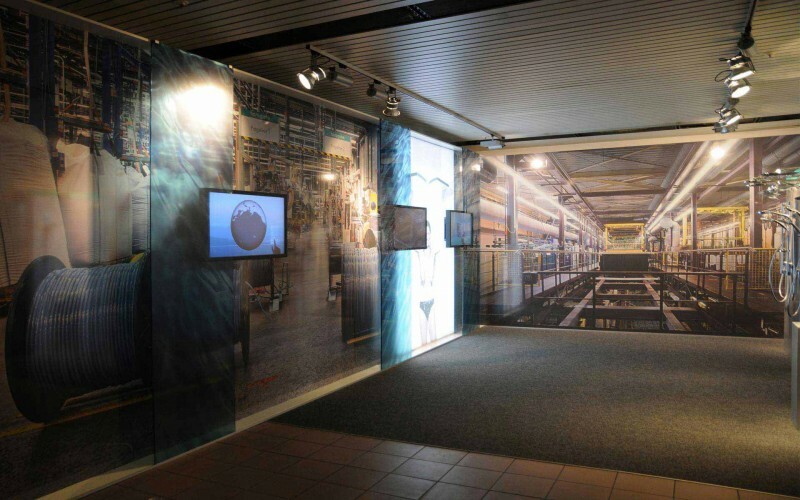 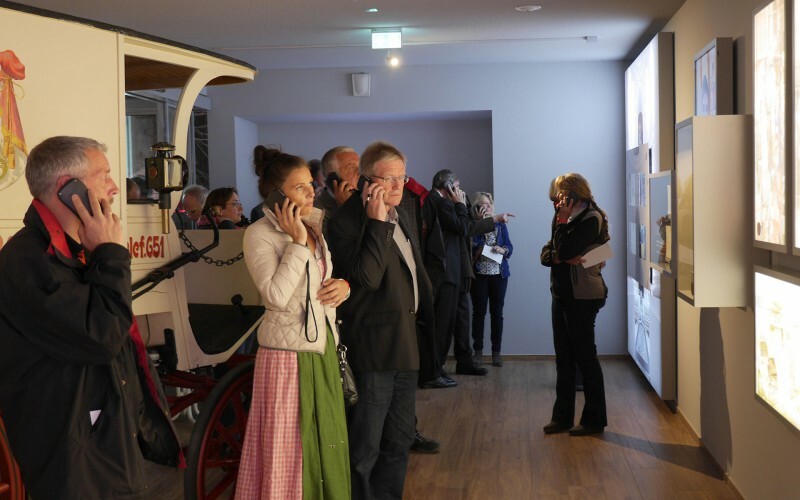 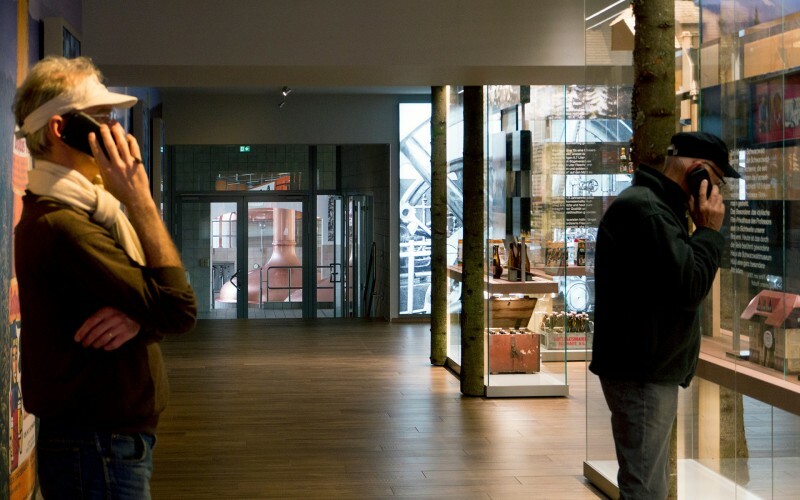 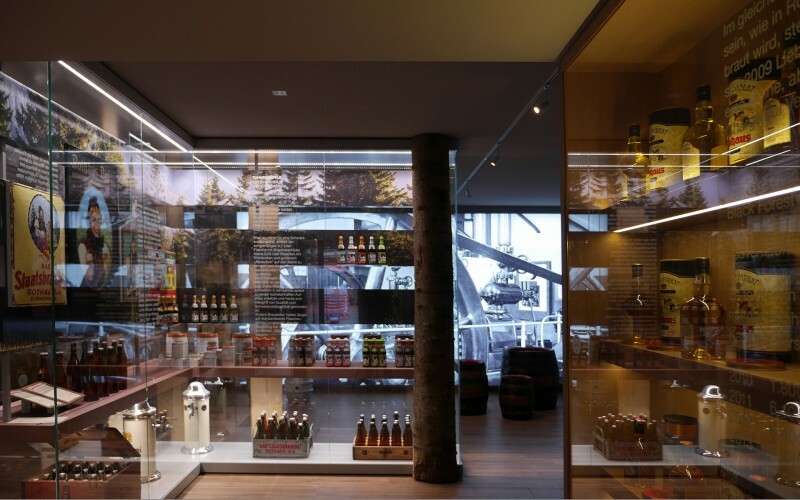 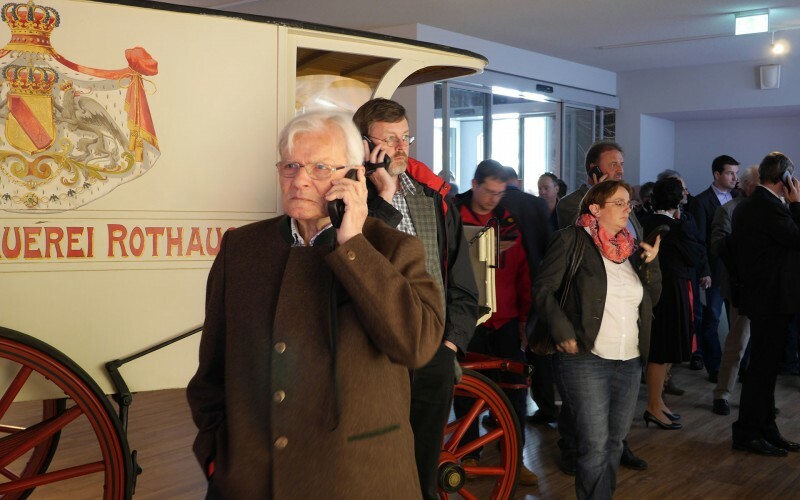 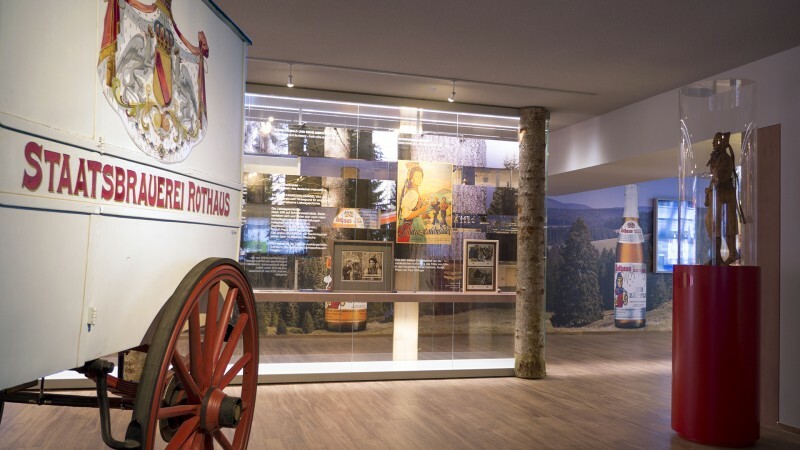 2014 visitors world for the Rothaus Brewery – Black Forest Brewery – an Audio guided tour with museum, entertainment, cinema and video installations. 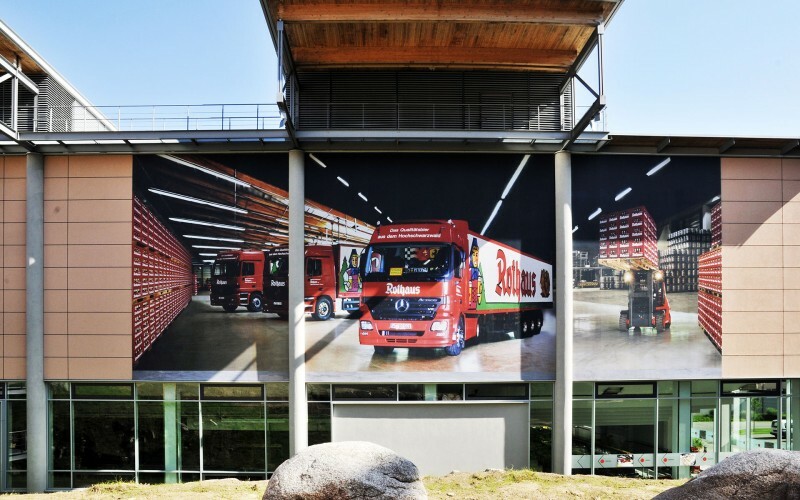 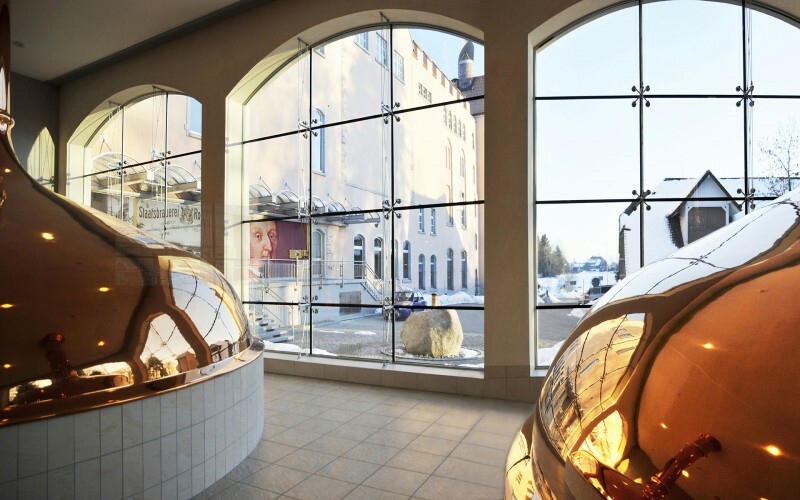 The heart of the Zaepfle Empire of the Rothaus Brewery is the ZAEPFLEBAR with over 10.000 bottles mirrored – a solid construction made of Corian, LED, copper, and mirrored glass. 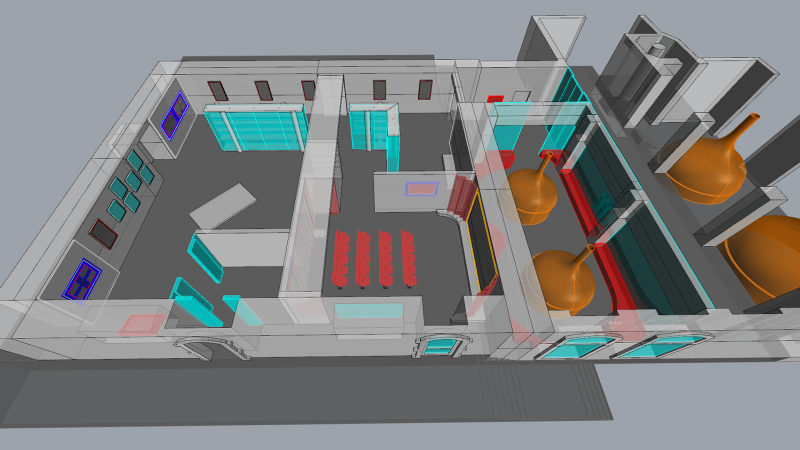 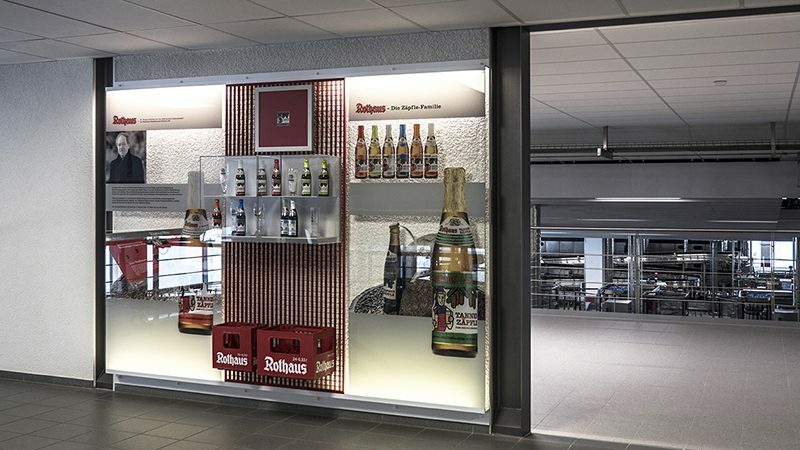 This cool bar will be the beginning and the end point of the new Rothaus Brewery Visitor World. 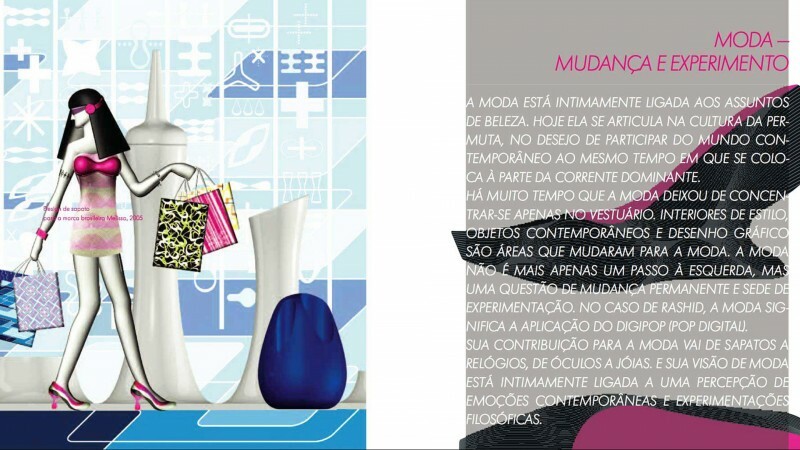 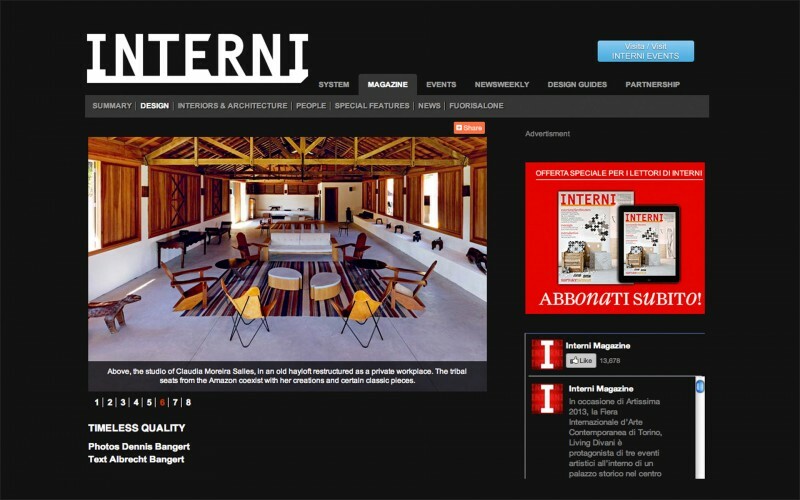 For the Italian magazine INTERNI we have produced a story about the reknowned Brazilian artist/designer Claudia Moreira Salles. 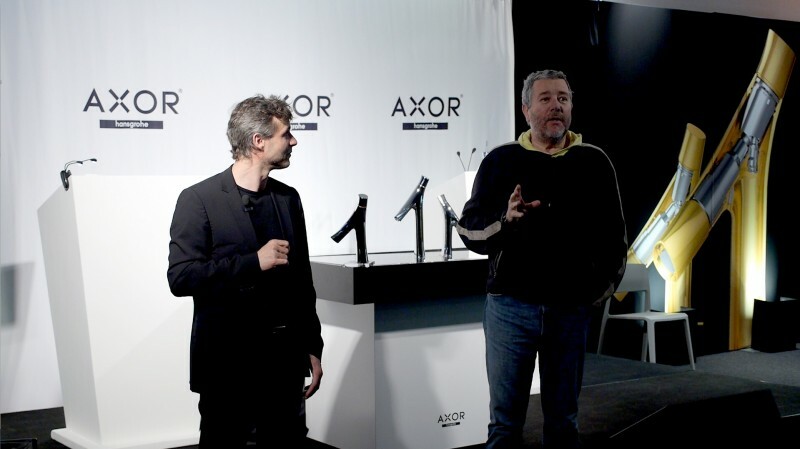 Designer Philippe Starck and entrepeneur Philippe Grohe presented in New York the new Axor Starck Organic Faucet Collection. 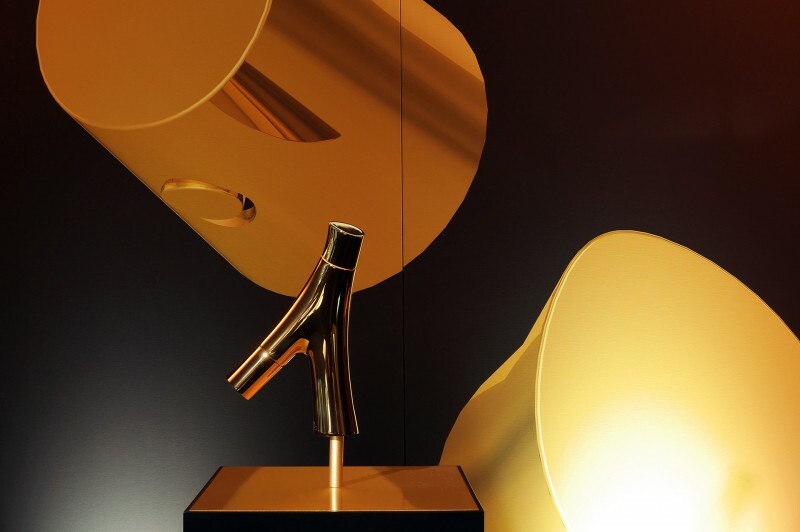 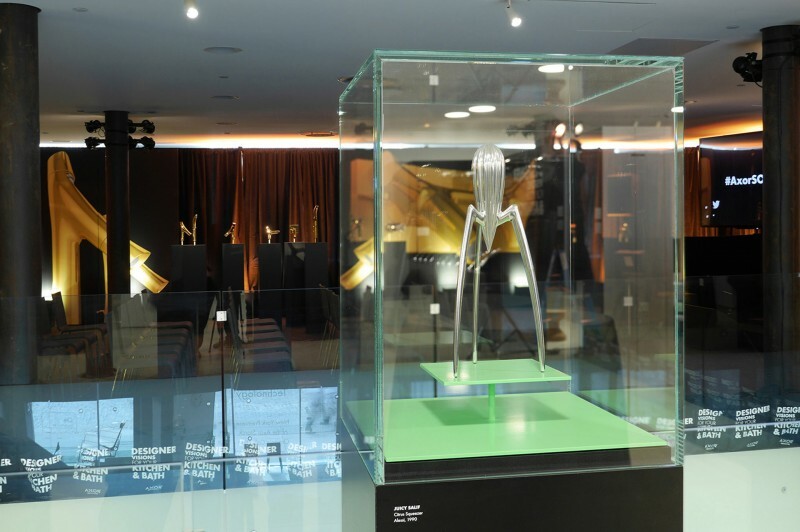 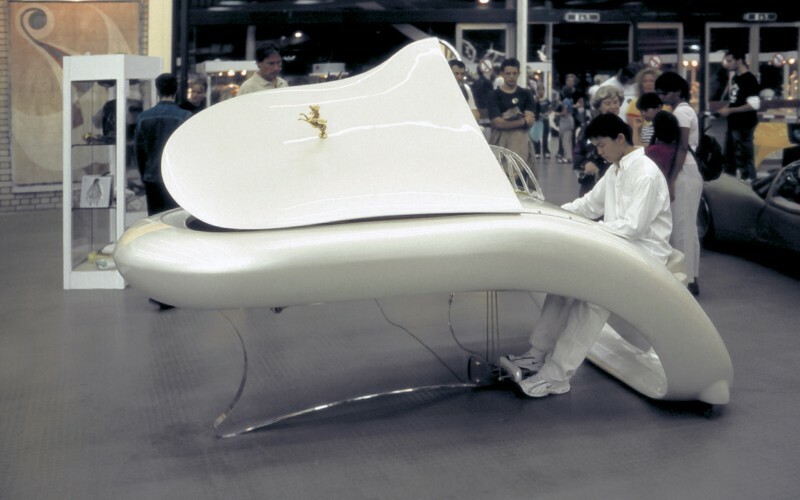 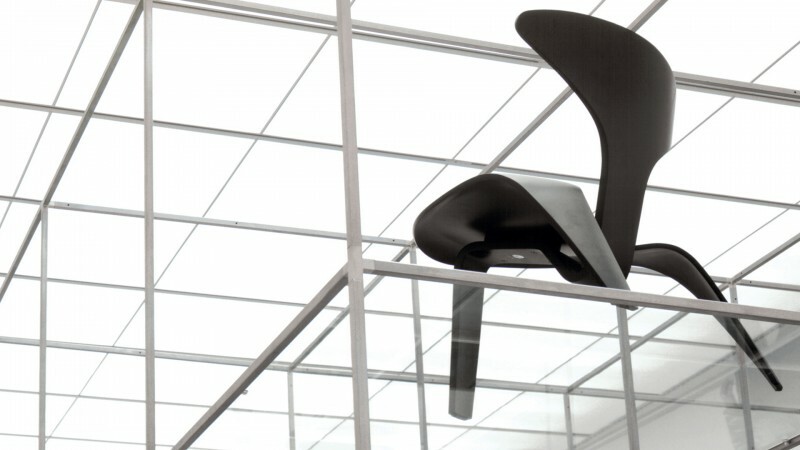 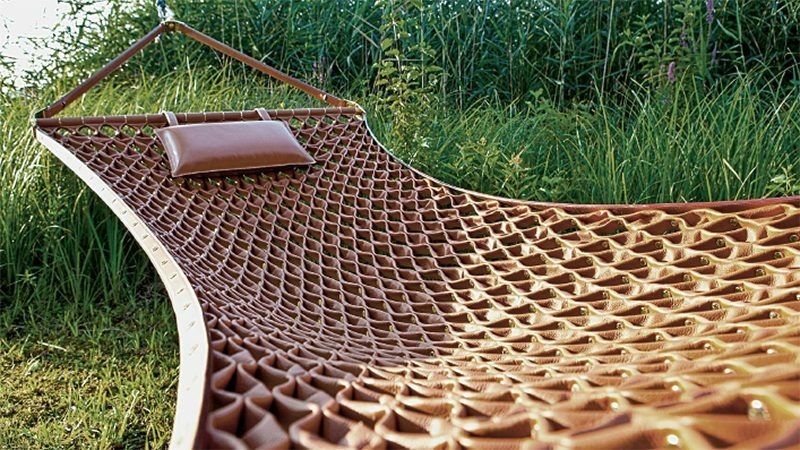 The organic design of Philippe Starck has been presented like works of art. 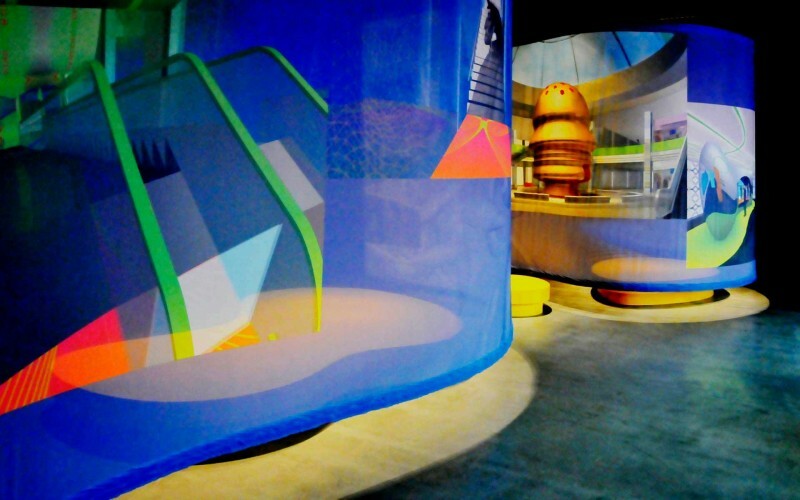 bangert projects conceived the setting like an exhibition with golden sculptures and huge computer generated canvases. 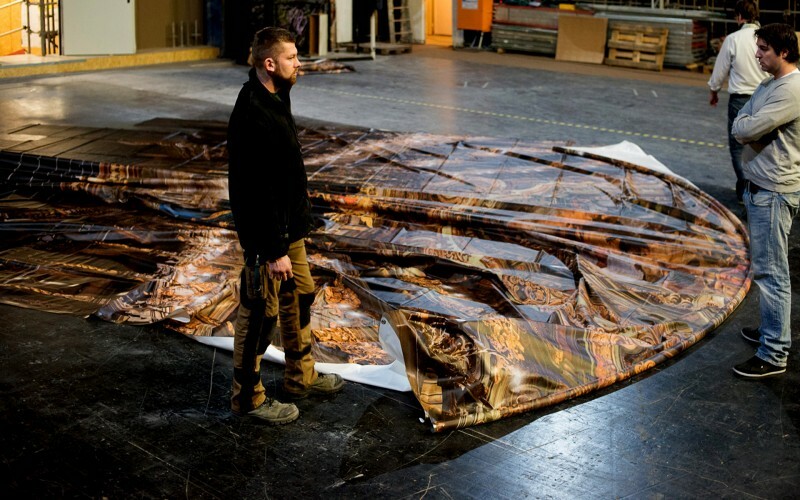 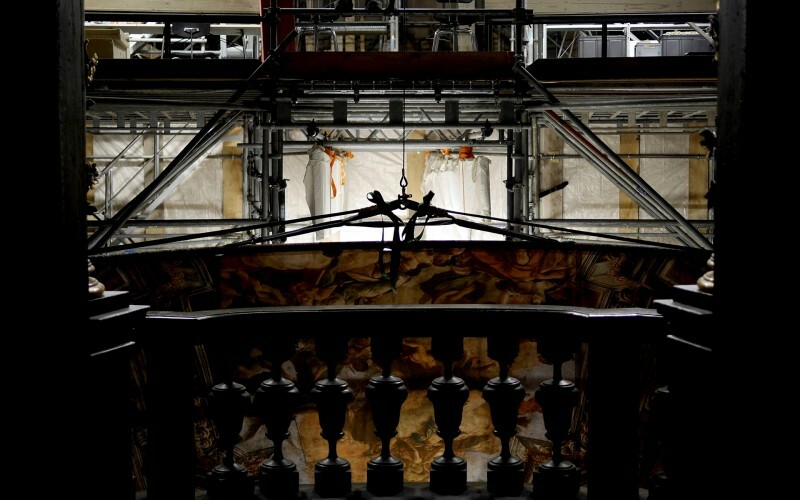 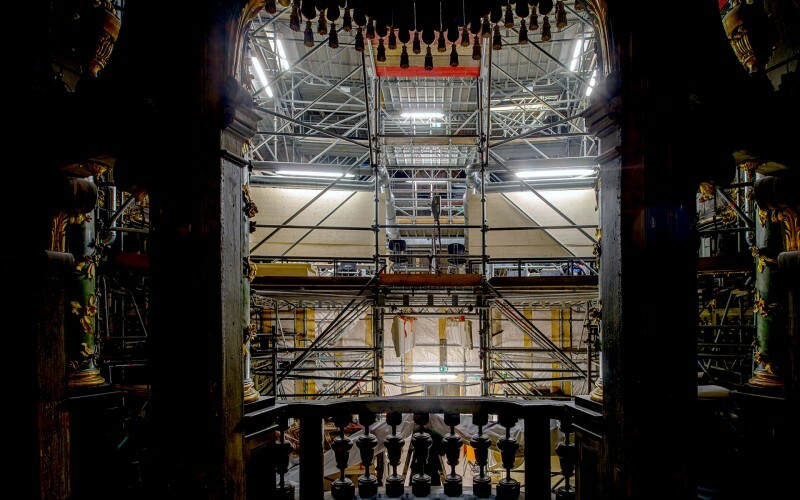 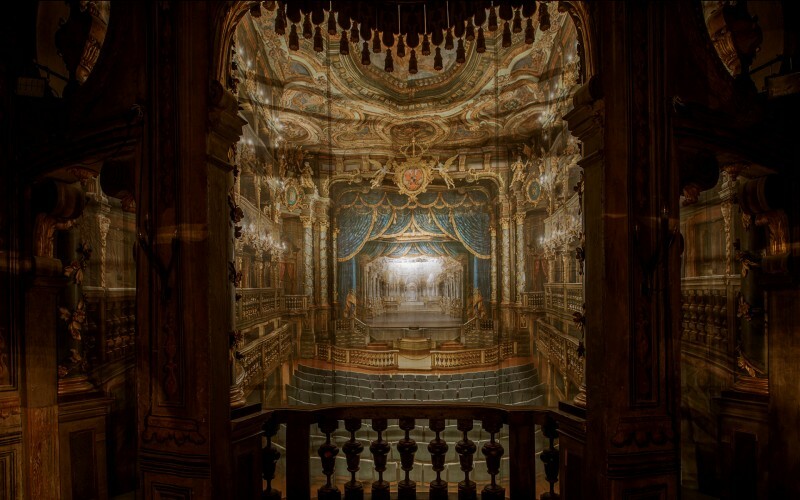 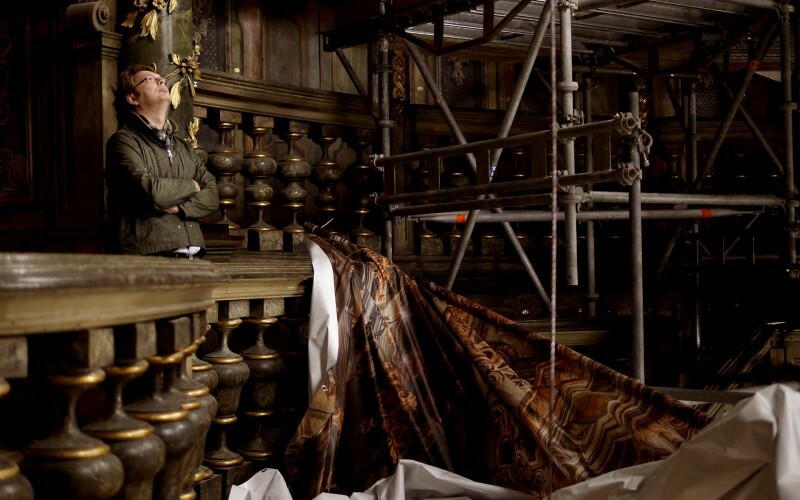 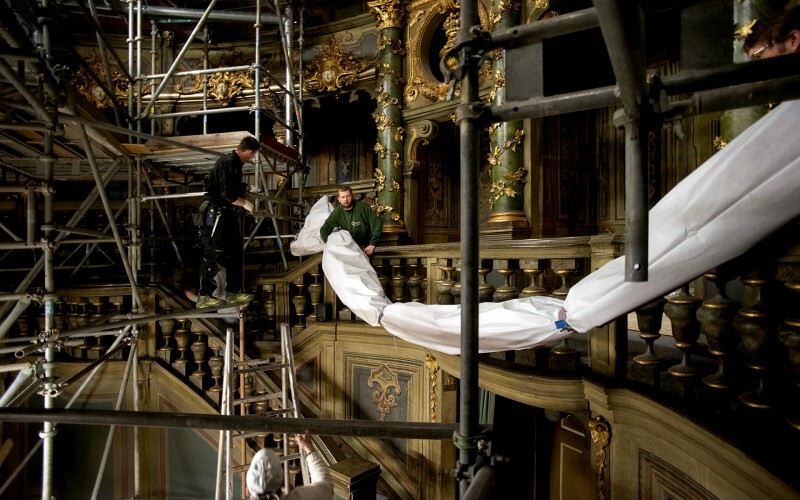 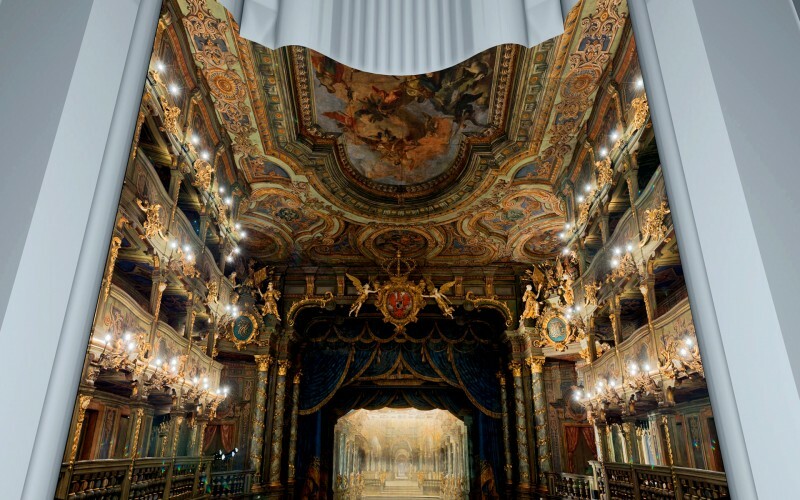 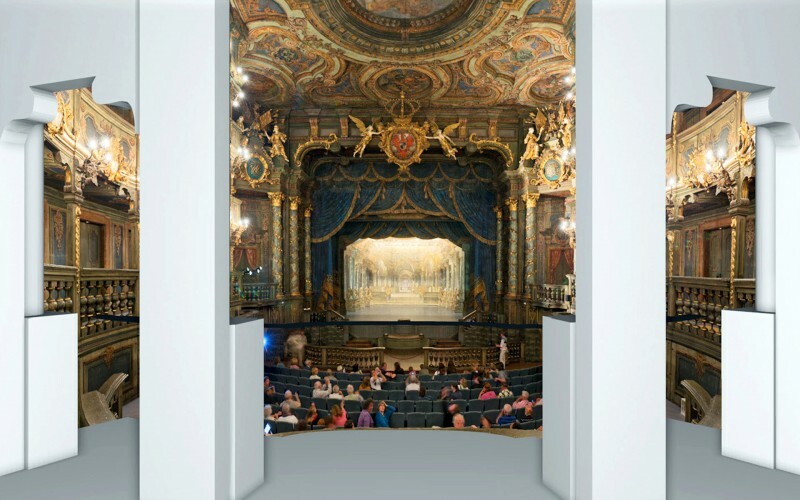 a 100 sqm back illuminated curtain simulating the beauty of the original opera scene hiding the construction site and delivering the visitors a boundless experience until restoring is finished. 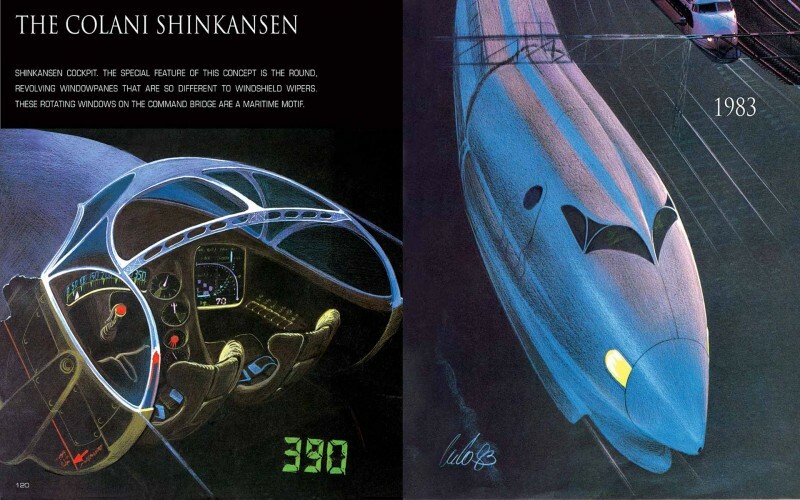 Designer Alexander Neumeister shaped the legendary Japanese Shinkansen Nozomi 500, the German ICE 3, the Maglev in Shanghai and numerous Metropolitan trains as the Linha Quatro in Sao Paulo and the Munich Subway. 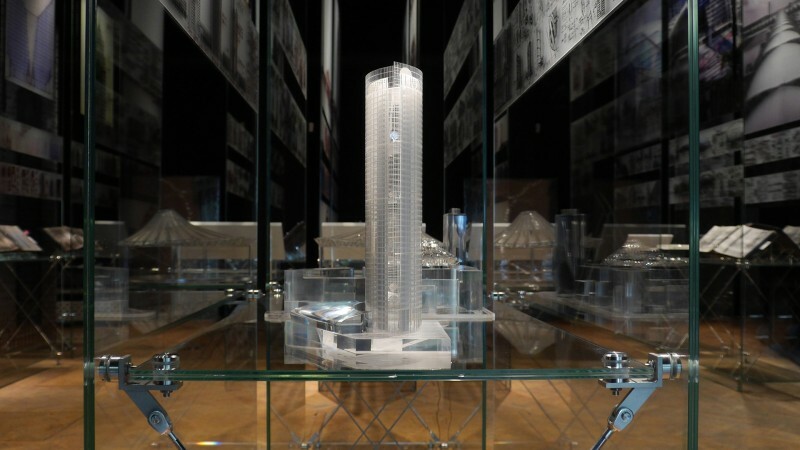 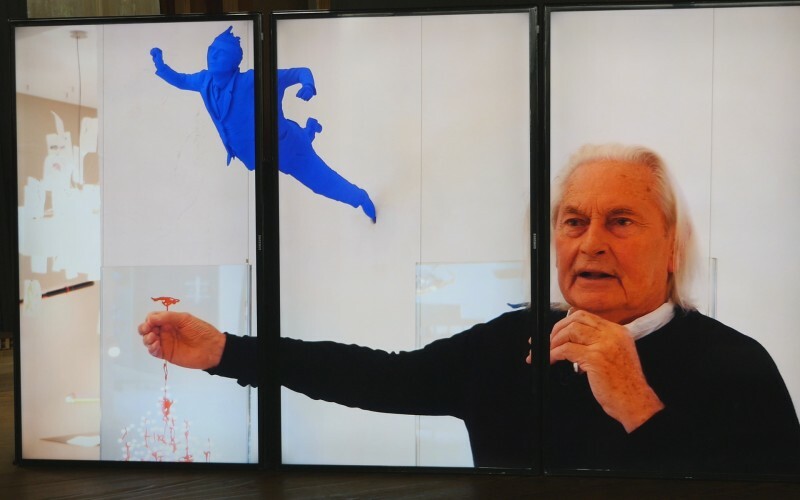 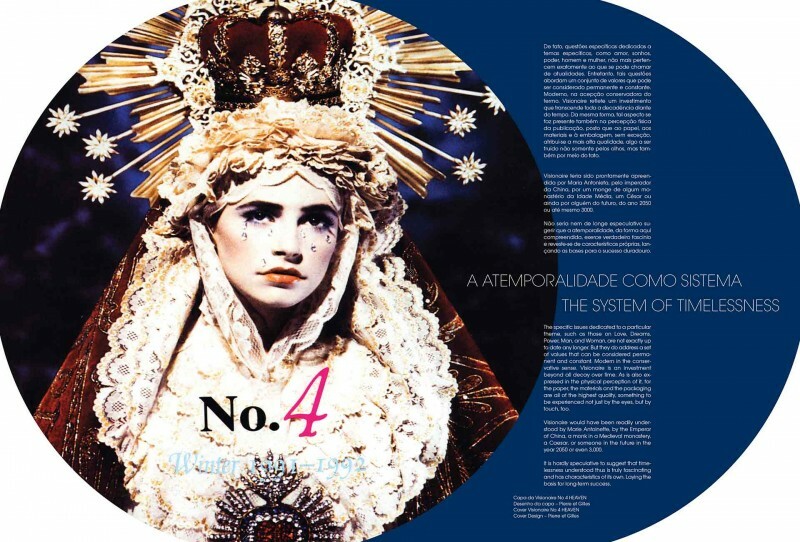 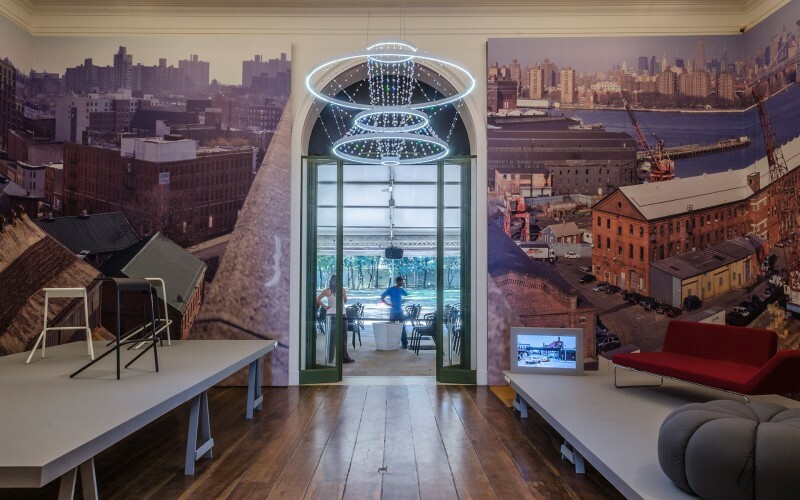 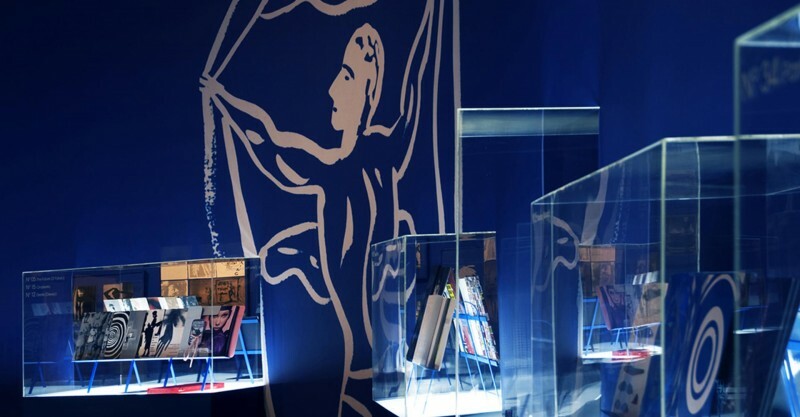 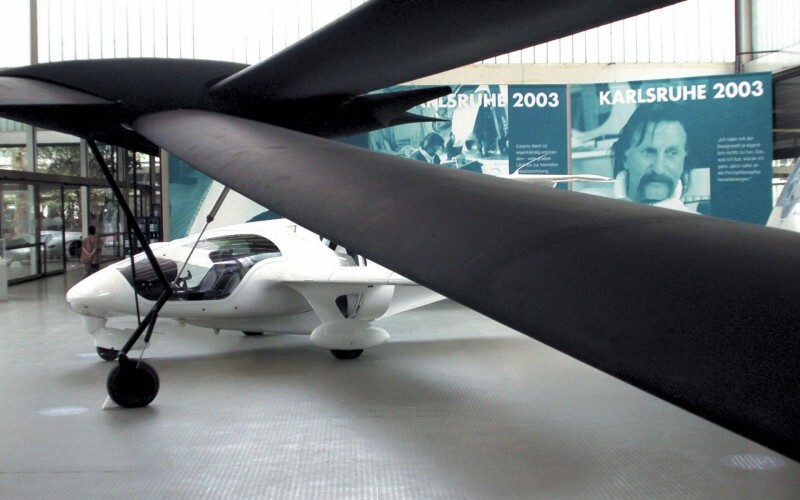 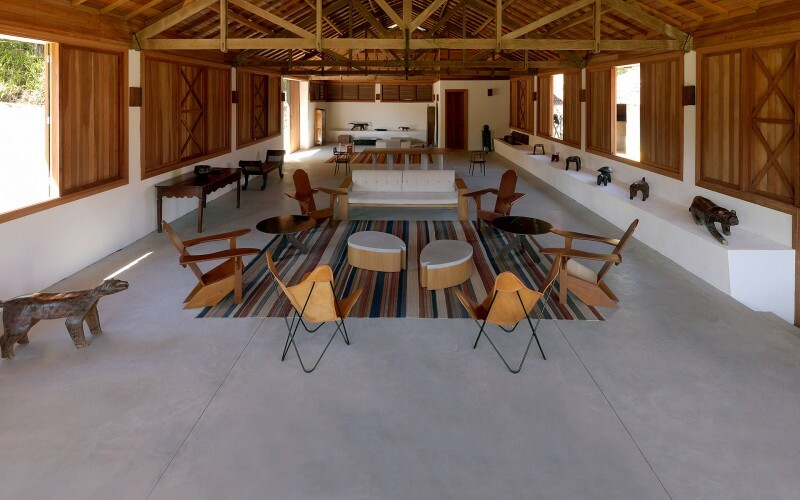 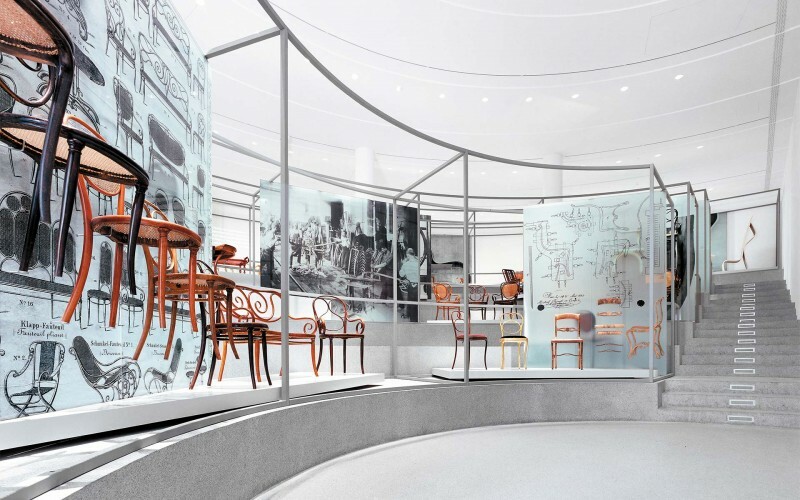 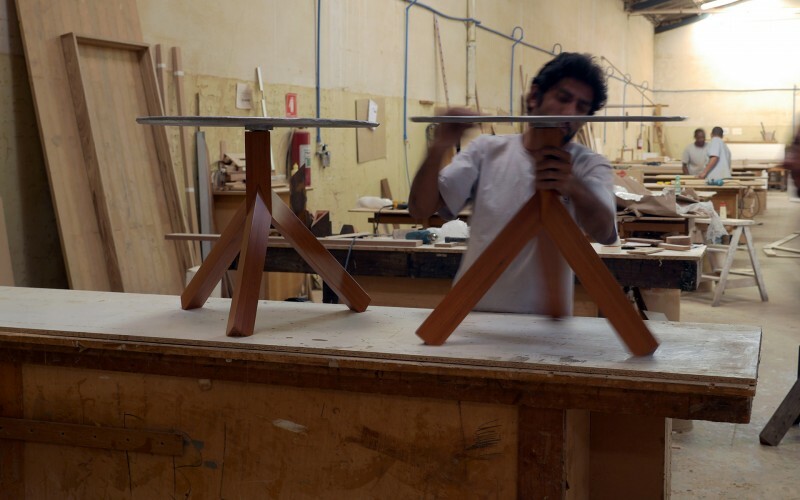 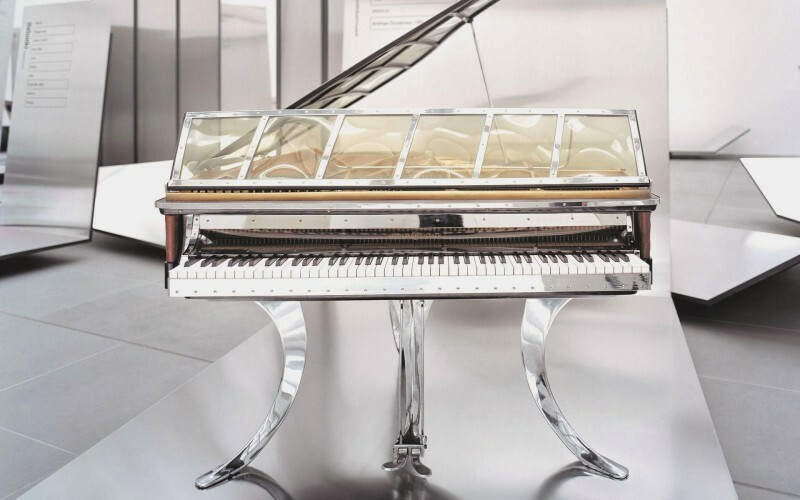 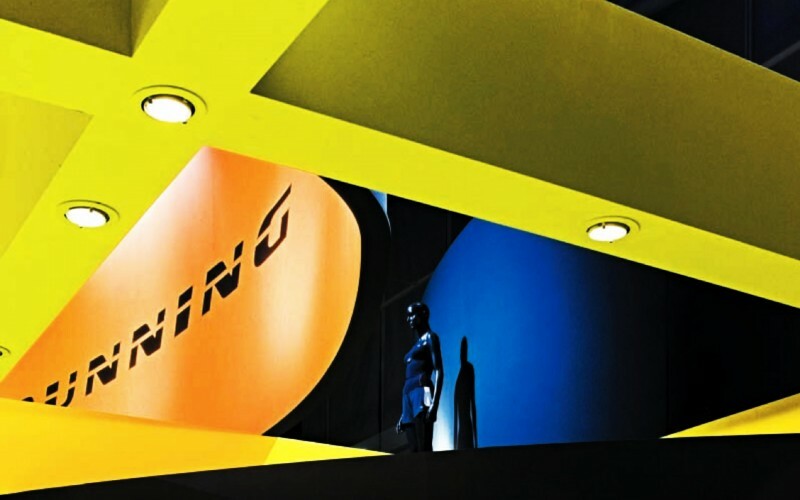 The exhibition about his lifetime achievements has been planned for the German Brazilian year in the Design Museum Museu da Casa Brasileira in Sao Paulo. 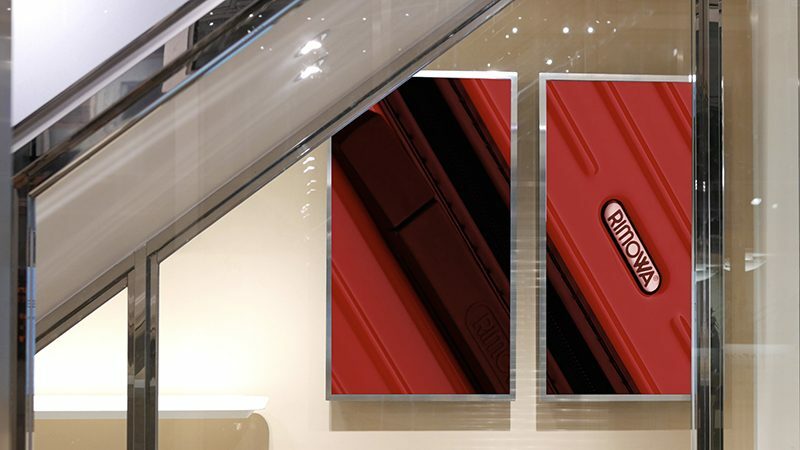 for lounges, exhibitions and museums. 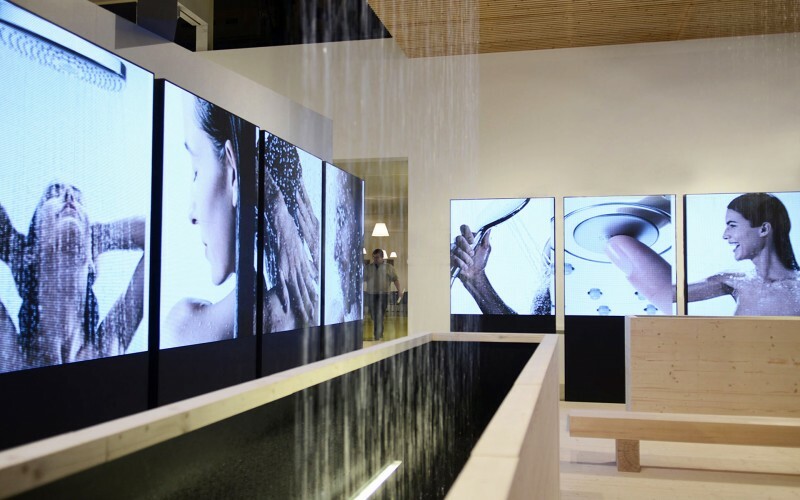 and 22 LED displays are the central feature at the meeting area of the Hansgrohe/Axor fair stand. 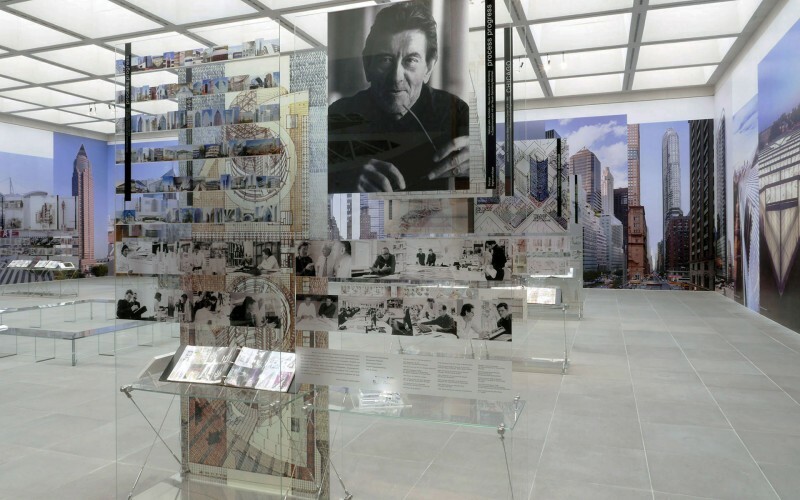 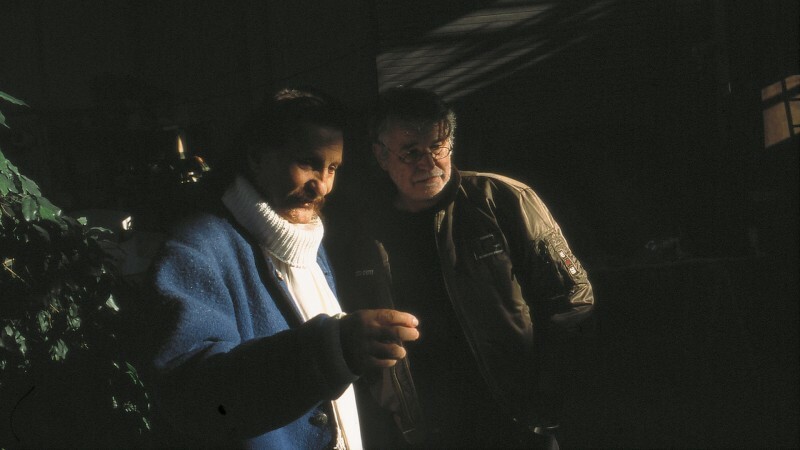 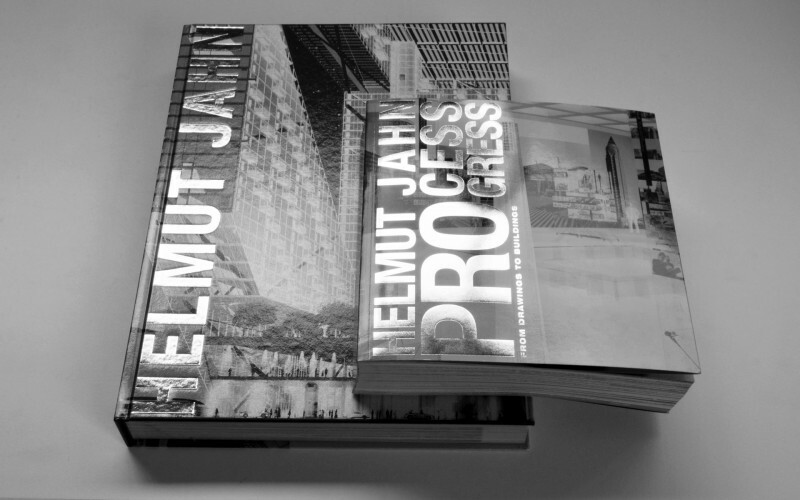 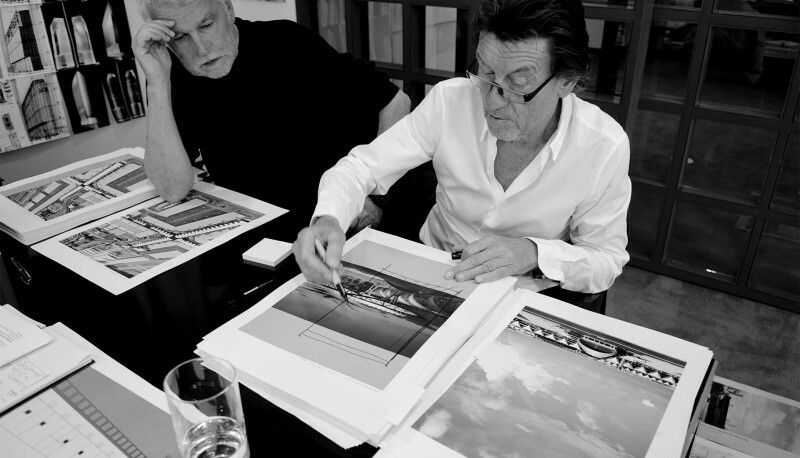 HELMUT JAHN PROCESS PROGRESS is the title of the exhibition, the main book and the catalog. 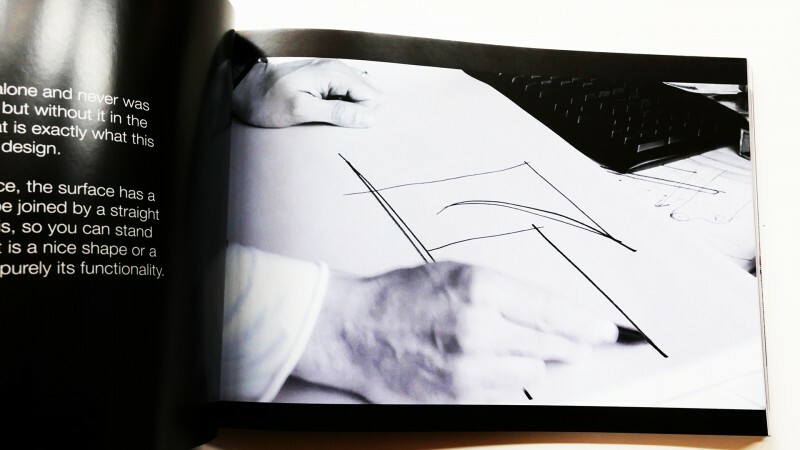 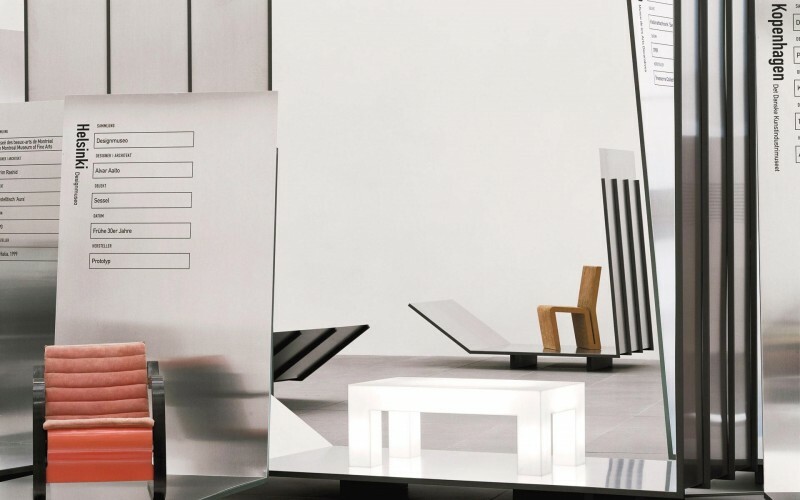 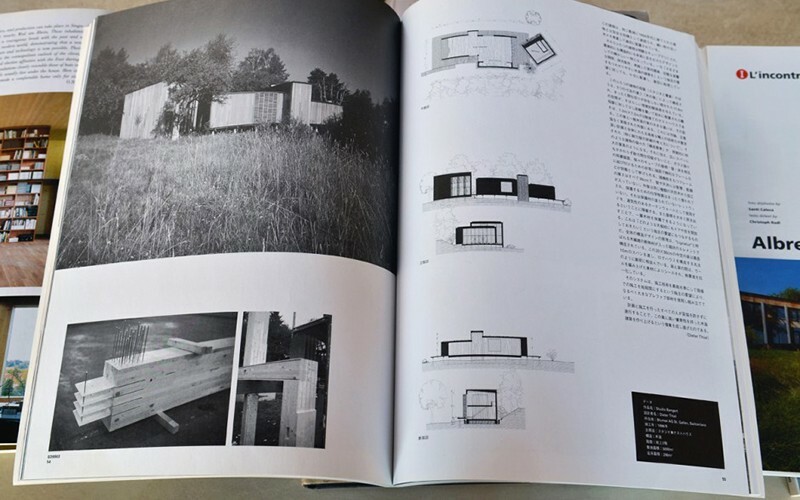 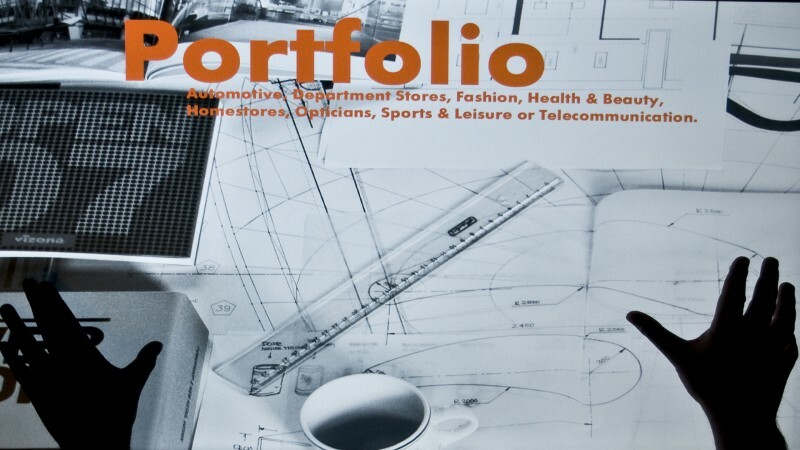 The 460 pages catalog accompanies the architects exhibition in Nuremberg. 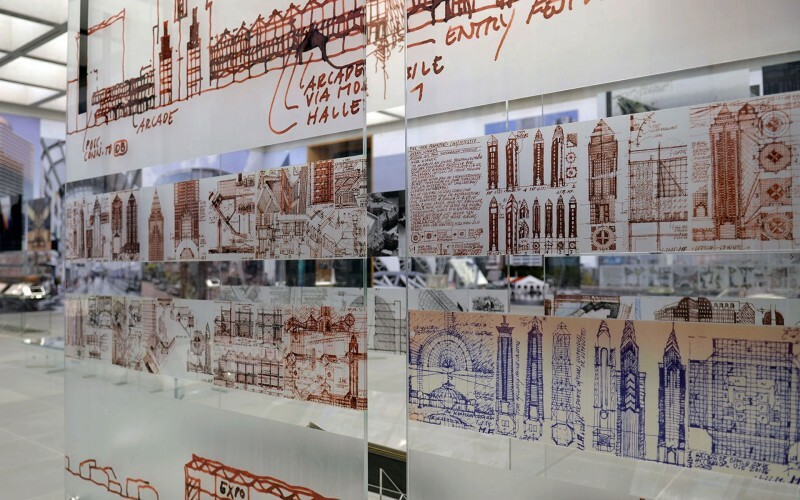 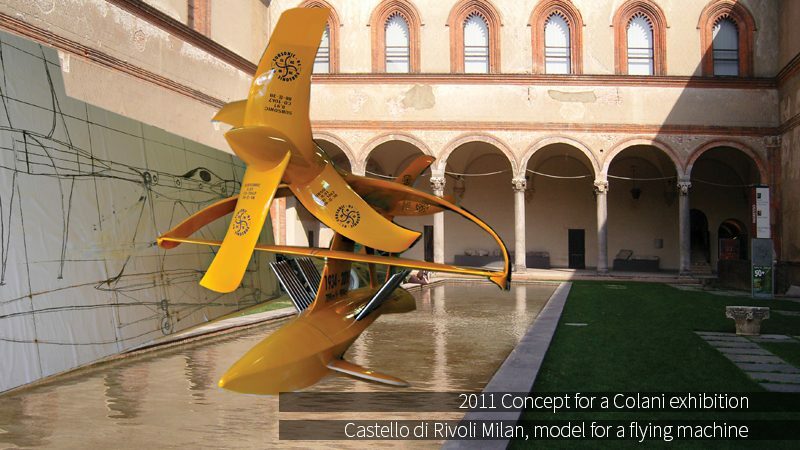 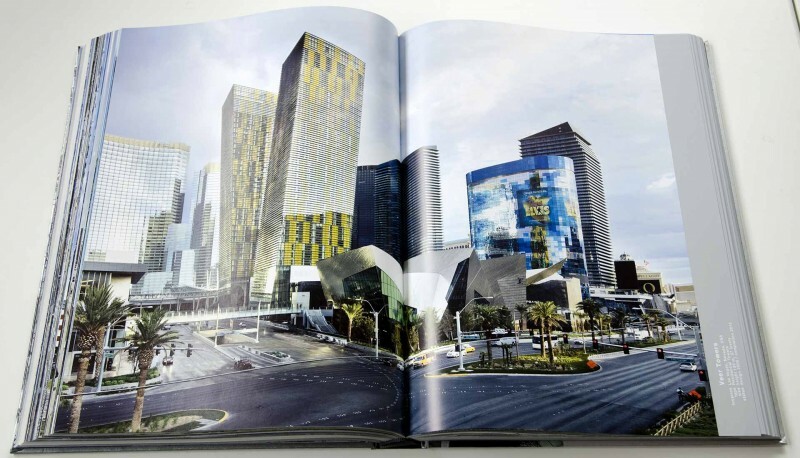 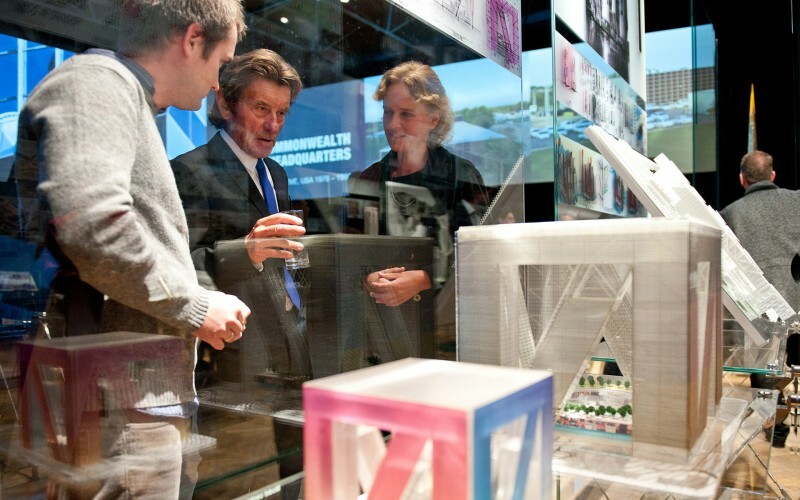 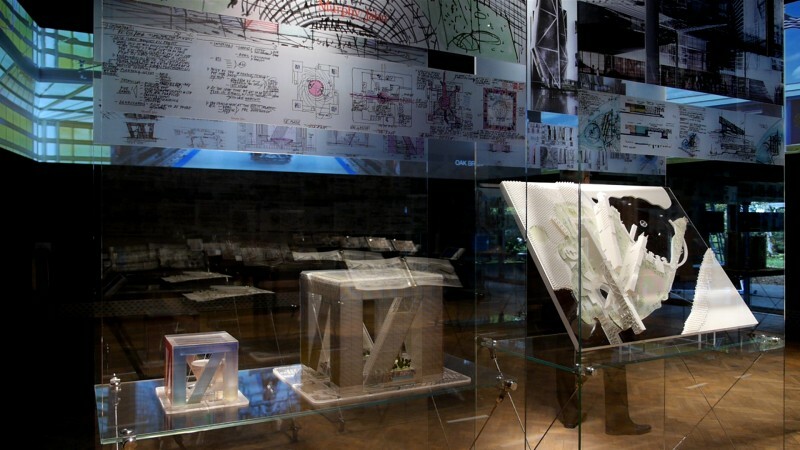 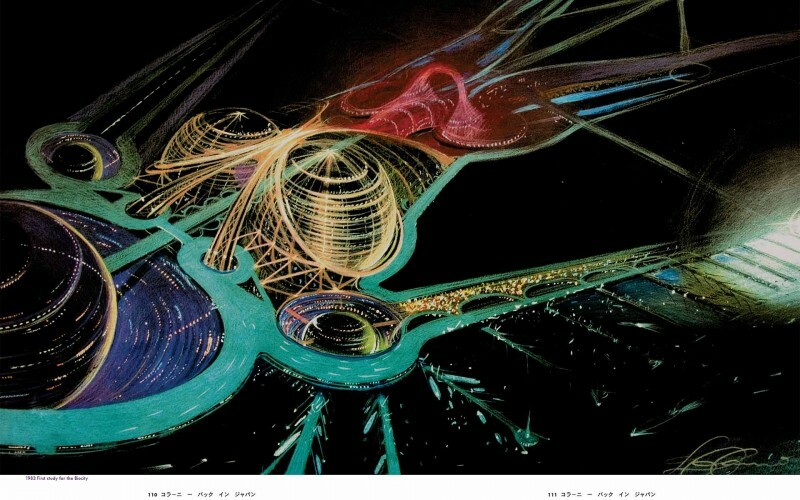 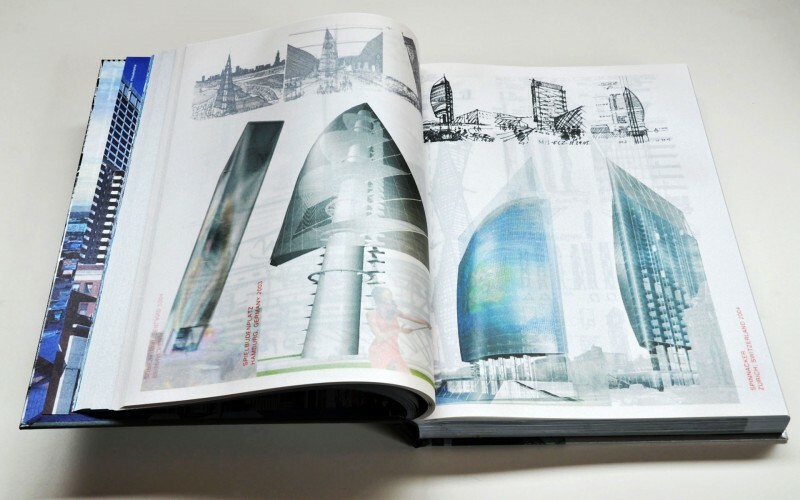 The idea is based on the process from drawings to buildings and shows an extensive selection of architectural drawings. 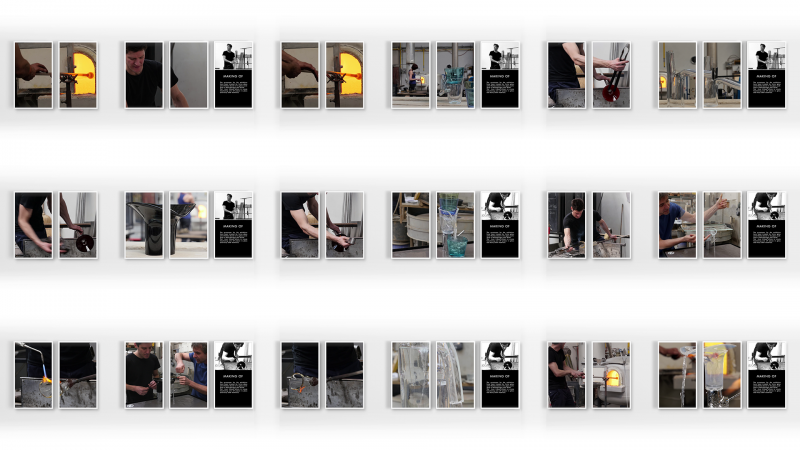 The exhibition in the Neues Museum Nuremberg has been curated and produced by bangertprojects, catalog and main book as well. 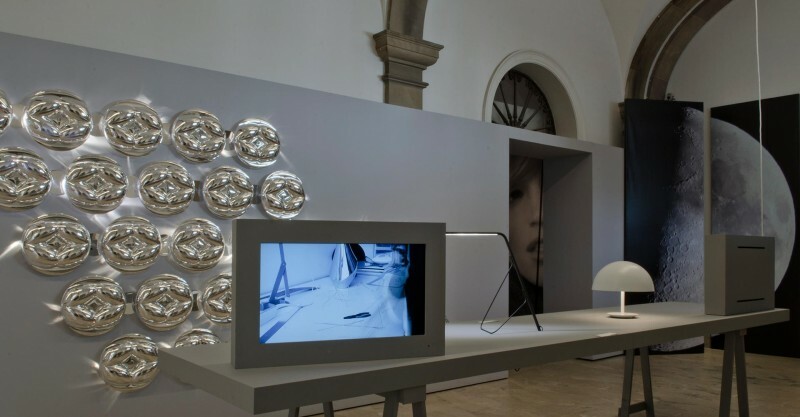 and his first monographic exhibition at the Neues Museum for Art and Design in Nuremberg. 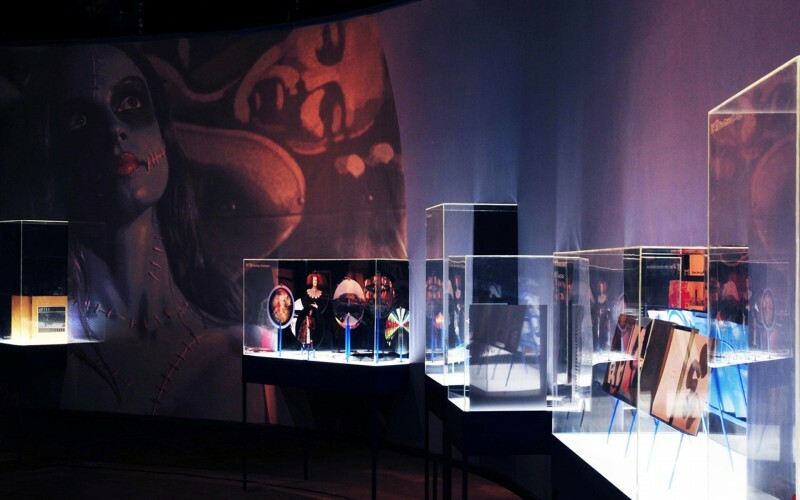 This exhibition became the most successful show since the museum opened in 2000. 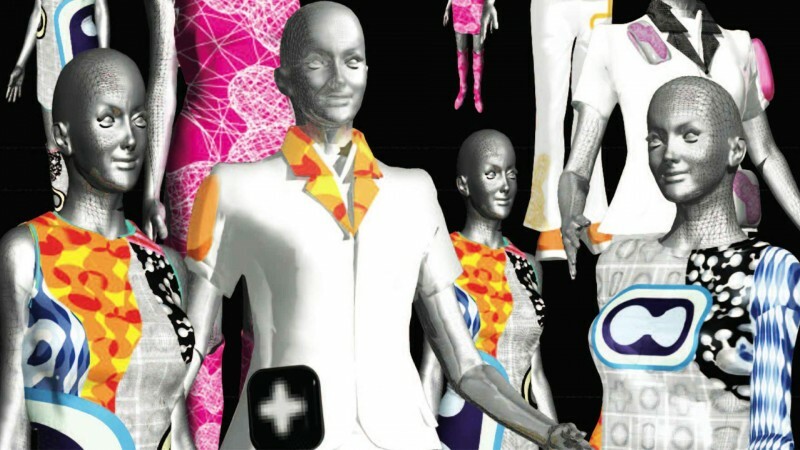 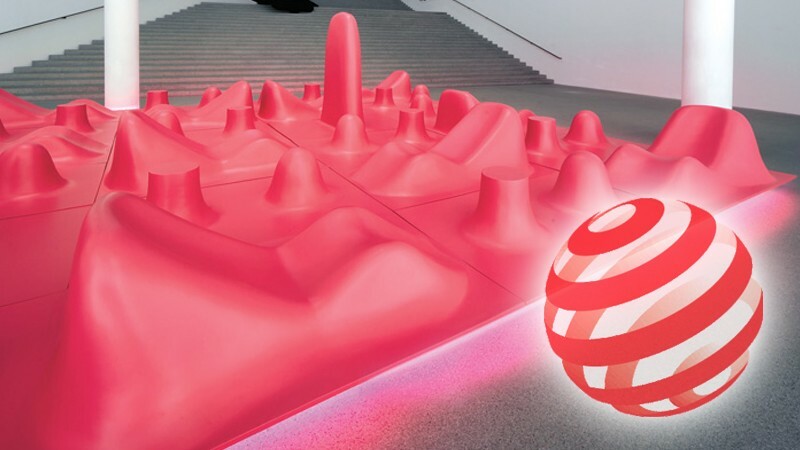 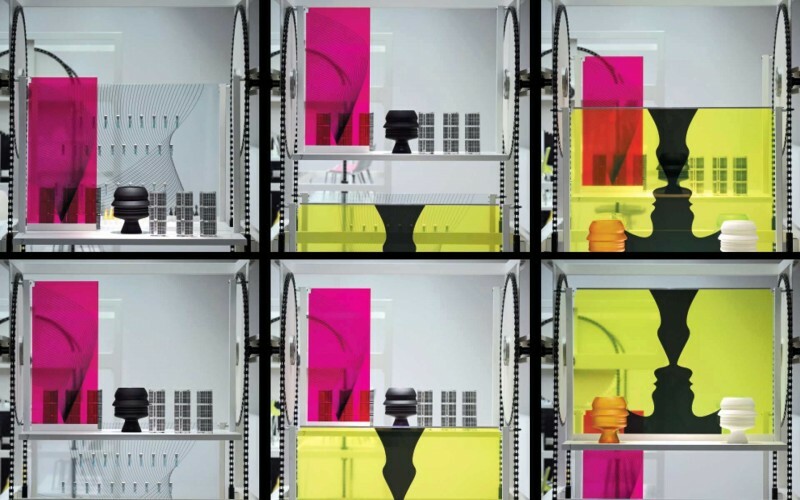 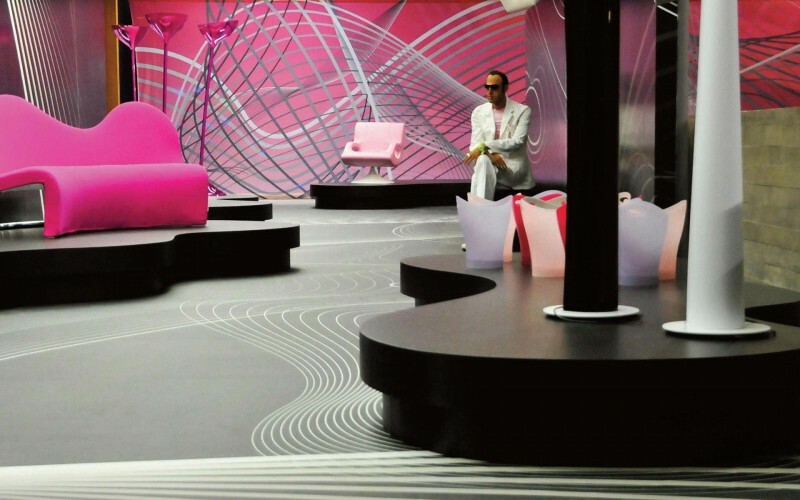 The Karim Rashid exhibition "THE IDEOLOGY OF BEAUTY" at the Museum of Contemporary Art in Zagreb confronts Art and Design. 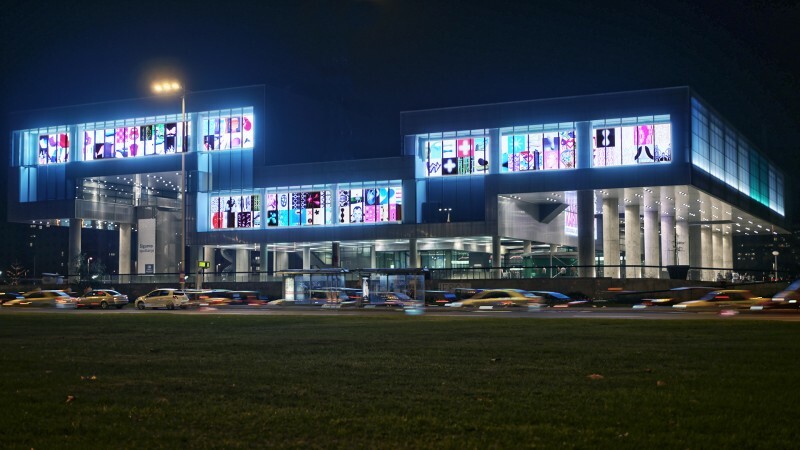 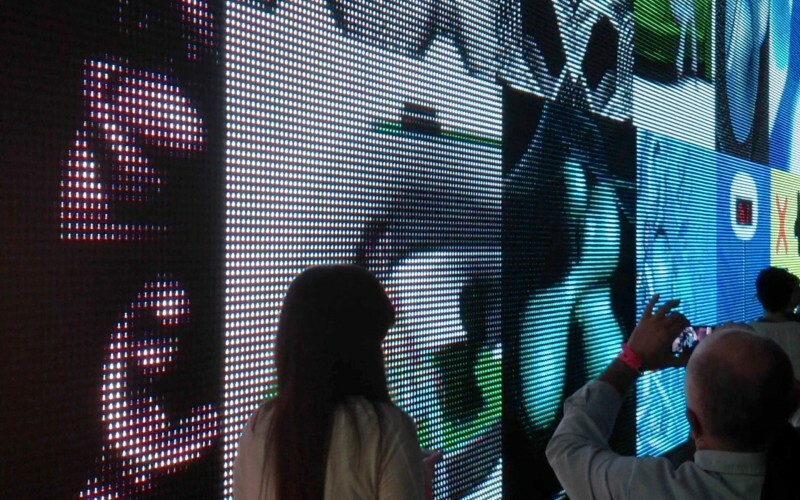 bangert projects has developed a 400 square meter LED facade based on the idea of the famous game "Tetris". 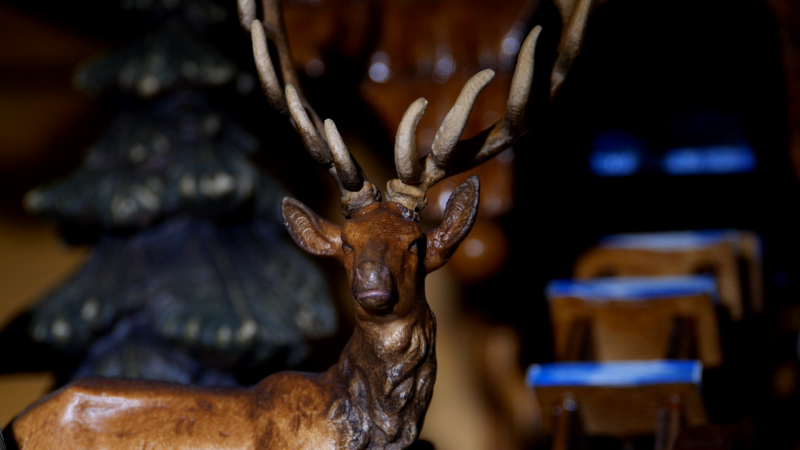 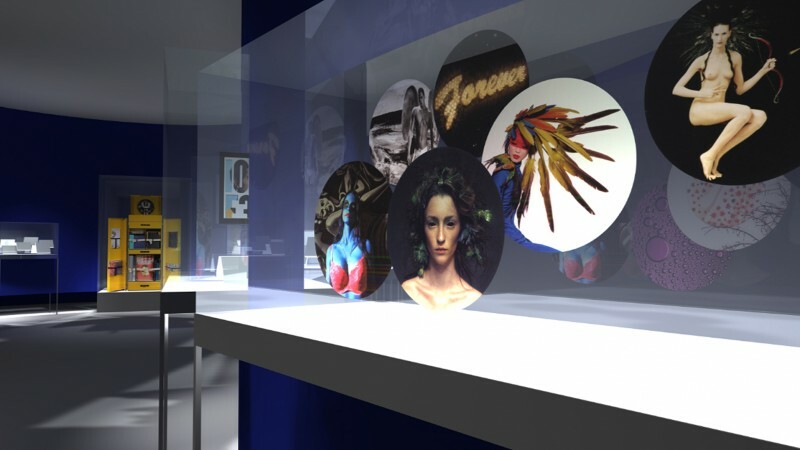 Digital ornaments, furniture, interiors and free art work. 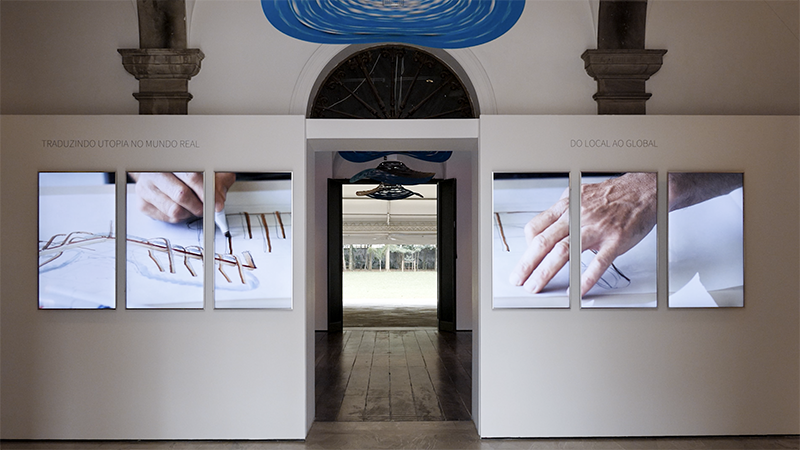 Videos with statements have been placed all over the space. 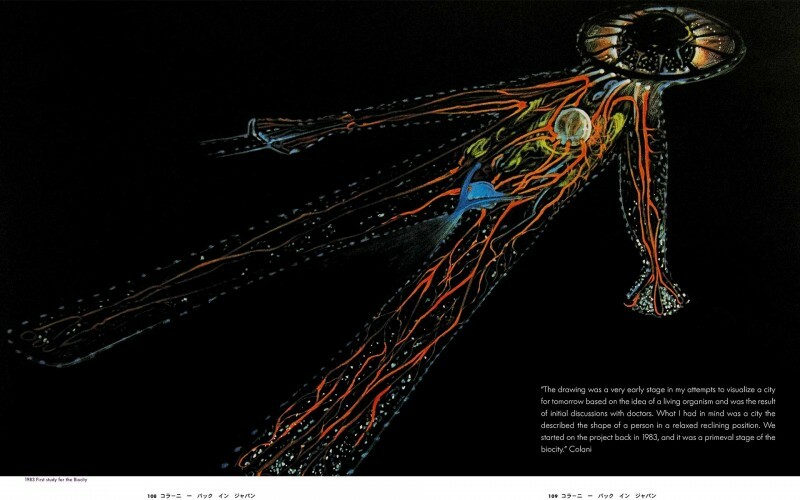 12 screens give as a time line an overview to the whole body of Karims work. 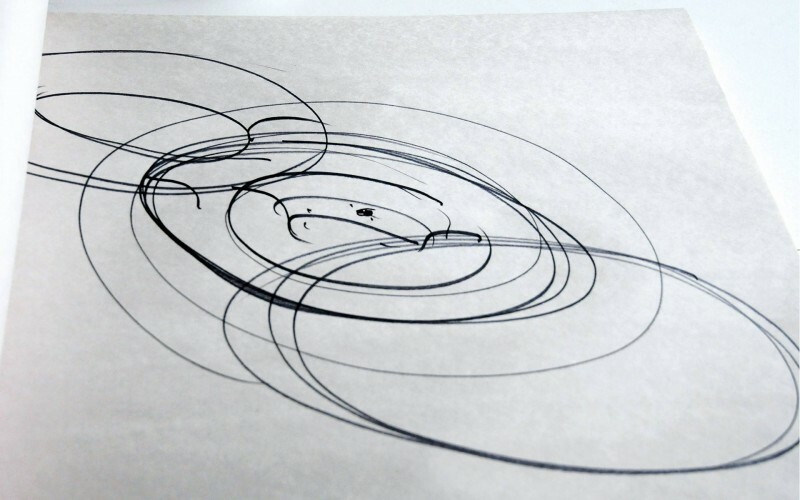 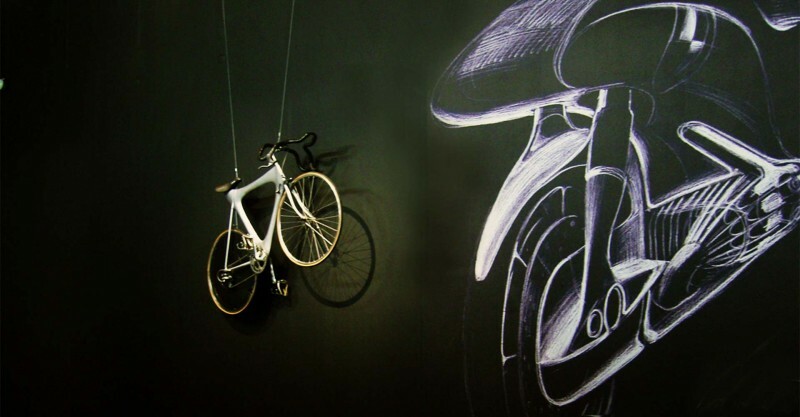 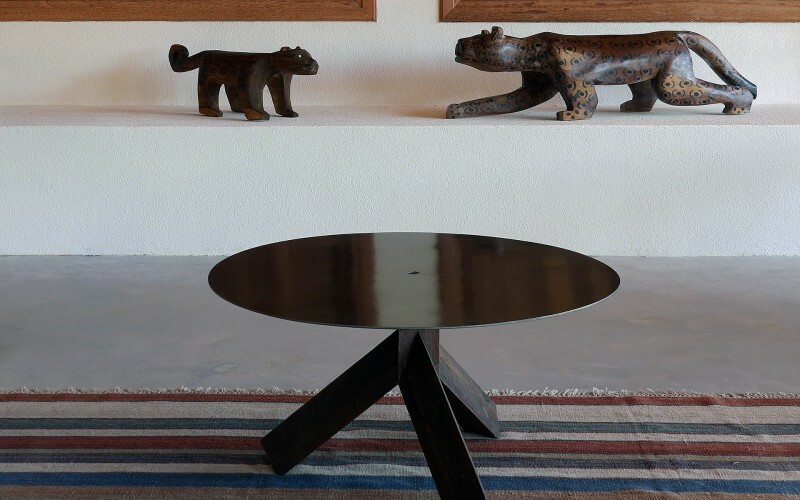 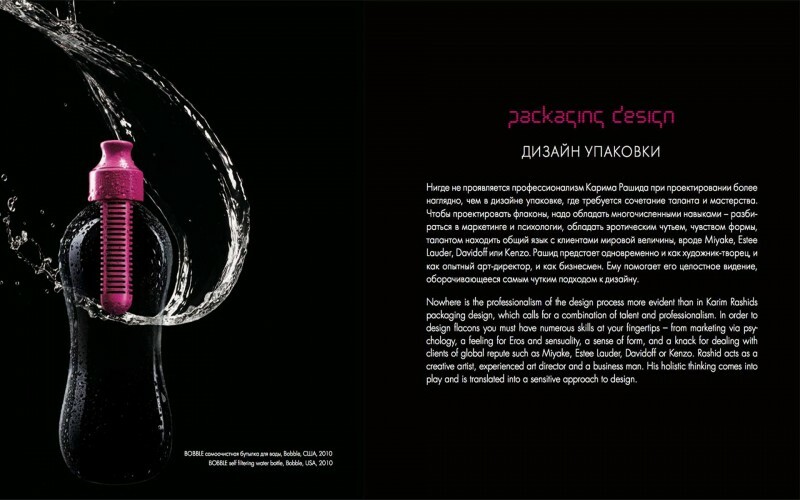 The concept of a confrontation between art and design has been developed in cooperation with the museum. 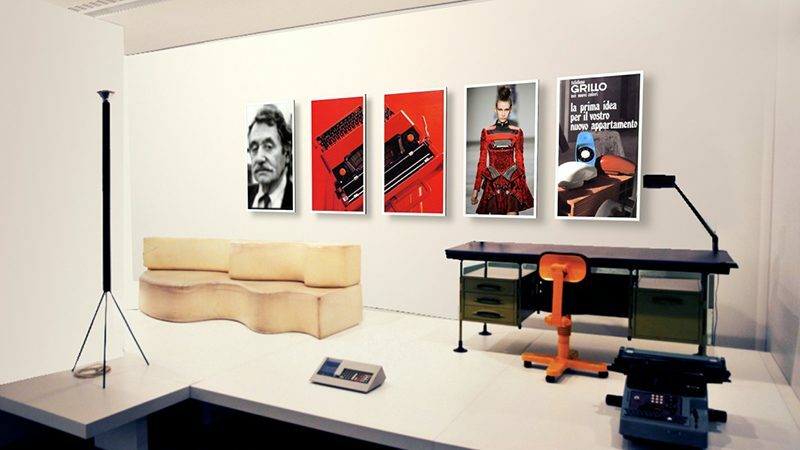 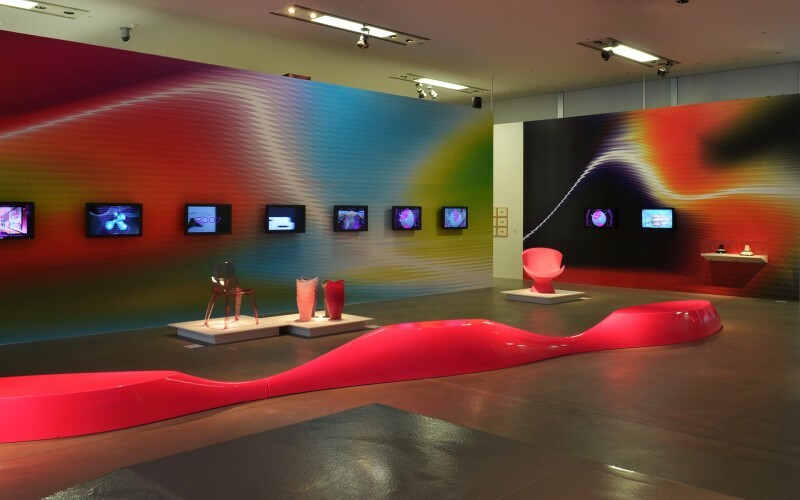 Optical Art of the seventies and digital created design of the 2000. bangert projects in co-operation with Tihomir Milovac. 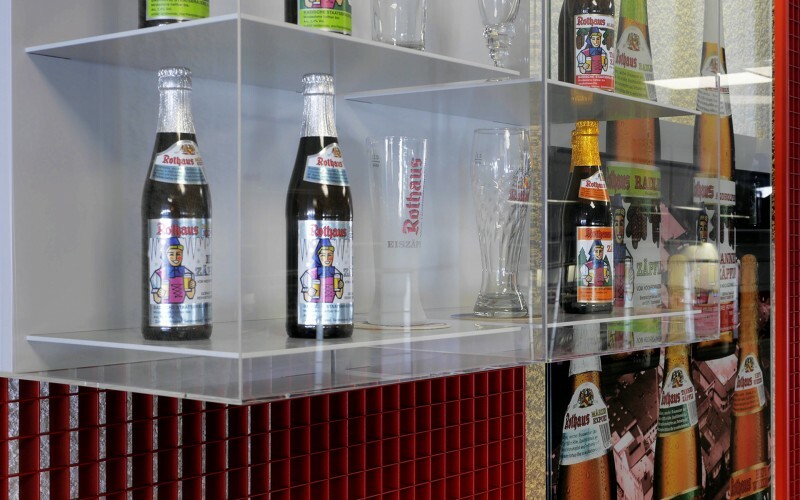 The Tannenzäpfle beer bottle of the Rothaus brewery became a true cult object. 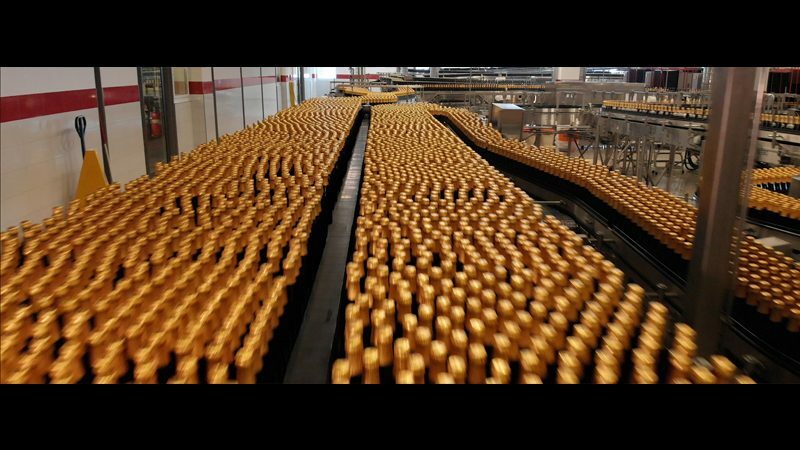 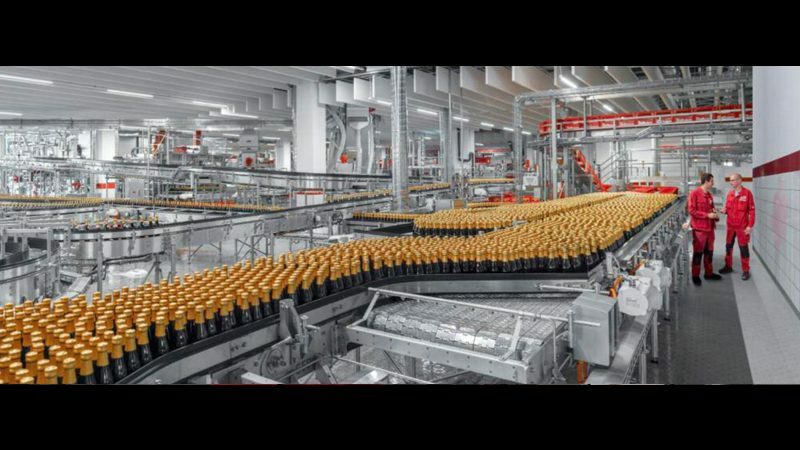 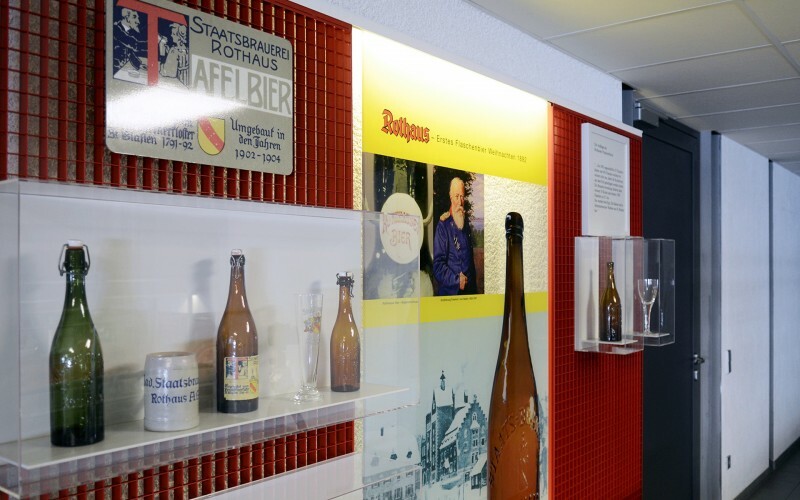 To show the development of the beer bottle since 1892 bangertprojects has been commissioned to document this process at Rothaus. 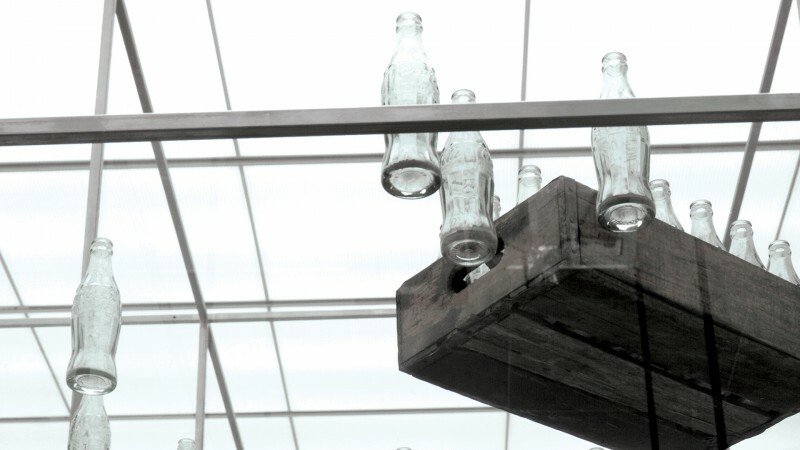 The result is the new bottle gallery, where the bottles are displayed like works of art. 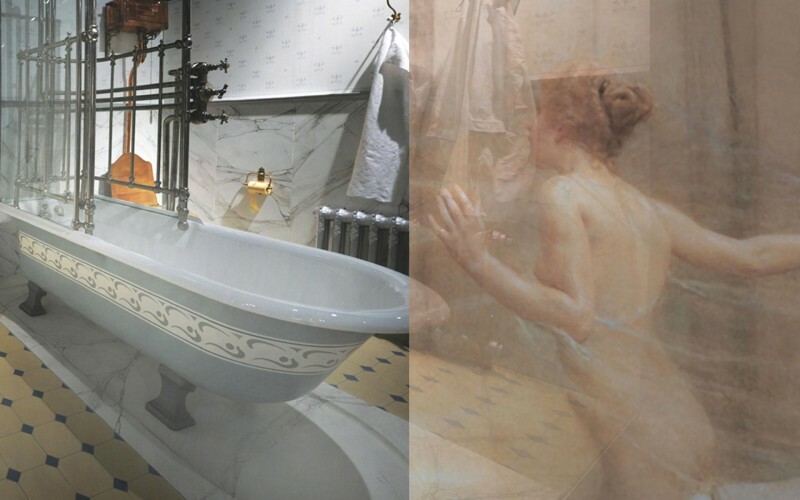 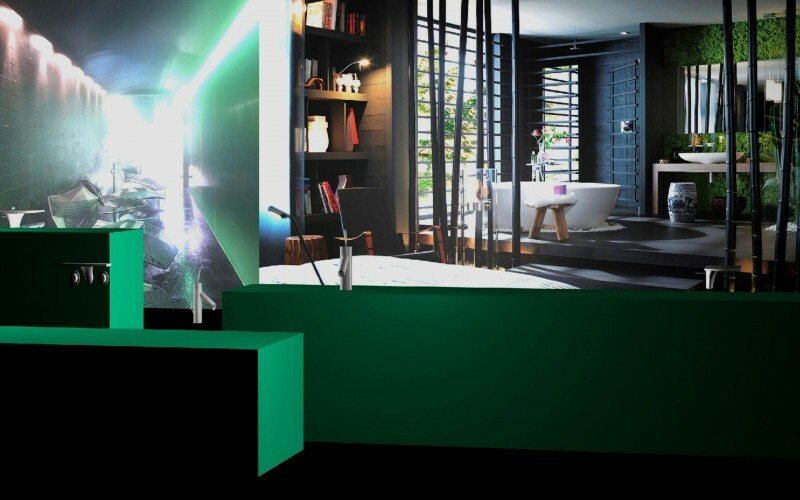 Exhibition WATERDREAM for Hansgrohe – a visual update of the exhibition concept for the MODA Museum of Design in Atlanta 2011: a time line of the history of bathroom design – the Starck bathroom revolution – bathrooms as modern interior. 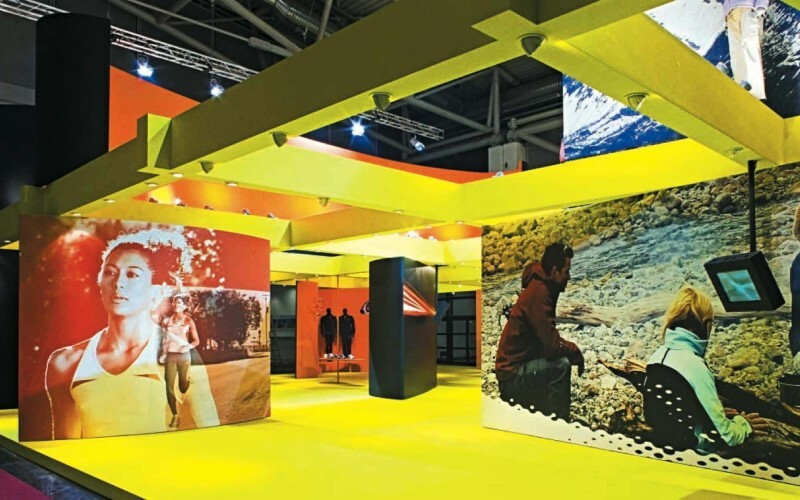 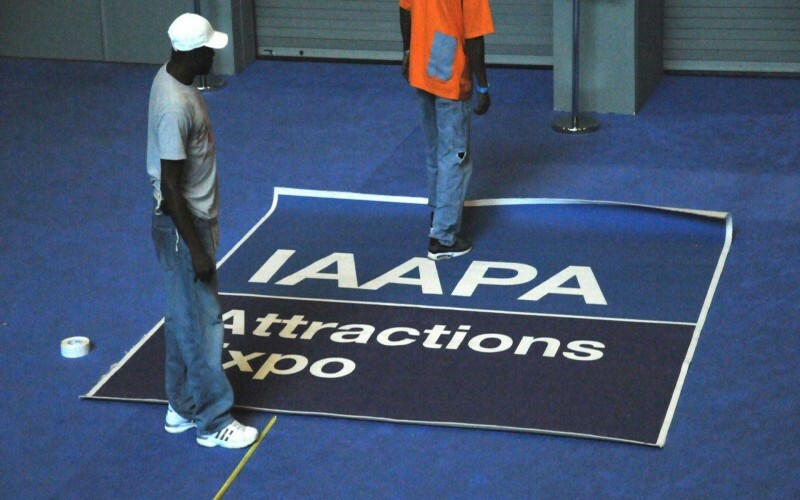 for past exhibitions and major events. 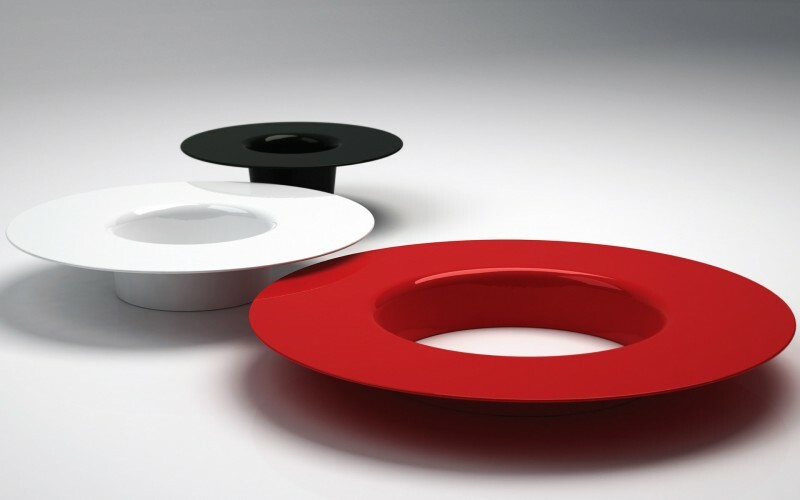 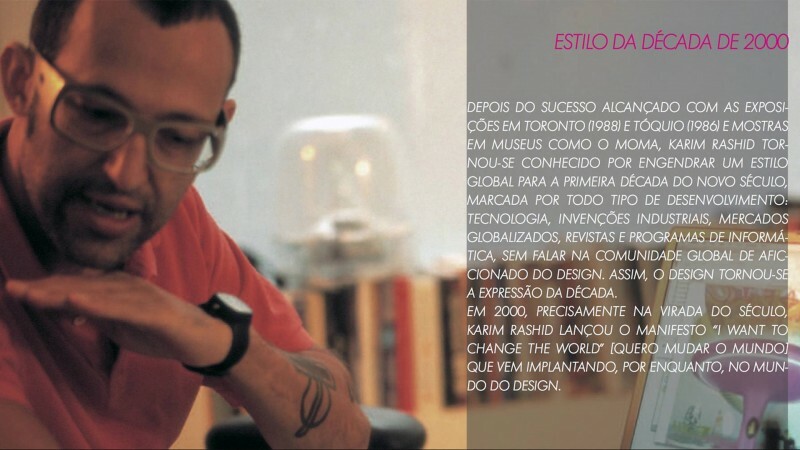 provided an insight into the work of Karim Rashid. 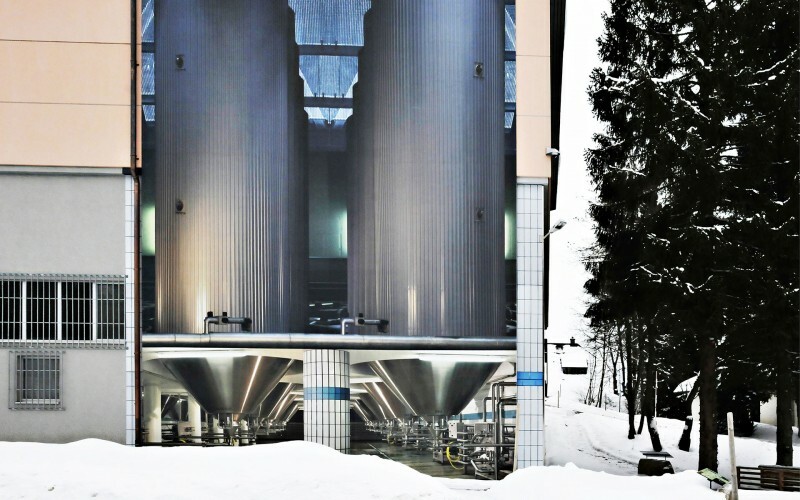 through the brewery. 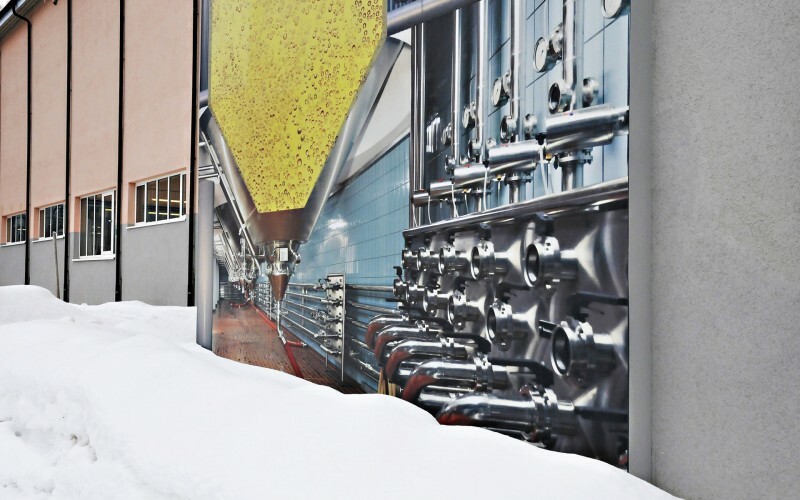 The 90-minute brewery tour offers a glimpse behind the scenes. 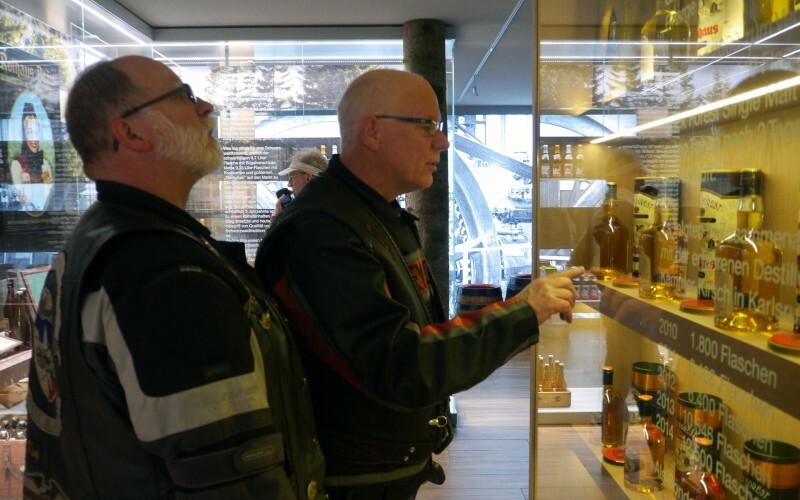 to the Sudhaus, the storage cellar and finally the bottling facility. 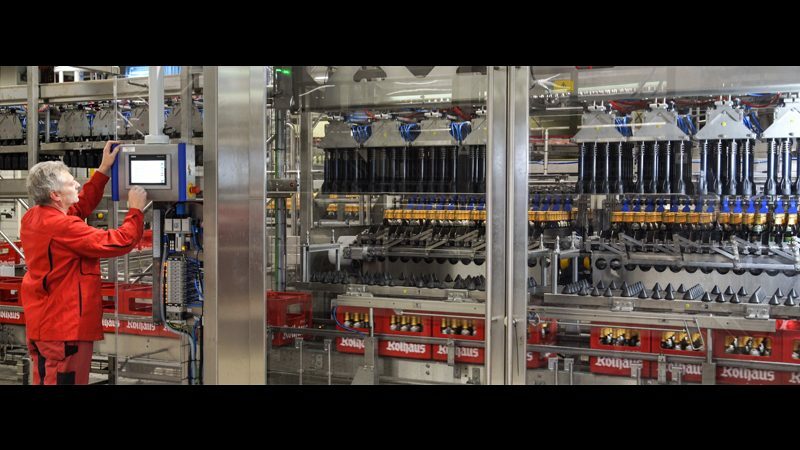 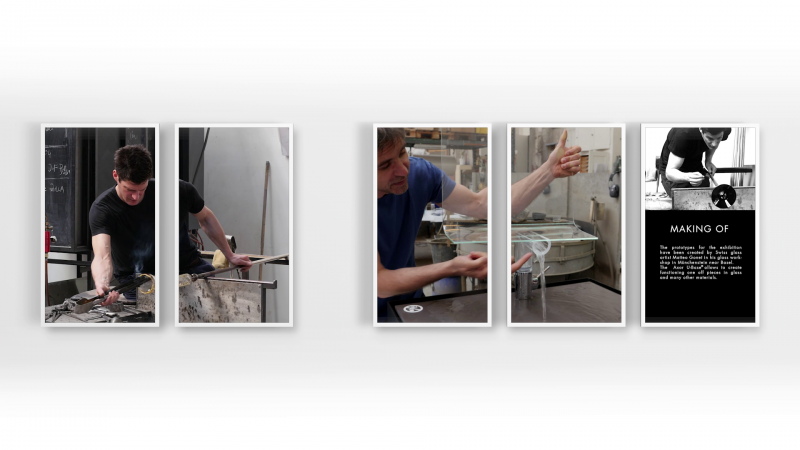 about the brewmasters’ labor and craftsmanship, as well as about the mechanically refined processes within the innovative facility. 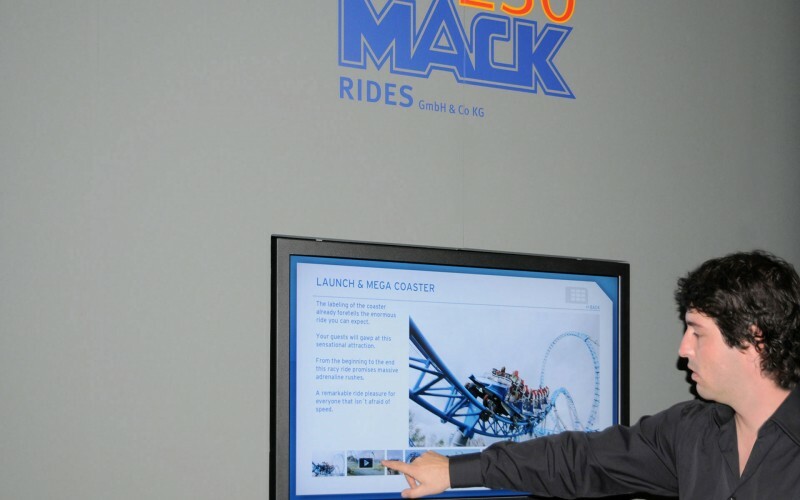 bangertprojects translated the website of the German roller coaster producer Mack Rides into interactive screens for trade fairs shown at the IAAPA Orlando. 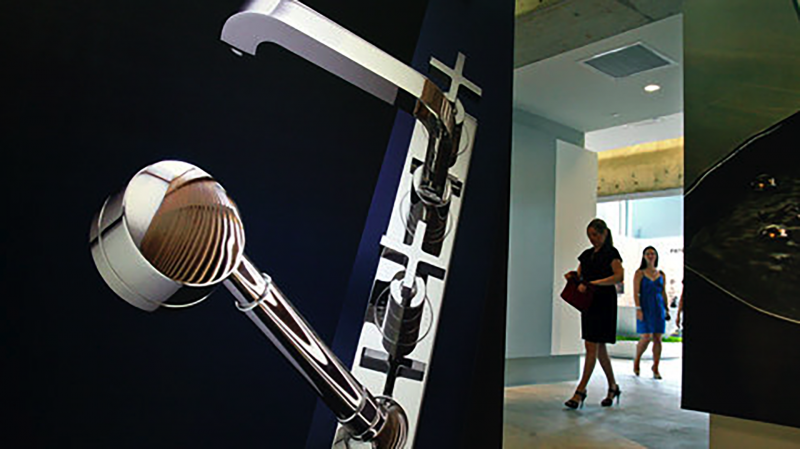 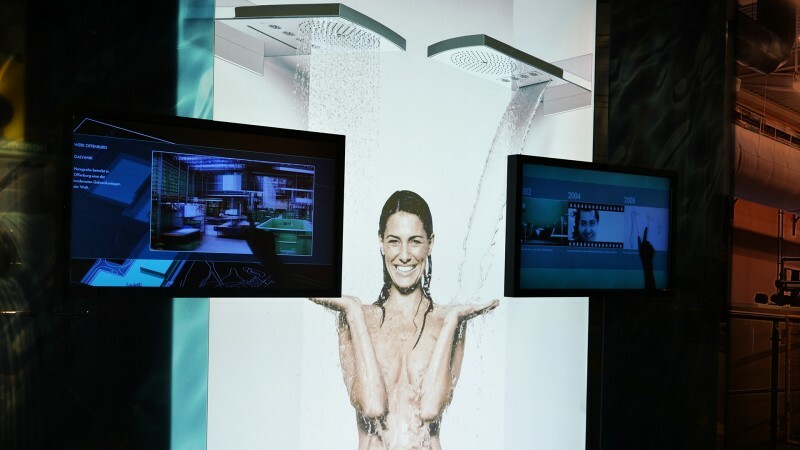 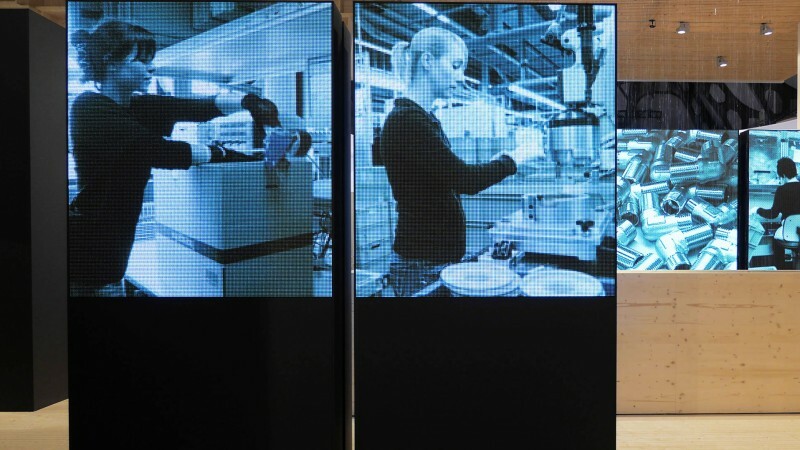 Hansgrohe – Interactive factory entrance in Offenburg. 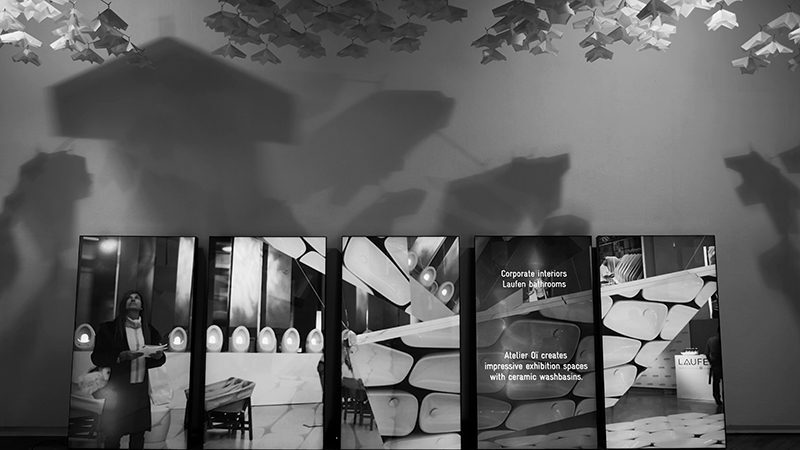 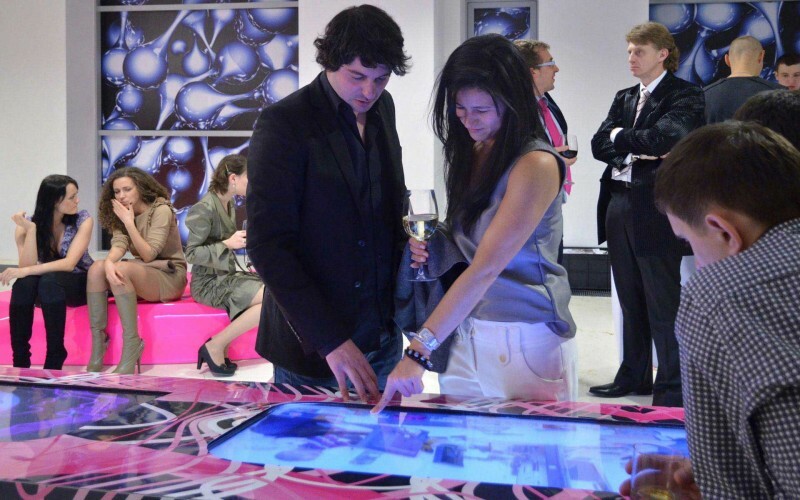 Prototype of our interactive installations merging interior design, graphics and interactive screens. 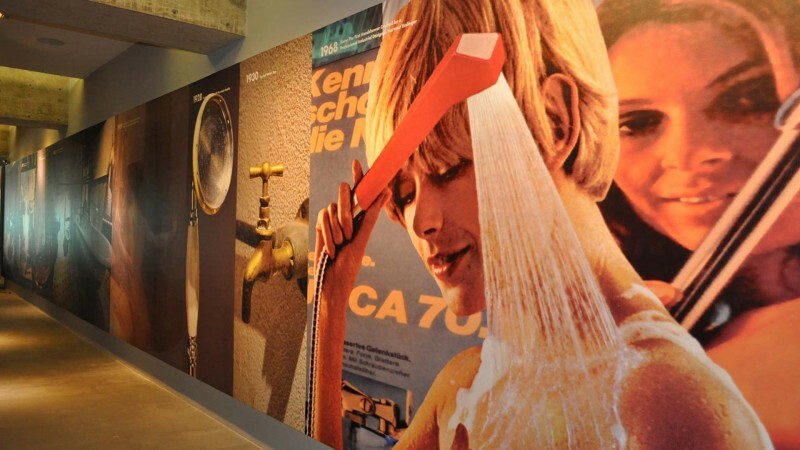 Also the contents merge: The wall sized photographs show the departments of the shower factory and the screens explain the activities on the production sites. 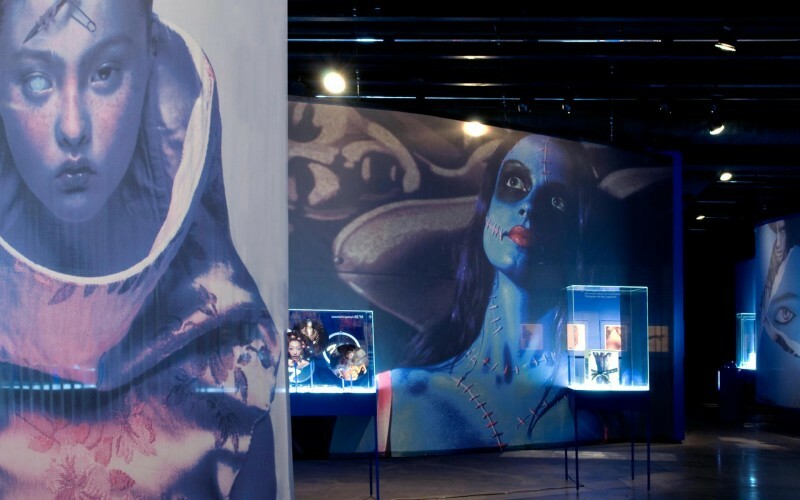 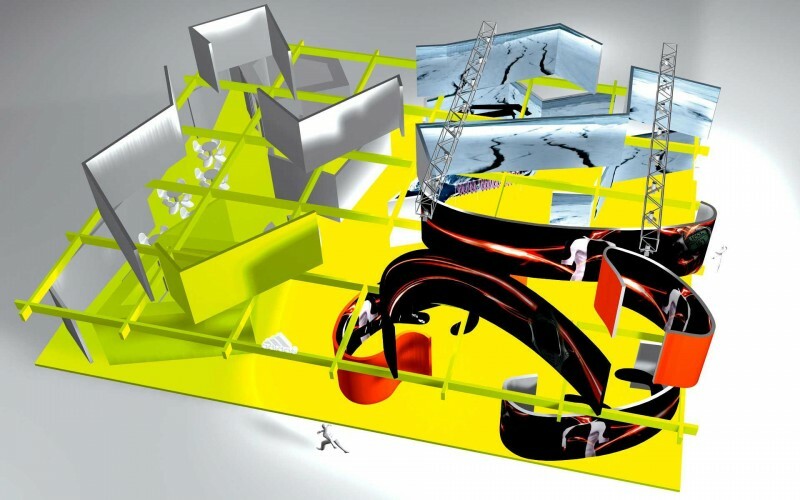 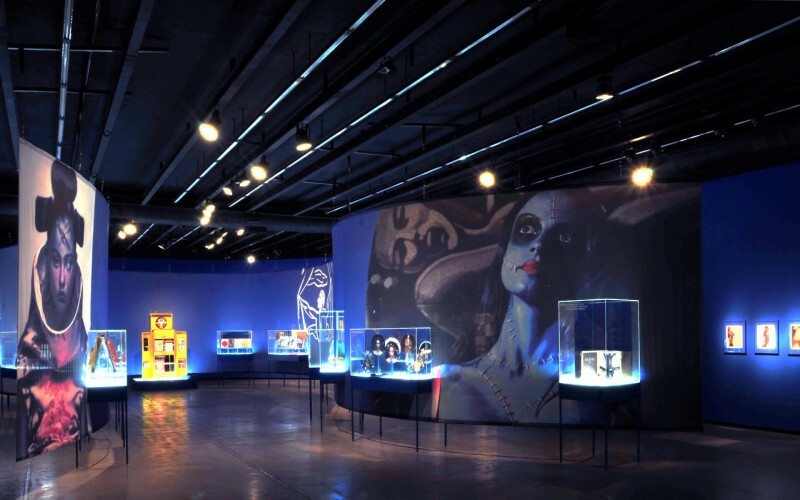 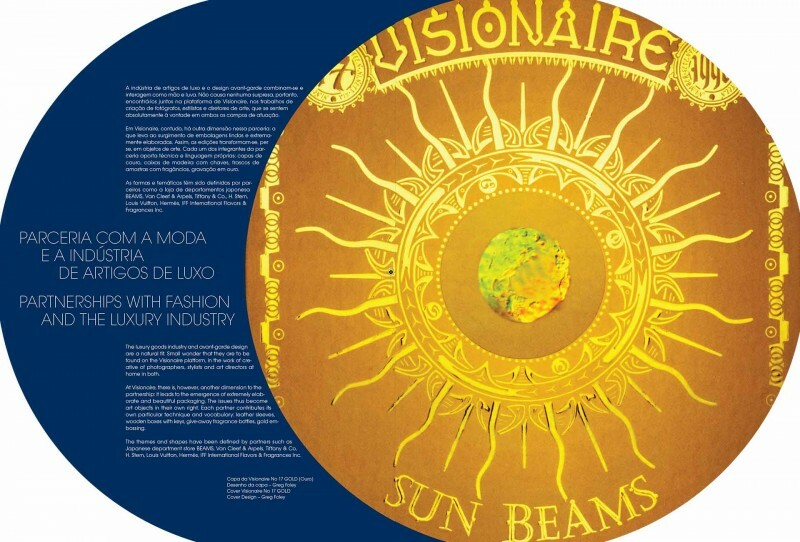 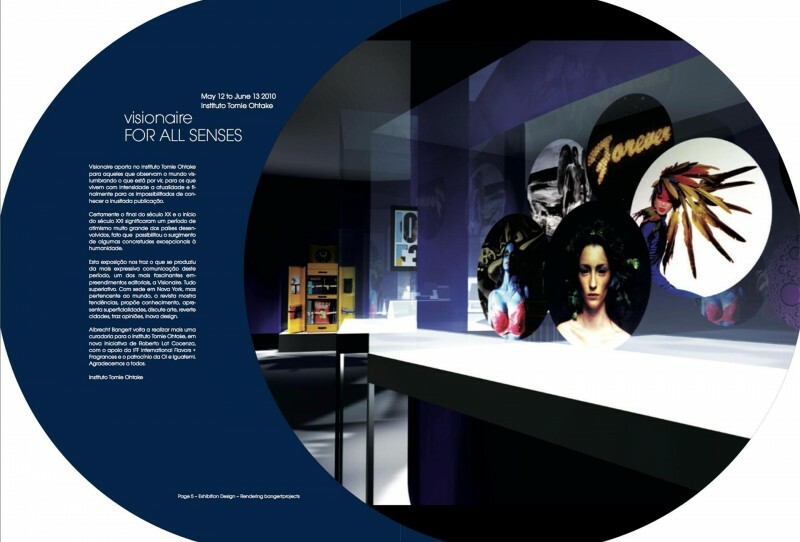 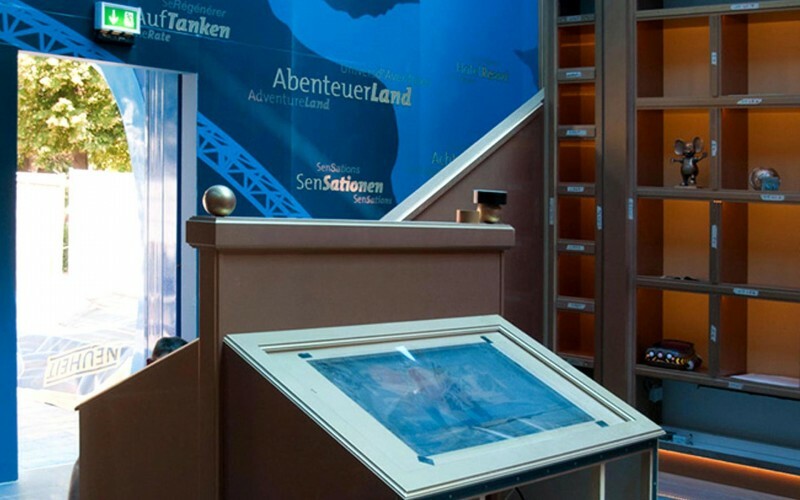 Design and curatorship of the exhibition "VISIONAIRE FOR ALL SENSES"
The Historama shows in documents, in a show and on interactive screens the 30 years old history of Germany's biggest theme park. 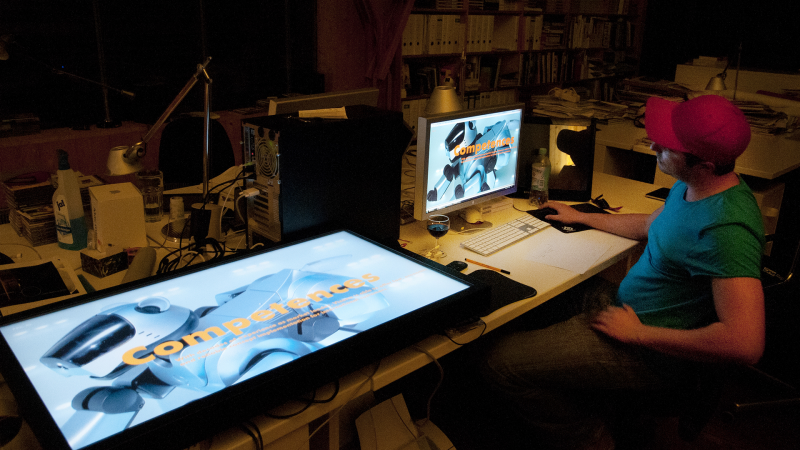 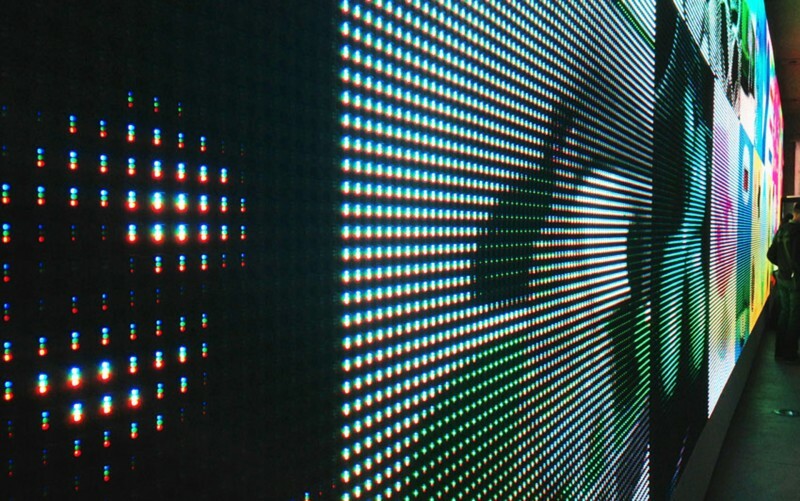 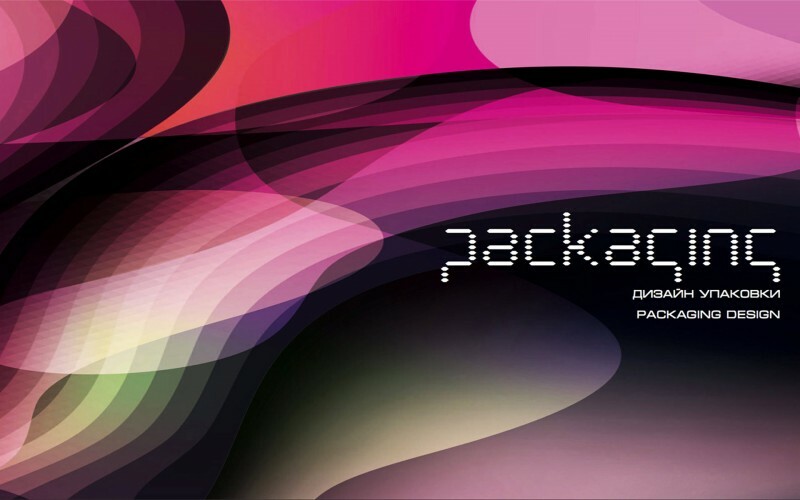 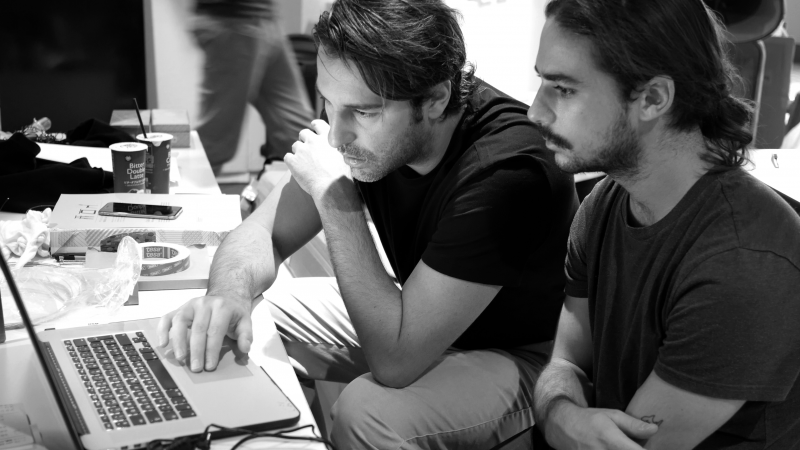 Design of the screen content: Powerstation Studios – Programming and hardware: bangertprojects. 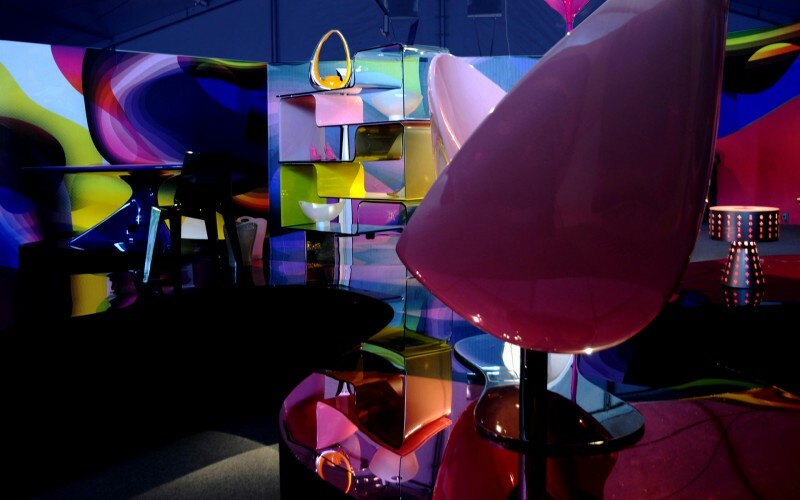 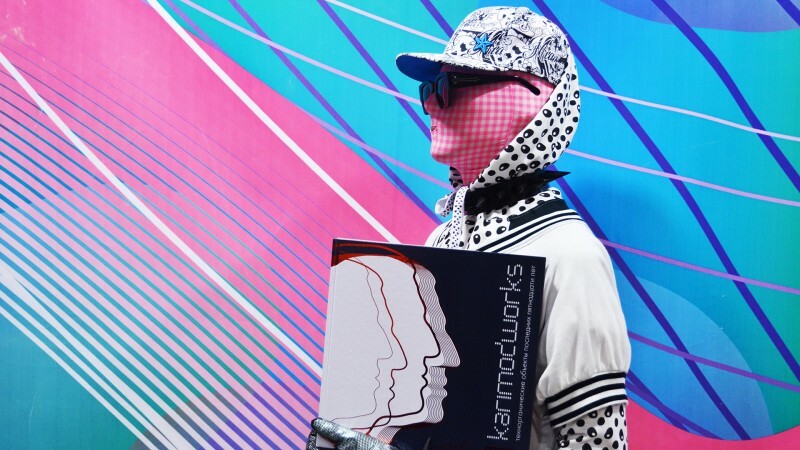 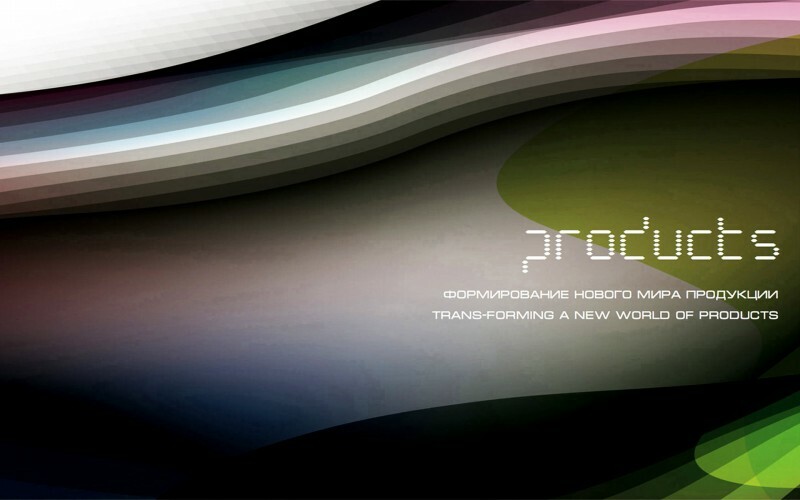 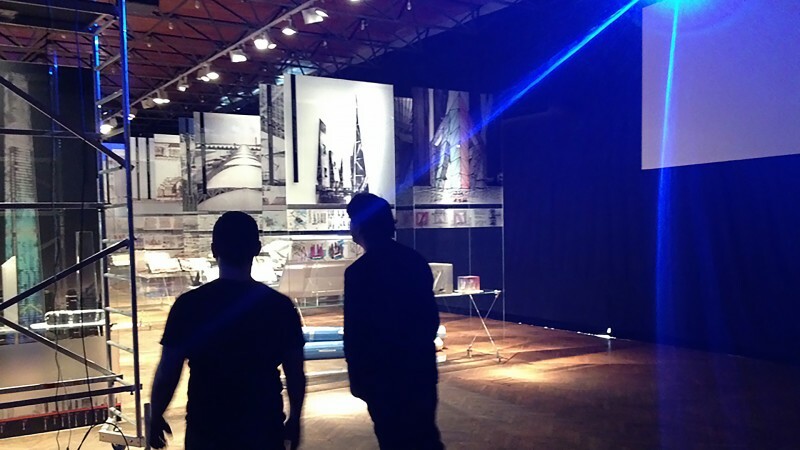 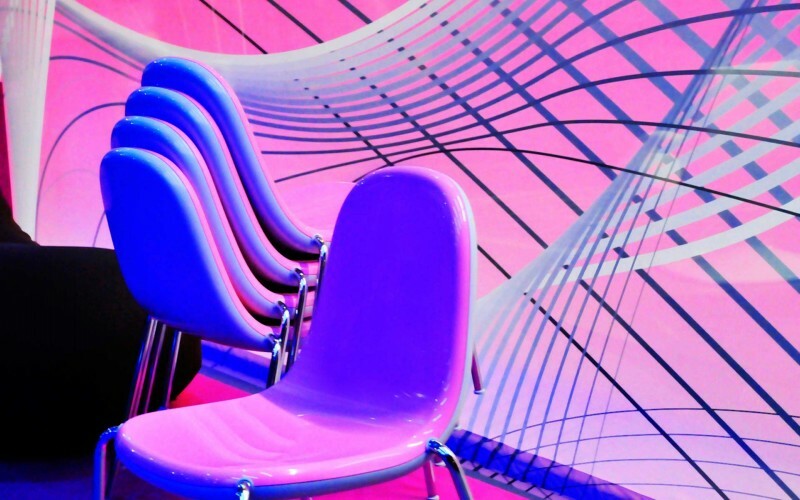 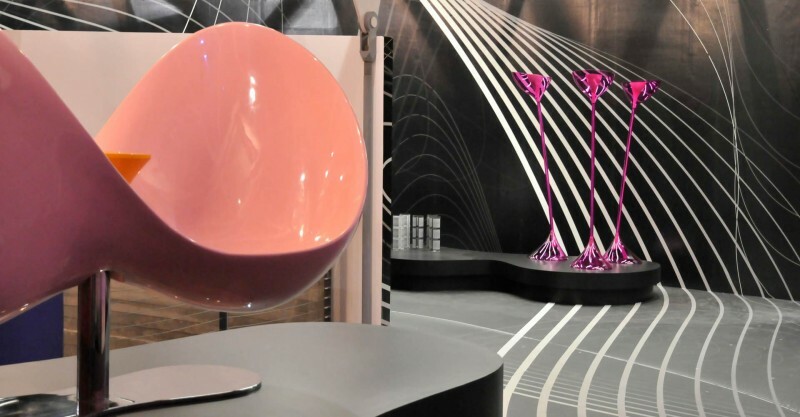 On the occasion of design of Karim Rashid Inc. in New York bangertprojects organized and curated the exhibition for the Inspiracje Festival "POLUXOURIOUS" in Stettin. 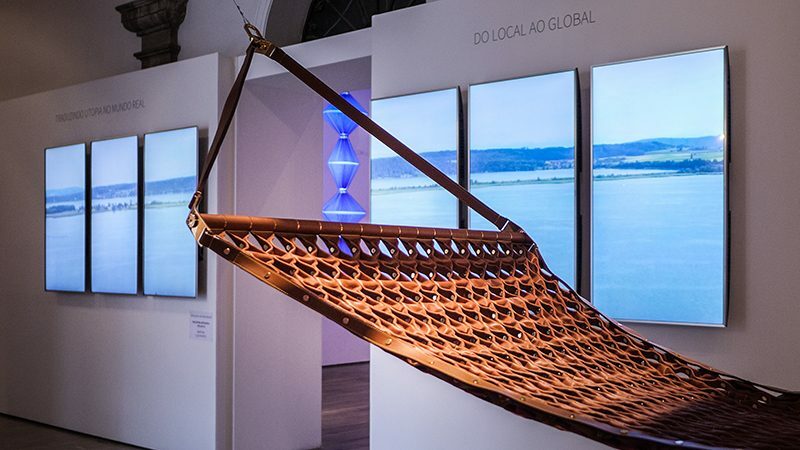 Bangert projects conceived a slideshow with more than 1.000 works of master designer Luigi Colani for the design exhibition in Quingdao, China. 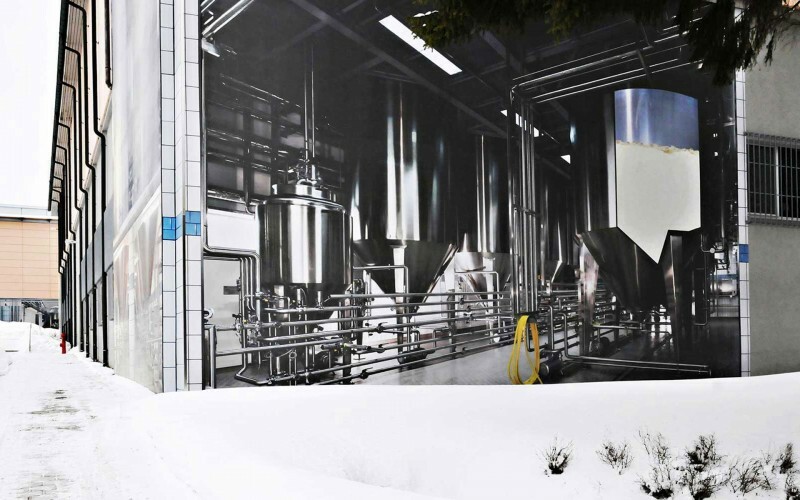 In order that the many visitors can imagine, what is going on behind the huge walls of the brewery we have produced murals depicting the brewing process in a one by one scale. 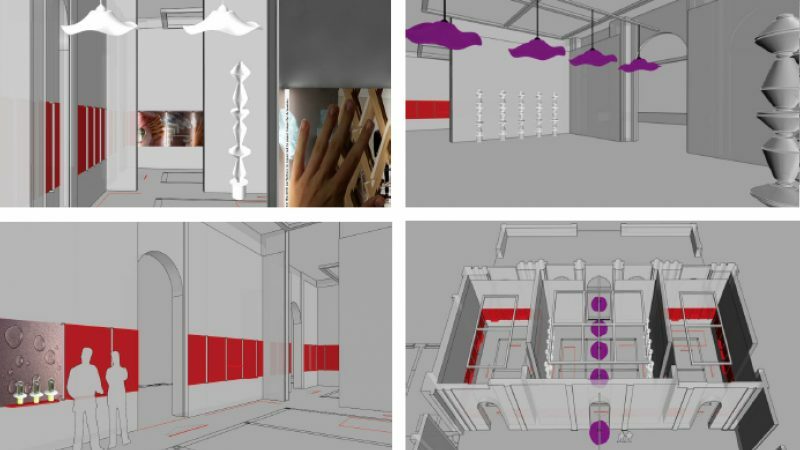 So you can walk around the buildings and imagine, what is going on behind the walls. 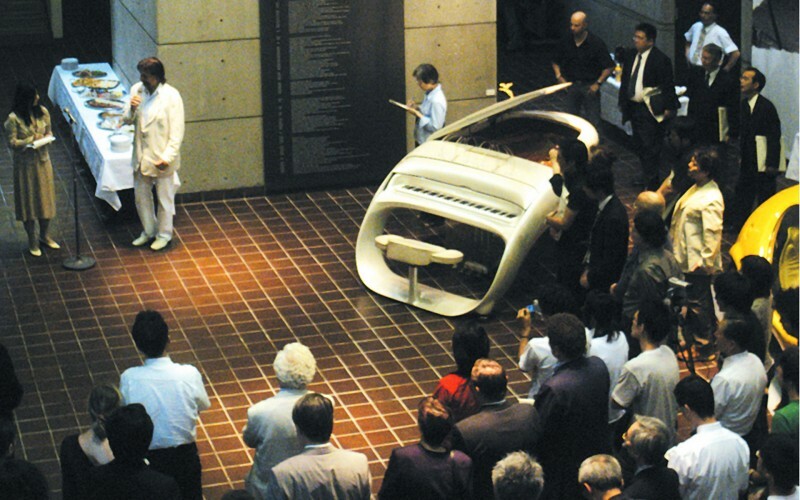 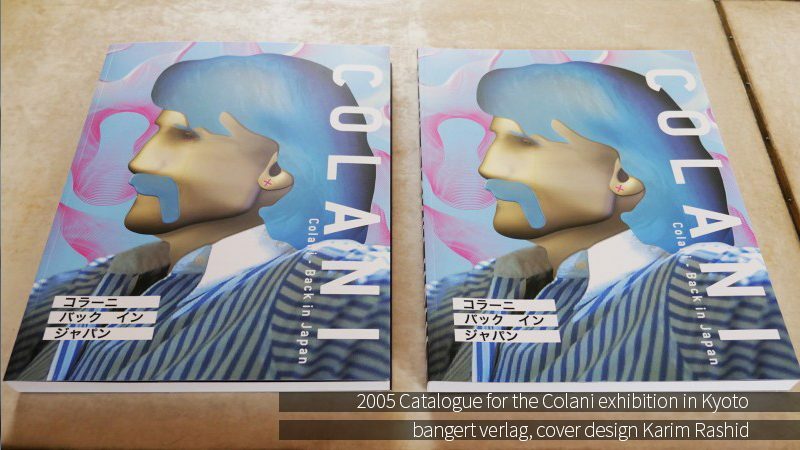 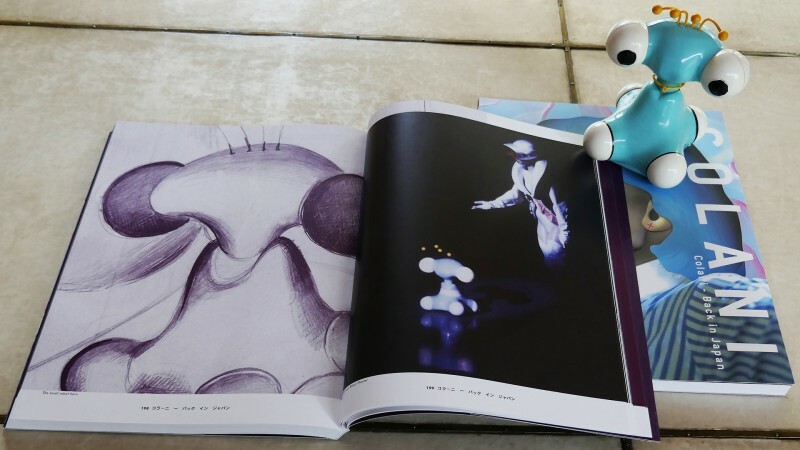 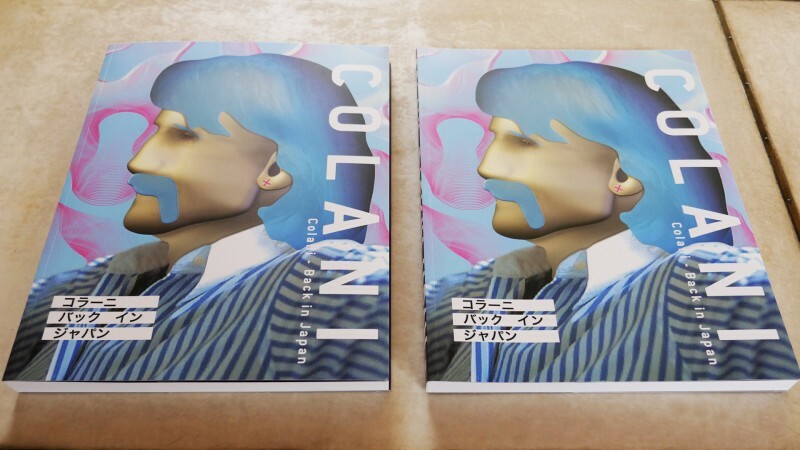 This catalog accompanies the Colani exhibition at the Kyoto Institute of Technology. 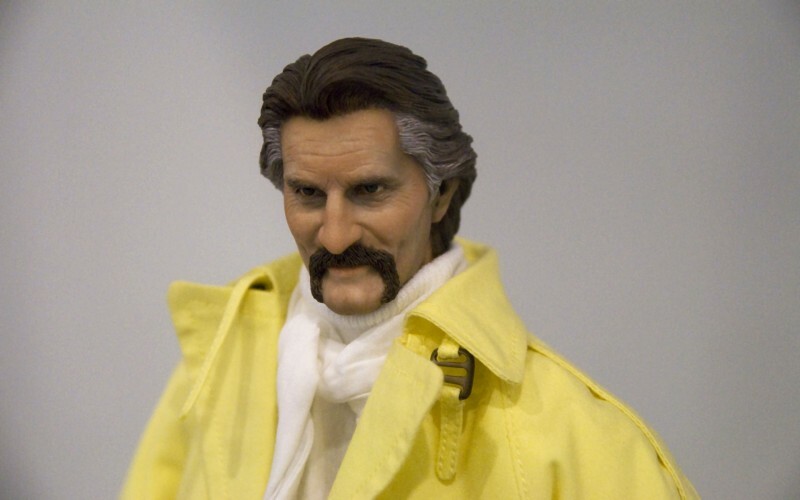 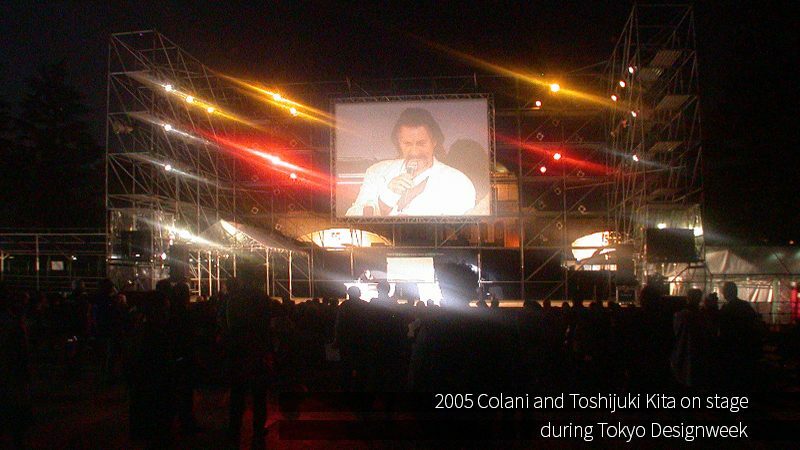 It concentrates on Colanis great time in Japan, when he developed there the groundbraking design for the new Canon cameras, walkmen and earphones for Sony, a robot theater and many other design visions for supersonic jets, highspeed trains and solar driven vehicles. 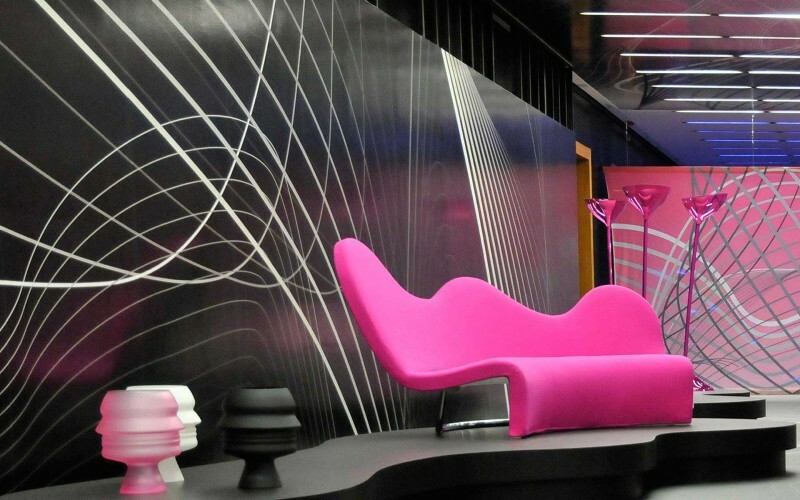 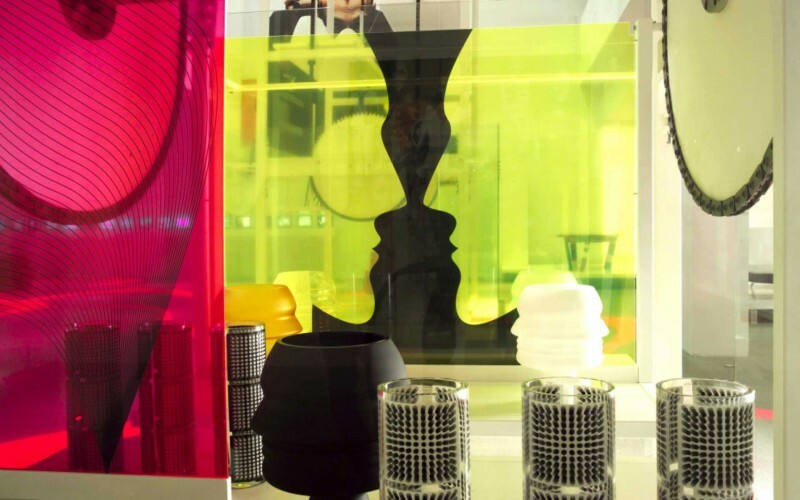 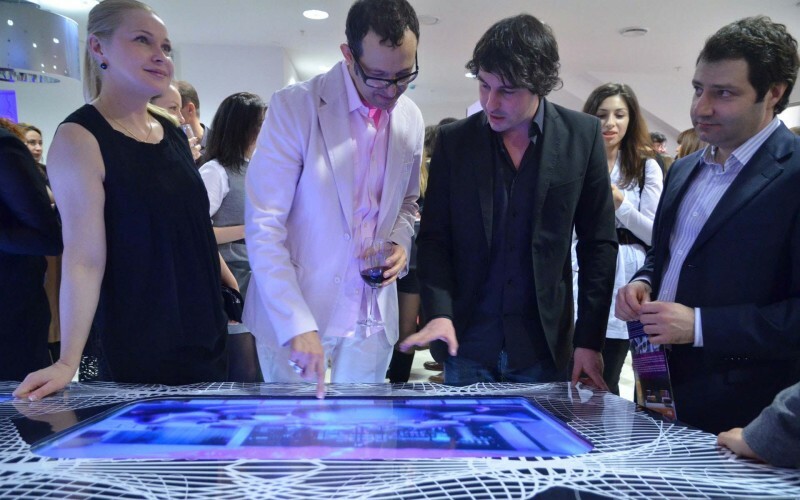 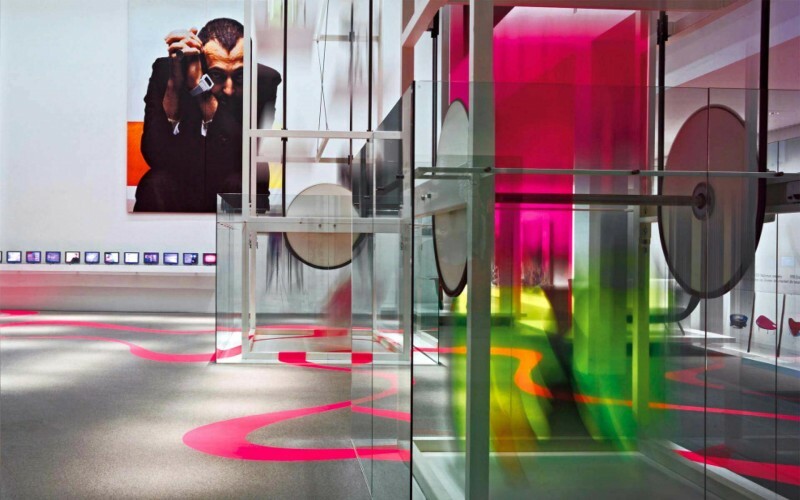 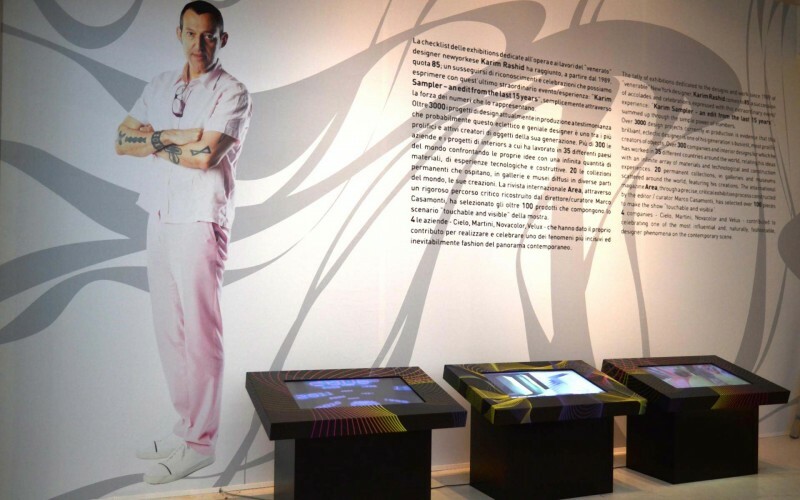 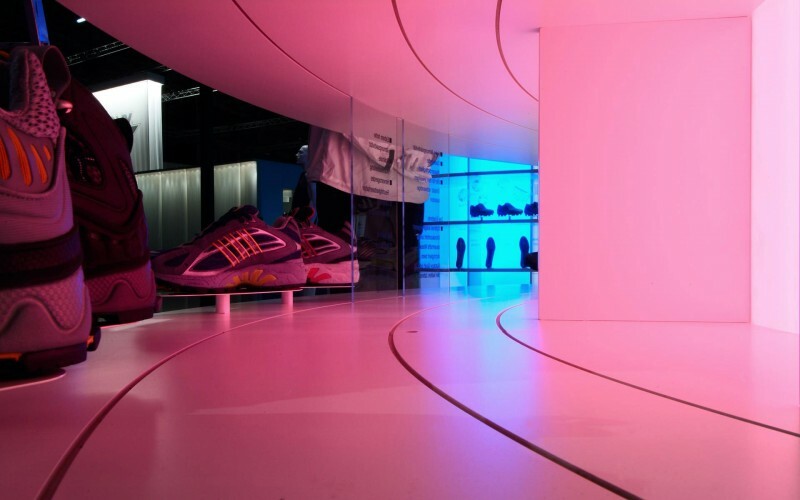 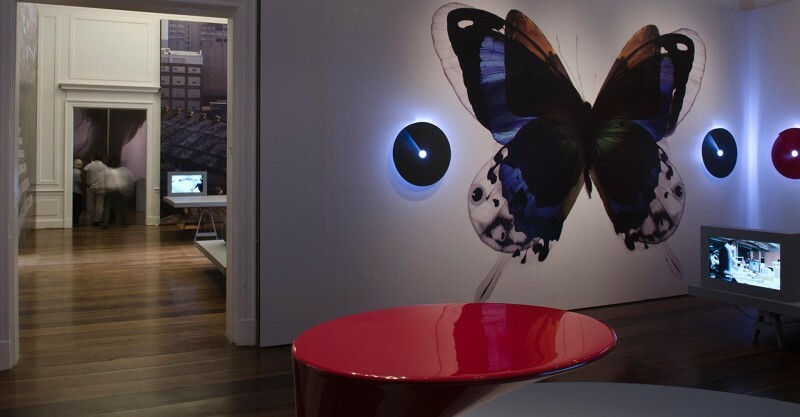 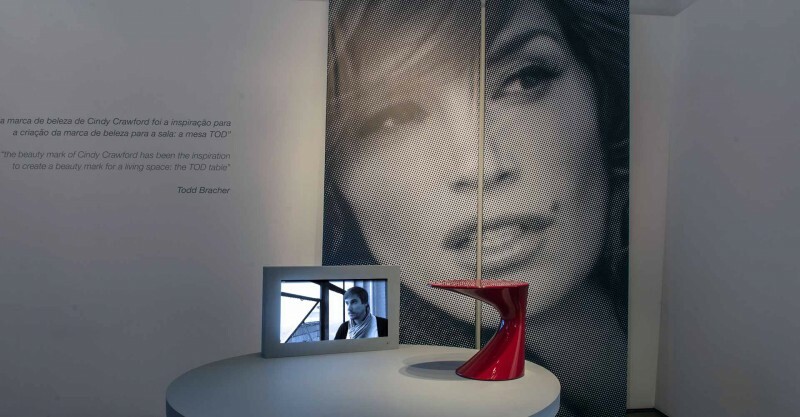 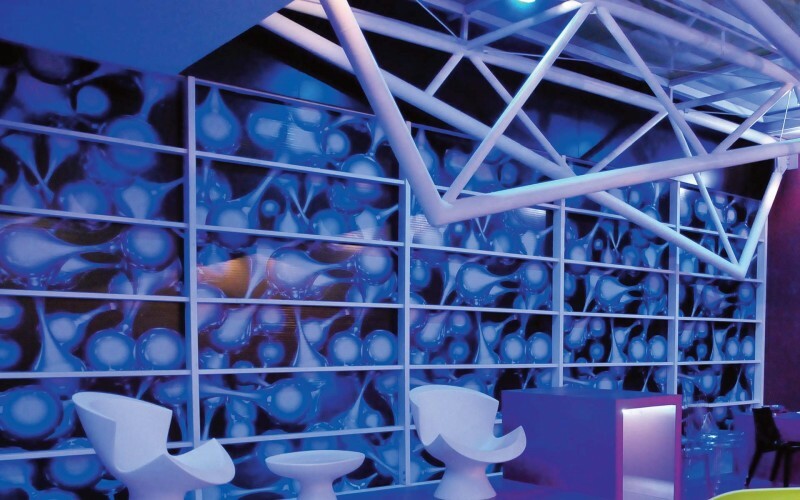 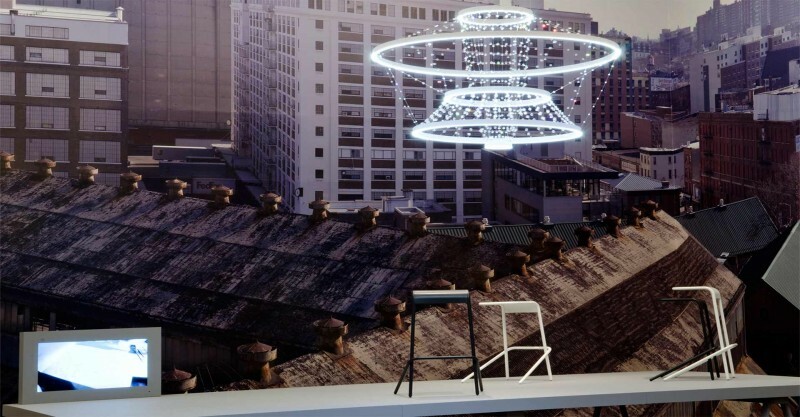 The Karim Rashid exhibition "ART AND DESIGN IN A GLOBAL WORLD" at the Instituto Tomie Ohtake in Sao Paulo transferred the digital language of NewYork based designer Karim Rashid into 1200 square meters of museum space creating a space experience in digital pop. 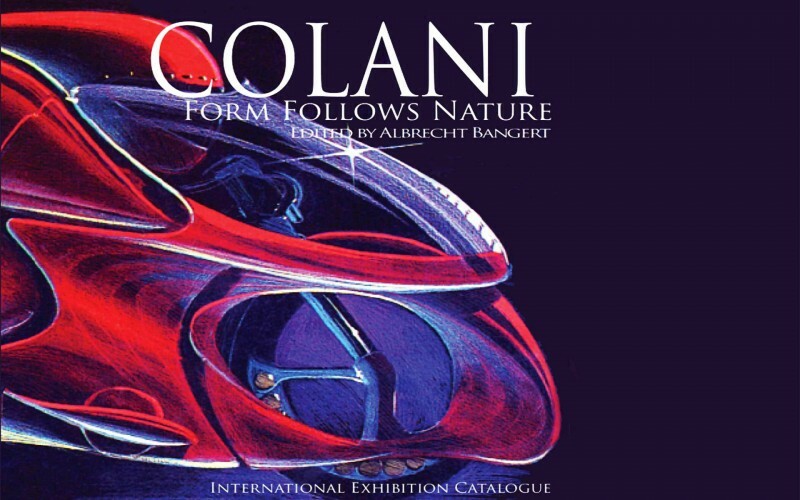 The Colani exhibition "TRANSLATING NATURE" at the Design Museum London – March 03 to June 17, 2007 – was curated by Albrecht Bangert and designed by Nigel Coates. 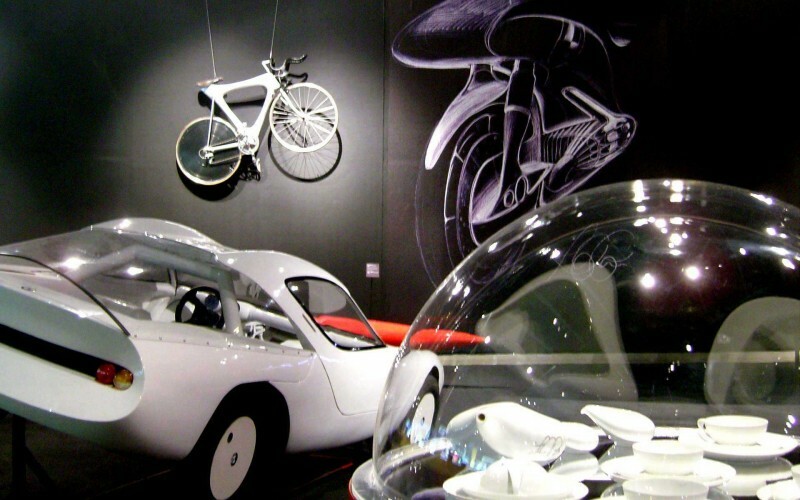 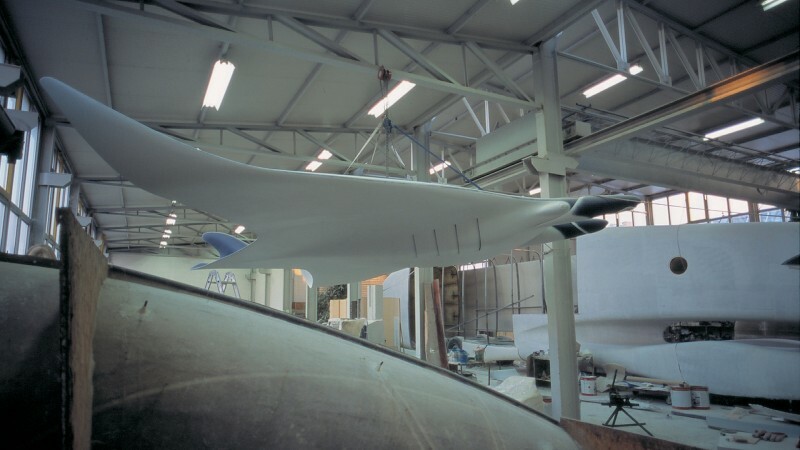 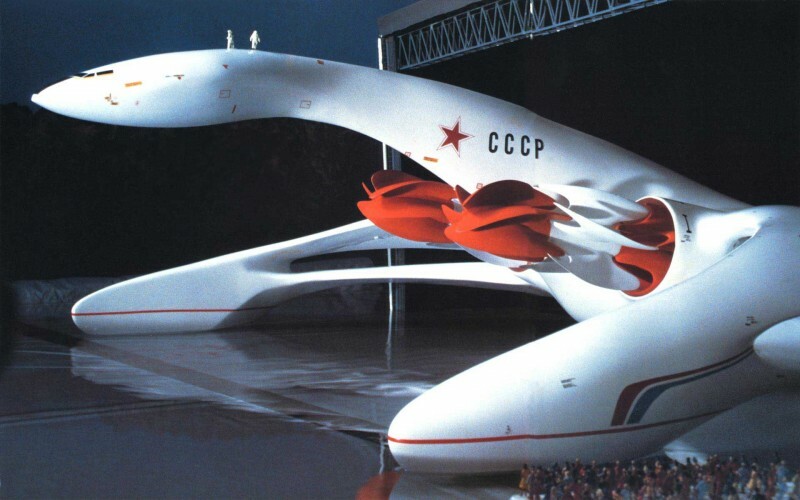 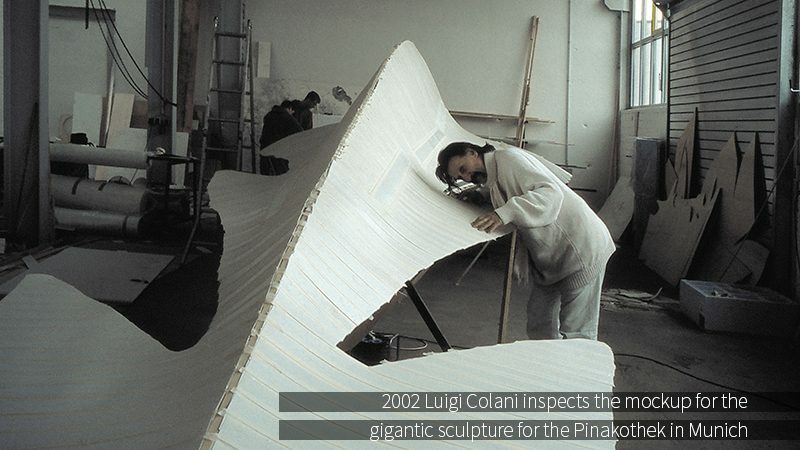 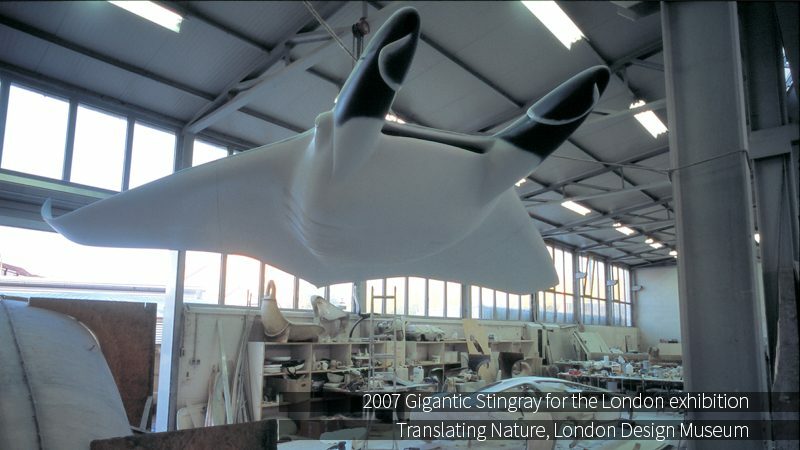 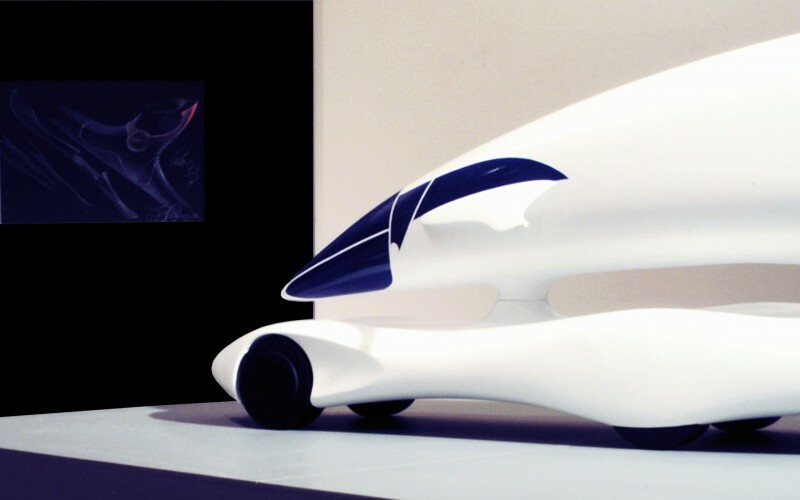 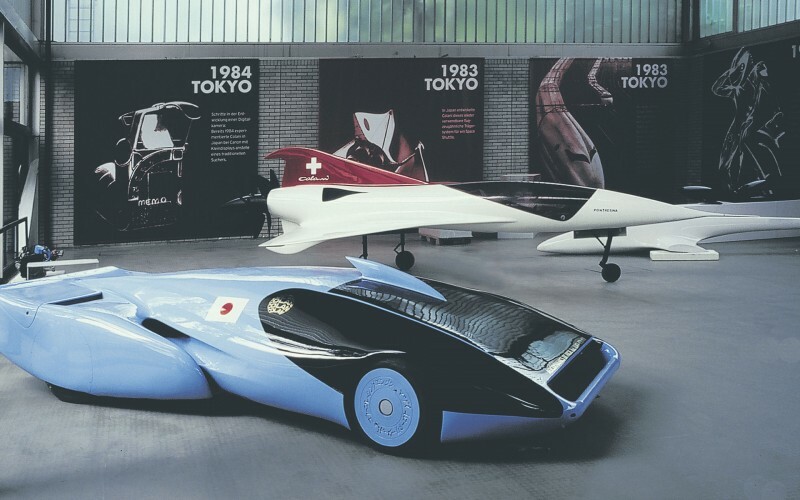 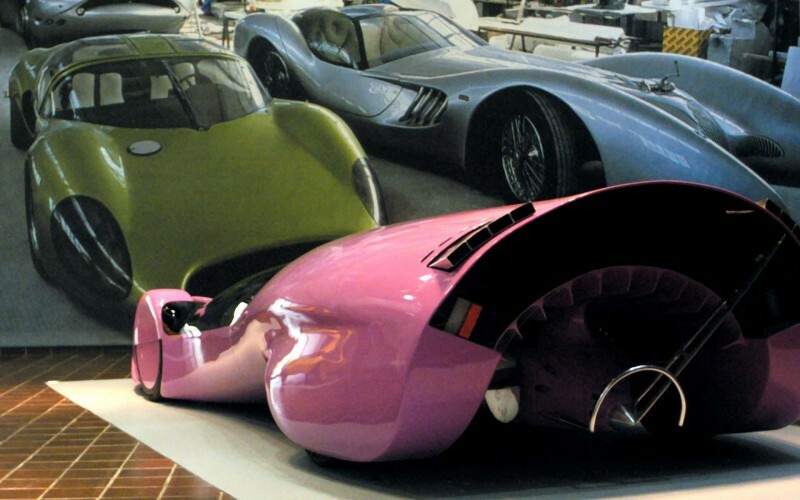 This exhibition offered an insight into the fantastic world of Luigi Colani bringing together extraordinary large scale prototypes including trucks, aircraft and cars. 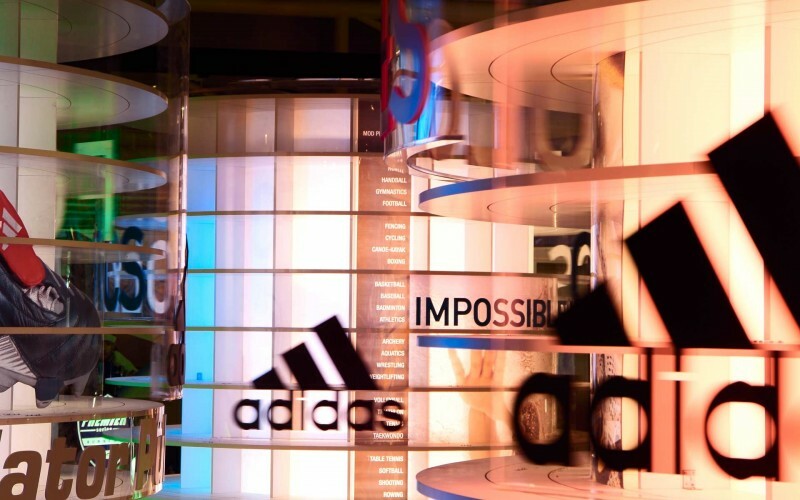 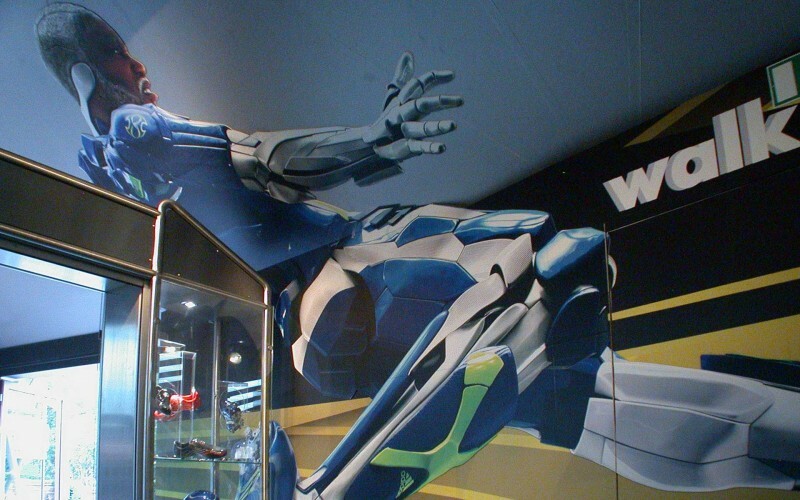 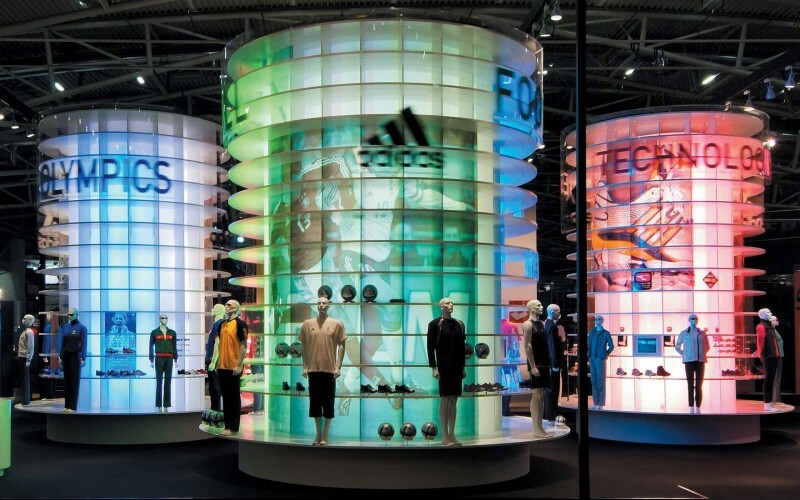 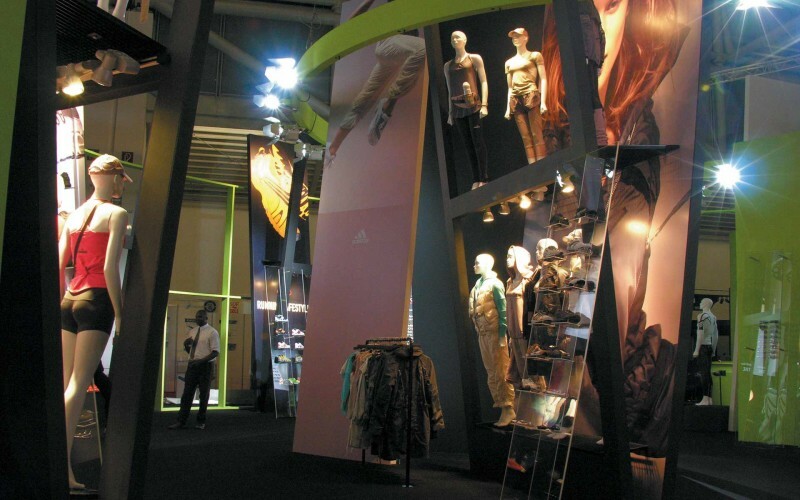 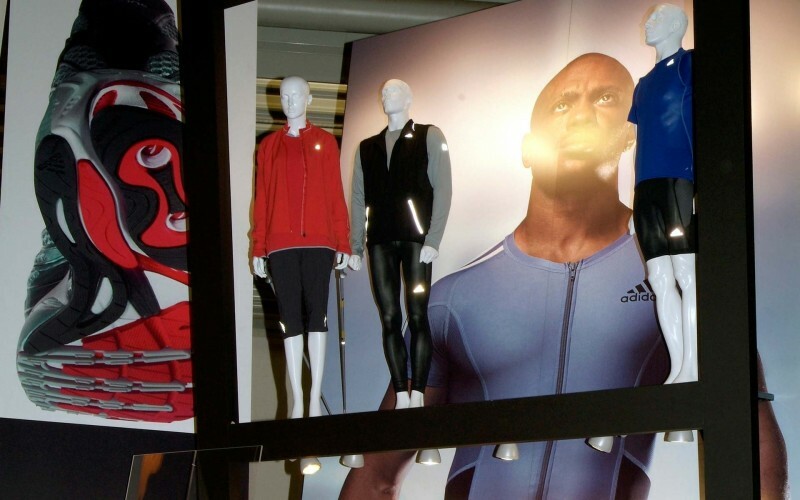 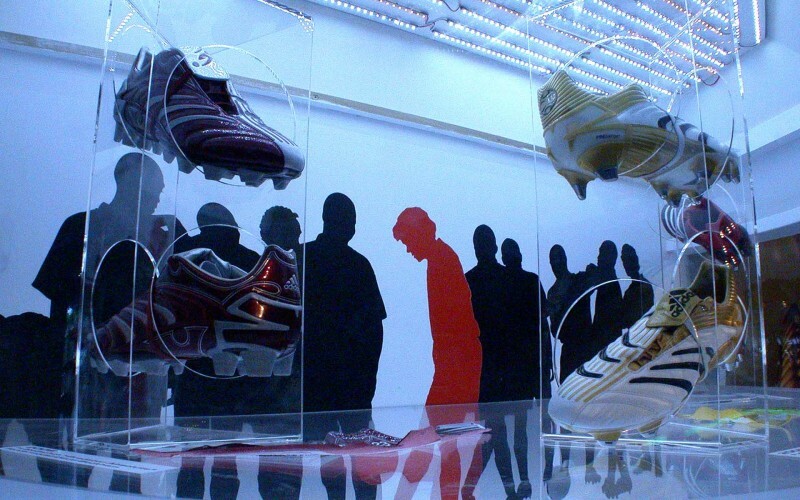 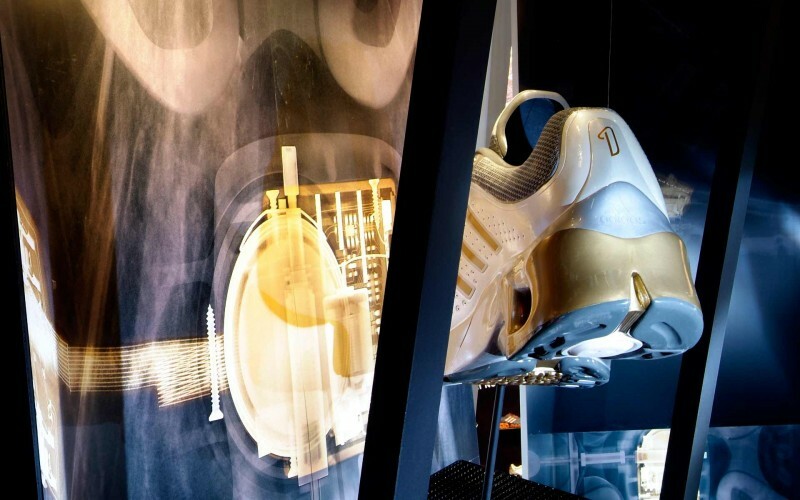 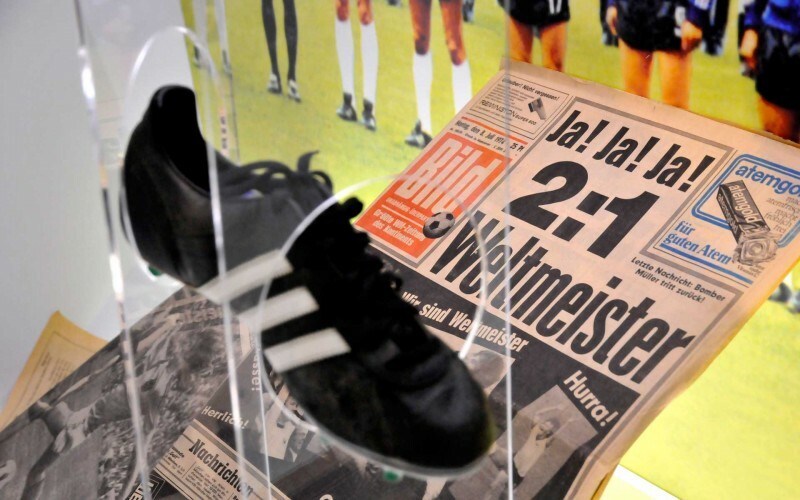 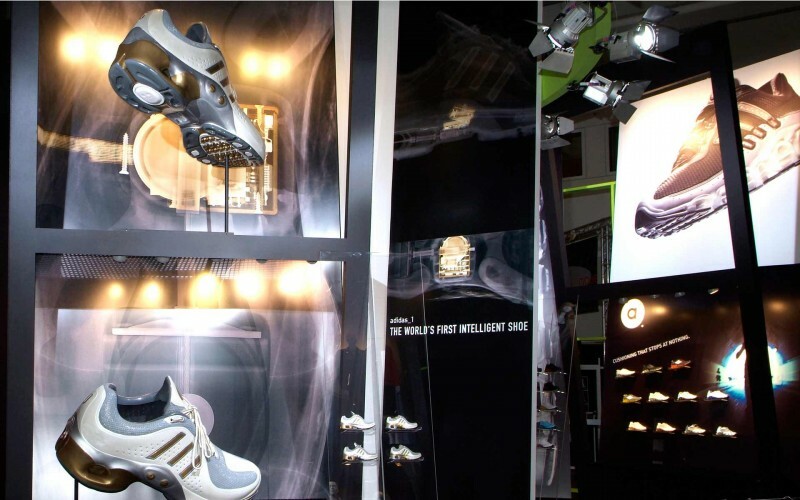 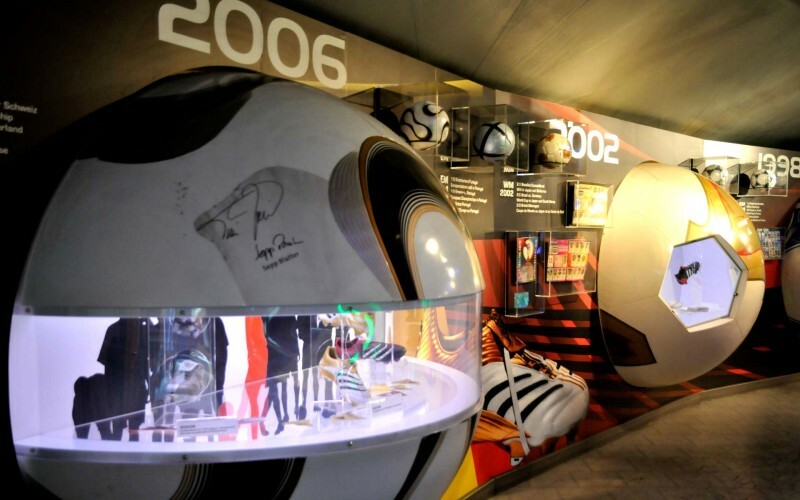 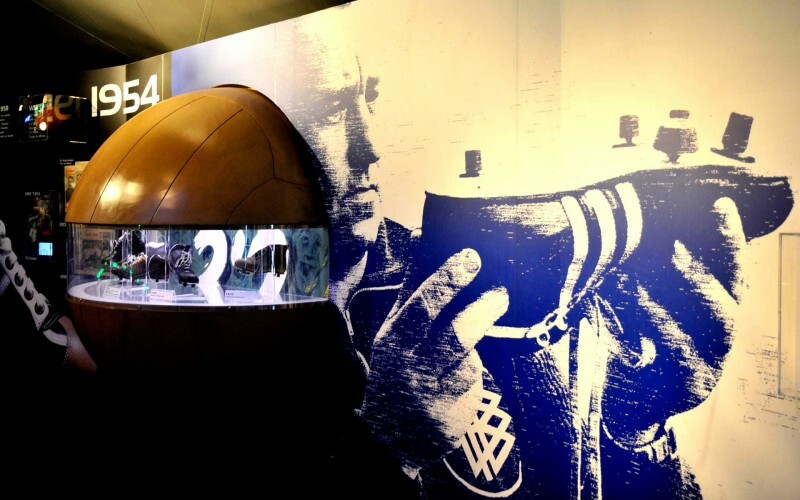 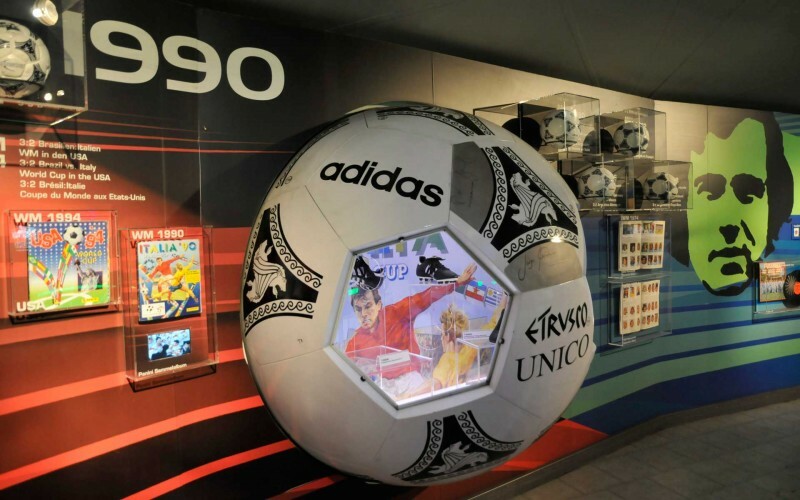 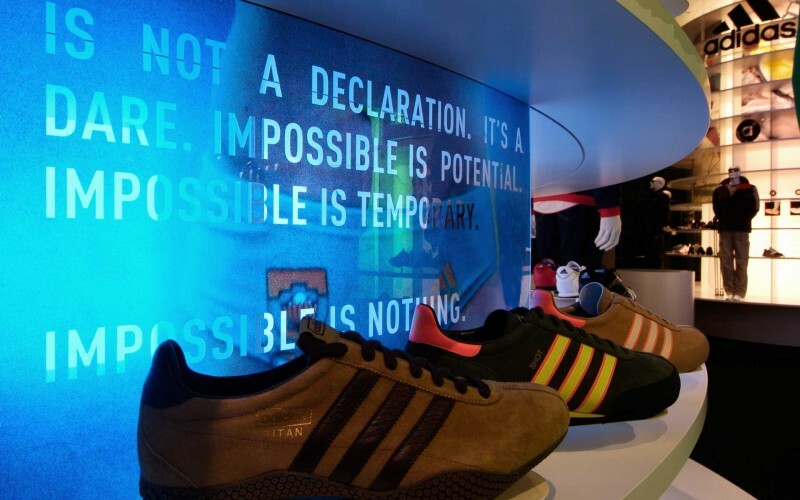 On the occasion of the World Championship 2008 we conceived a "WALK OF FAME" for Adidas at Europapark as a timeline. 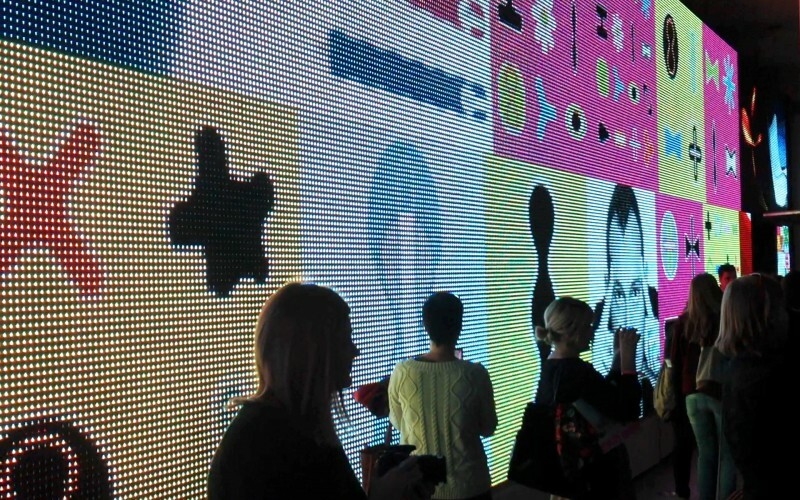 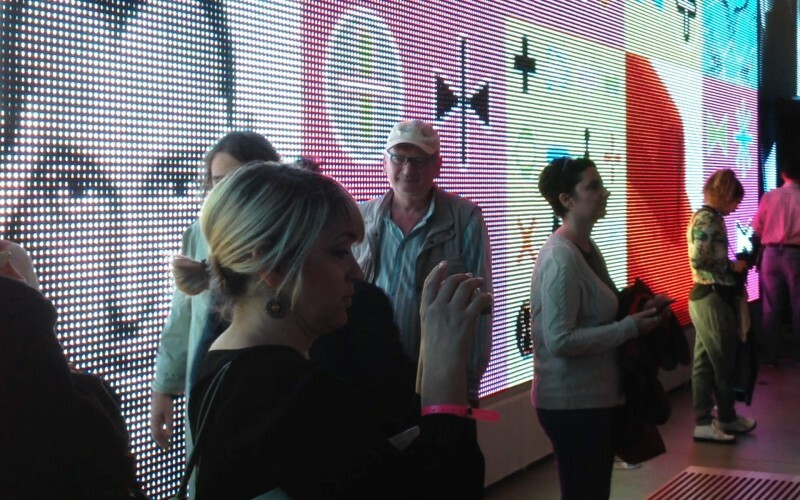 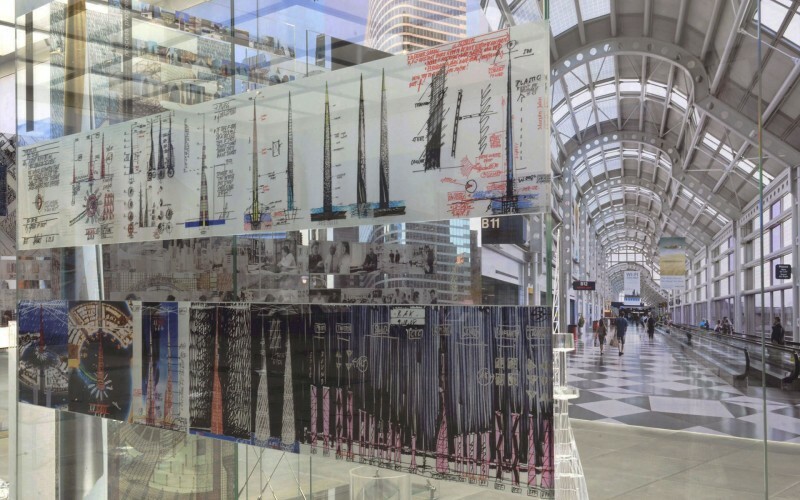 The parcour told the story as a collage of images, artifacts and video screens. 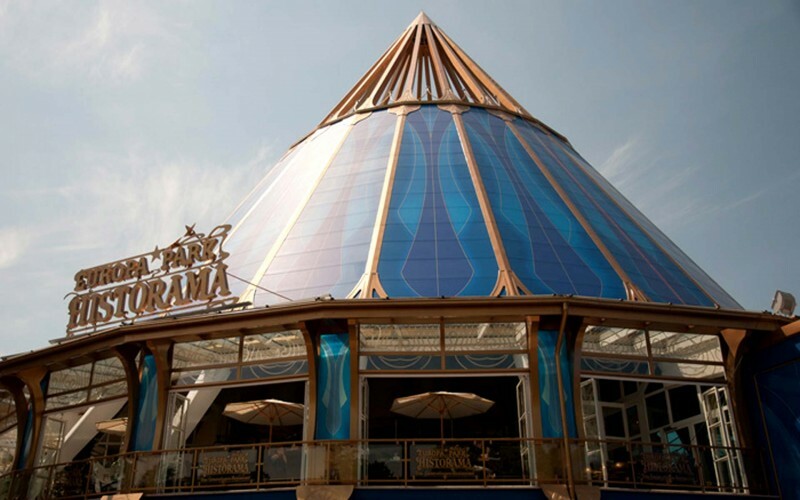 Europa-Park Rust. 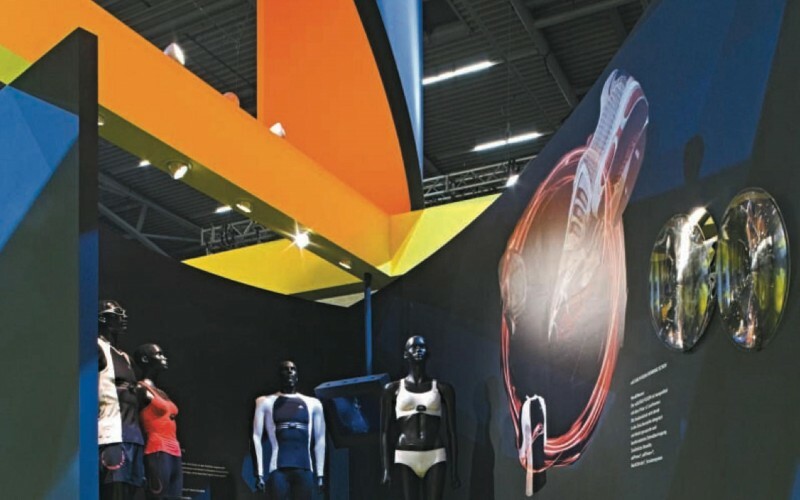 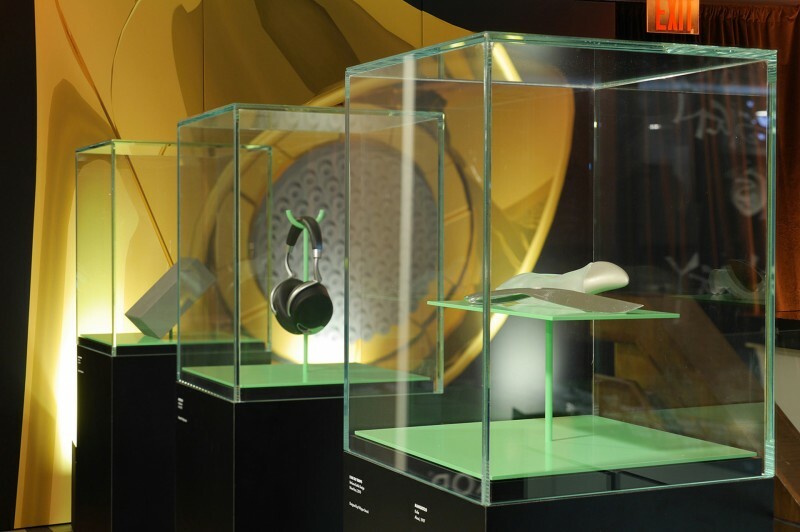 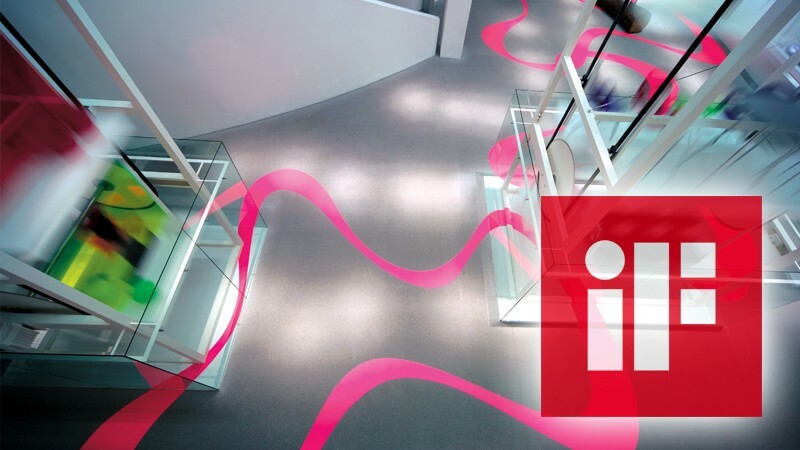 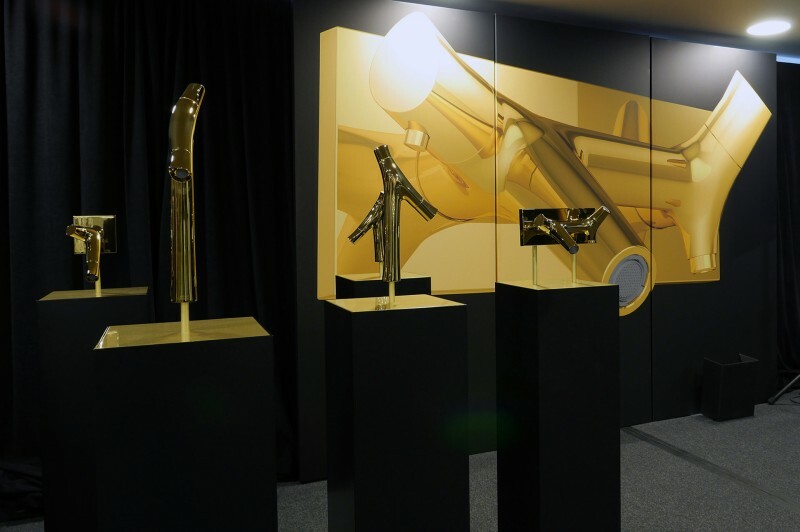 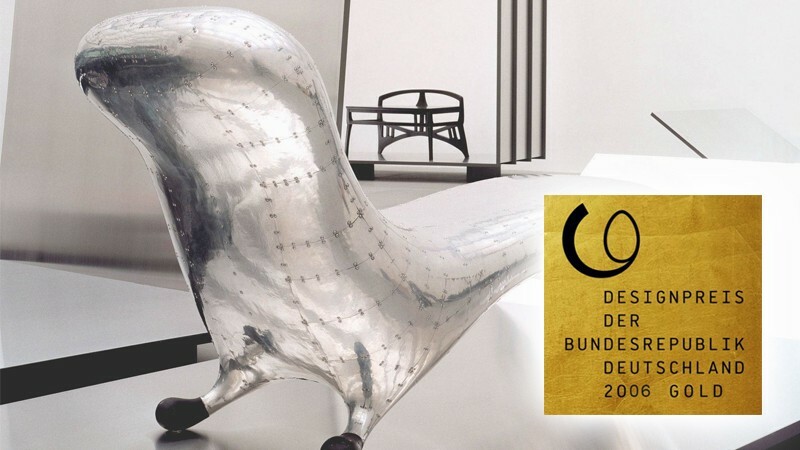 For design and concept of the exhibition "DESIGN MUSEUMS OF THE WORLD" in the Museum for Art and Design in Nuremberg bangert projects received the German Design Gold Award in 2006. 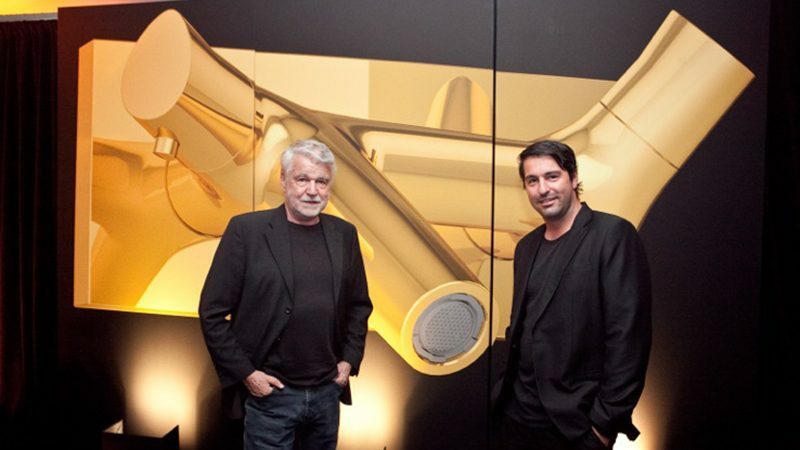 This Design Award in gold is the highest commendation in Germany. 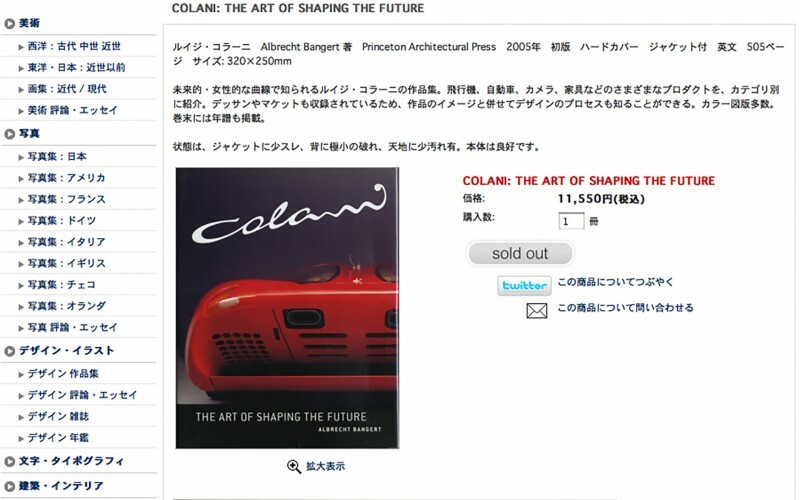 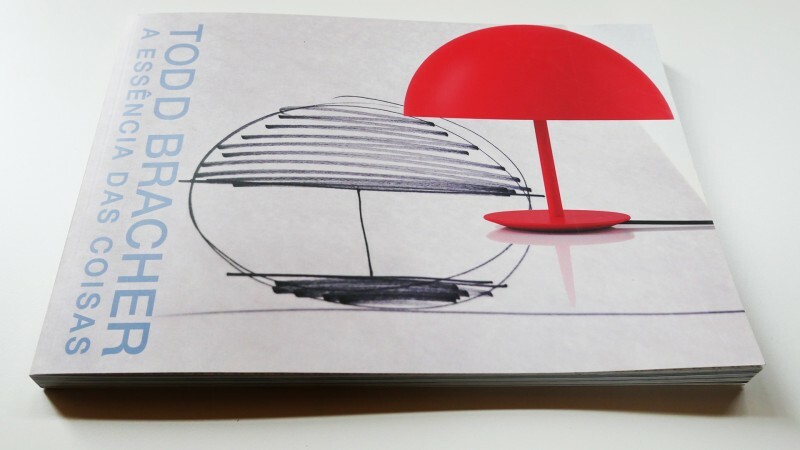 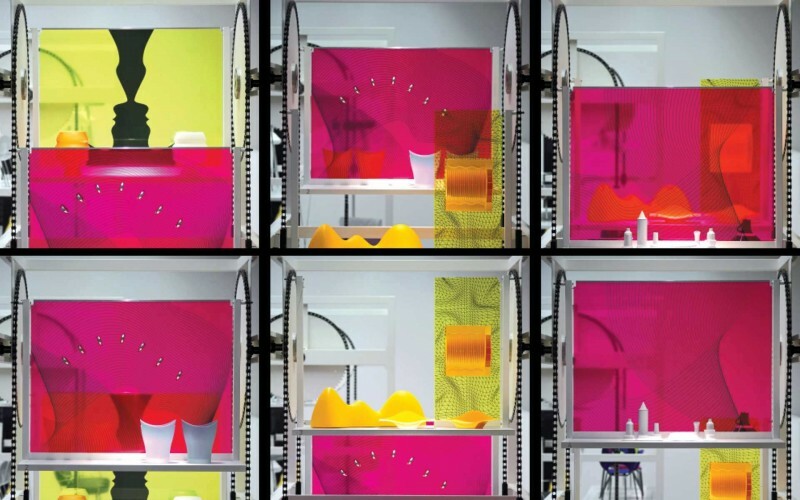 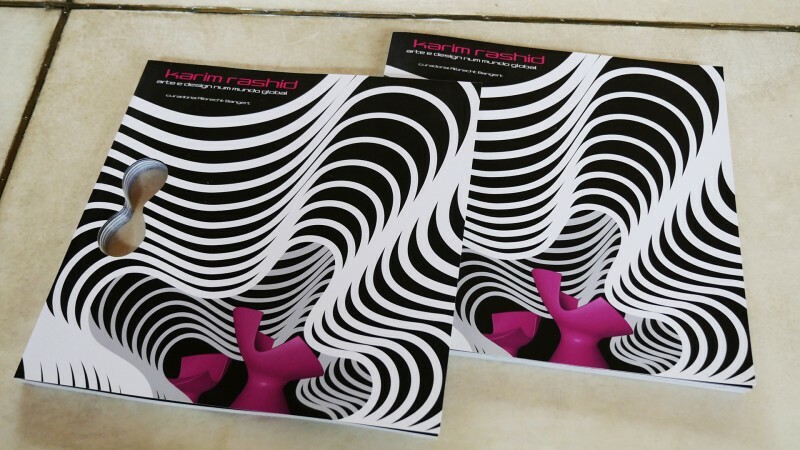 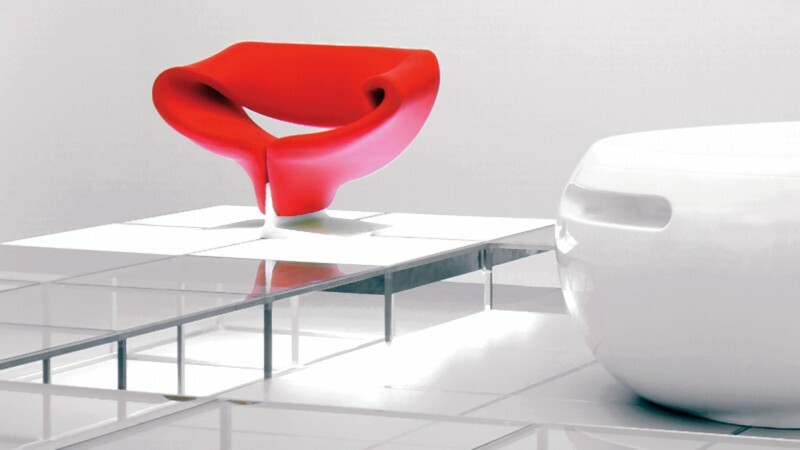 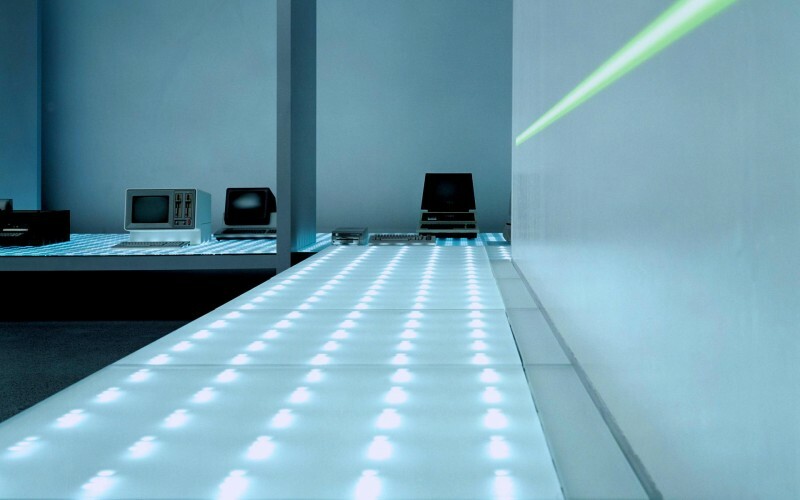 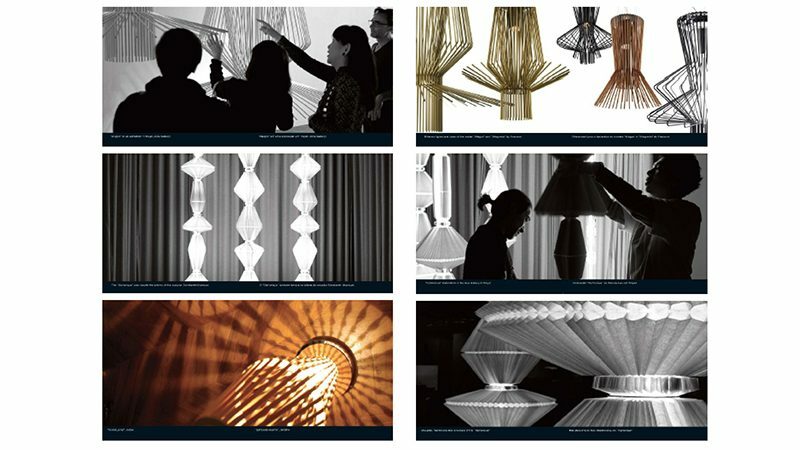 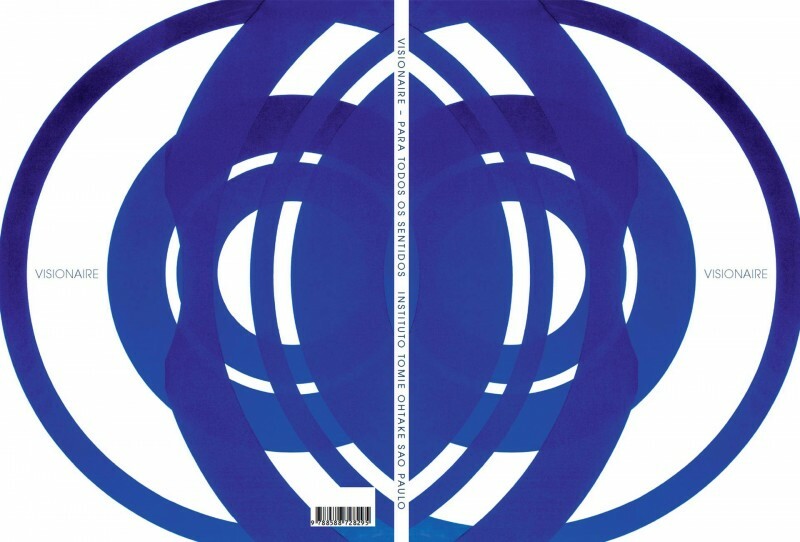 Red dot design award winner 2005 for the Karim Rashid exhibition "CHANGE"
This catalog accompanied the Colani exhibition at the Kyoto Institute of Technology. 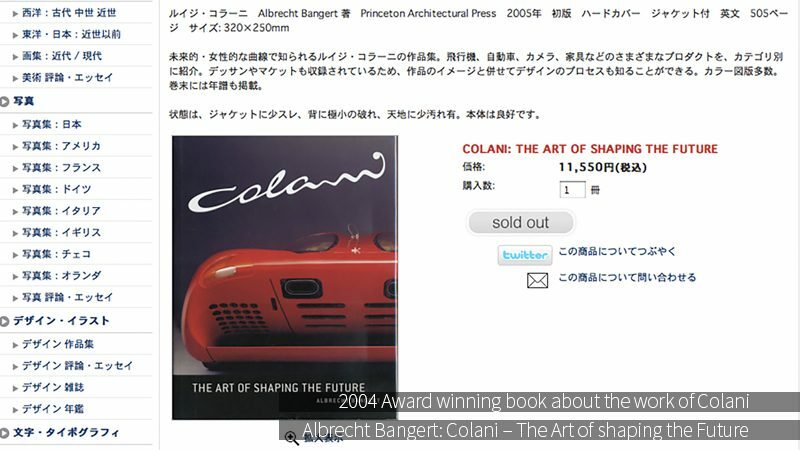 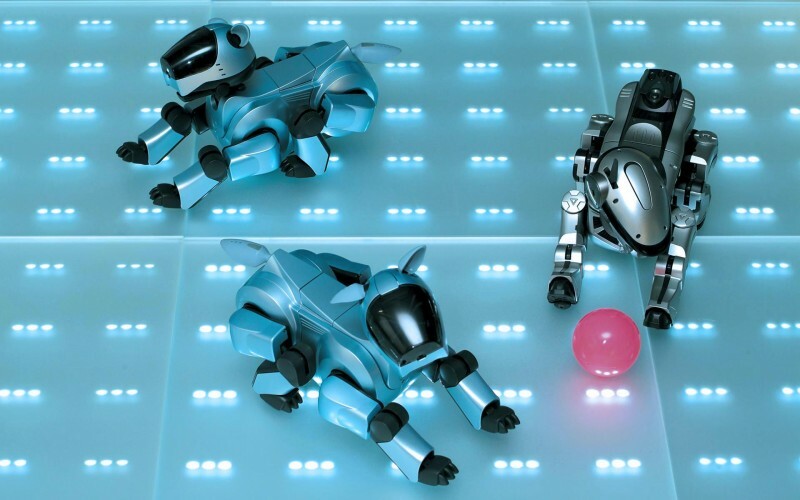 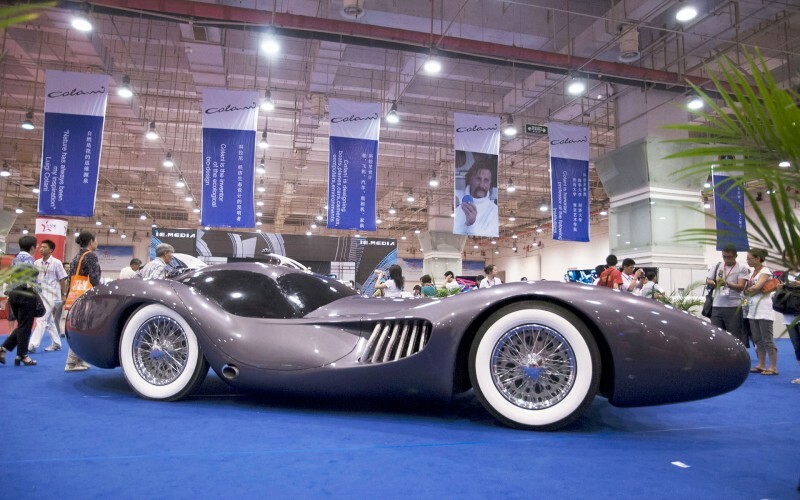 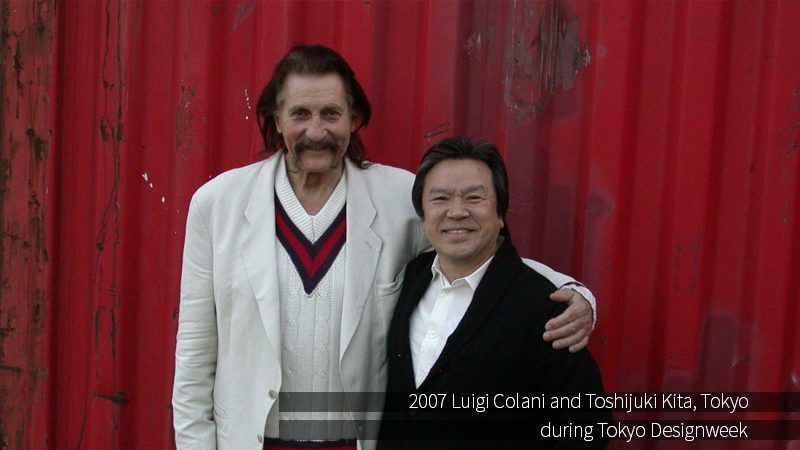 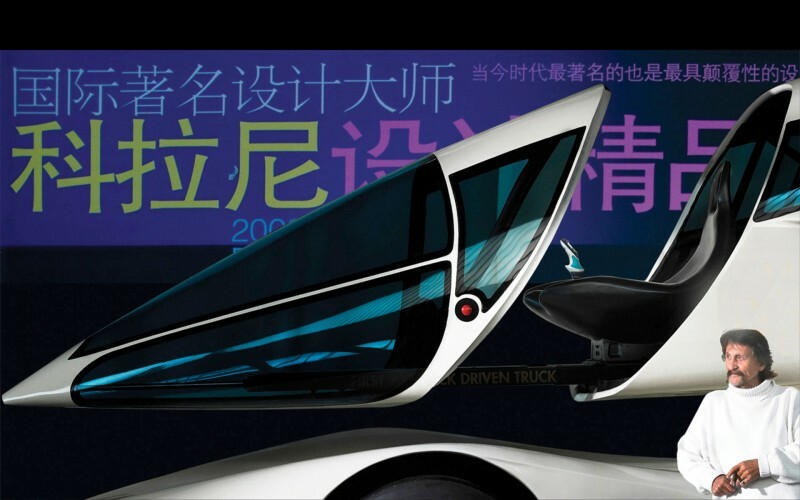 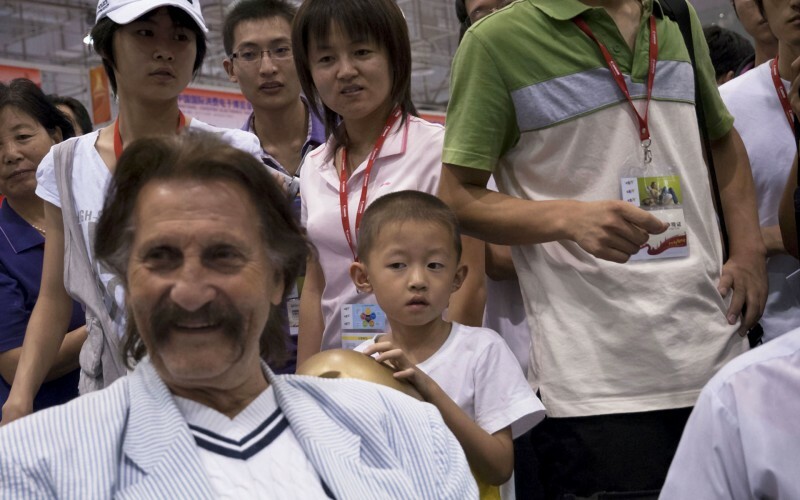 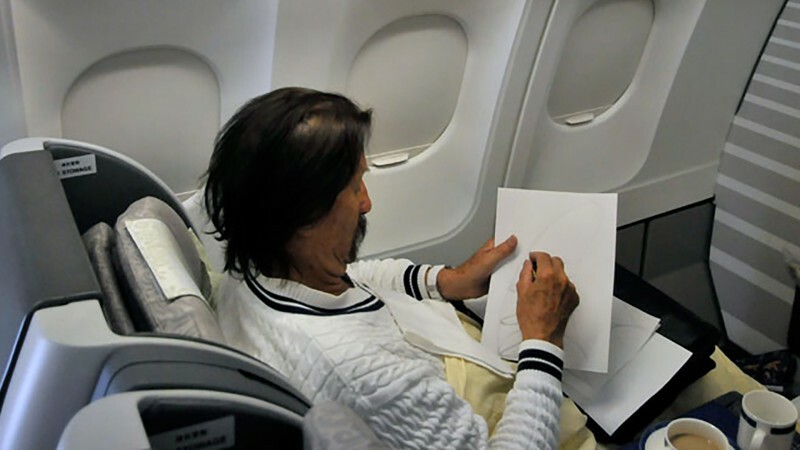 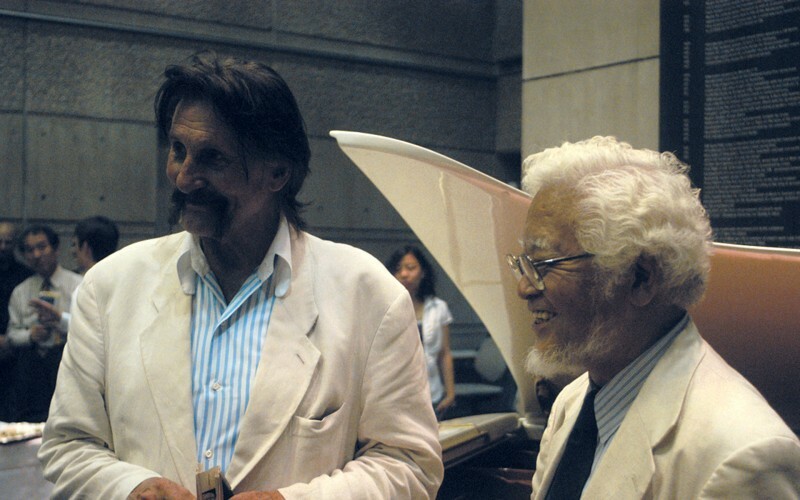 It concentrates on Colanis great time in Japan, where he developed the groundbraking design for the new Canon cameras, walkmen and earphones for Sony, a robot theater and many other design visions for supersonic jets, highspeed trains and solar driven vehicles. 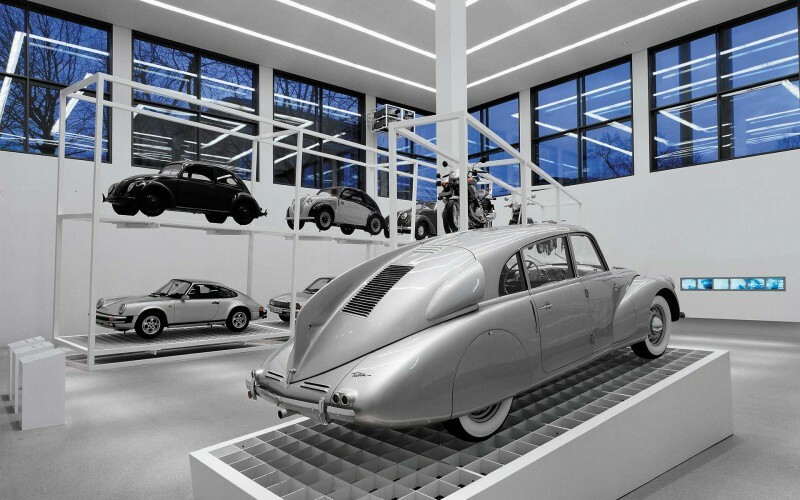 bangert projects conceived and realized the new LED setting for the "COMPUTER CULTURE" at the Pinakothek der Moderne in Munich and received the "INNOVATION AWARD LIGHT + BUILDING" for lighting solution. 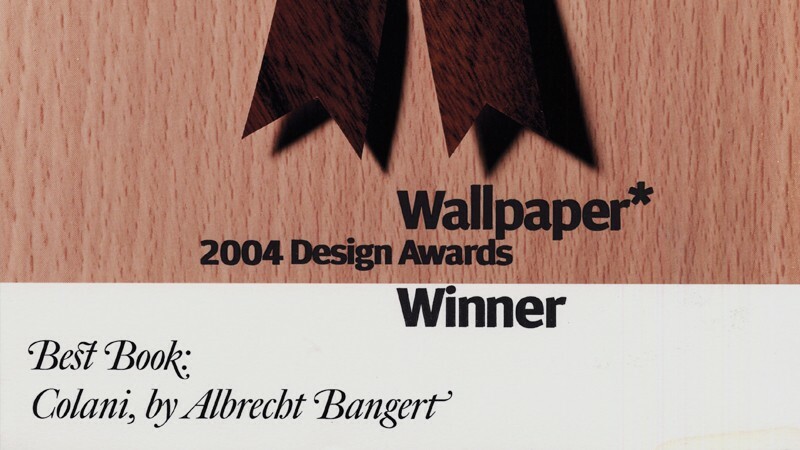 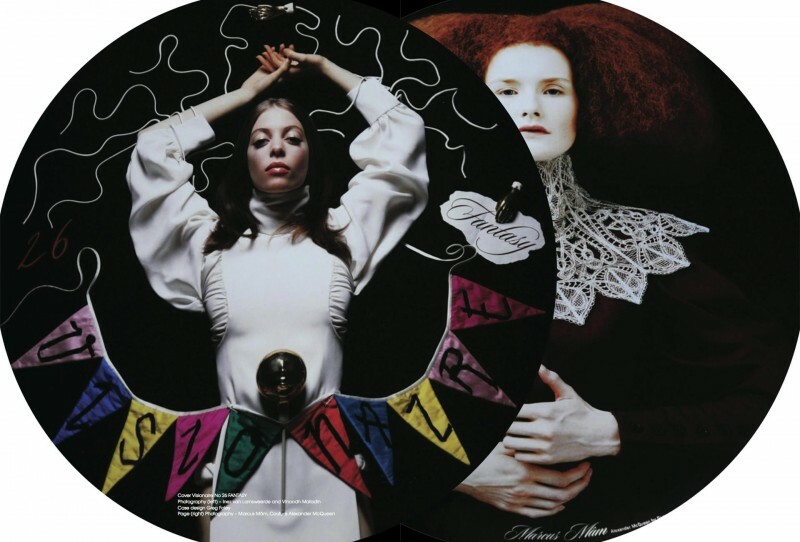 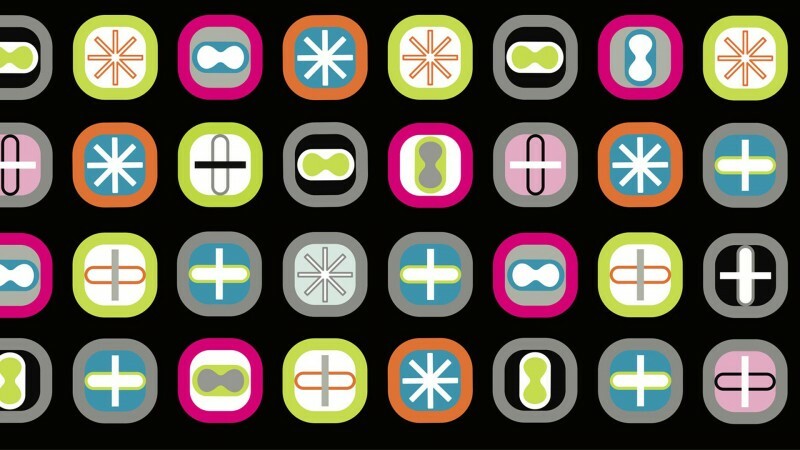 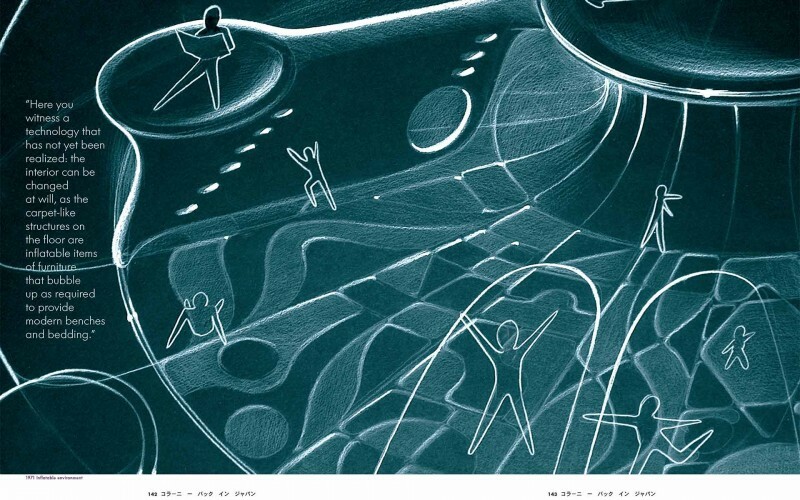 Albrecht Bangert won the "WALLPAPER DESIGN AWARD 2004" for the best design book of the year "COLANI – THE ART OF SHAPING THE FUTURE". 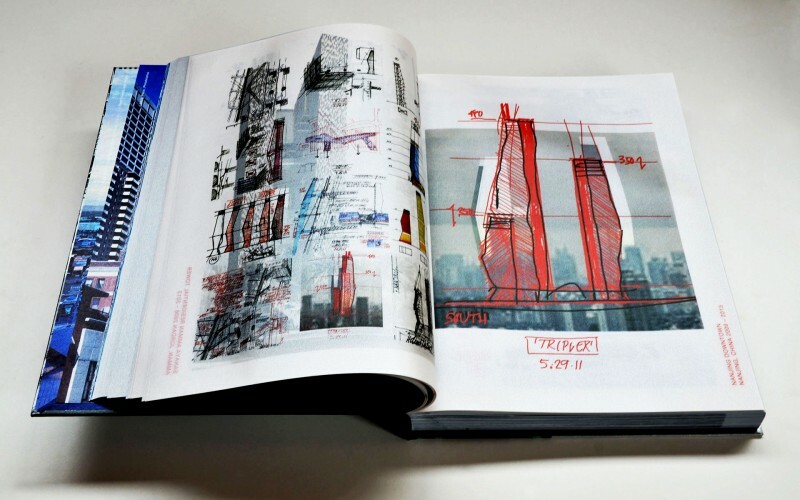 Thames & Hudson, London/Princeton Architectural Press, New York, Bangert Verlag, Schopfheim. 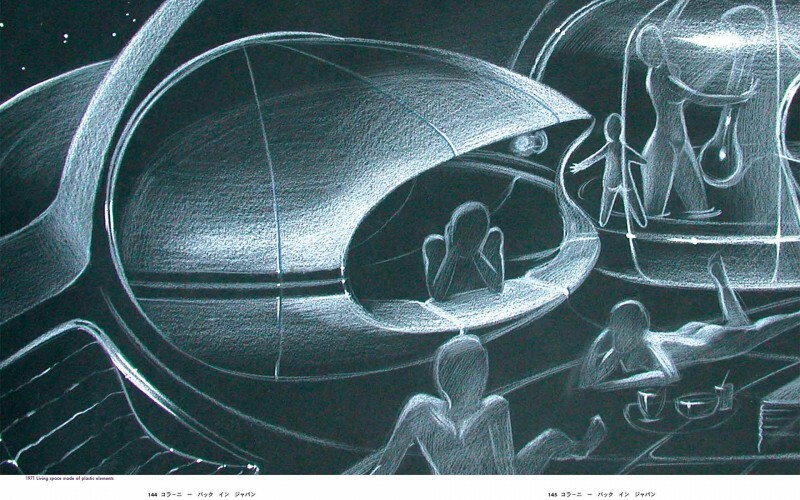 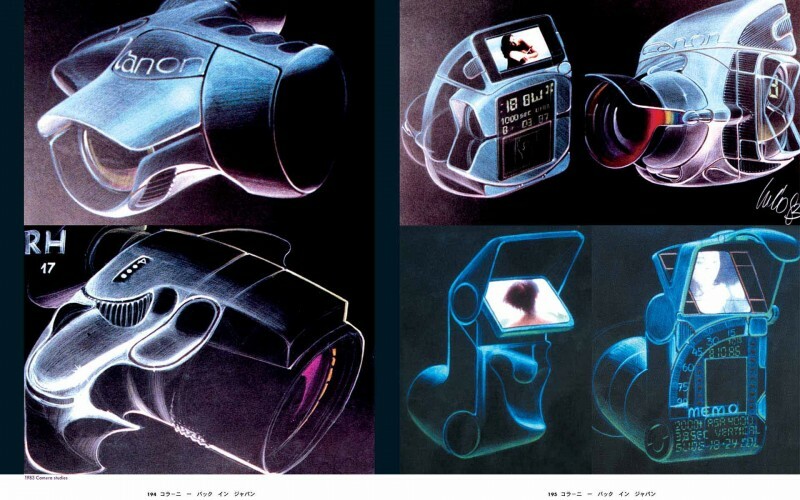 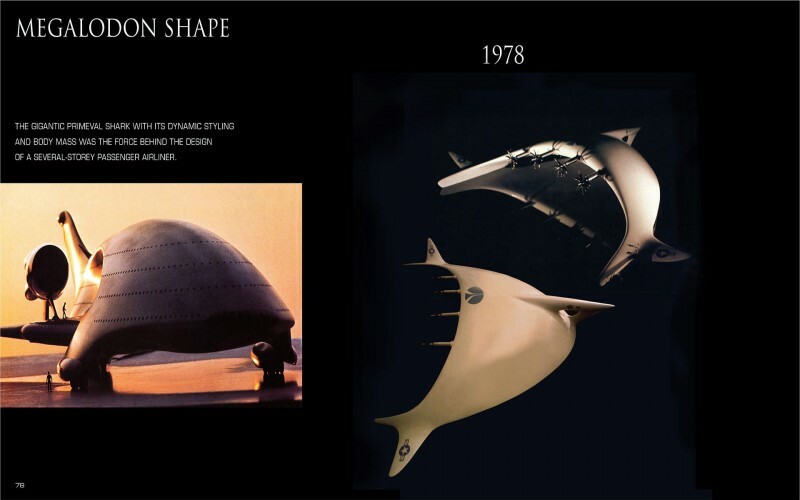 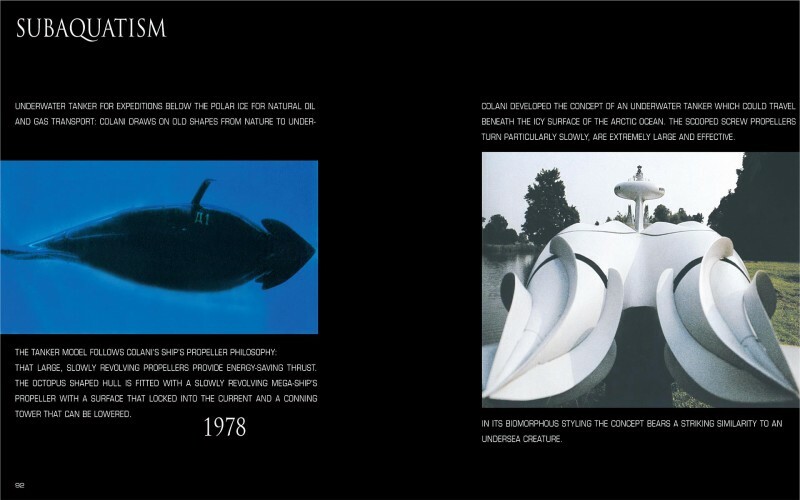 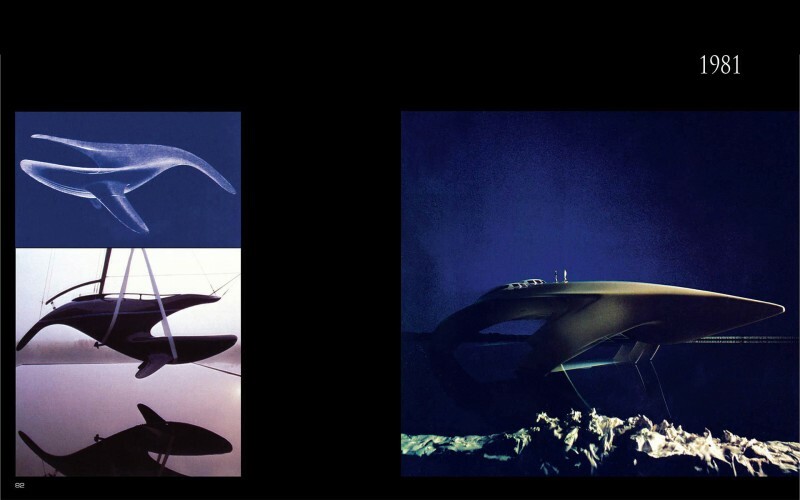 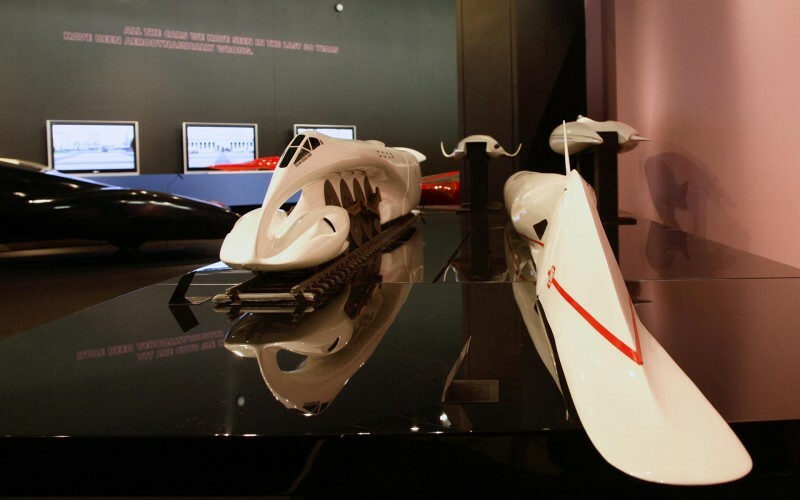 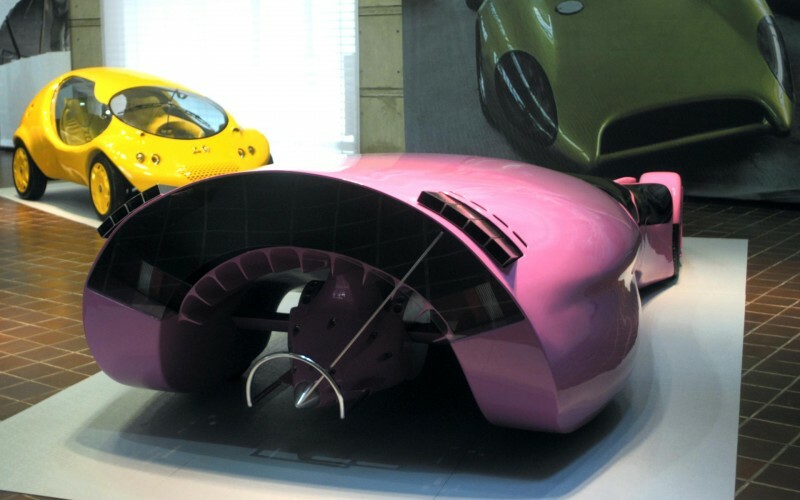 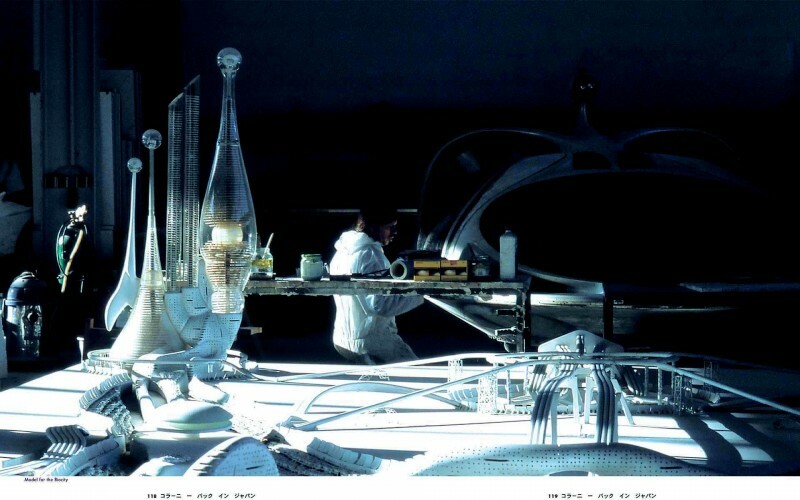 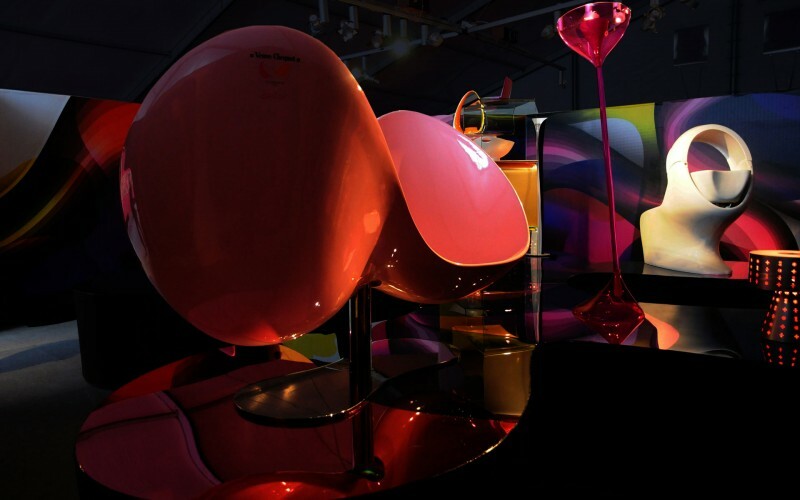 The exhibition about the life time work of mega designer Luigi Colani shows 5 decades of futuristic design visions. 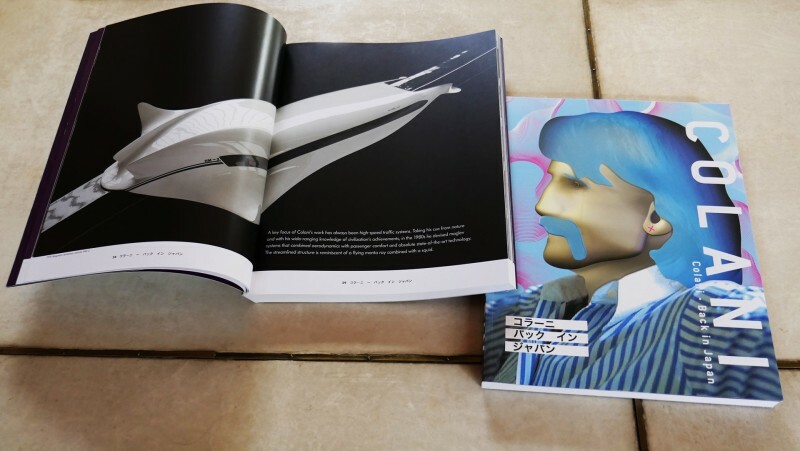 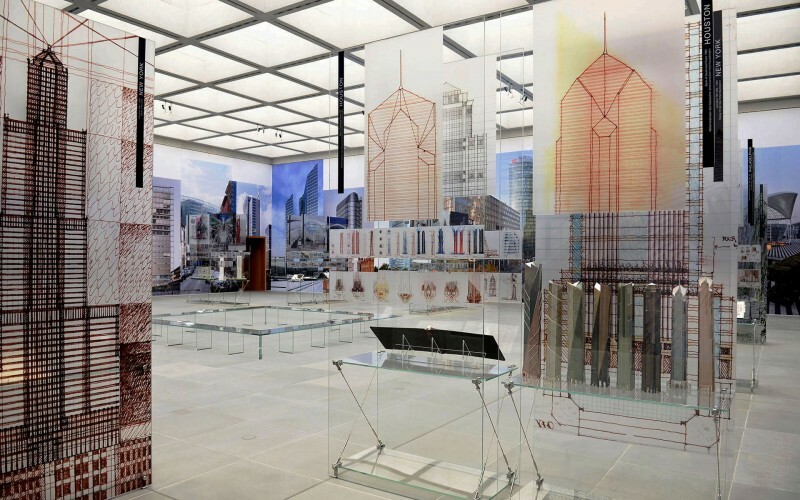 We supported this exhibition with a huge time line and a 460 page catalog as well as the book "The Art of Shaping the Future" which has won the "Wallpaper Award for the Best Design Book of the Year". 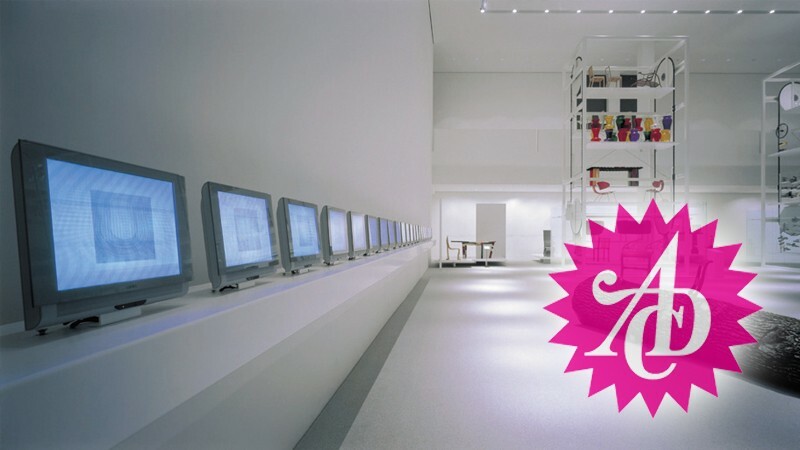 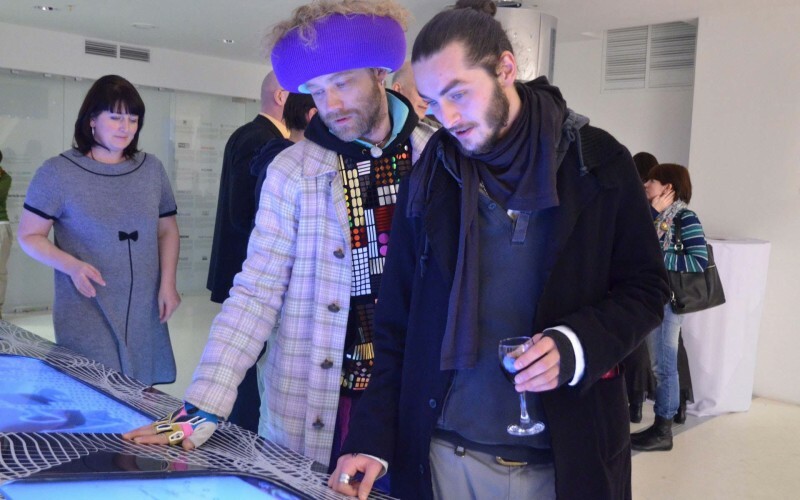 and realized the permanent exhibition "COMPUTER CULTURE" at Die Neue Sammlung. 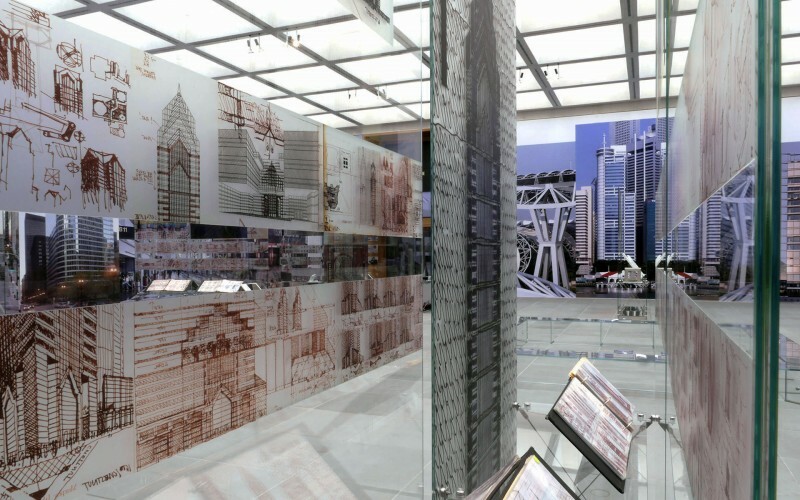 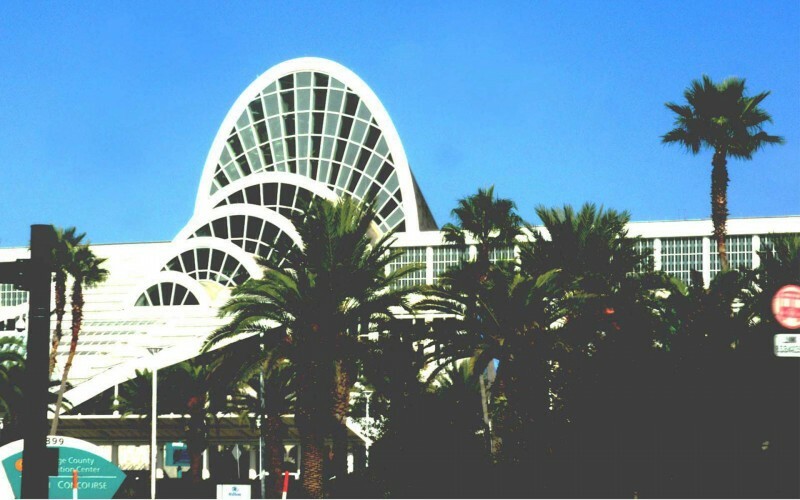 The world's largest permanent exhibition design received an award in the competition for the Art Directors Club Championship 2003. 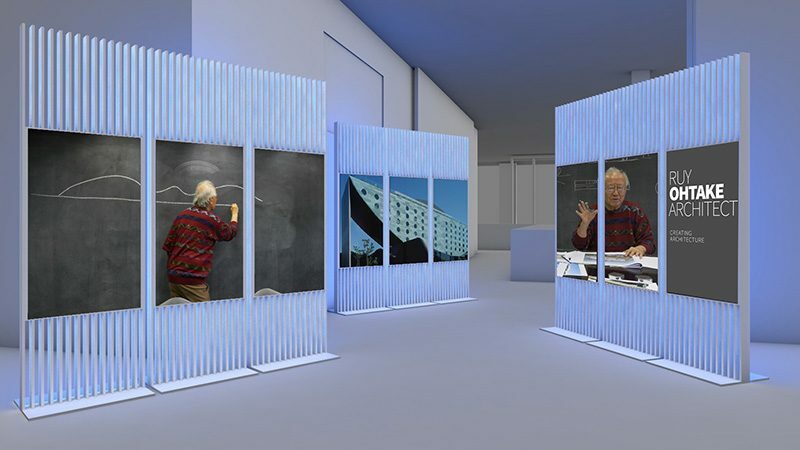 The jury in Berlin honored the innovative concept in the category "COMMUNICATION IN SPACE", which was developed by the curator Dr. Albrecht Bangert, together with the architect Dieter Thiel for the permanent exhibition space of Die Neue Sammlung, Pinakothek der Moderne in Munich. 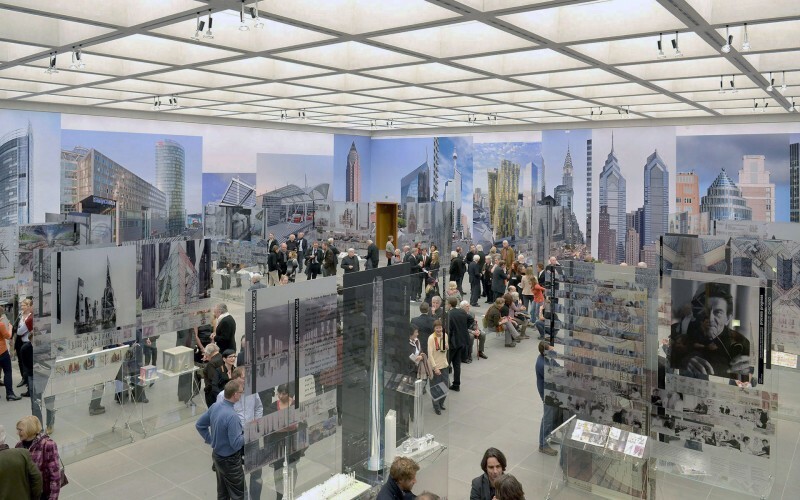 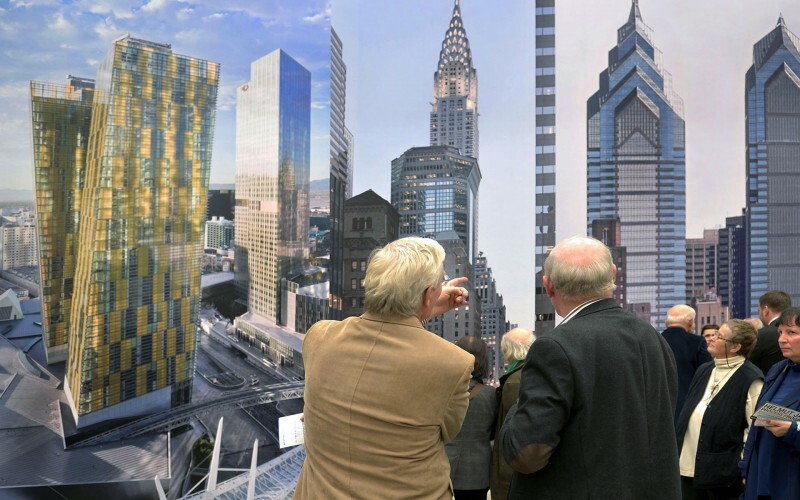 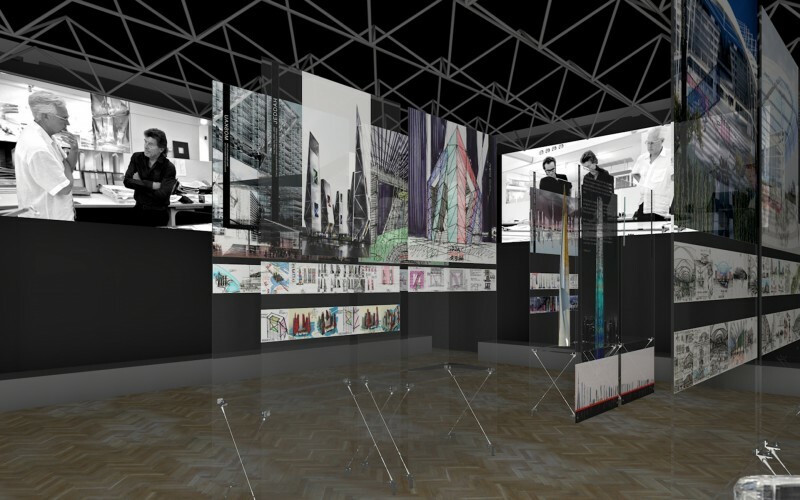 Concept and and implementation of a permanent design presentation at the New Museum for Art and Design Nuremberg in cooperation with architect Dieter Thiel, Basel. 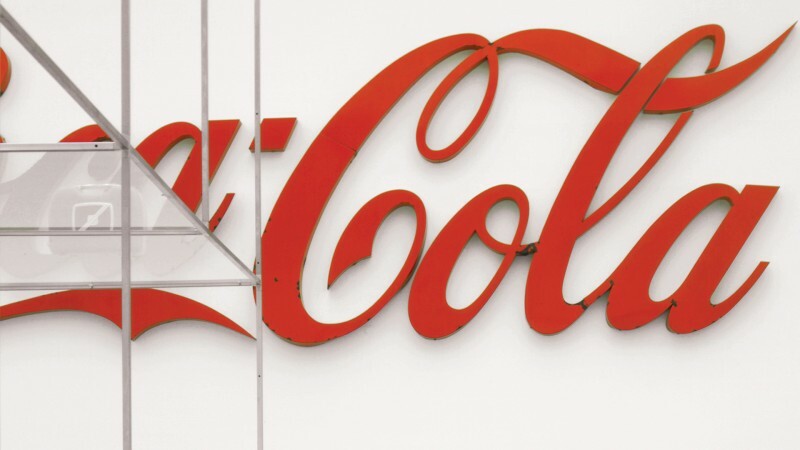 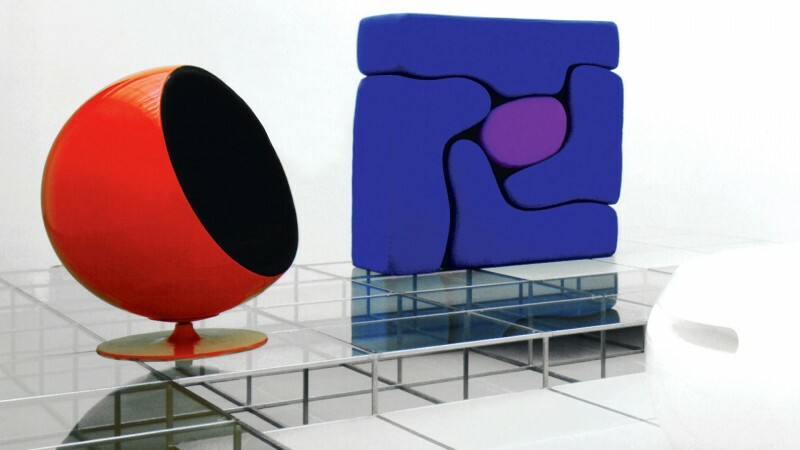 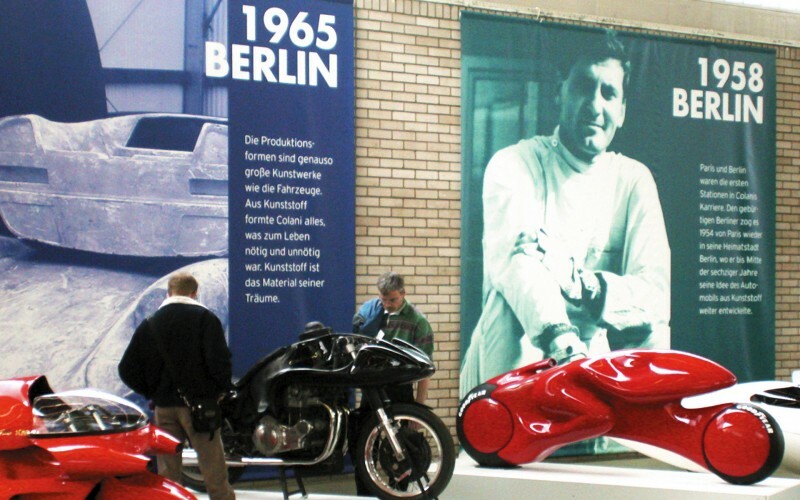 The exhibition shows major works of international design from 1945 to the present.